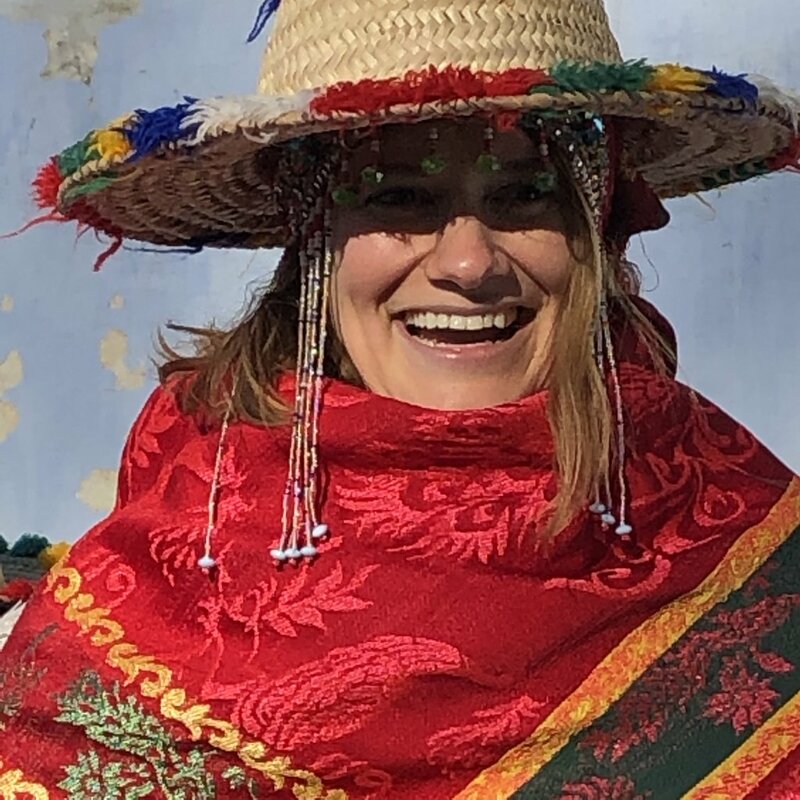 I'm originally from Sefrou, Morocco, which is located in the foothills of the Middle Atlas Mountains, Southeast of Fez. 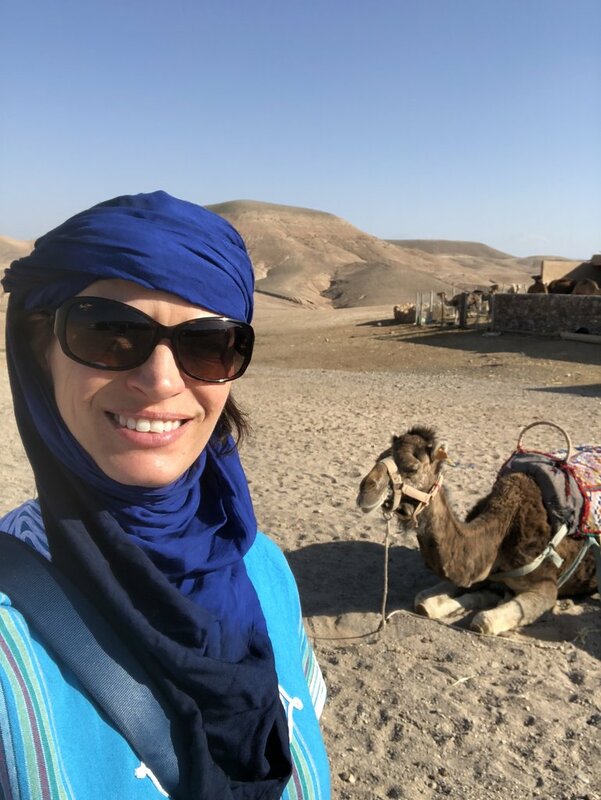 In 2010 I started my company Morocco Off the Beaten Track with the vision of bringing local Moroccans together with the rest of the world to encourage understanding and give the gift of worldly experience to all involved. 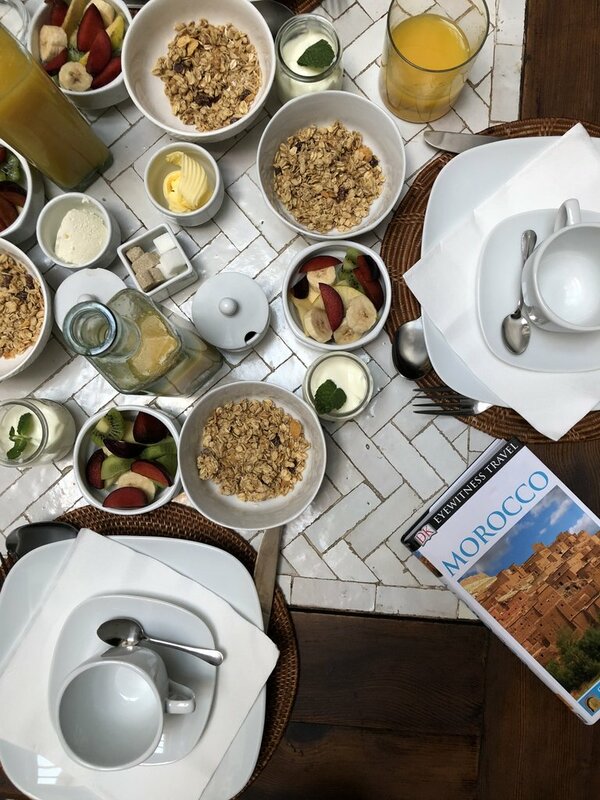 My goal is to always provide a uniquely Moroccan experience, where my travelers can see, feel and taste what makes the Kingdom of Morocco special. 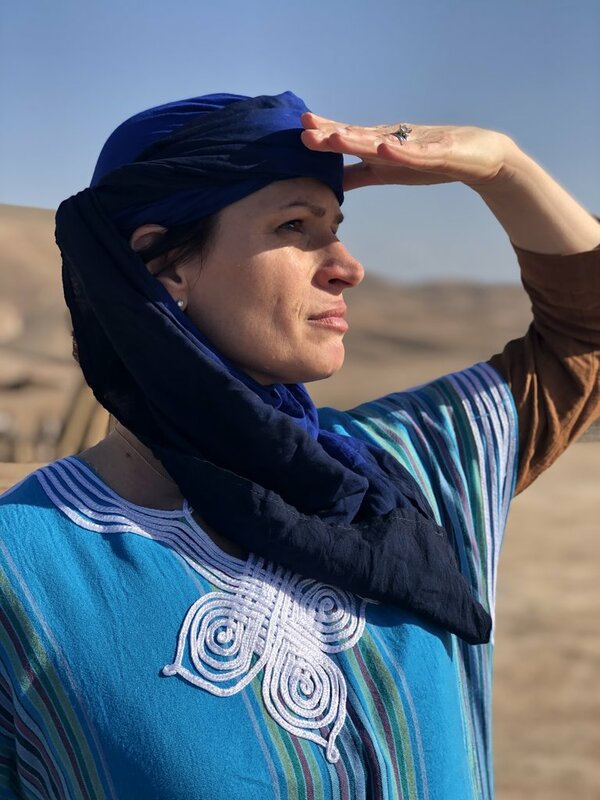 I have worked for the U.S. Peace Corps as an Arabic language instructor and culture trainer, as well as worked with different travel companies in Morocco facilitating and organizing cultural tours and programs. 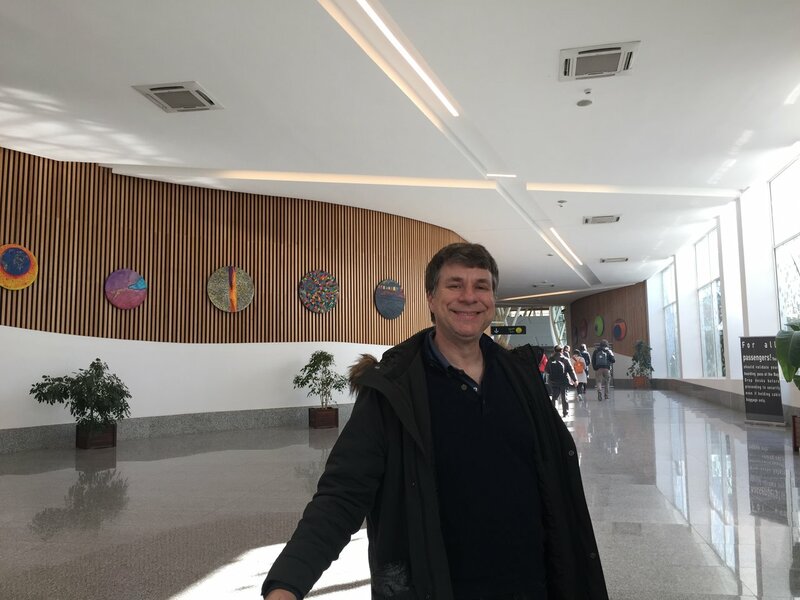 I have also conducted cross-cultural educational programs for several American organizations and taught French and Arabic at a primary school in Citta Del Castelo, Italy. 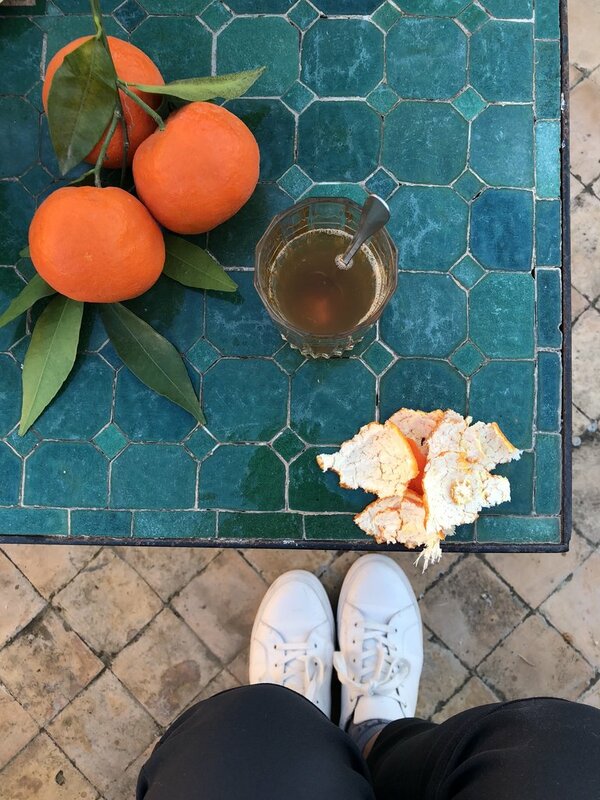 In addition to speaking my native Arabic language, I'm also fluent in French and English. 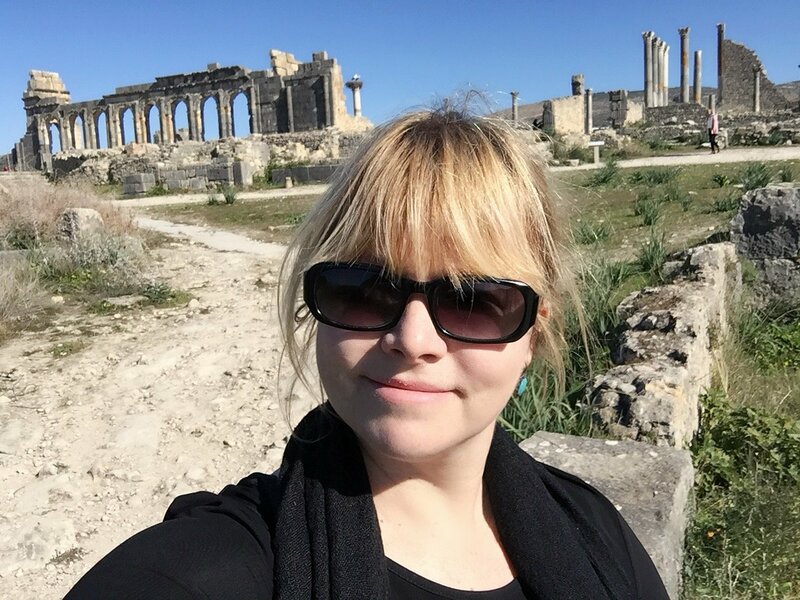 At Central Washington University in Washington State, I graduated with a Bachelor of Science degree in Business Administration and Marketing and I'm currently pursuing my Master's Degree in Data Analytics at the same university. 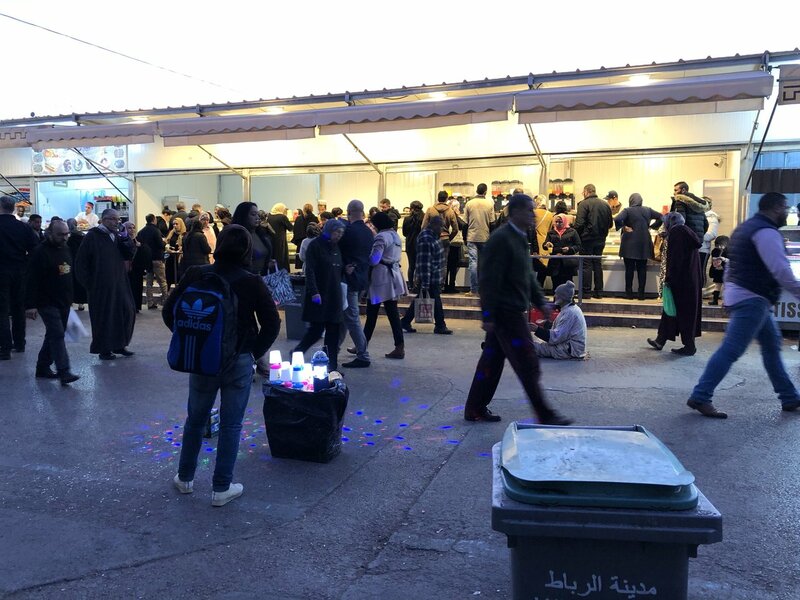 I also volunteer and teach English to Syrian refugees in the greater Seattle area while providing them with localization and life coach services. I strongly believe that cross-cultural education and international learning opportunities are the keys to promoting peace and building a long-lasting friendship. 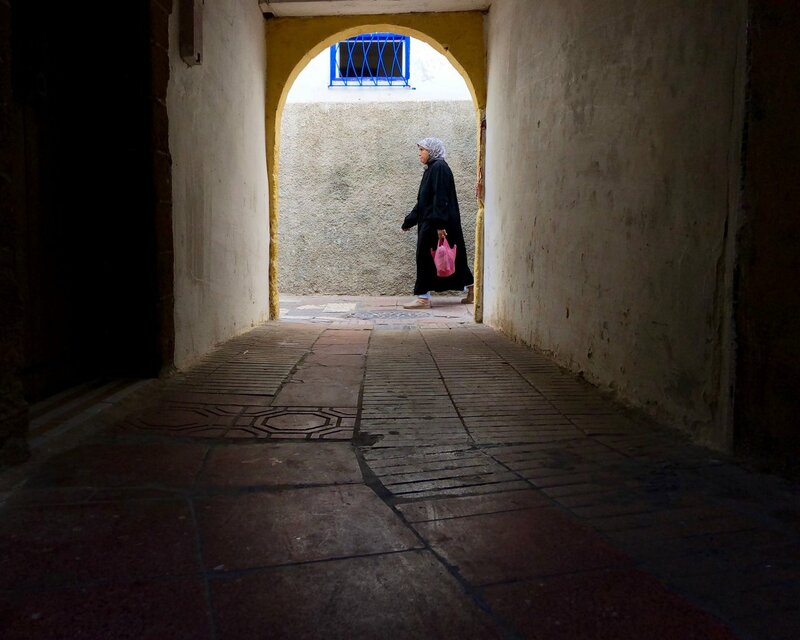 "Morocco Off the Beaten Track operates mostly in semi-urban to rural areas. 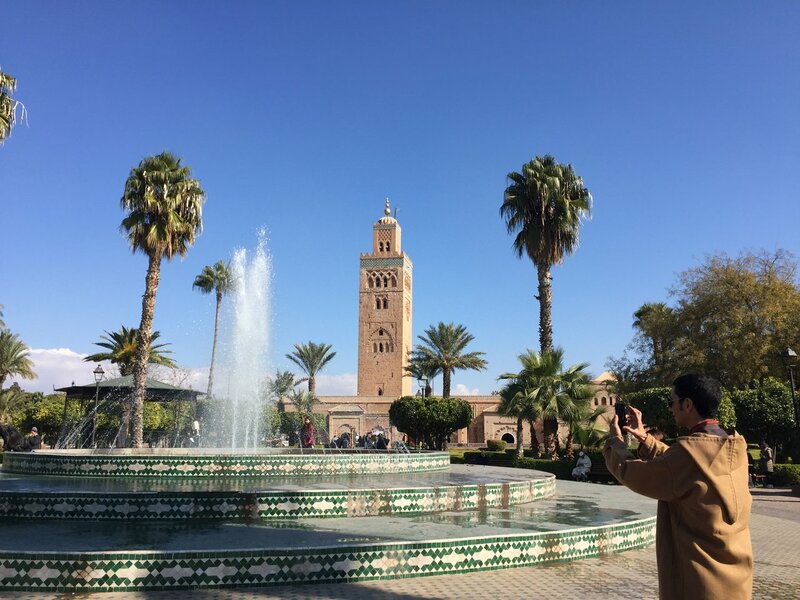 We generally want to give our travelers the opportunity to experience the real Morocco far from the touristy places, however can plan trips to the larger and Imperial Cities (Marrakesh, Rabat, Fez, Casablanca, etc.) if our travelers so desire. 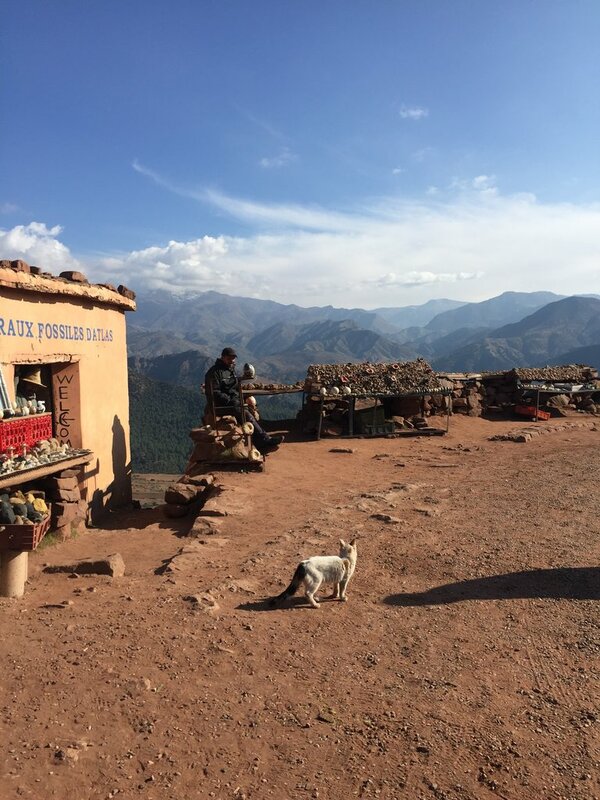 In our tours, we visit villages, meet artisans and farmers, and share food with local people. 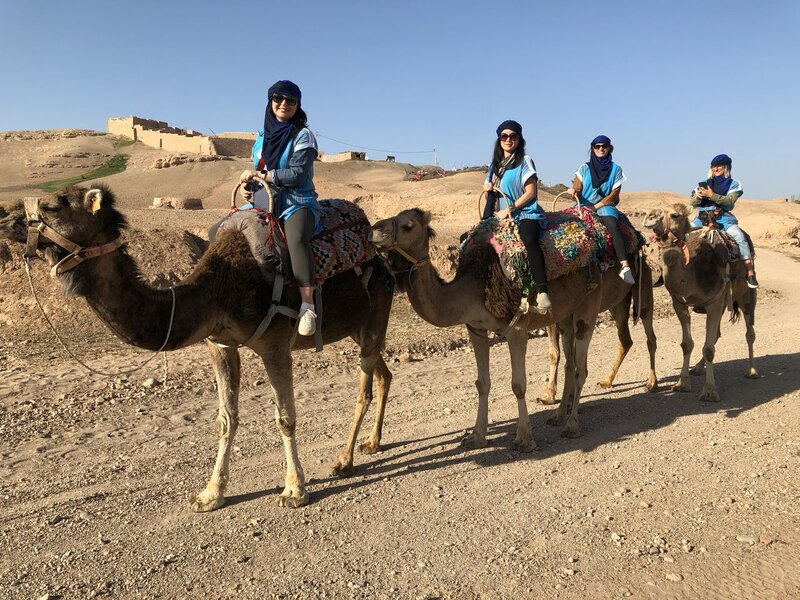 Our activities include community service, historical and cultural tours, hikes and treks, cooking classes, surfing instruction, 4x4 and camel desert trips, skiing and snowboarding, rafting, and rock climbing." 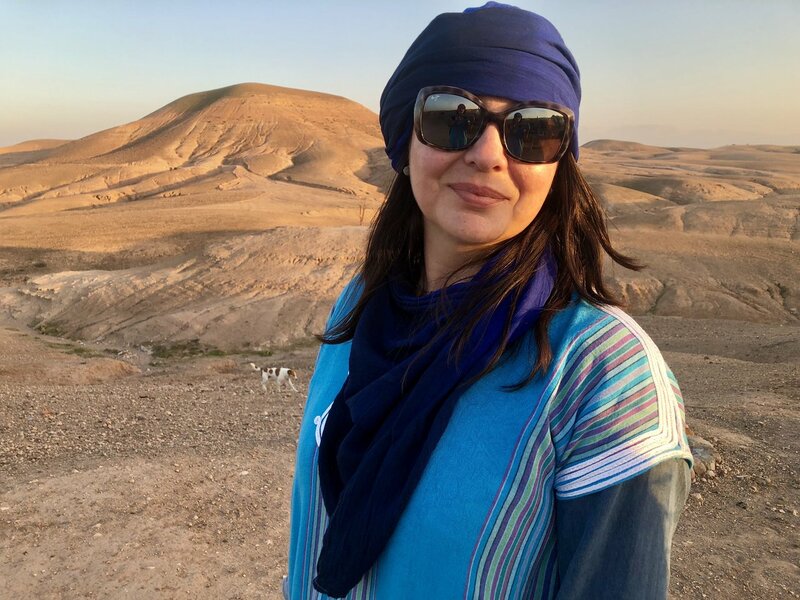 "I started Morocco Off the Beaten Track to provide opportunities for travelers to learn about Morocco and to support local Moroccan communities by providing jobs and giving them the experience of interacting with people from other countries. 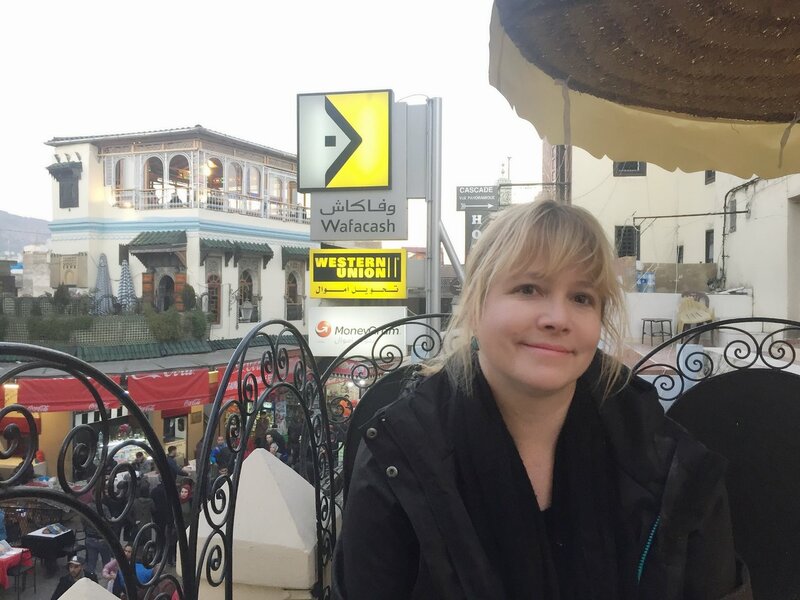 The catalyst for this was my experience with the US Department of State Middle East Partnership Initiative (MEPI). I was selected to participate in the MEPI Student Leaders Program at Montana State University because of the quality of my leadership experience and community involvement. 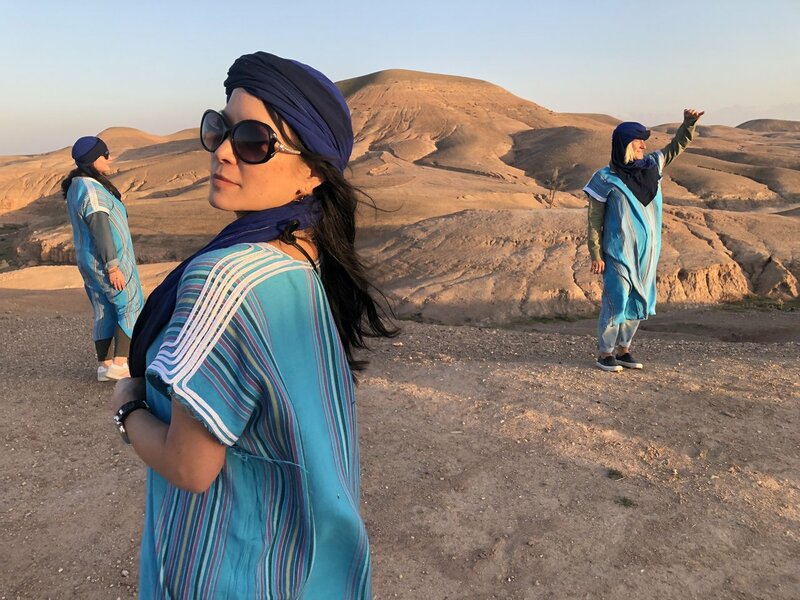 This prestigious program brings young leaders from North Africa and the Middle East to learn leadership skills and to study democracy, human rights, and conflict resolution. 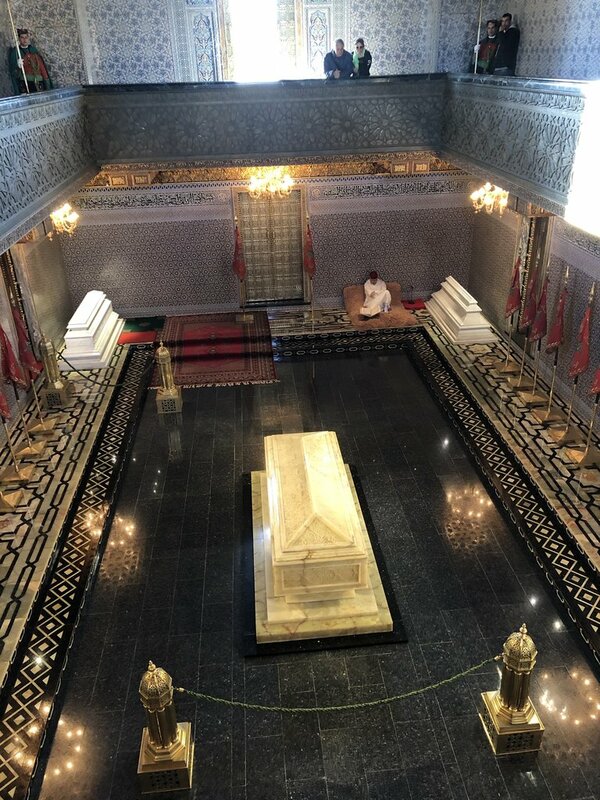 In my time in the USA, I realized how little Americans knew about Morocco and how many misconceptions there were of the Arab world. 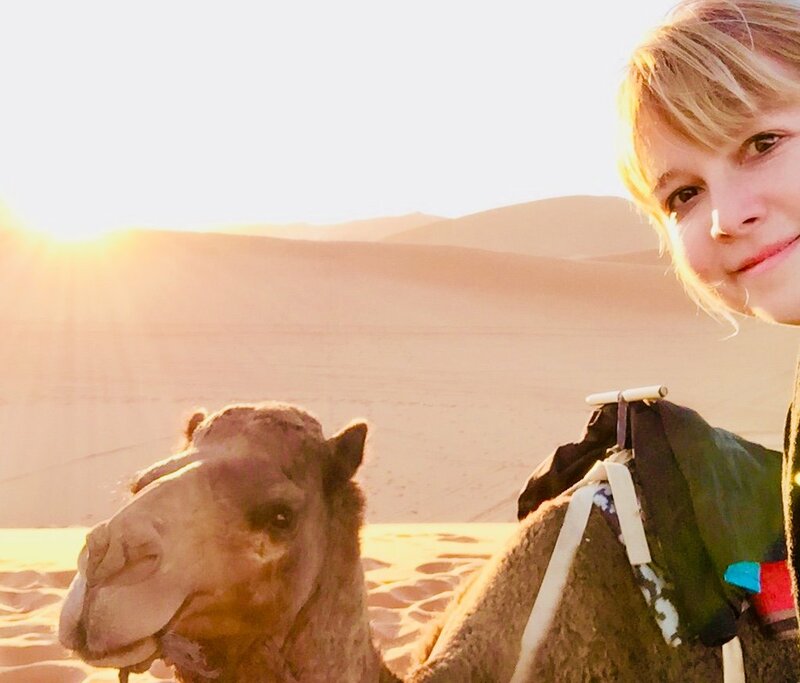 I decided to found a travel company that could bridge the gap in understanding of Morocco and the US. 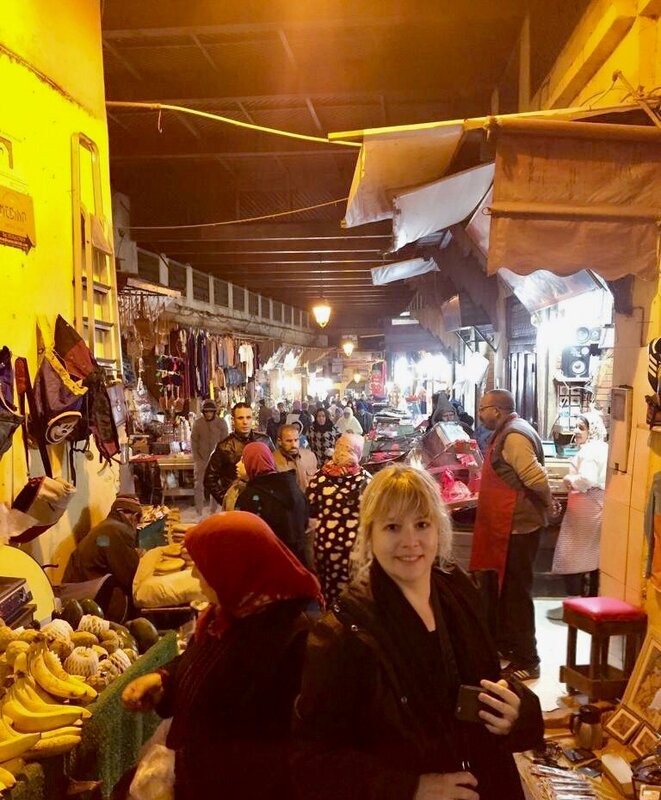 I had experience working with travel companies in Morocco, and had traveled throughout the country myself, so I knew what it would take to start this company and how to create and facilitate outstanding programs for my travelers." 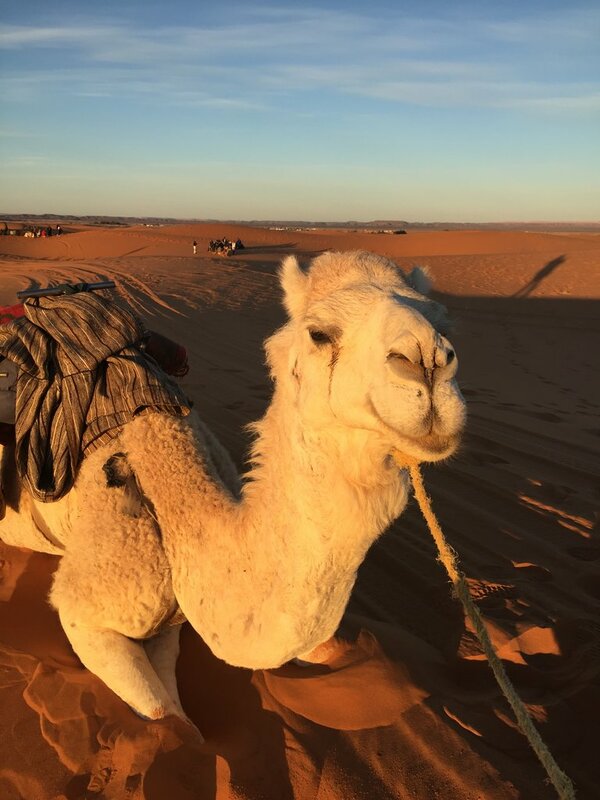 "I will never forget the time I went with my friend to the desert dunes of Merzouga in Morocco. 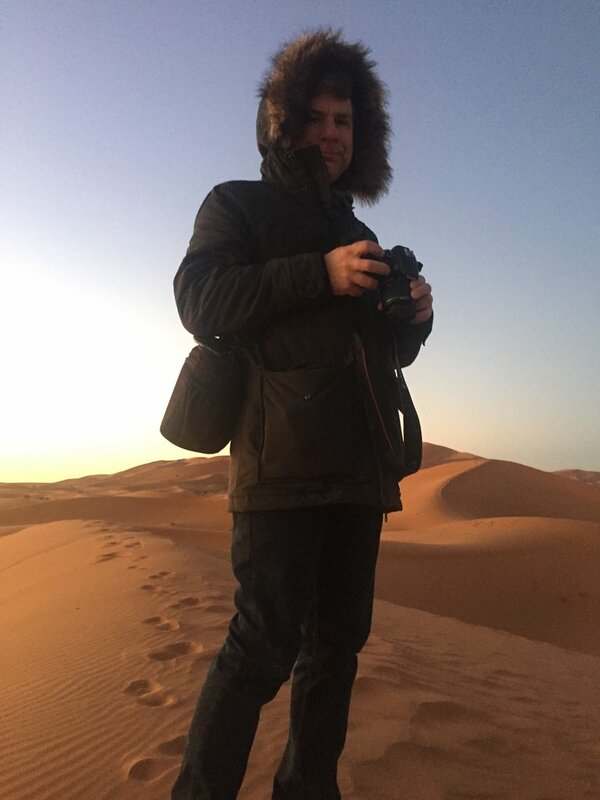 Prior to traveling there, I had not known that Morocco had deserts like this. 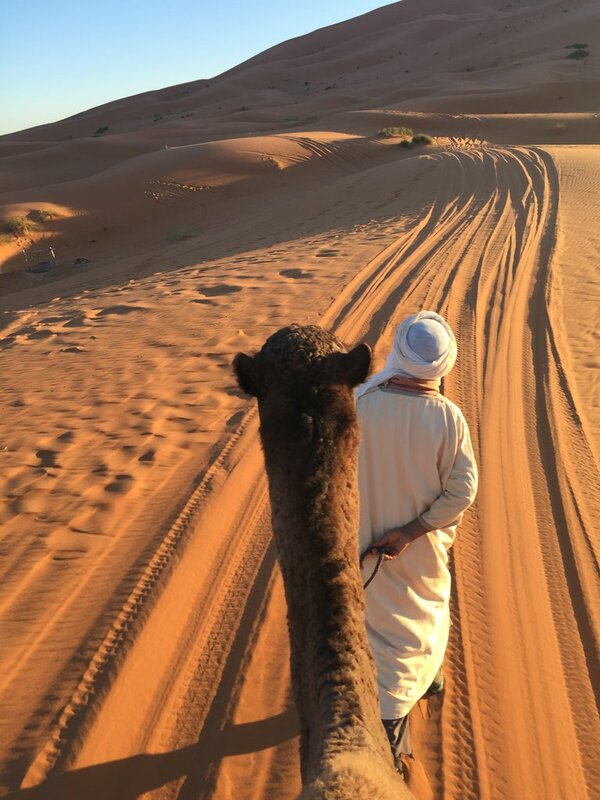 It was endless rolling dunes of reddish sand, and it took us two hours by camel to reach the oasis we were staying at. 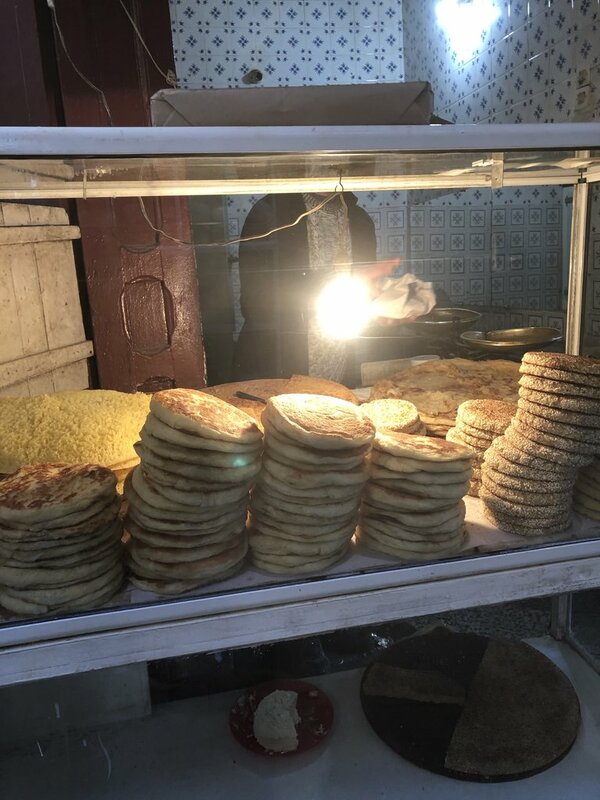 At the oasis, I learned different ways to bake bread by the local Berber nomads and got to try their unique foods. Their hospitality was outstanding and was one of the more special things about the trip. 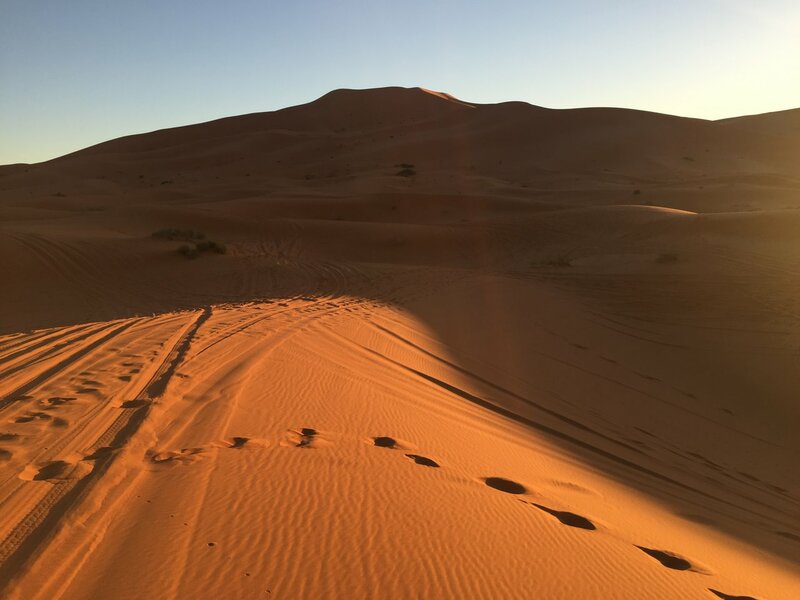 In the evening we went to the largest dune in the area and got to see the silver shine of the desert in the moonlight. It was a breathtaking view and something I will never forget." 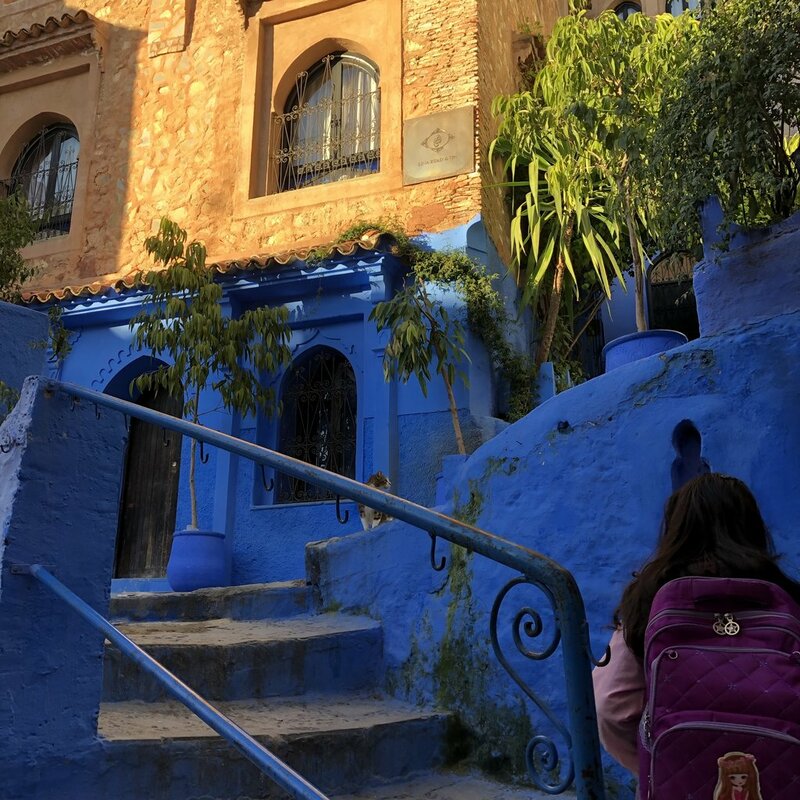 Discover Morocco's ancient and historic cities on this complete two-week itinerary. 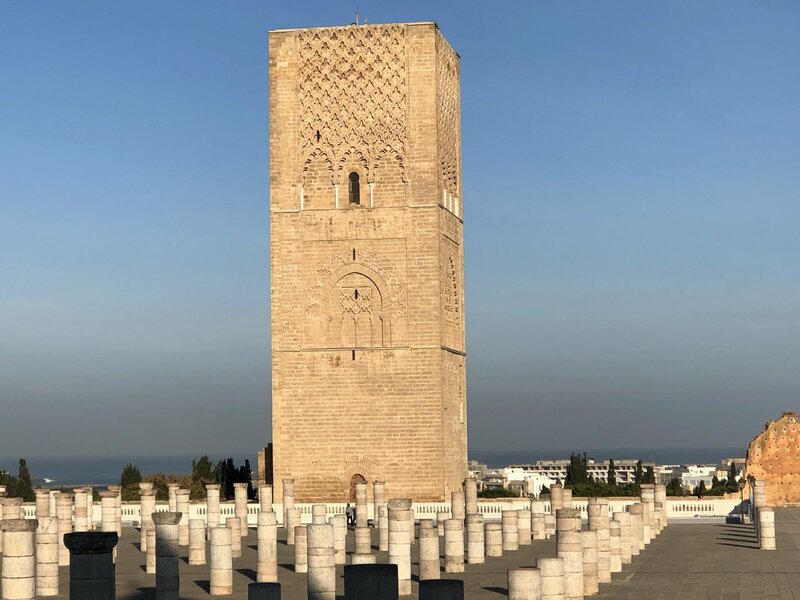 You'll cover three imperial cities, Marrakech, Fes, and Meknes, as well as less-traveled cities like Beni-Mellal, Moulay Idris, and Tetouan. 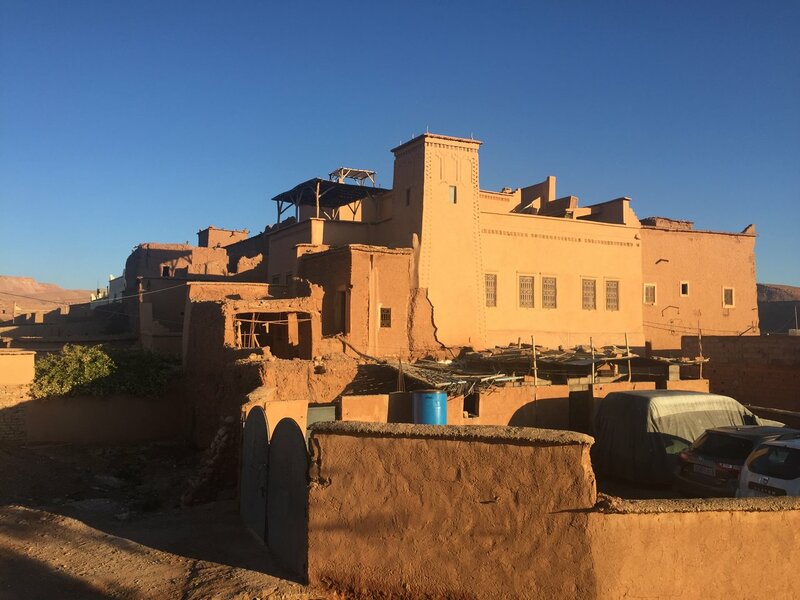 You'll wander maze-like streets, participate in a cooking class, drive through the Atlas mountains, and explore ancient Roman ruins. 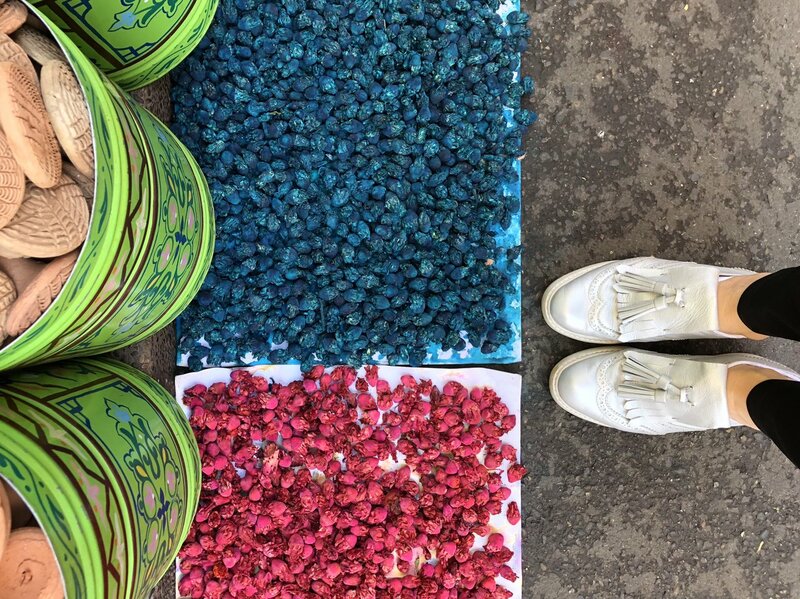 Planning the perfect trip to Morocco? 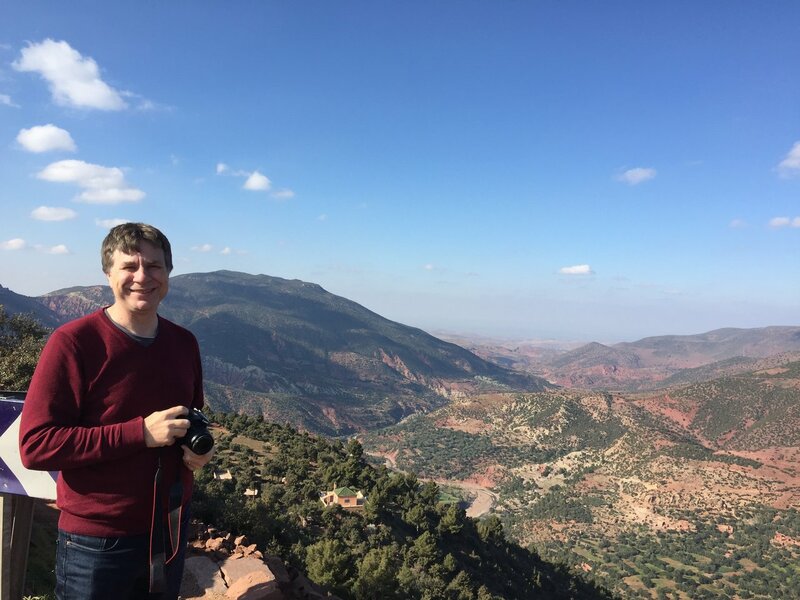 Here's a quick introduction to kimkim, how our trips work, and what makes us unique. We'll go over how our itineraries are customized to your interests, and what to expect during your trip. 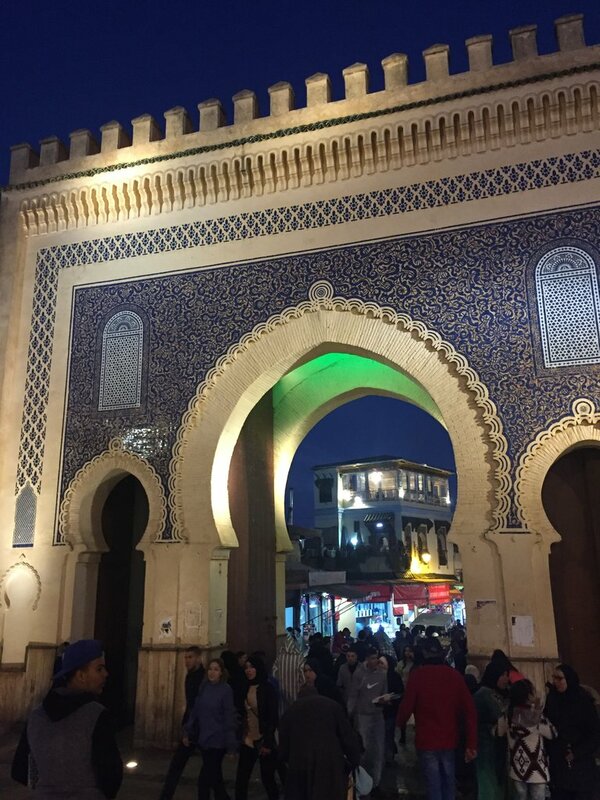 This quick trip takes you through Morocco's best cities. 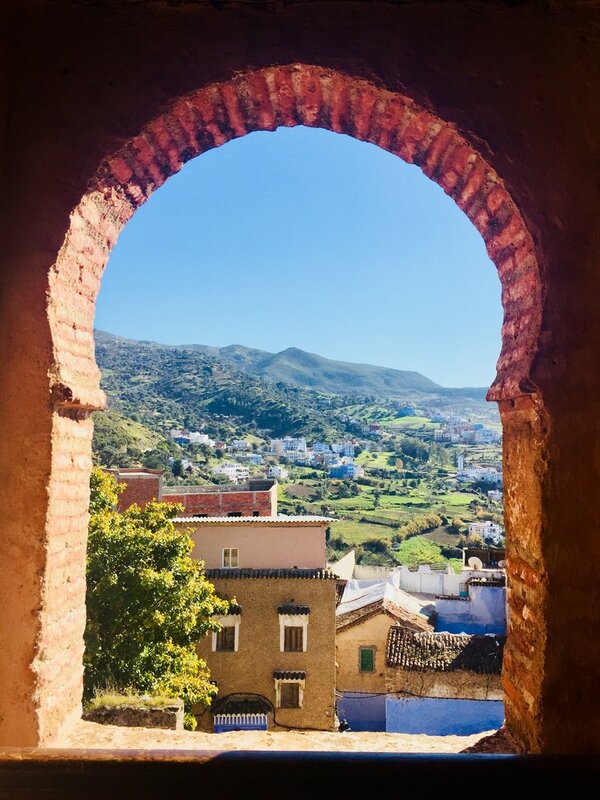 Start in the north in Tangier and work your way south to the blue-painted streets of Chefchaouen, passed Roman ruins in Volubilis, and through the medieval medina in Fes. 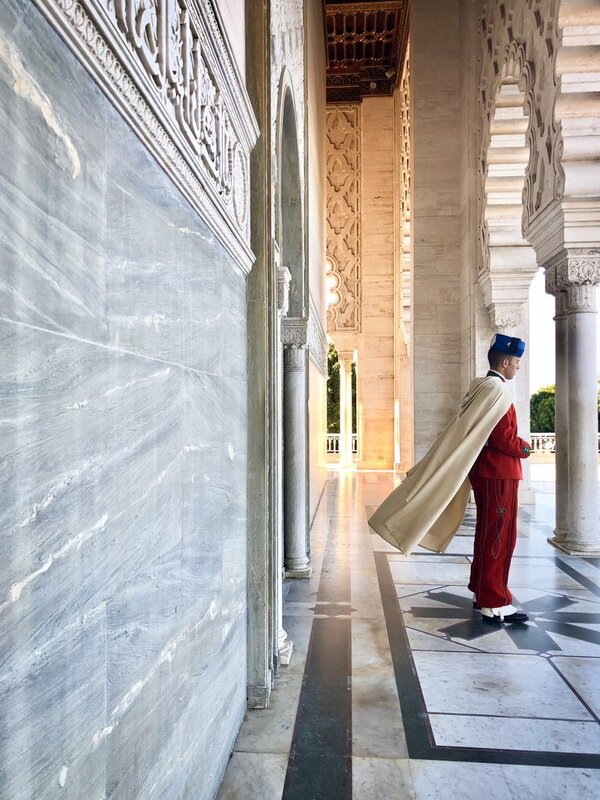 Carry on west to Morocco's capital, Rabat, before reaching modern Casablanca and finishing in lively Marrakech. 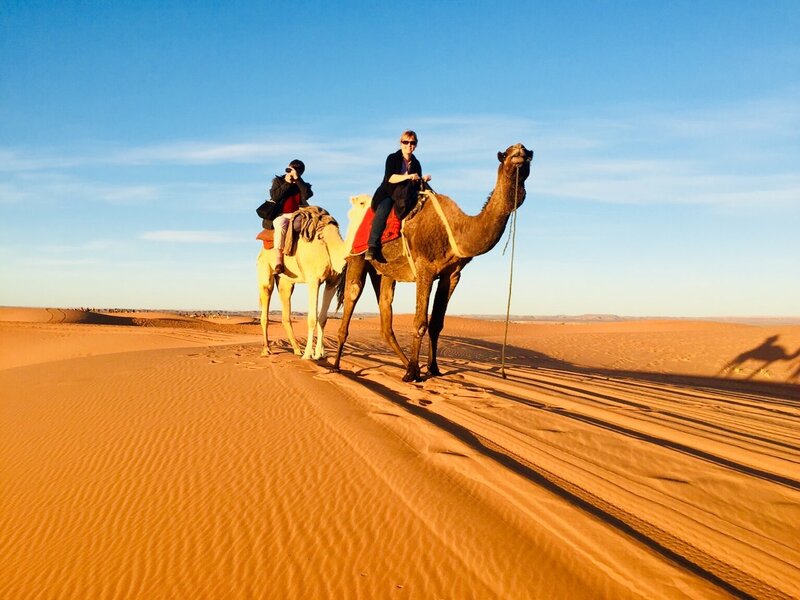 This 11-day grand tour mixes culture and adventure, featuring Morocco's 4 Imperial Cities, several days exploring the Sahara and surrounding desert, and hiking in the High Atlas mountains outside of Marrakech. 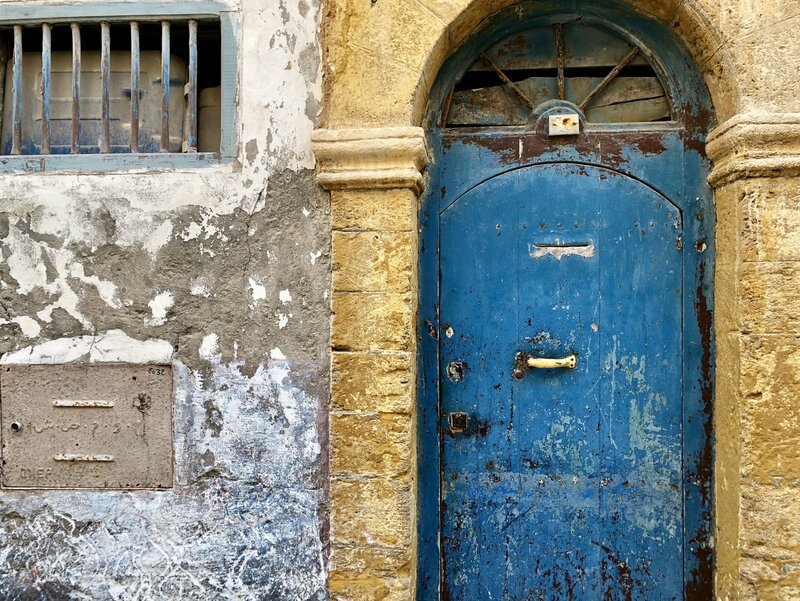 This 10-day itinerary combines culture, history, and adventure. 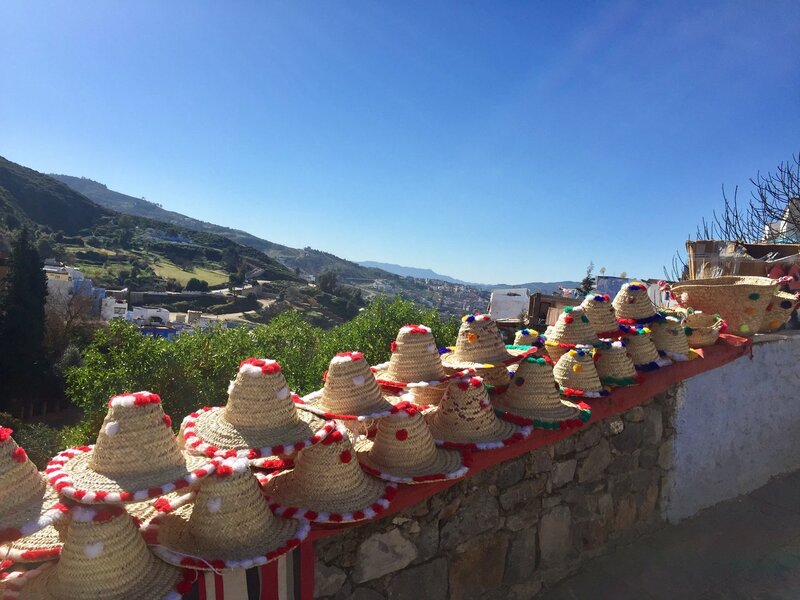 Begin in northern Morocco in Tangier and Chefchaouen before working your way south to Fes, through the desert, and over the Atlas Mountains to Marrakech. 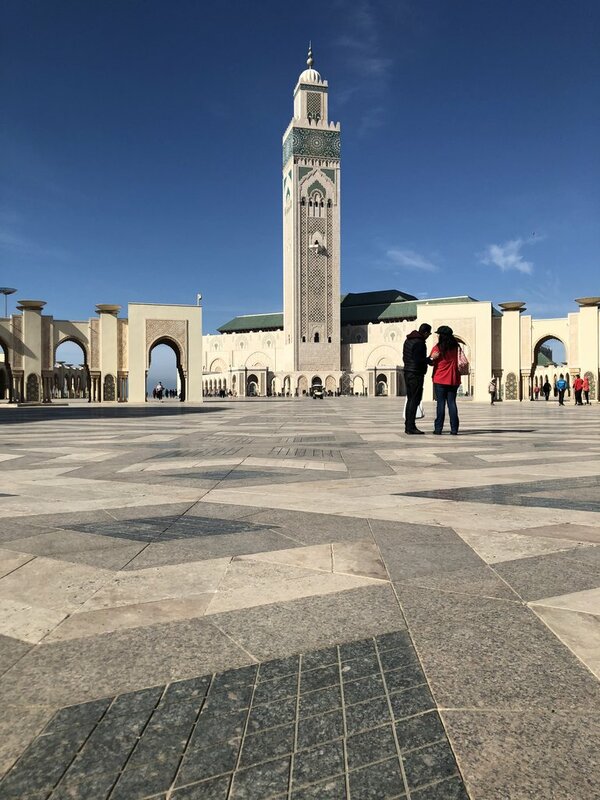 Finish in the commercial capital of Casablanca with a trip to the breathtaking Hassan II Mosque. 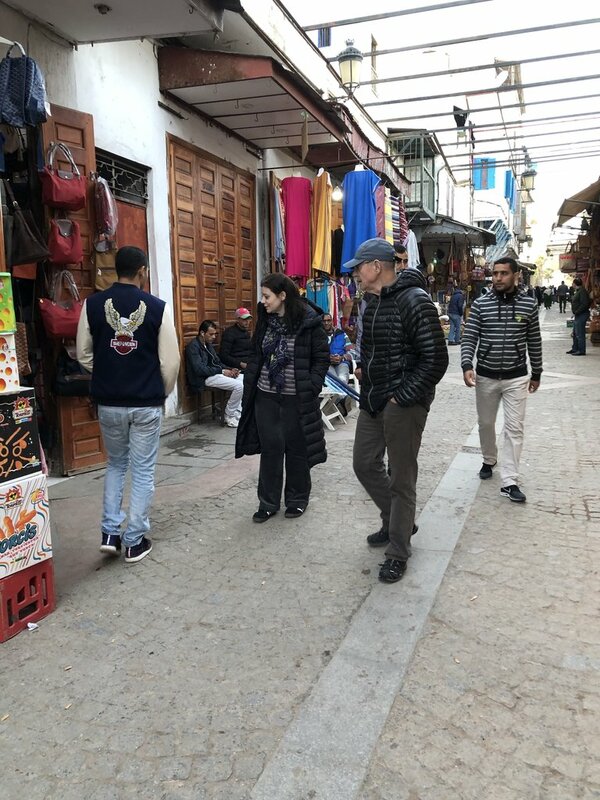 Thanks to kimkim and Yassine, who organized a wonderful trip for us to Morocco's imperial cities of Marrakesh, Rabat, Meknes, and Fez, along with visits to the coastal city of Essaouira and the commercial hub of Casablanca. Planning our trip was a breeze. 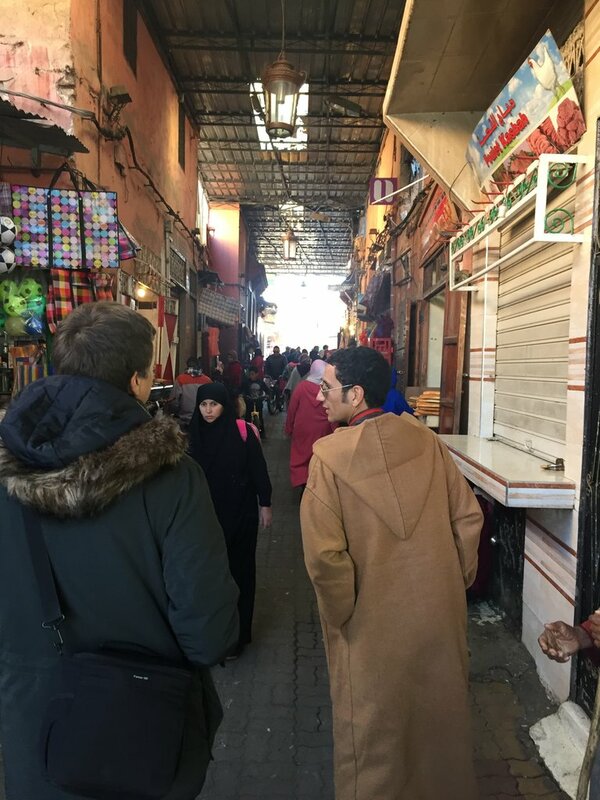 Once I told Yassine we were particularly interested in food, history and culture, he recommended places to visit. I did some research and we settled on an itinerary. 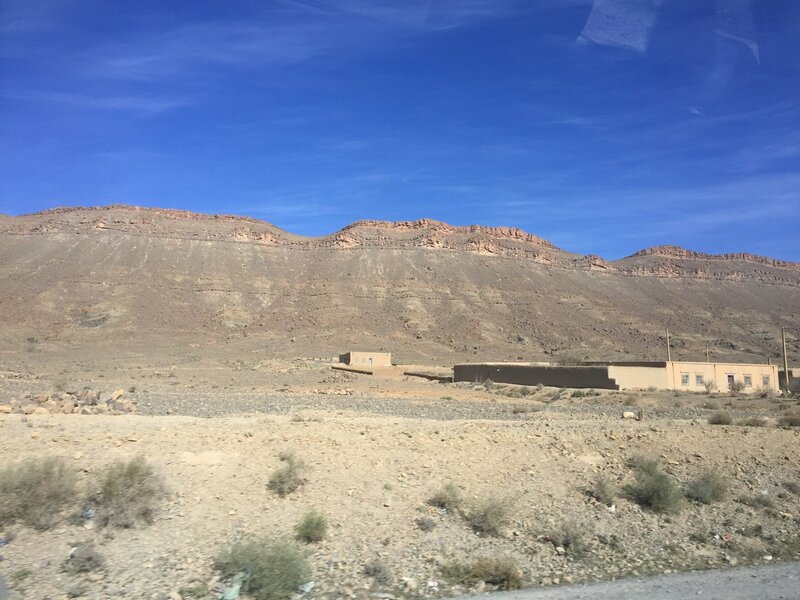 Although we spent a bit of time driving between destinations, that was an interesting experience in itself, seeing the rich farmlands and remote villages. 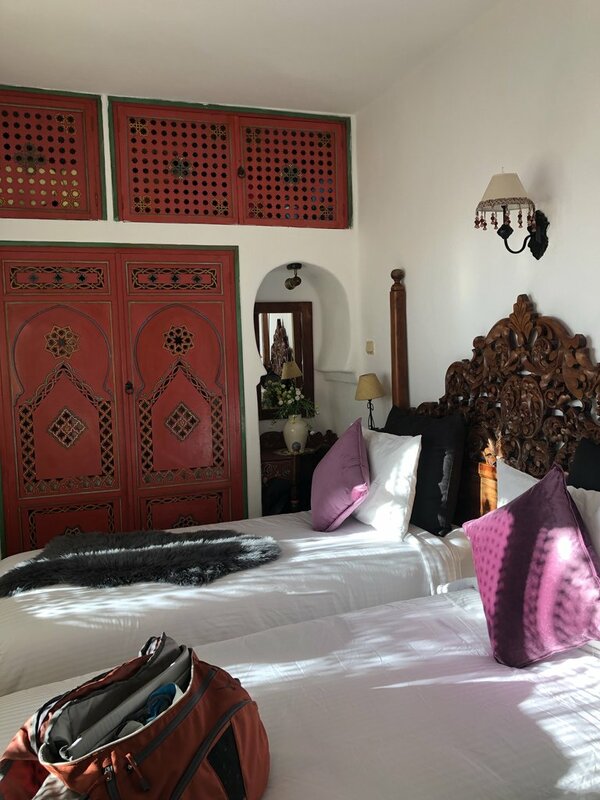 Yassine selected several beautiful riads, bed & breakfasts which are elegantly refurbished homes located in the middle of the old city Medinas. 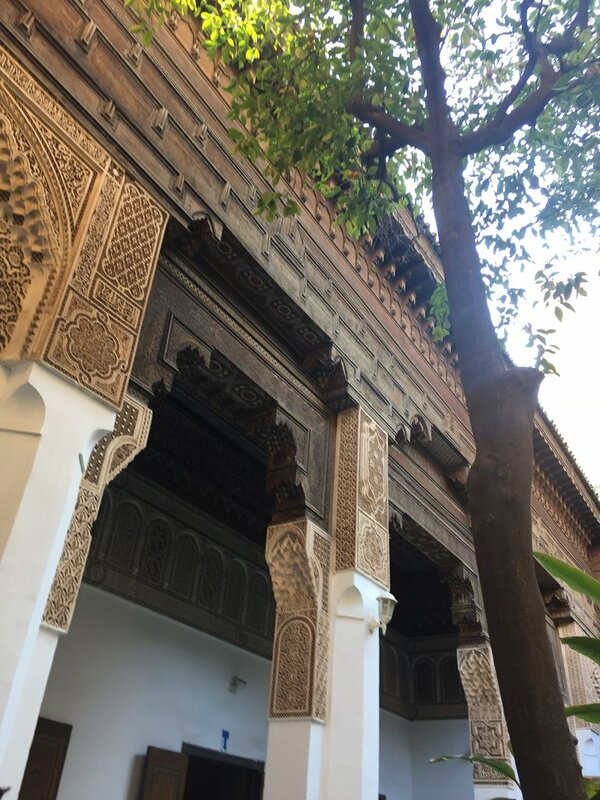 The riads, with their central courtyards and lovely detailed tile work and wood carvings, were a quiet oasis and gave us a genuine feeling for Moroccan history and culture. 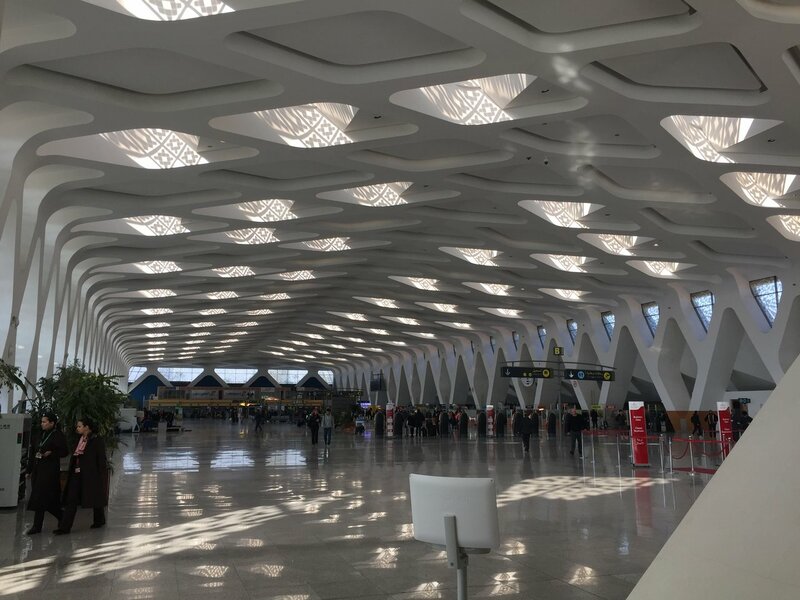 We began our journey with a few hiccups, arriving late to our connecting flight from Casablanca to Marrakesh. 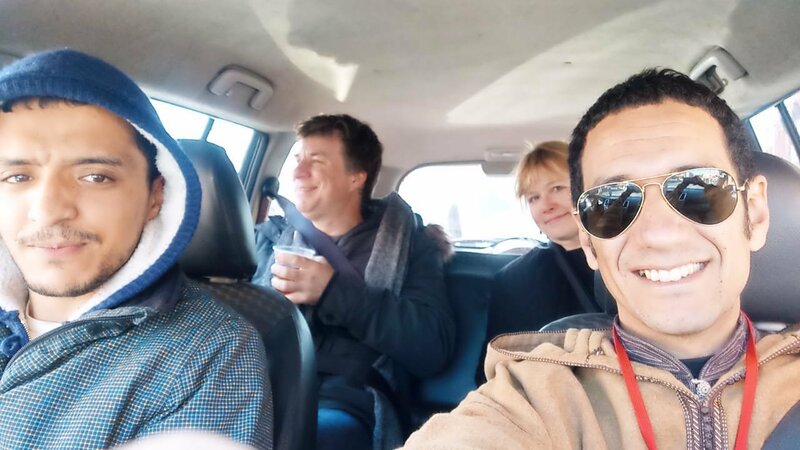 Our driver, Muhammed, coordinated to have us driven instead of waiting 4 and 1/2 hours for the next flight. When we weren't able to retrieve our luggage, we waited two days before it caught up to us. In the meantime, Muhammed was terrific. He was warm, friendly, flexible, and completely reliable. 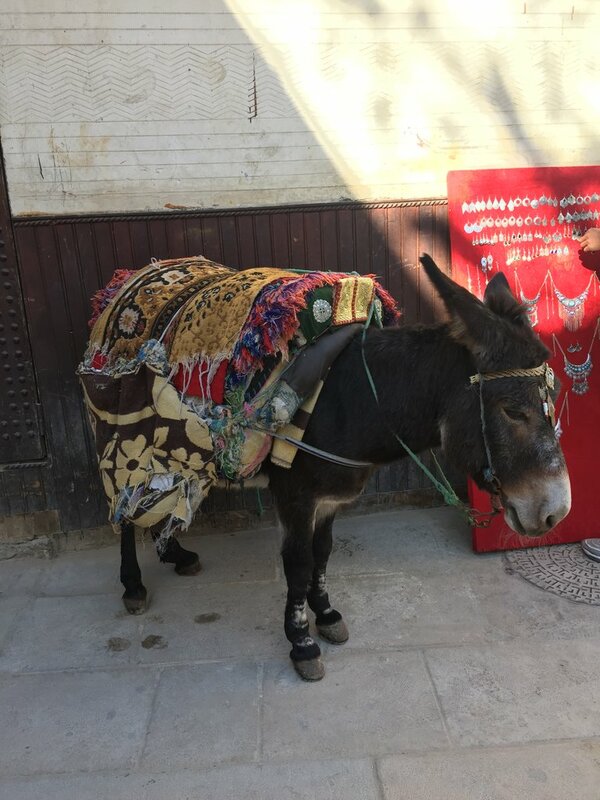 He patiently took us back to the Marrakesh Airport several times until the luggage finally arrived. 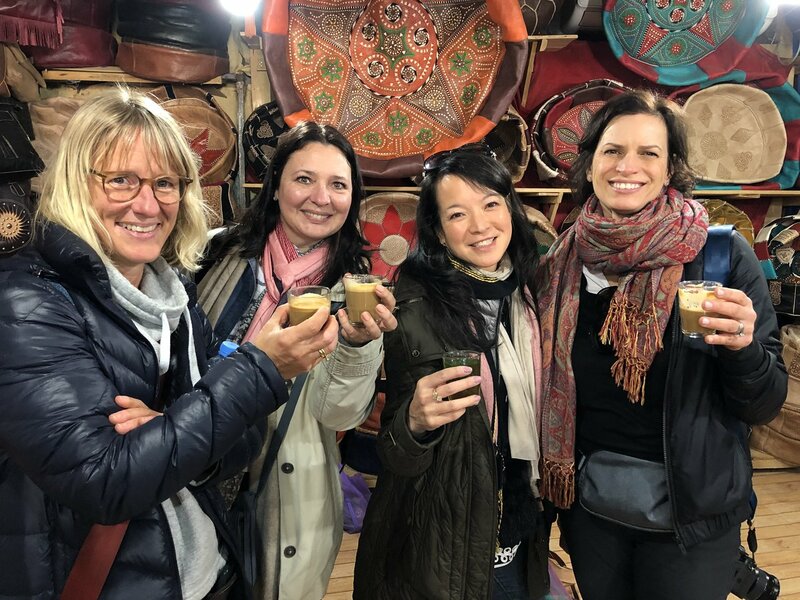 Although we enjoyed our entire trip, we particularly loved walking through the Kasbah of Rabat, the bustling Medina of Fez, and visiting the beautiful beaches of Essaouira. 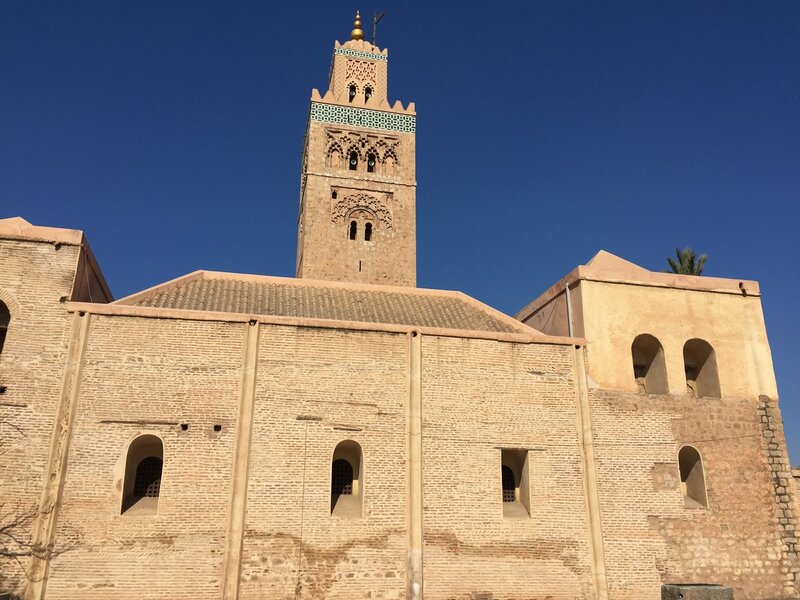 Our guides in Marrakesh, Rabat and Fez all gave us wonderful historical background on each of the cities and a sense of present day Morocco. 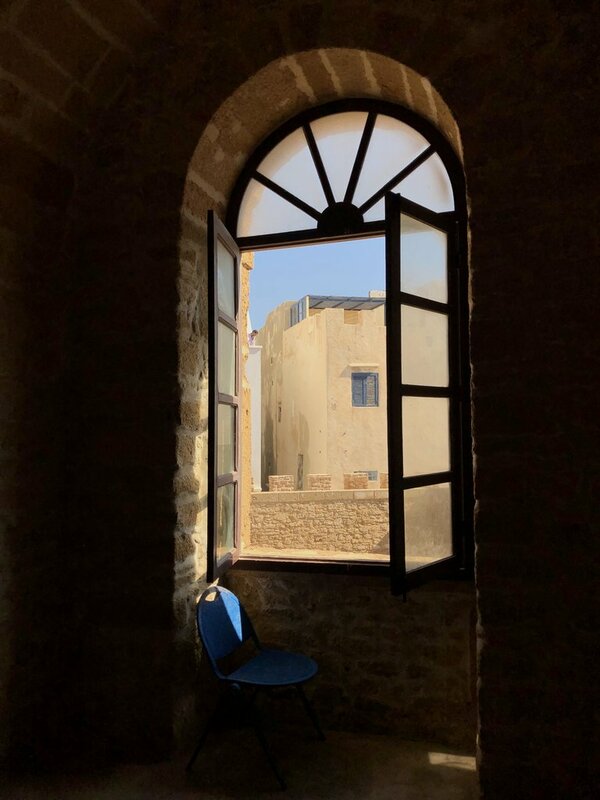 Our only regret is that we didn't have more time to explore this beautiful country. 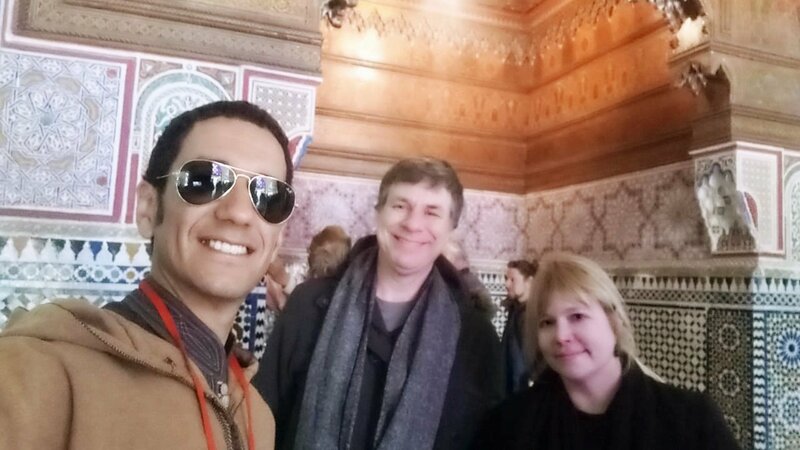 We will definitely use kimkim and Yassine to plan our next visit! 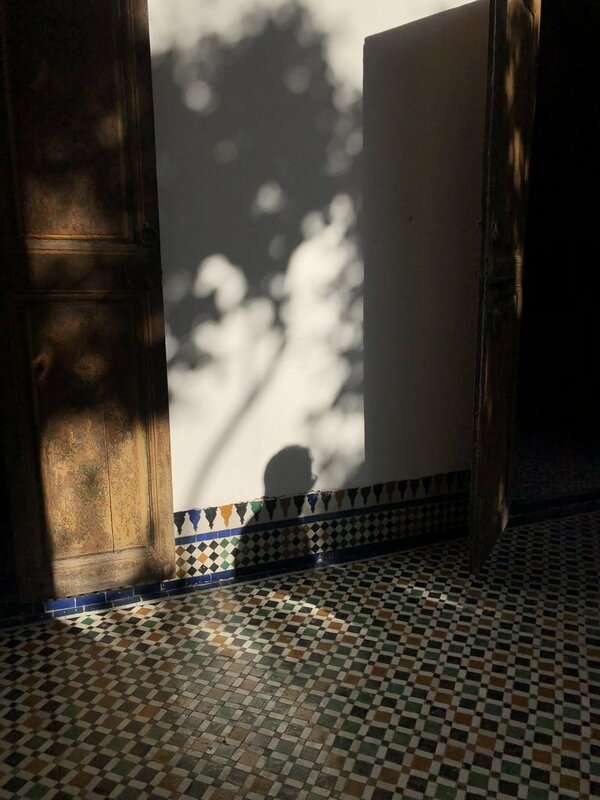 I am so happy to hear about your wonderful time in Morocco. 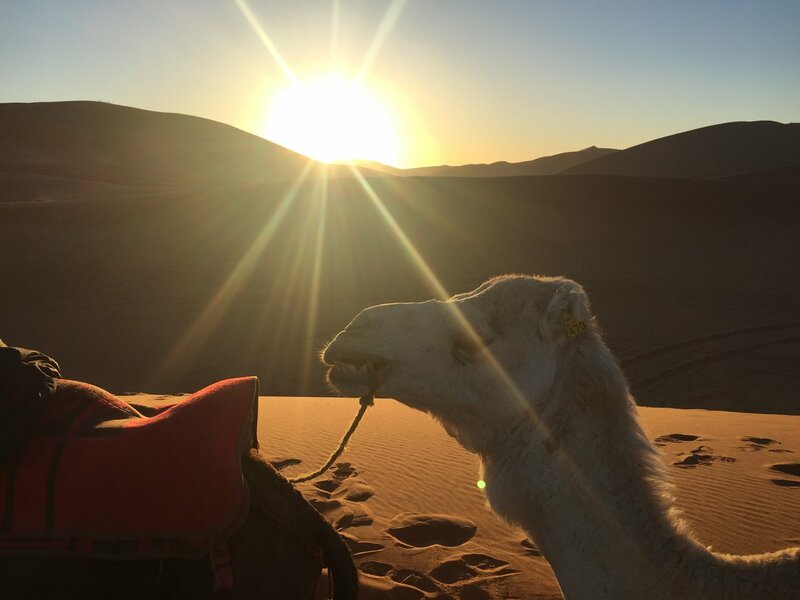 Your feedback about your trip is so important to us, and I thank you for being so detailed in your comments. I am glad to hear that Mohammed did such a good job for you and that your unfortunate airline delay ended up working out in the end. I will surely give him your feedback. 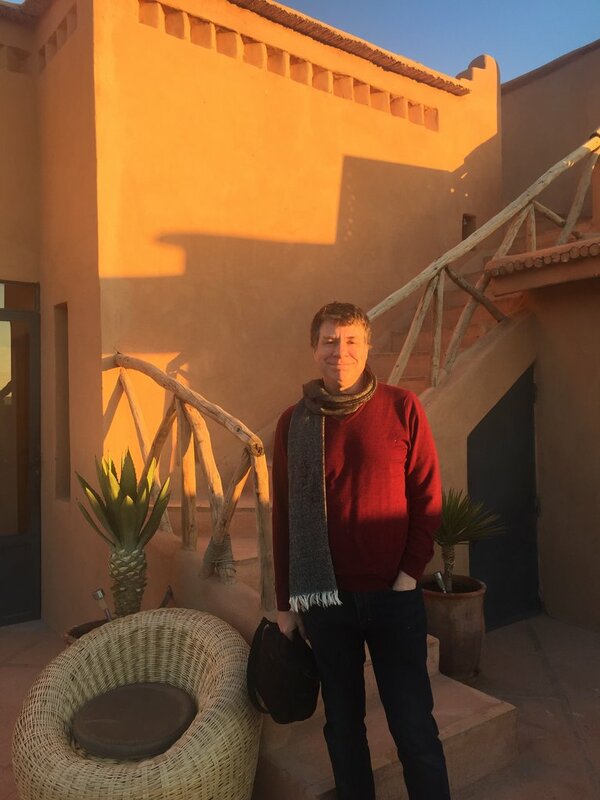 I am also glad that you enjoyed your accommodations and their locations in the medinas. 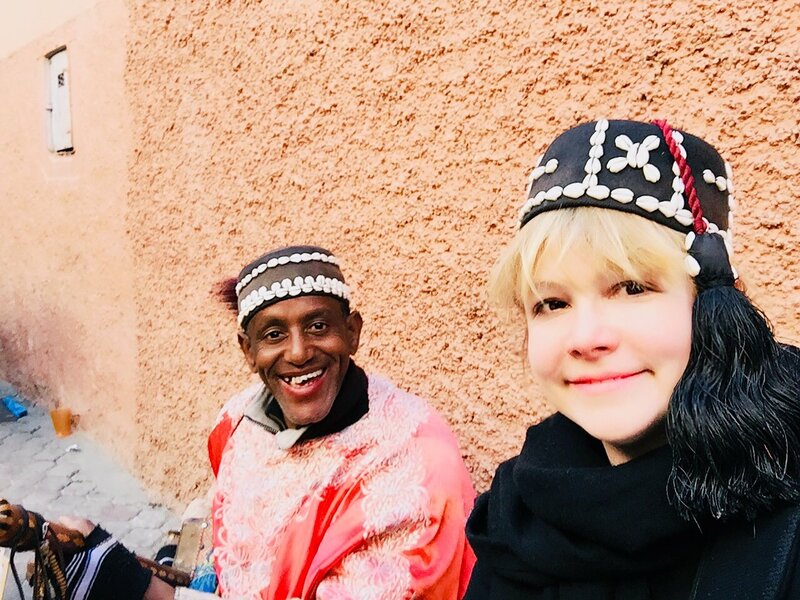 This is the best way to experience Morocco and with your comments on how much you enjoyed walking through the cities, I can see that you experienced this. I am thankfully that you decided to travel with us, and so happy that you enjoyed your trip. When you can come back in the future, please reach out. I would greatly enjoy planning your trip with you again. 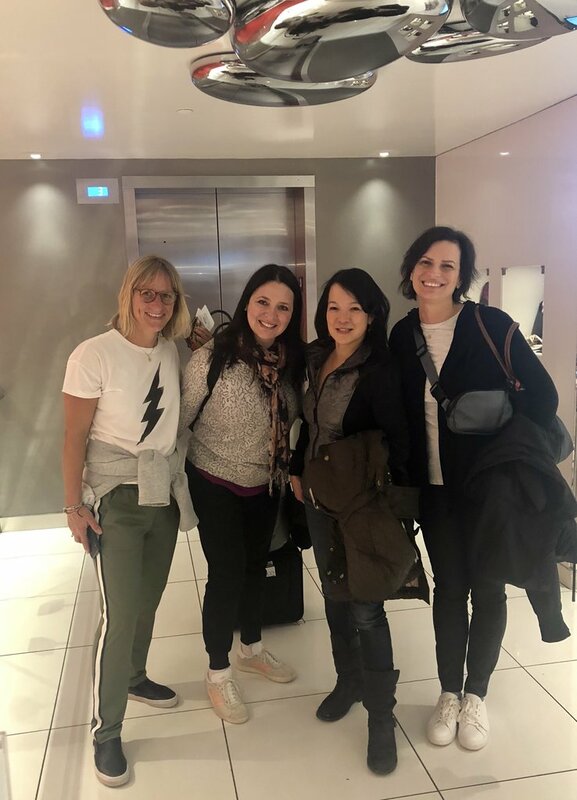 Our entire experience with KimKim was effortless. From the initial and follow-up planning with Yassine to the final follow-up was a great experience. 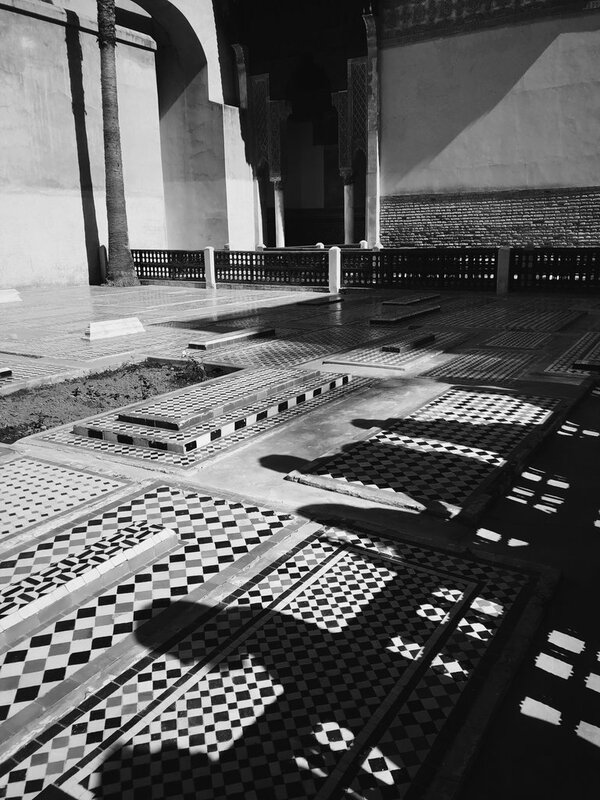 We were met at the Marrakesh airport by a young man named Ismael. We could not have asked for a better person to be our driver and to spend the trip with. He was engaging, courteous, helpful and a very cautious and competent driver. Interacting with him was one of the highlights of our trip. 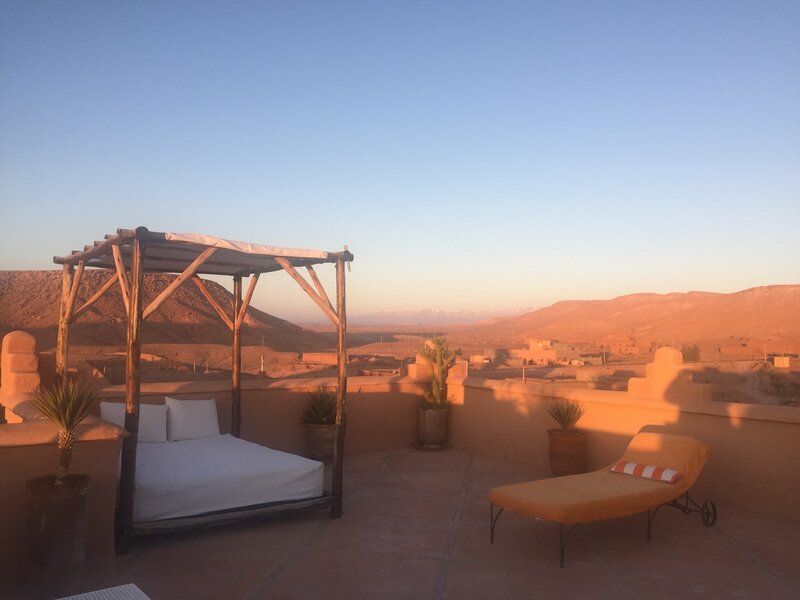 We checked into the Riad Melhoun which was beautiful and the staff was very accommodating. The next morning we were met by our tour guide, Mohammed. 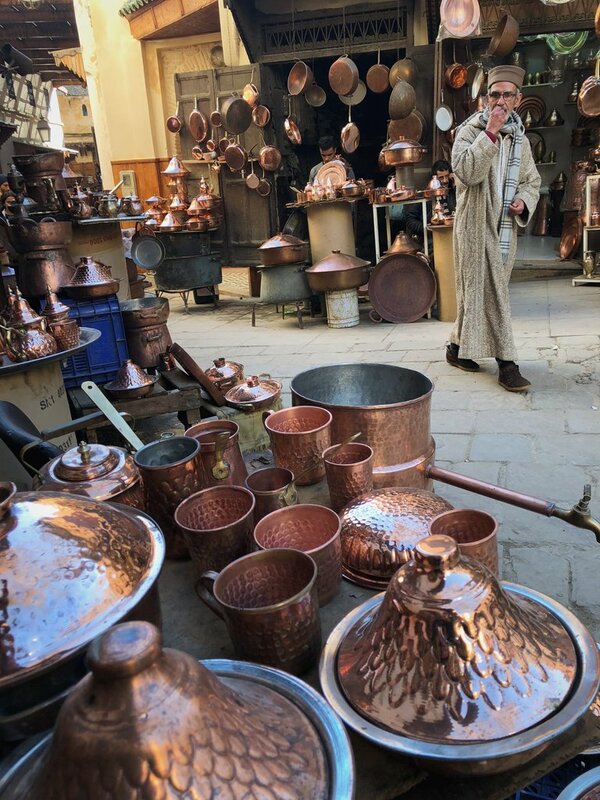 He spent the entire day taking thru Marrakesh and showing us the highlights, along with some very local spots such as the community baker and community Tagine oven and caretaker. 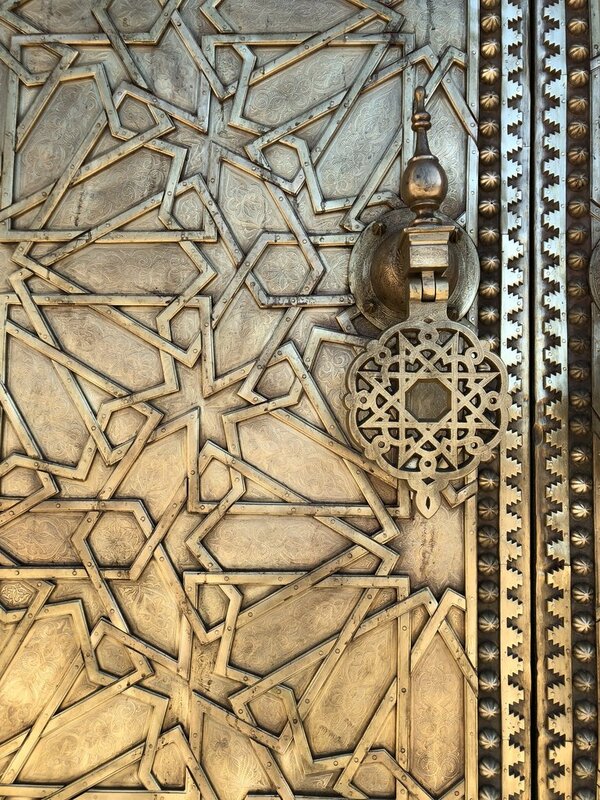 He also introduced us to local craftsman who made ironwork, leather products etc. 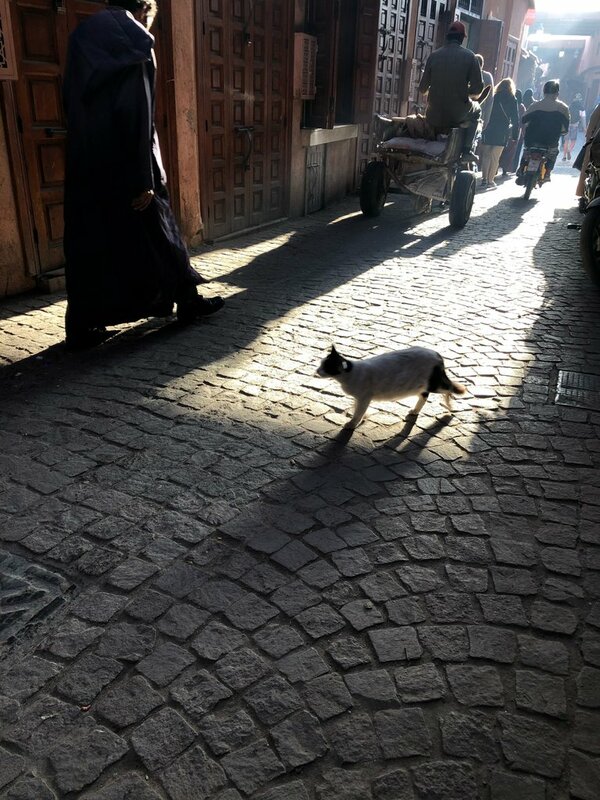 He ended the day with us at the main square in Marrakesh awaiting sunset. 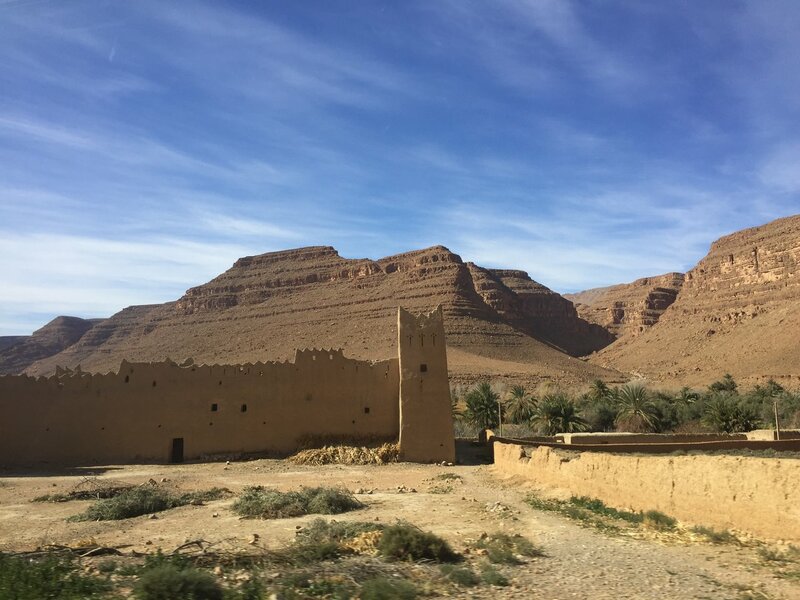 The next day we headed to Ouarzazate, the drive was very scenic and kept our interest. 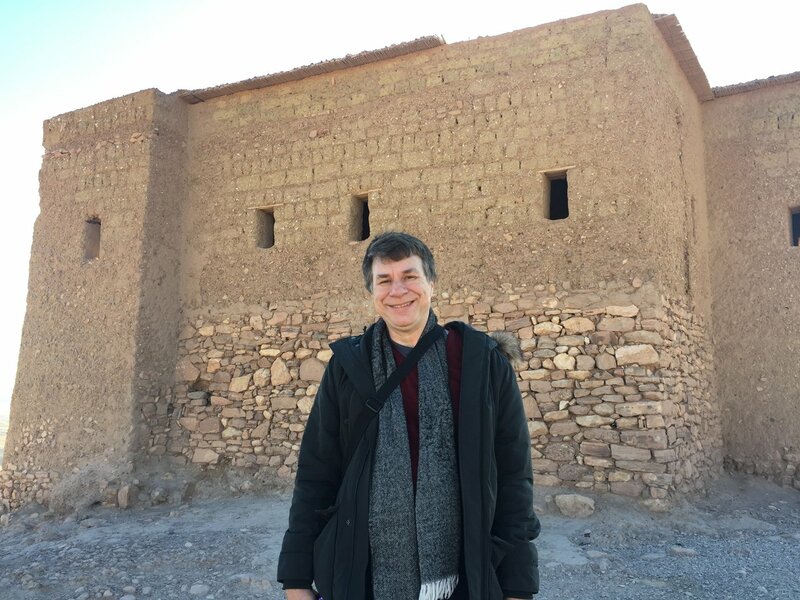 We stopped for a pleasant lunch and then climbed to the ancient village, Ait Benhaddou. 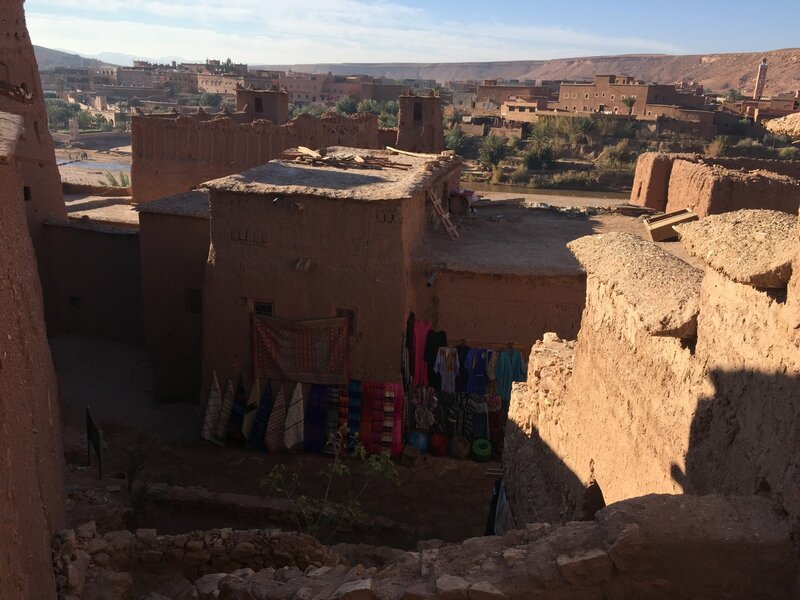 The views were spectacular from this ancient village. 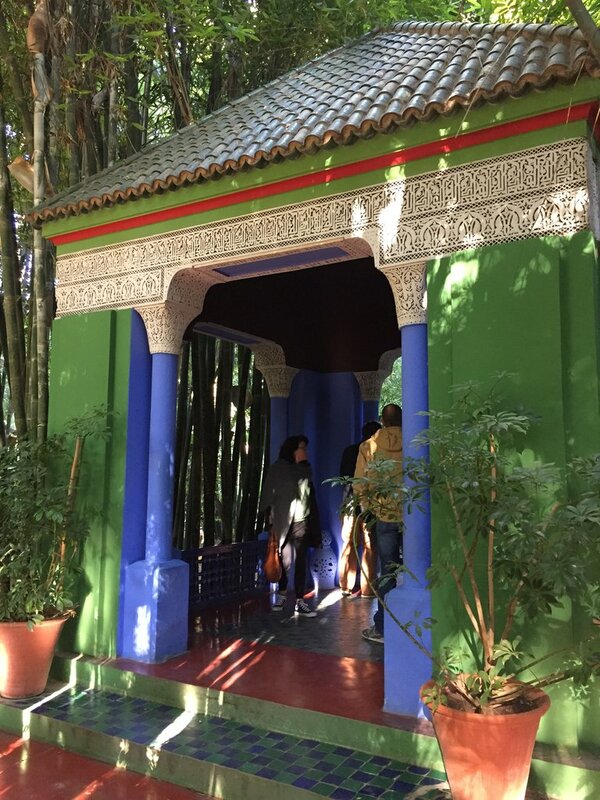 We stayed out Le Temple Des Arts which had “themed” suites. 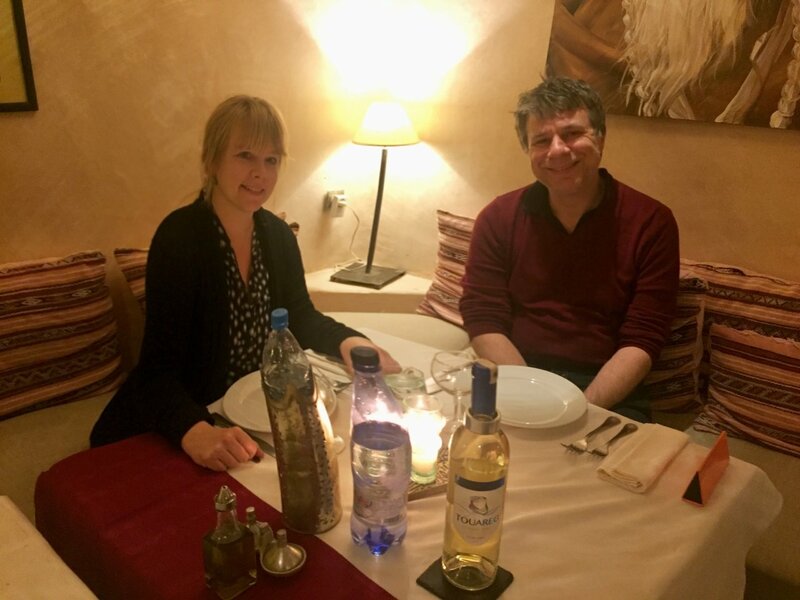 Once again, the staff was very kind and accommodating and we had a very nice dinner at the restaurant there. 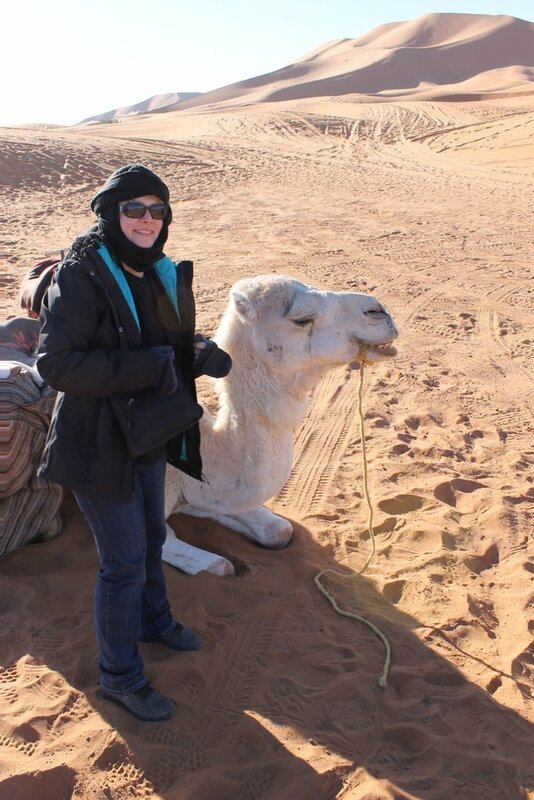 The next morning we were off to Merzouga for our camel trip into the Sahara. 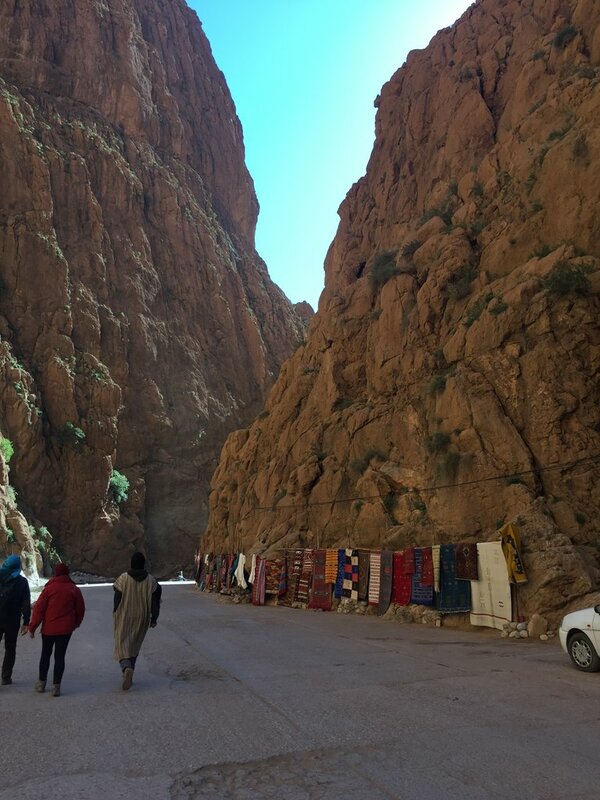 Along the way we stopped at Dades Gorge which was very scenic and a nice walking break. 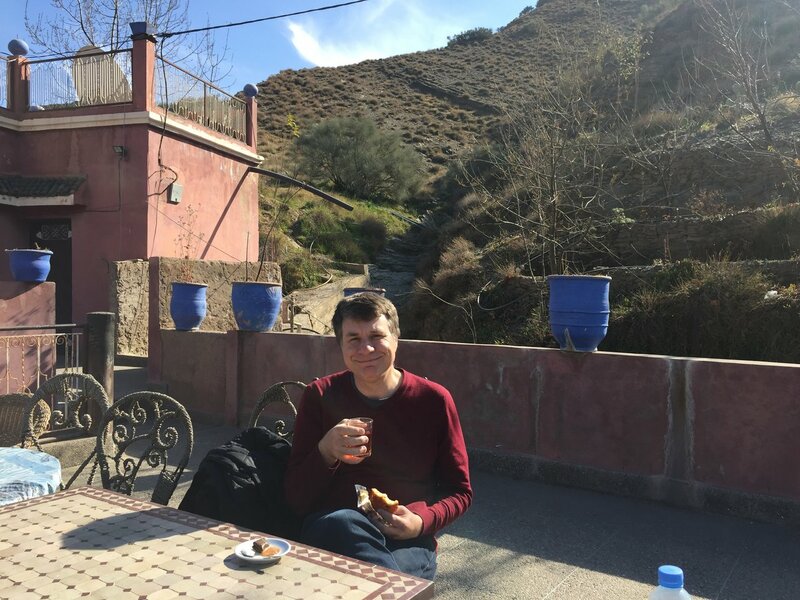 We had lunch in the local village just outside the Gorge. 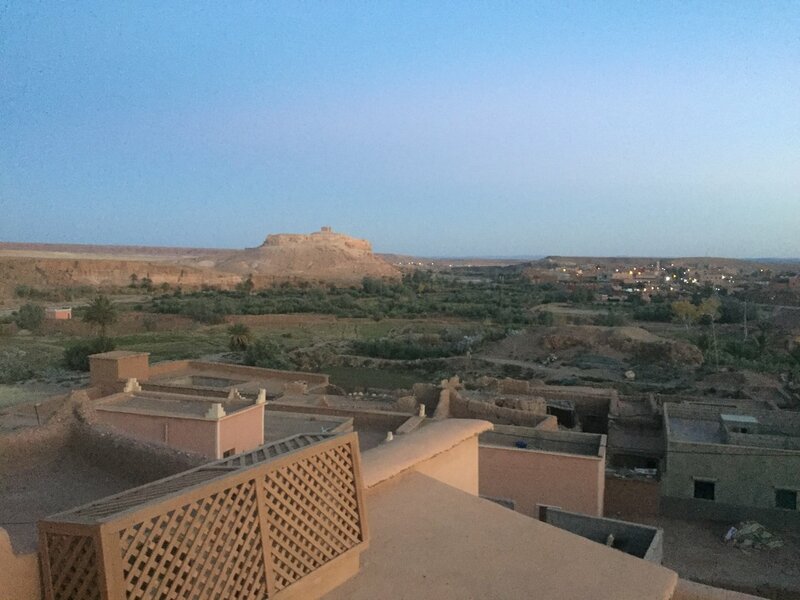 We arrived in Merouza around 5:15 to begin our camel ride for our overnight stay in the Sahara. 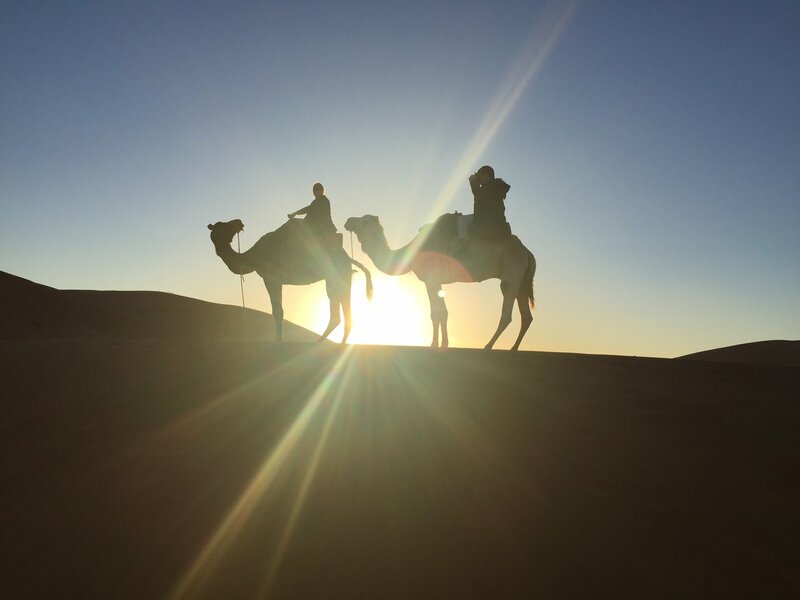 The ride was about two hours and our guide into the desert was personable and he took great photos for all of us. We stopped before reaching camp so we could enjoy the sunset. 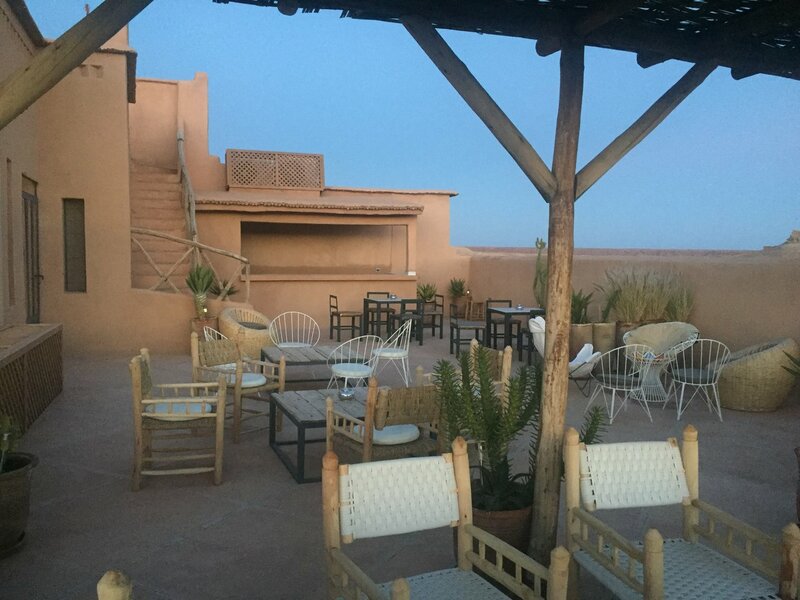 We arrived at Luxury Camp Chebbi, and everything was set up for us. After a nice sit around a fire, we were ready for dinner. 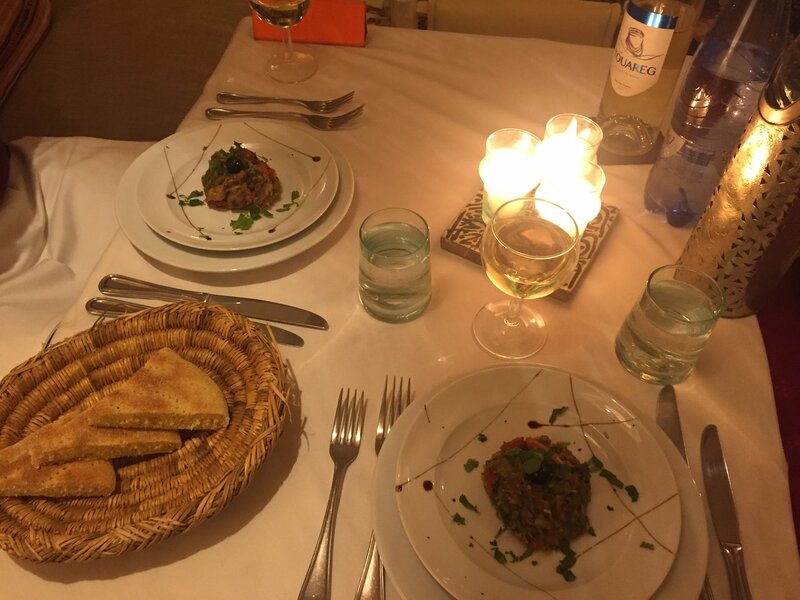 The dinner was amazing, and our favorite was a tomato, eggplant and goat cheese dish cooked in a tagine. 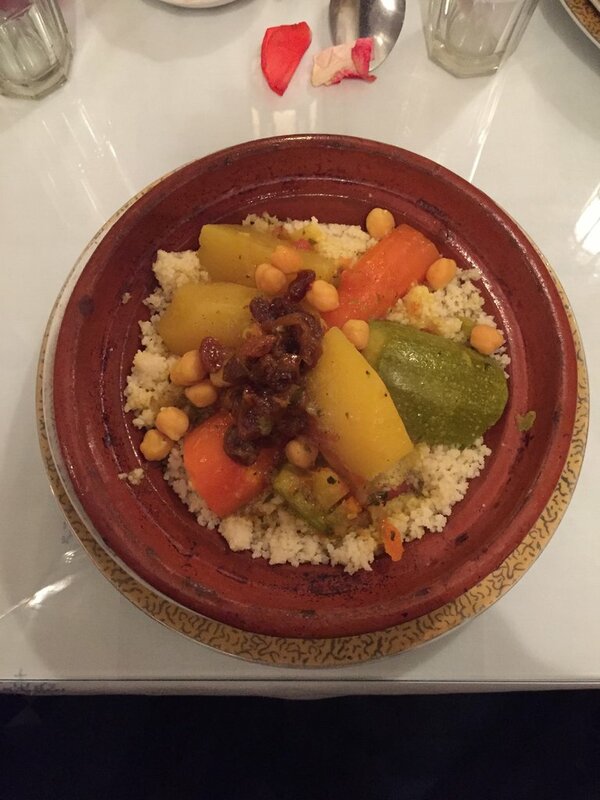 We decided we wanted to take the chef, Omar, back to the USA so we could have his delicious food again. 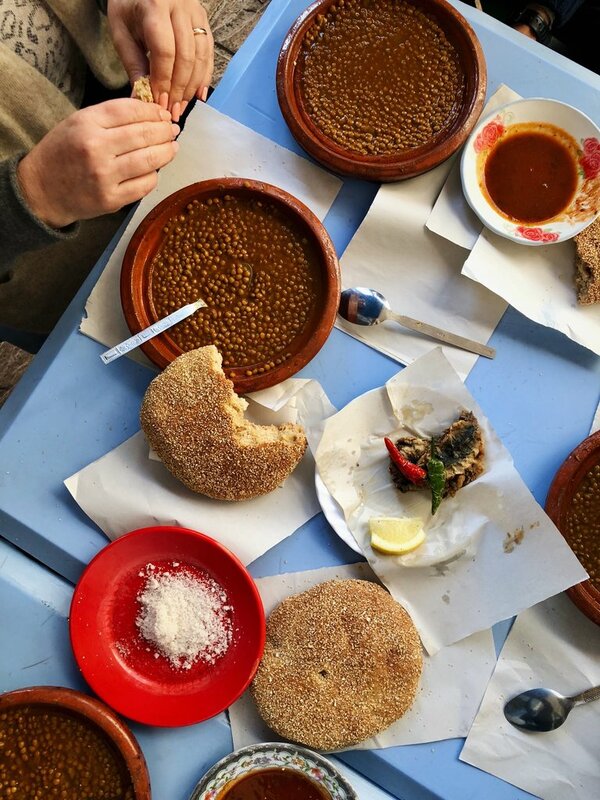 The next morning we went back to Merouza via 4 wheel drive since we had a long drive to Fes. 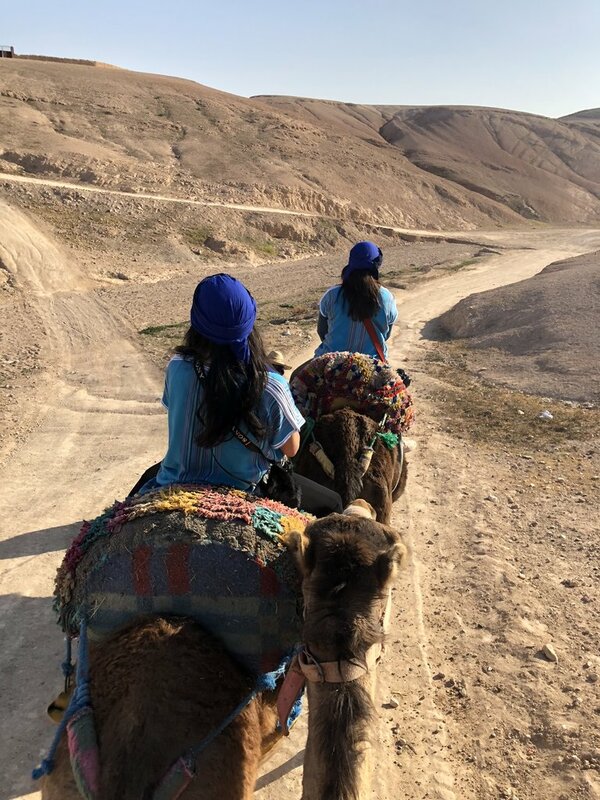 We wanted to ride the camels back but the two hours would have made that difficult to arrive at a decent time. 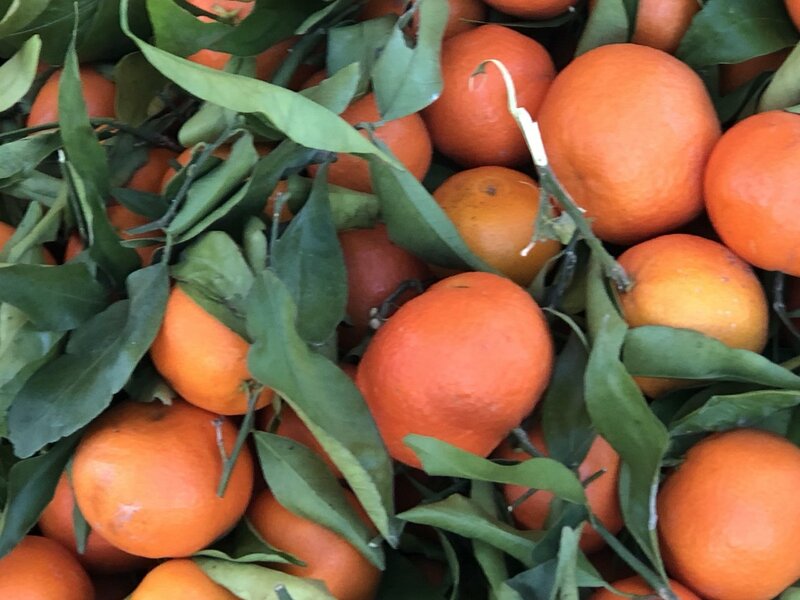 Along our journey, we stopped at a local weekly market that had all kinds of produce, fruit, etc. We never knew there were so many different type of dates. 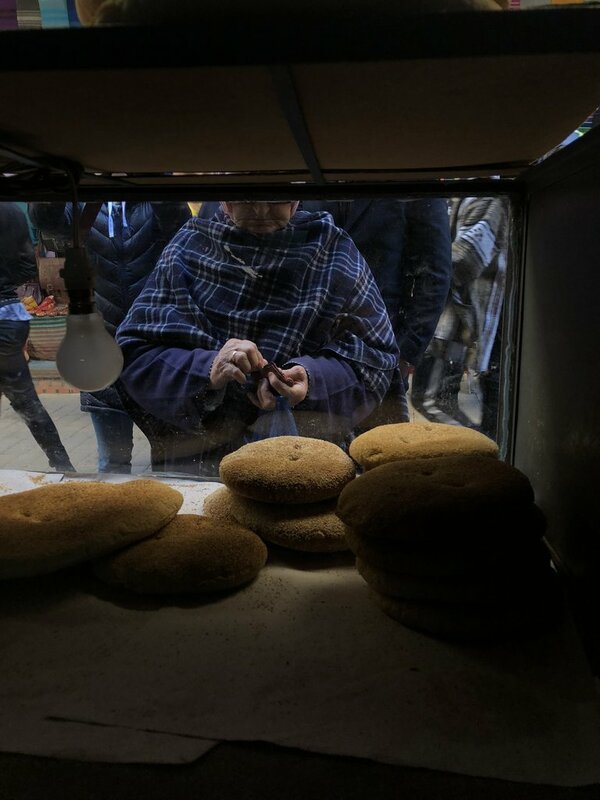 It was very interesting to see how the locals come to these weekly markets to get their goods. 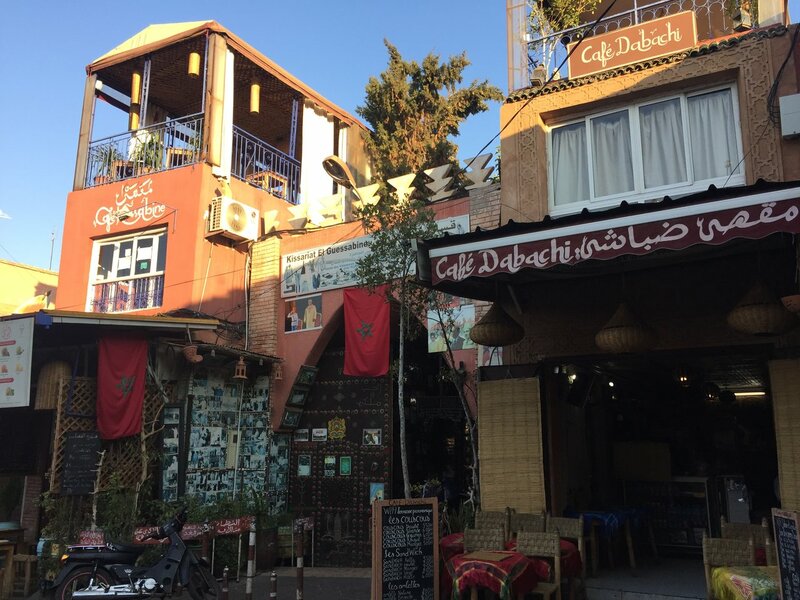 We later stopped in Ifrane which is a completely different, but was a nice stop for a coffee and a stroll around town. 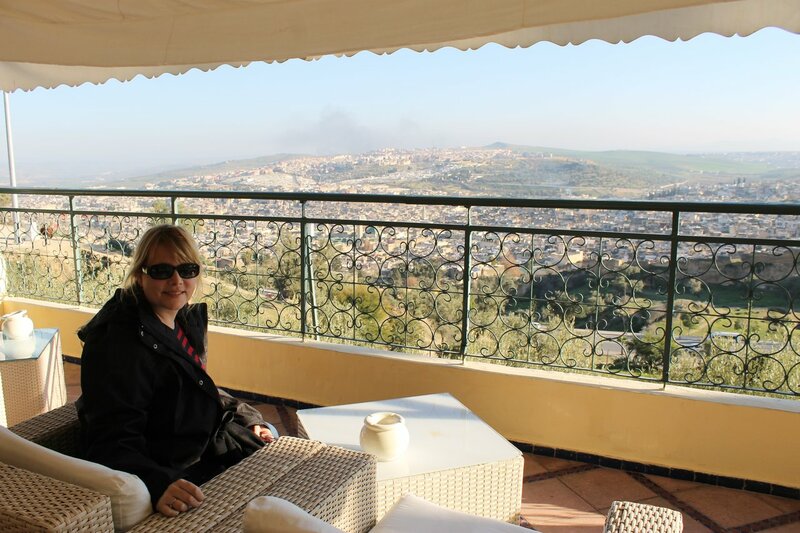 Later in the day we arrived in Fes and went to Dar Roumana to check in. This Dar is absolutely beautiful. 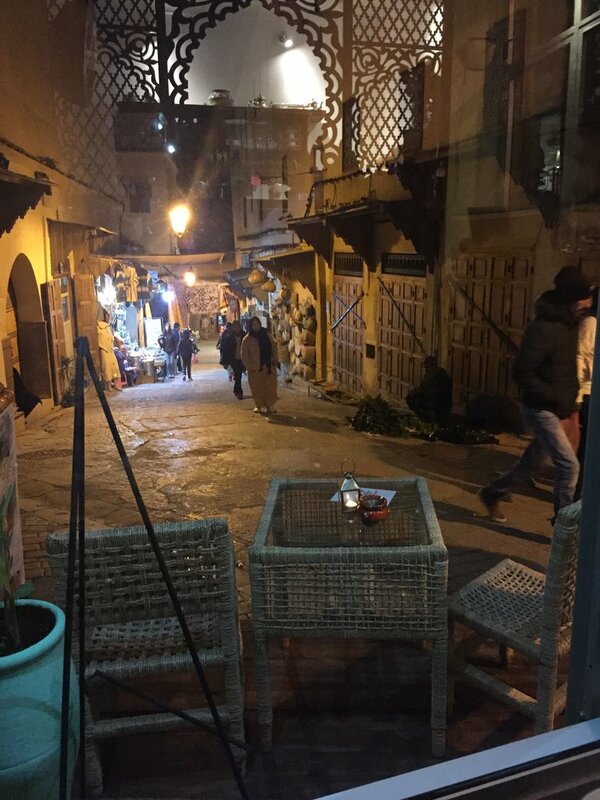 Later that evening we were taken to a local restaurant, Dar Hatim. 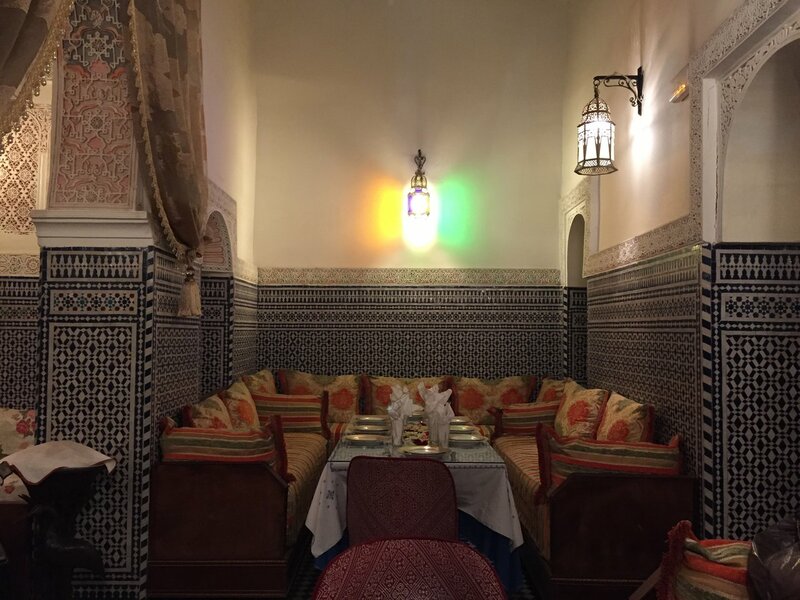 This restaurant served us perhaps the best Moroccan salad and a lamb tagine that was so tender and tasty. 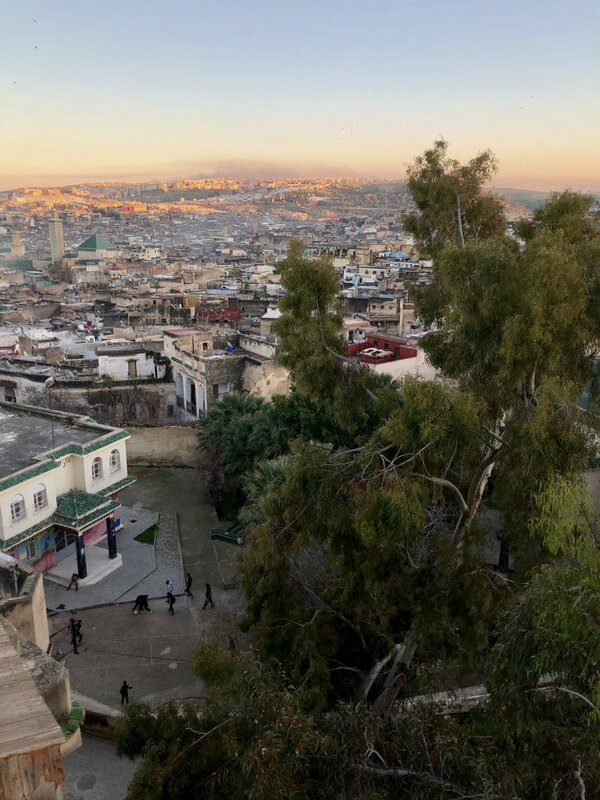 The next morning we met our guide, Hakim, to begin our tour of Fes. 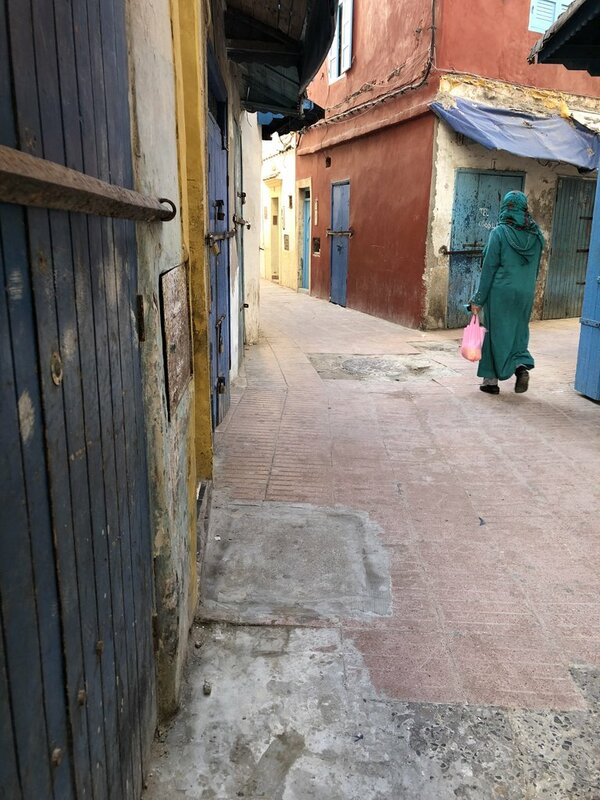 We first took a drive to see the Medina from above and then went back so we could start walking thru town. 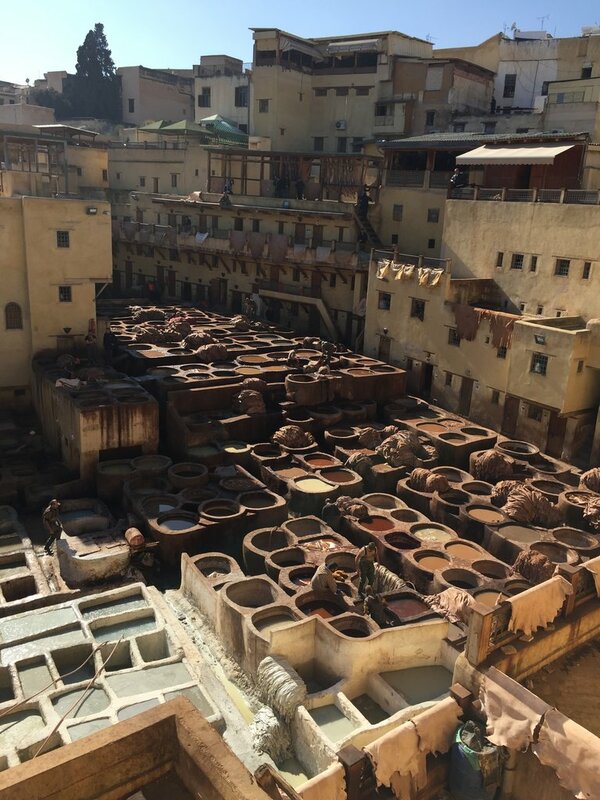 We went thru the blue gate and wandered thru the souks and stopped at the tannery (use the mint leaves), then later stopped at a weavers store. 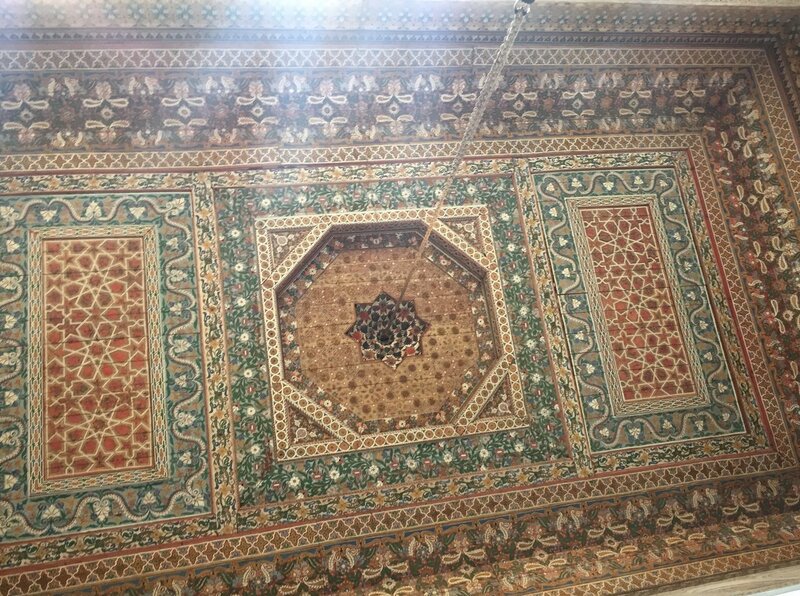 The craftsmanship was amazing to see. 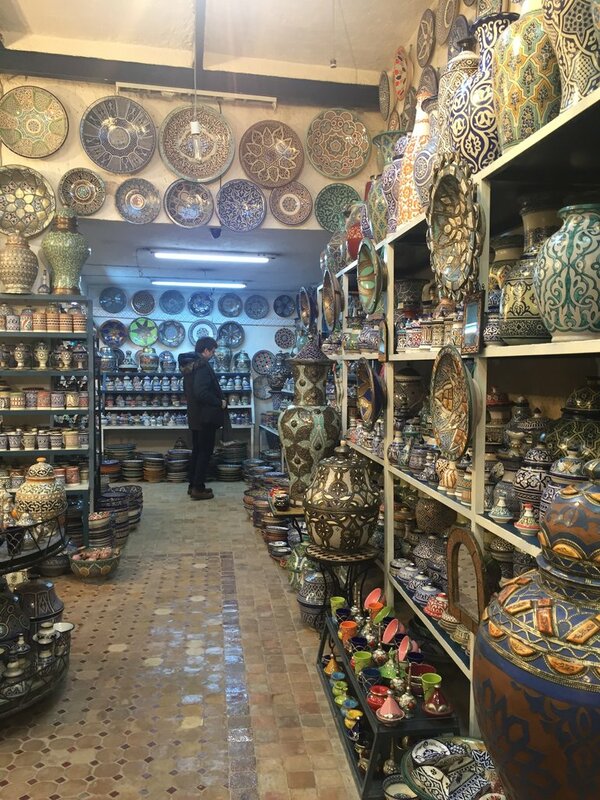 We later went to a tile shop/school where they make the most beautiful pottery, mosaics, vases, etc. 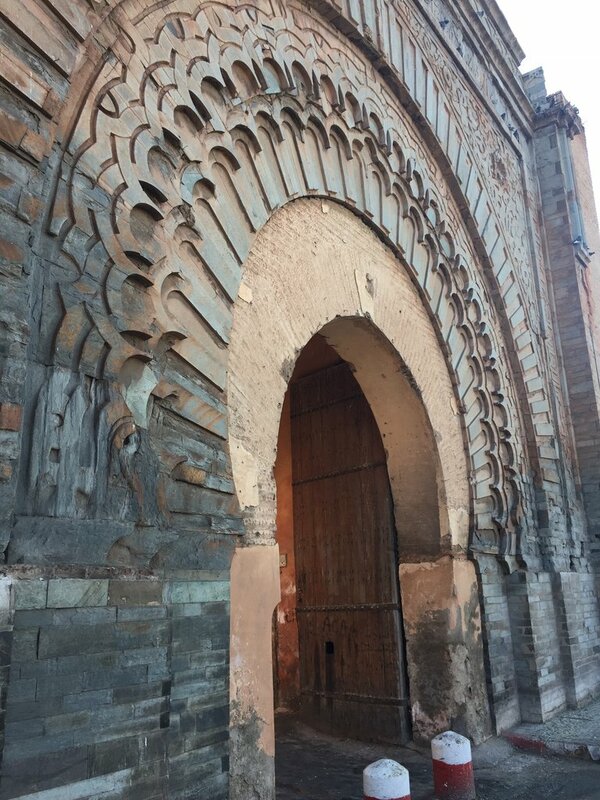 This place was also a school that trained locals to become artisans. Our guide then took us back to Dar Roumana around 6 pm. The staff arranged for a guide to get us the Clock Cafe where they had some local music and a nice dinner on the top terrace. 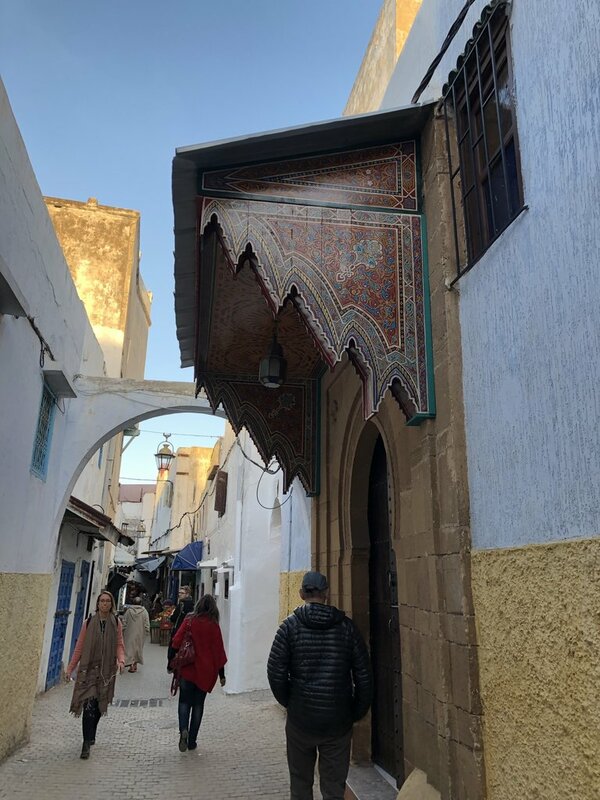 The alleys and streets with the Medina of Fes are overwhelming and easy to lose your way so we appreciated the assistance, otherwise we might still be wondering around Fes. 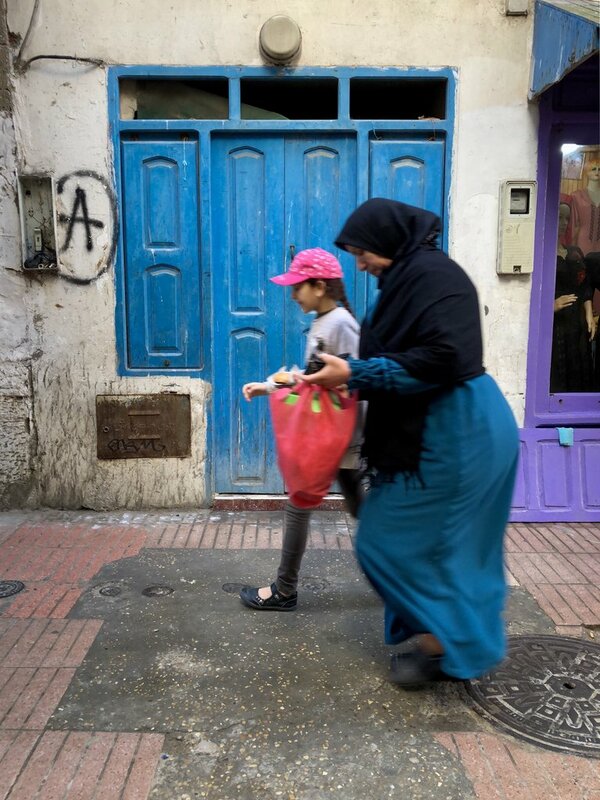 The next morning we departed to head to Chefchaouen. 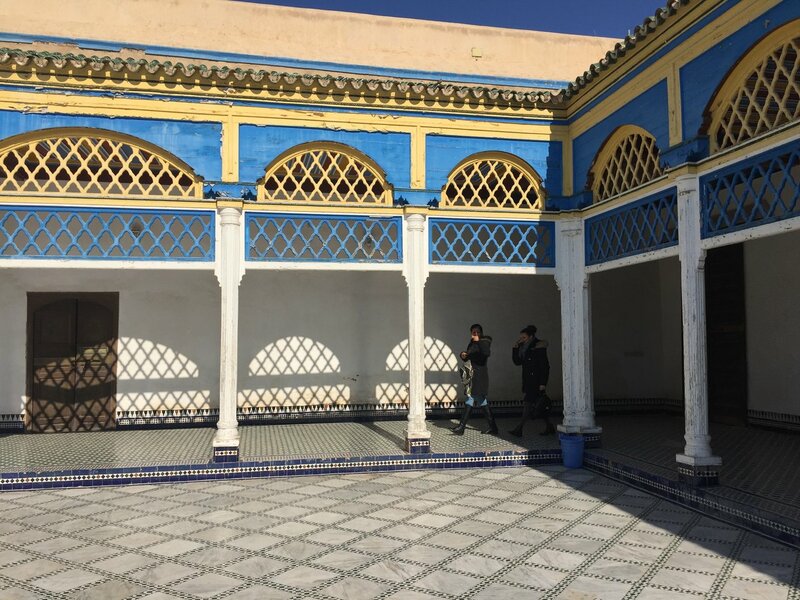 Our first stop was at Meknes to take a look at the ancient stables where they had 12,000 horses. 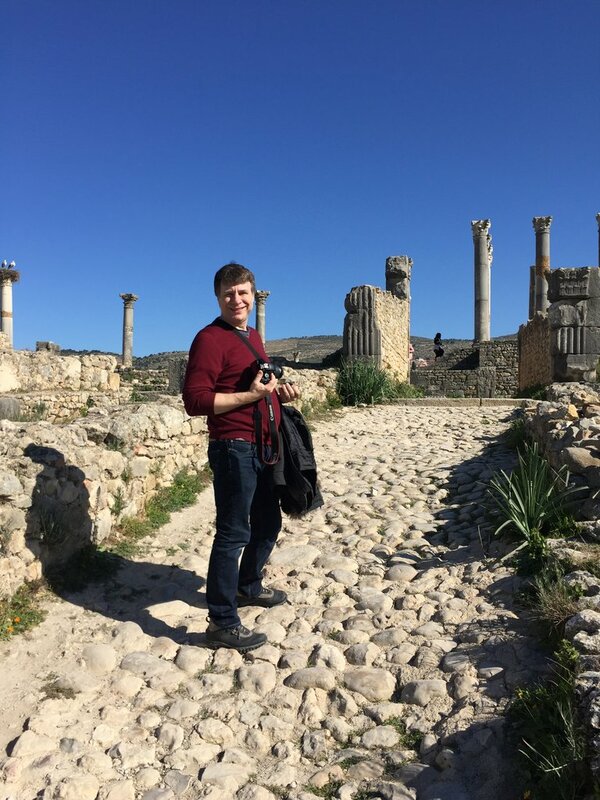 We then motored along to the the Roman ruins, Volubilis and walked around the area for a while looking at the layout. The area was very scenic and had great views. 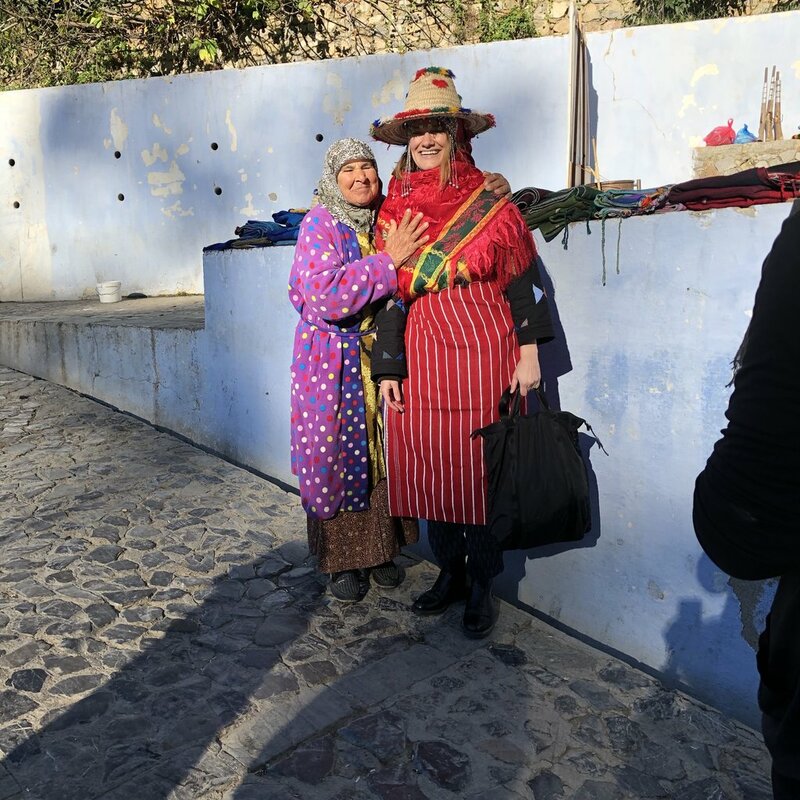 Our next stop was Moulay Idriss. 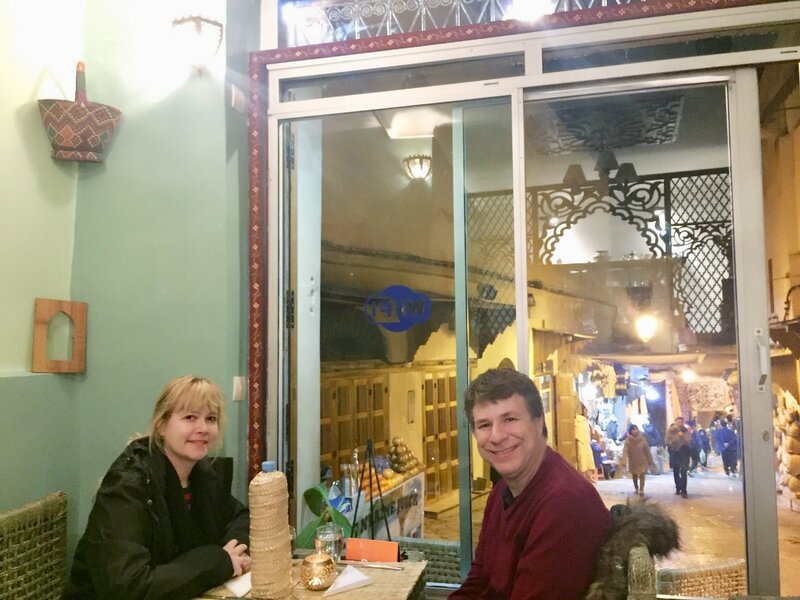 We checked into a very charming place called Dar Mez which was very quaint and colorful and had absolute great views of the city. 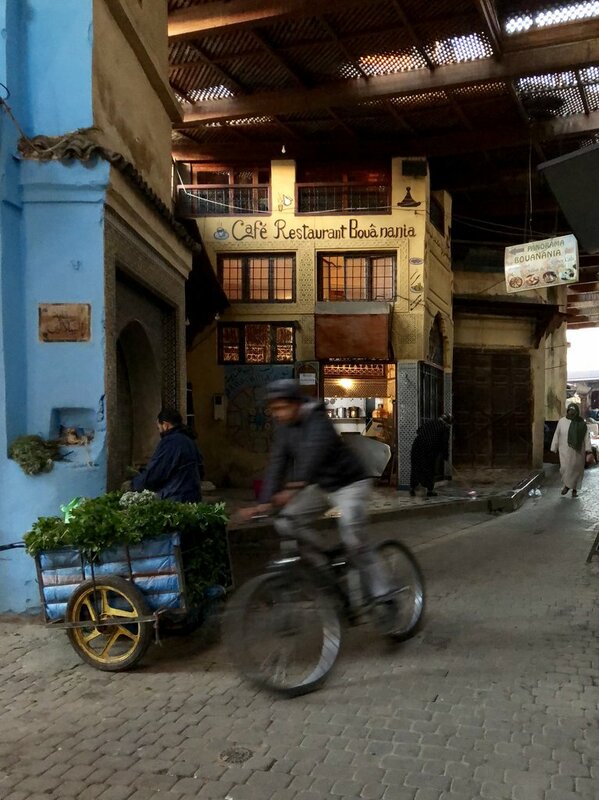 We then wondered around the beautiful Medina of Chefchaouen till around 10 pm. We the tried to make our way back to the Dar but were hopelessly lost. Our young local man kindly guided us back to the Dar. A tip to him was money well spent! 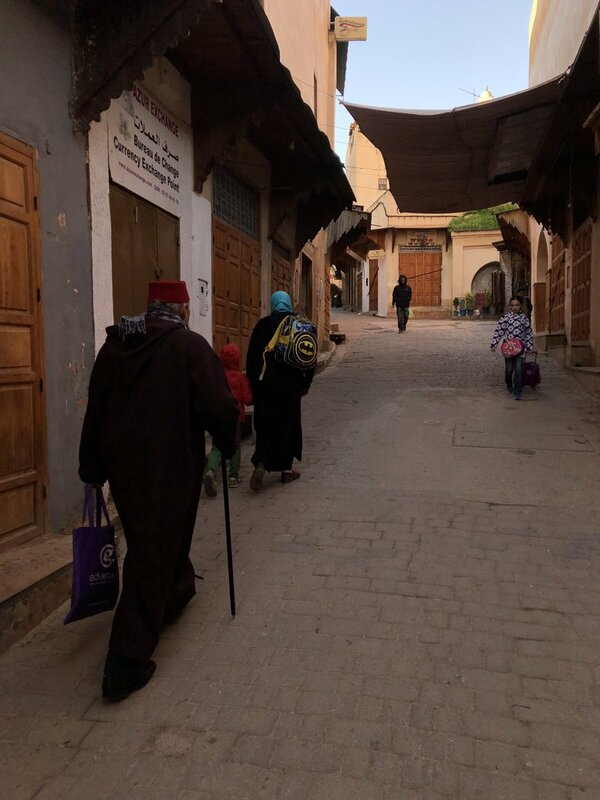 The next day we wondered back thru the Medina and souks. 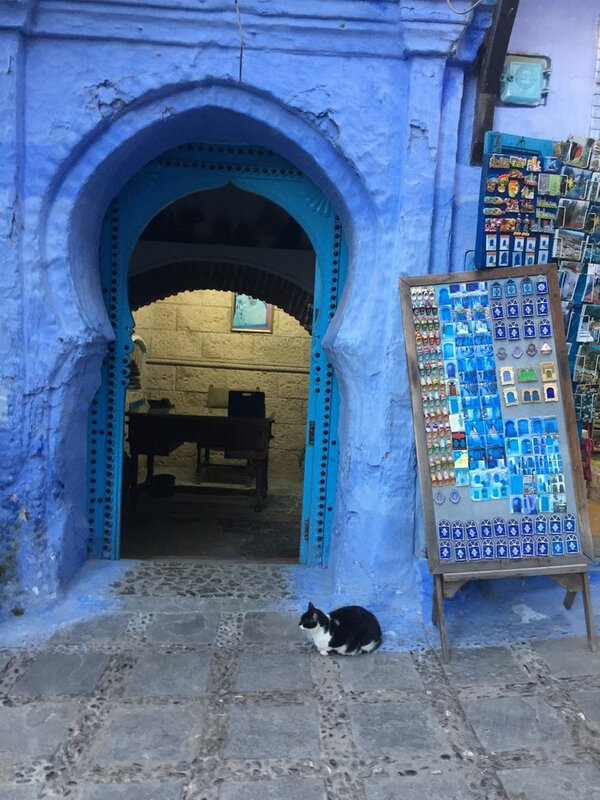 The shop keepers in Chefchaouen are much more laid back then Fes and Marrakesh so that made browsing a bit easier. 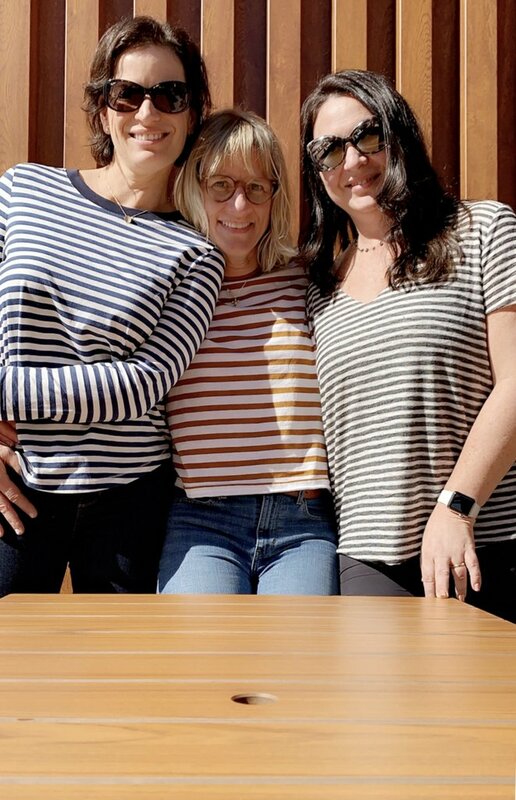 We had a nice lunch in town before heading back on the road again. 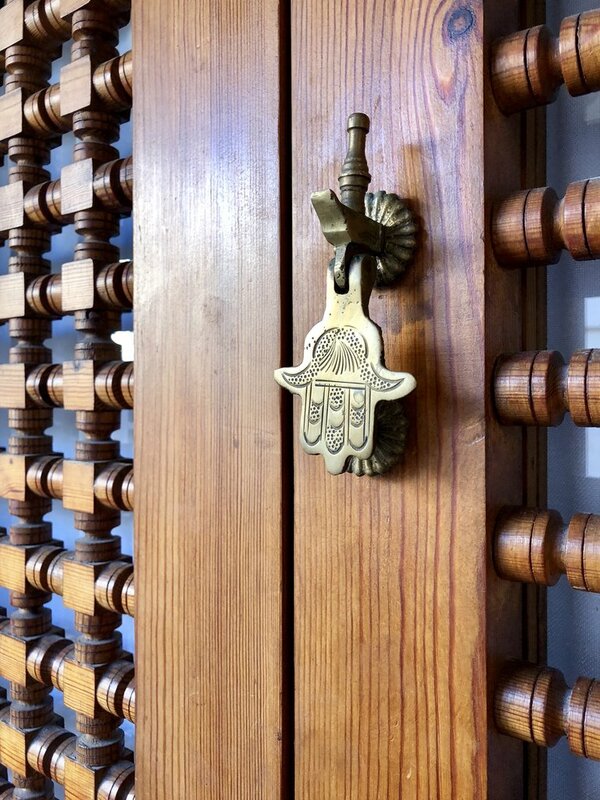 We headed to Rabat and once we arrived we checked into Riad Ziena. 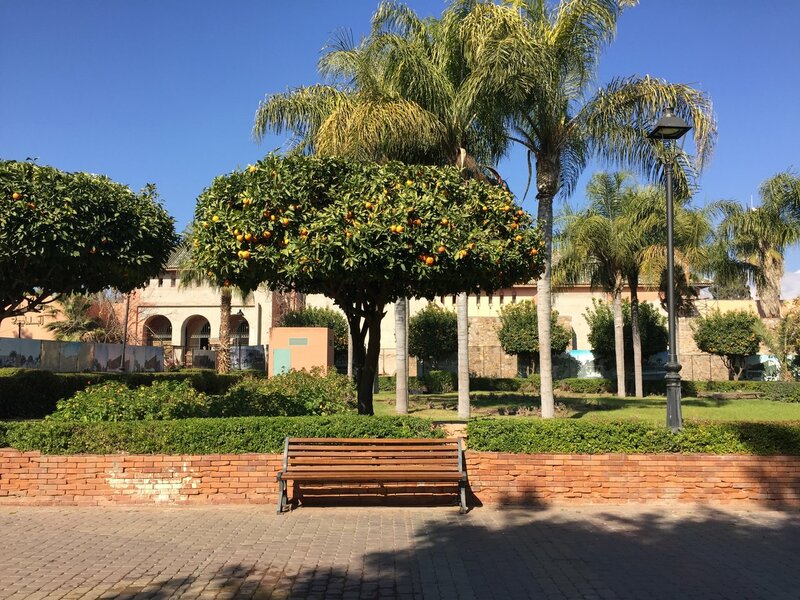 We walked the area again and then headed out to eat at Dar Nani Medina. 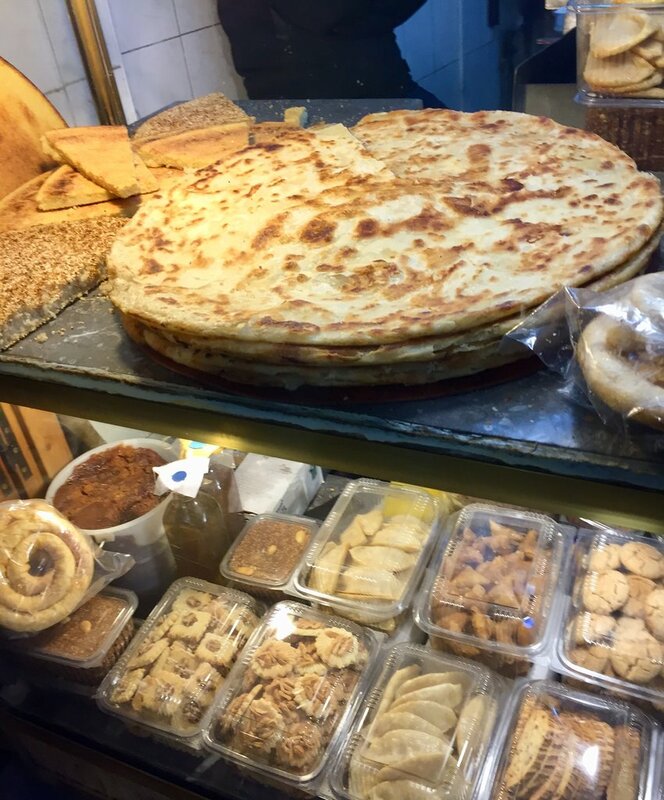 We then continued walking the markets and stopped at an outdoor pastry shop for a couple of sweet desserts to celebrate my birthday. 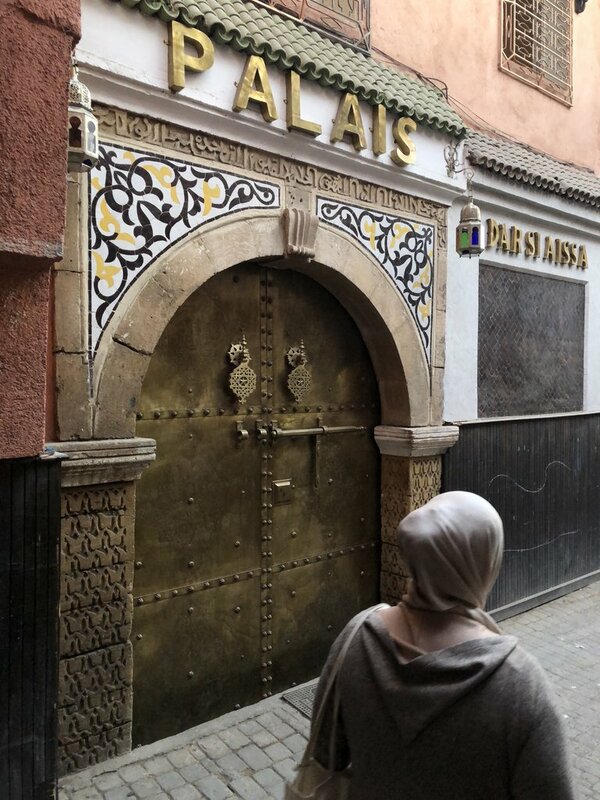 This time we actually found our way back to the Riad without assistance. A major victory for us. 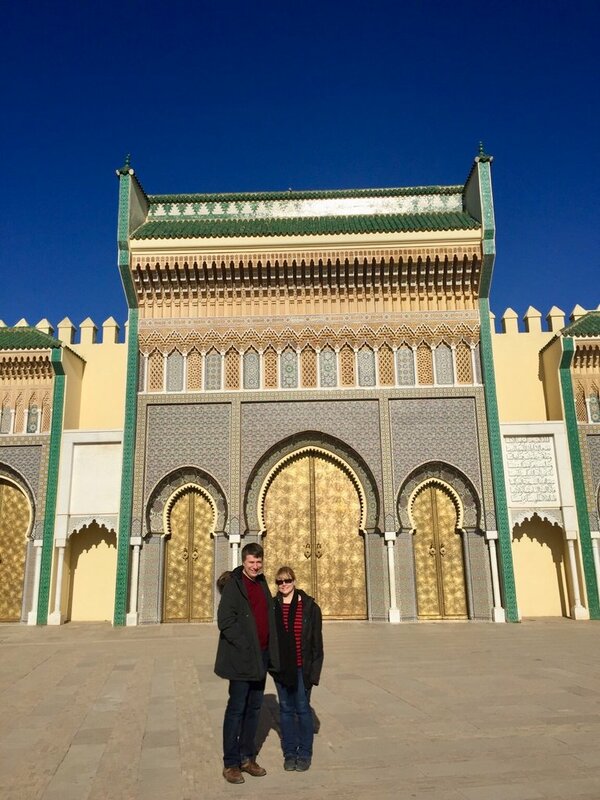 The next day we headed to Casablanca to visit the Hassan II. 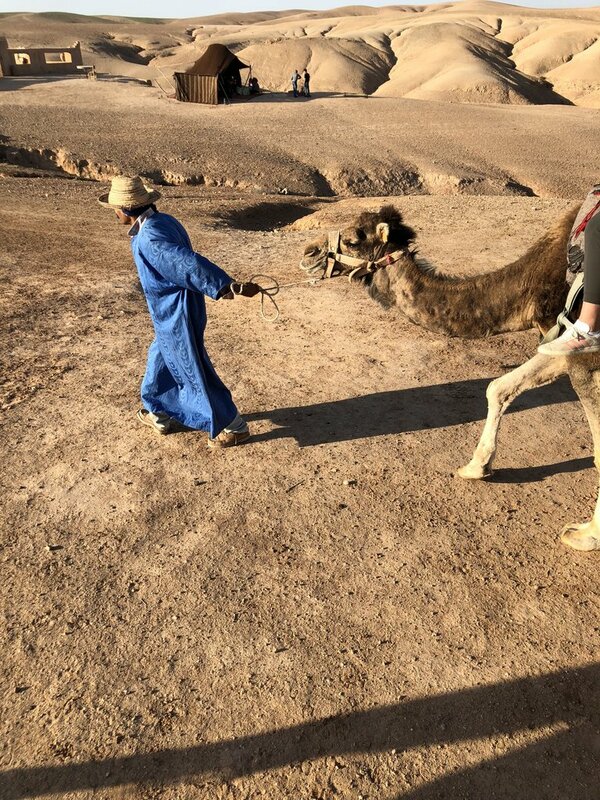 The traffic in Casablanca was the worst we experience but as usual Ismael handled it effortlessly. 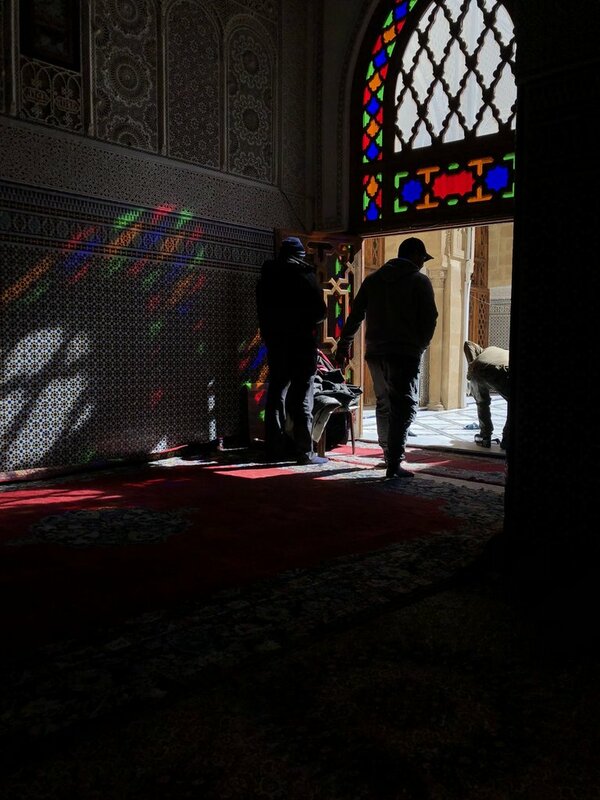 The mosque is absolutely beautiful and spectacularly large. 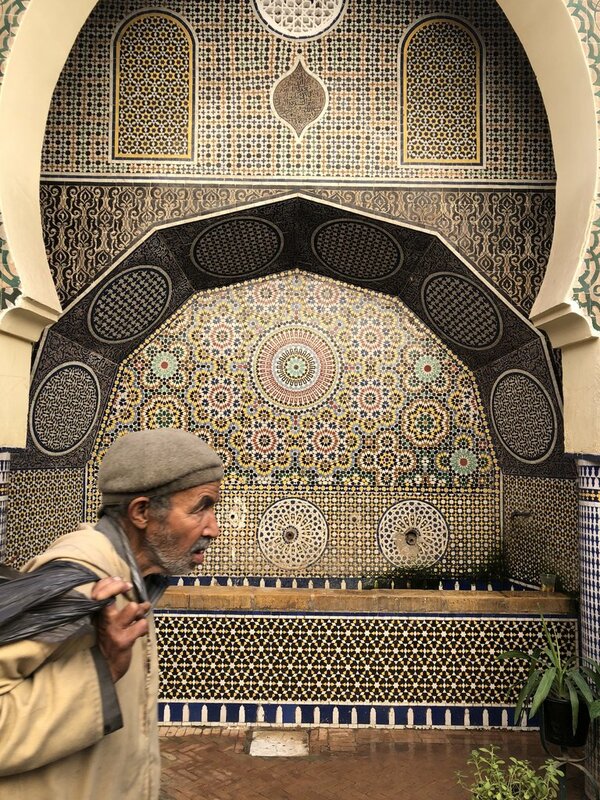 The mosaic work around the mosque was worth of many pictures. 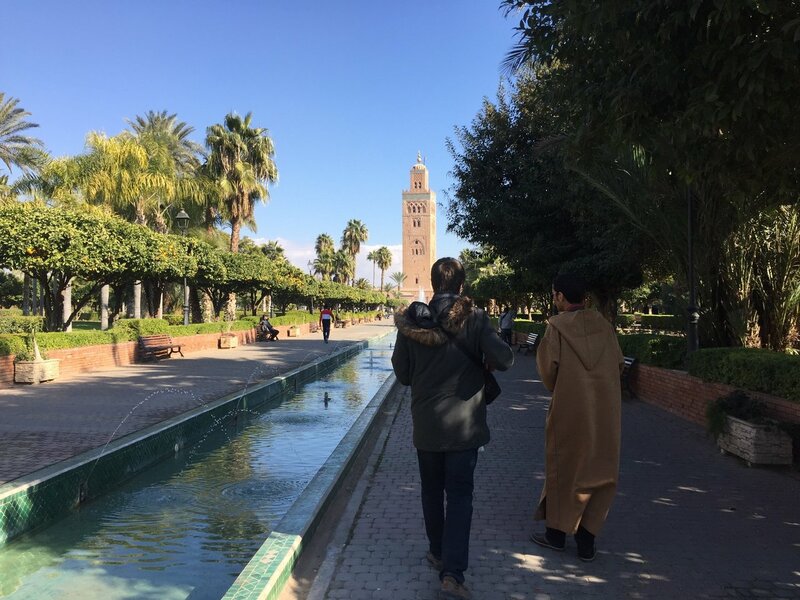 We then headed back to our final destination, Marrakesh for another night. 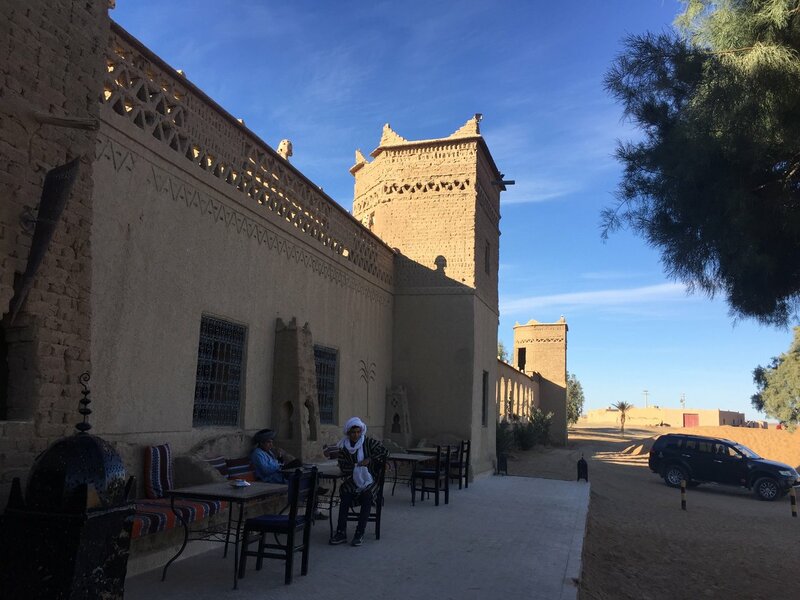 We stopped for a nice lunch along the highway before reaching the final accommodation, Palais Khum. 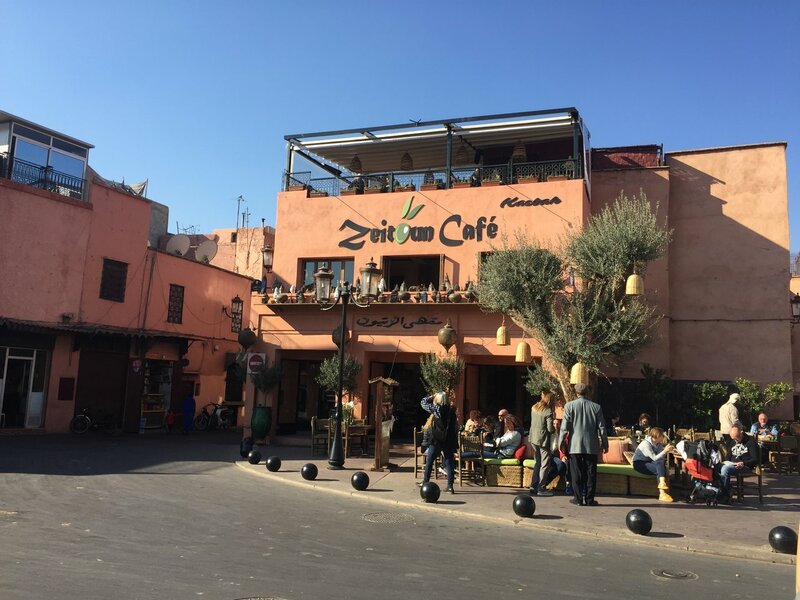 We immediately, left to visit the square on more time, get lost in the Souks and enjoy one more meal overlooking the square. 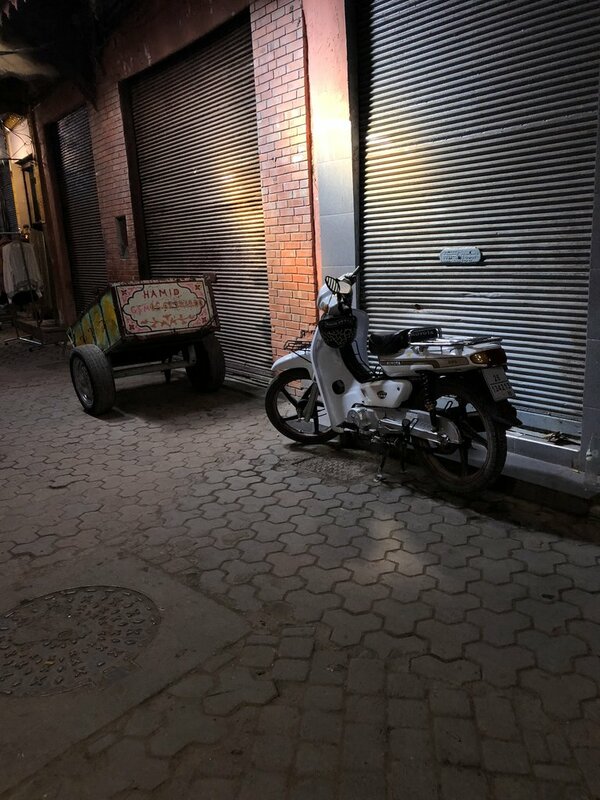 We lingered long into the night and reluctantly headed back knowing we would be leaving the next morning. 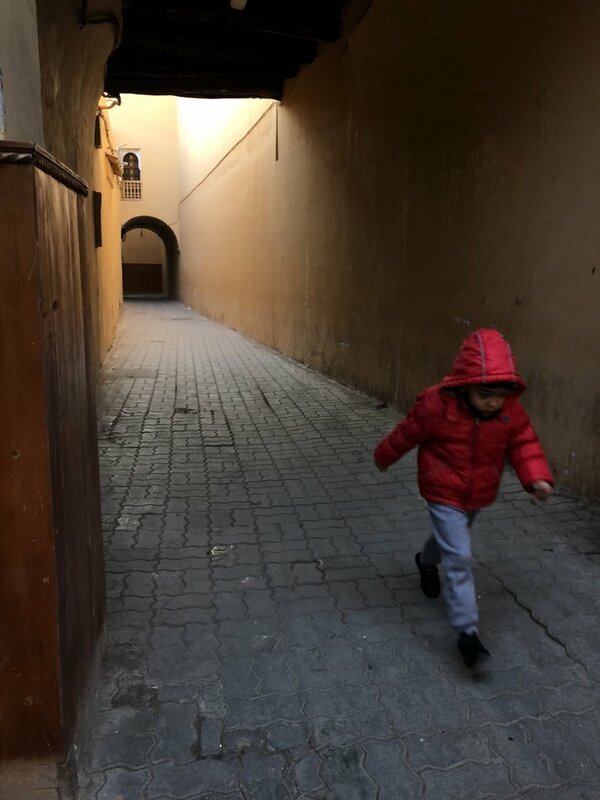 The next morning before Ismael picked us up we wondered the local alleys and shops. Ismael met us at 11:30 am for our ride to the airport. We sadly said our goodbye is Ismael. 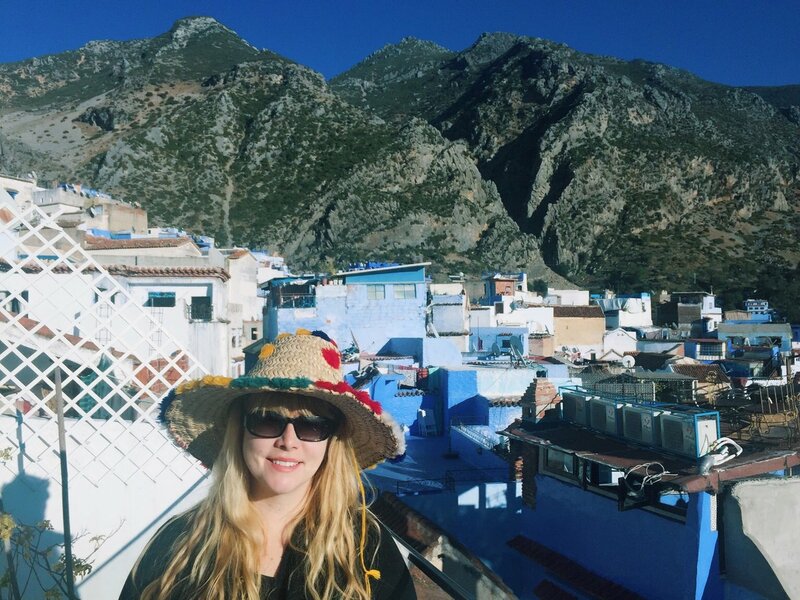 Thank you so much for your detailed account of your Moroccan adventure! 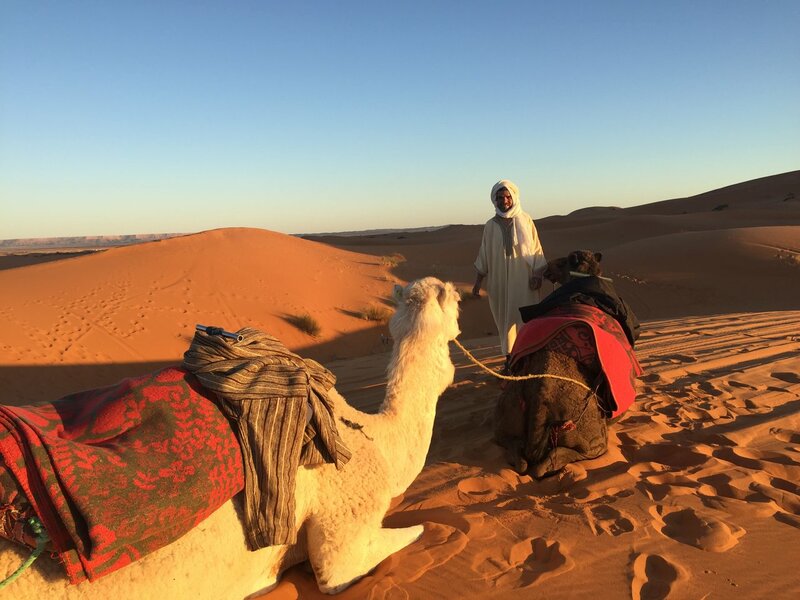 I am so happy to hear that your trip was a success and that your time in Morocco was unforgettable. I see that you enjoyed your accommodations. Thank you for giving me feedback about the staff at each of them so I can follow up with these businesses. 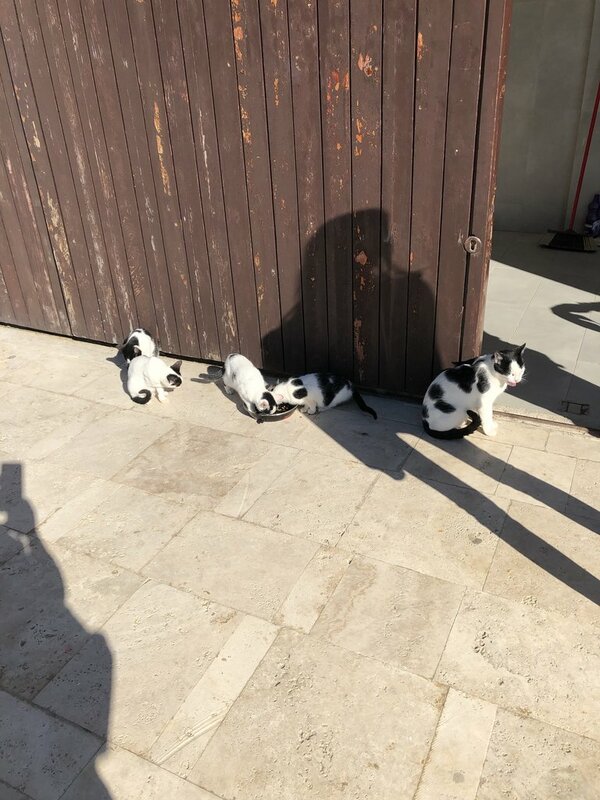 I know that they will appreciate your kind words. It is so nice to hear that you enjoyed you time with Ismael. We are very lucky to have him on our team and shining reviews like yours reinforce that fact! 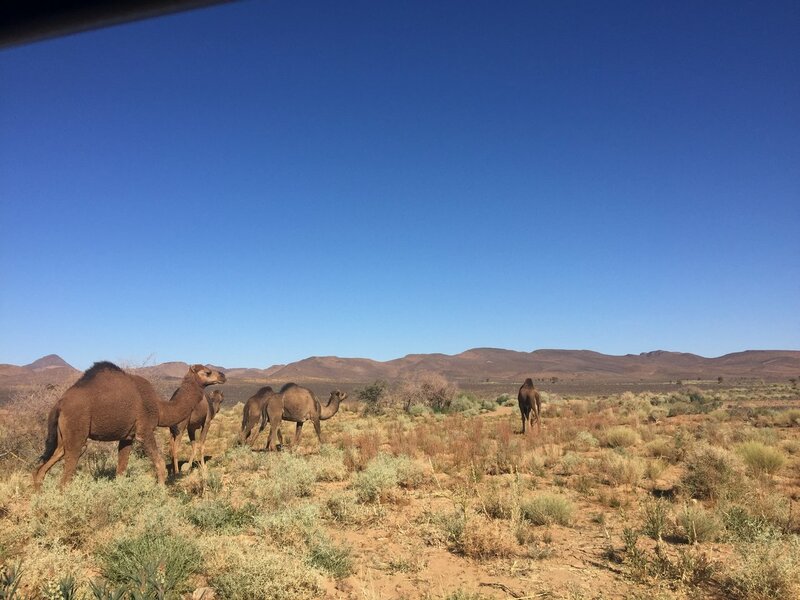 These reviews surely help us improve, and it is great to be able to go back to your guides, driver and accommodations to tell them your comments. 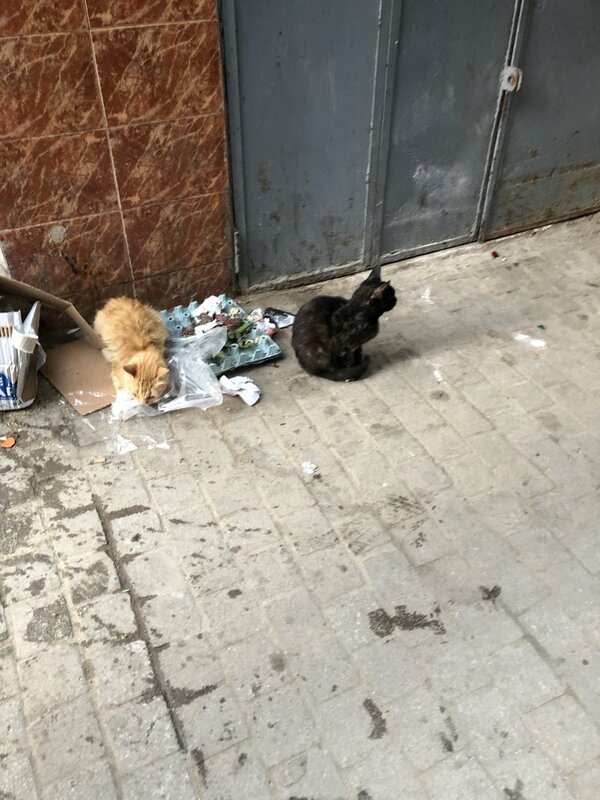 It is unfortunate that you were not able to sneak Omar back home with you, but I hope that you remember your meal with him for many years to come! Thank you again for traveling with us, and I hope that our paths cross again in the future. 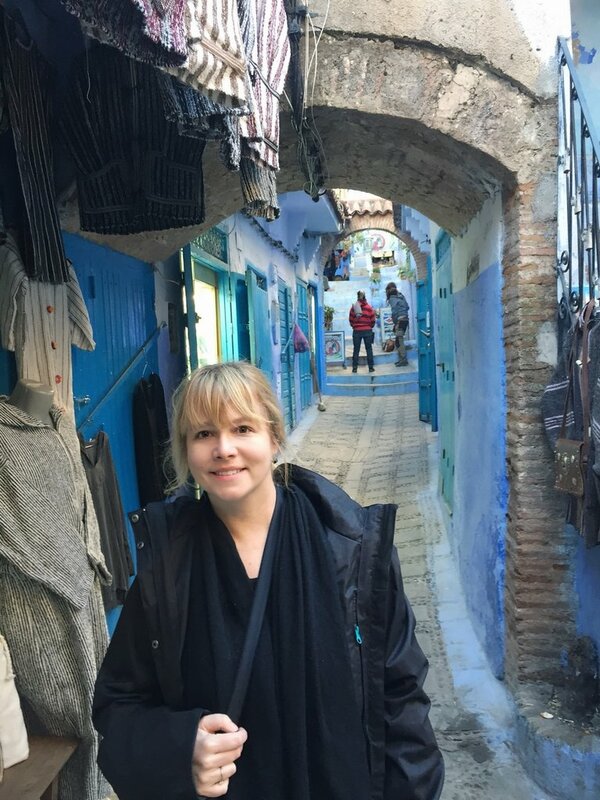 If you are ever looking to travel again to Morocco, please reach out to me! 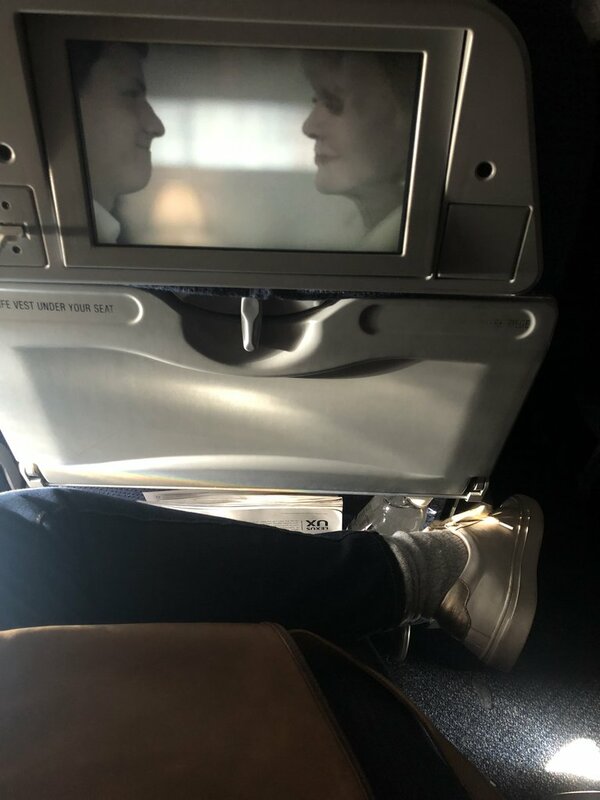 I would be more than pleased to plan your trip again. Take care. Trip was wonderful. The contacts were responsive and super-helpful. 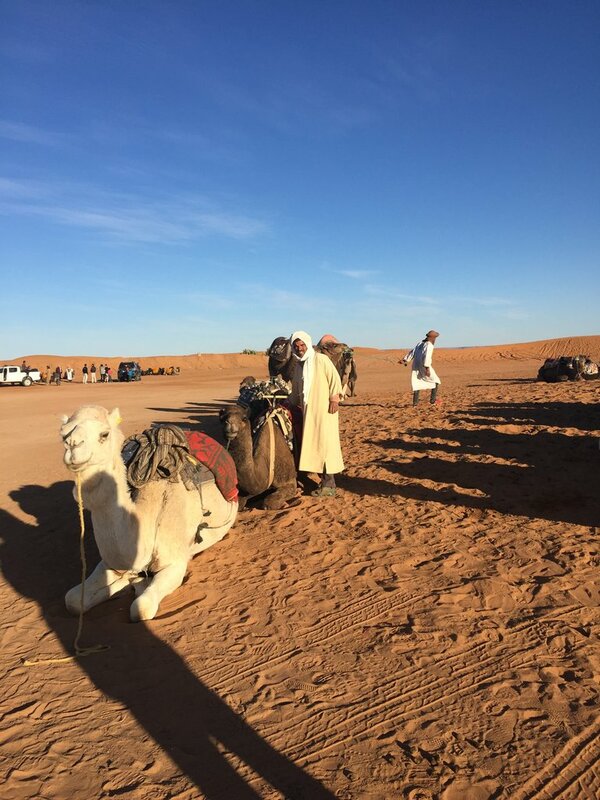 Our arrival time changed and it was easy to contact both Yassine and Ali and adjust accordingly. Thank you for your feedback! 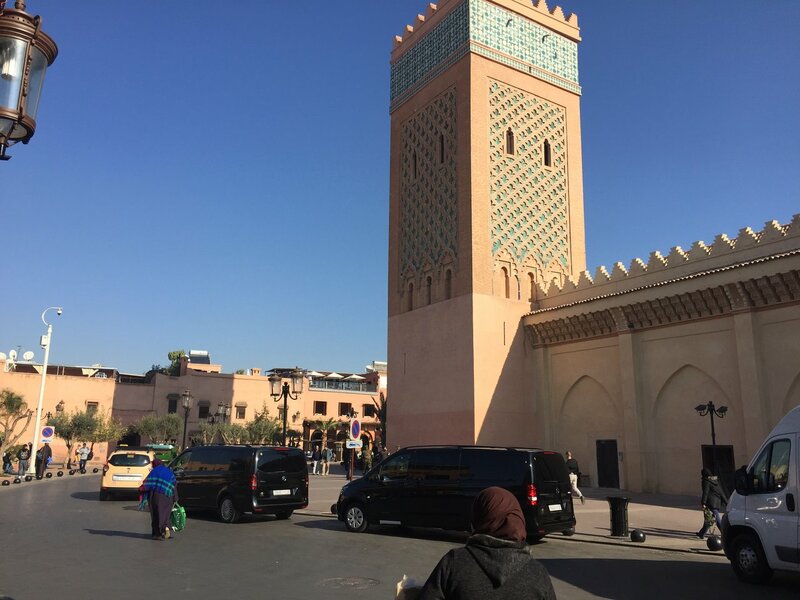 I’m glad that your trip went smoothly and that we were able to help you with the changes during your arrival to Morocco. We were very glad to have you travel with us, and so happy that it all worked out well. Take care! The trip was excellentl. 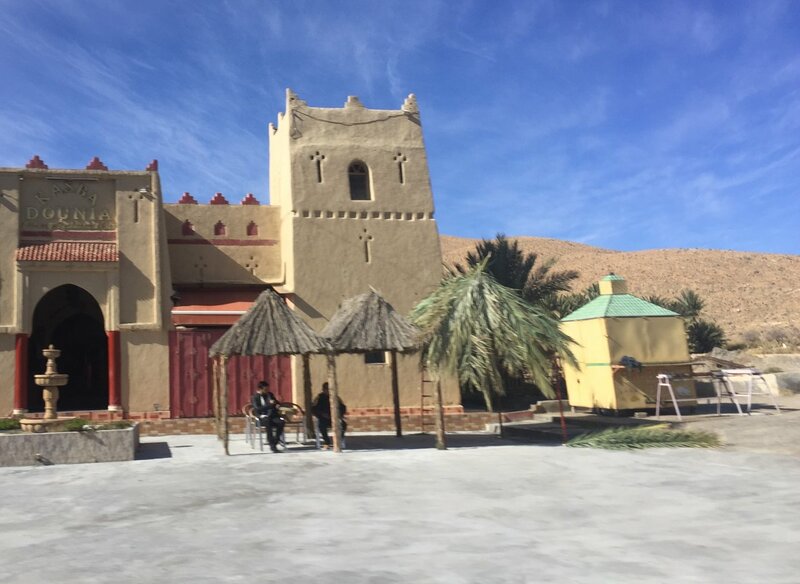 The Riads were First rate, The guides were knowledgeable, professional and friendly. Our driver, Mohamed Samouk, was one of the best parts of the trip. He became our friend, part of the family! 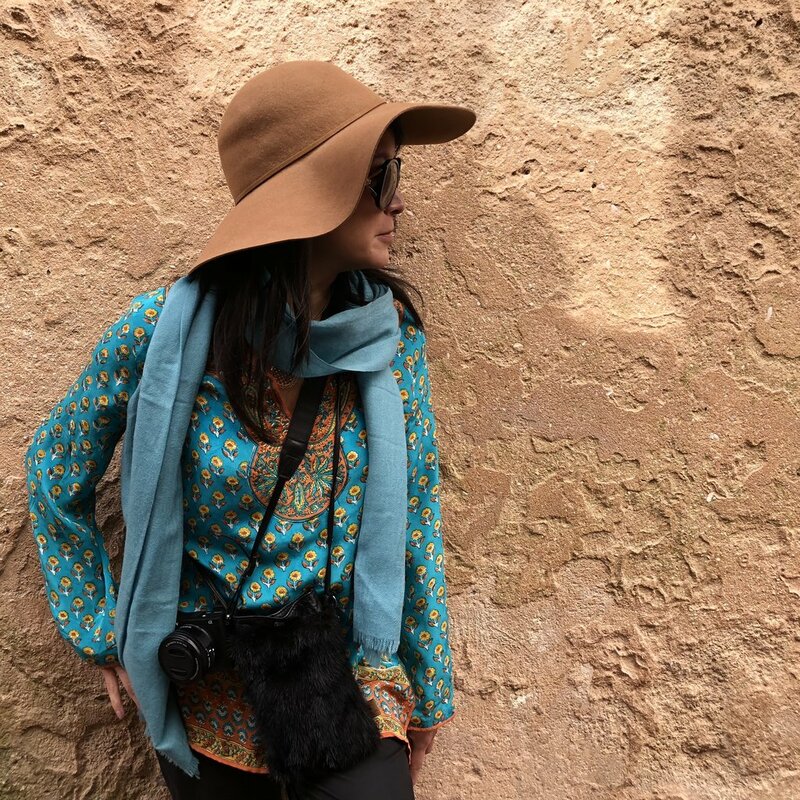 We will recommend KimKim and Off the Beaten Path to anyone wishing to explore Morocco. Thank you so much for the kind words! 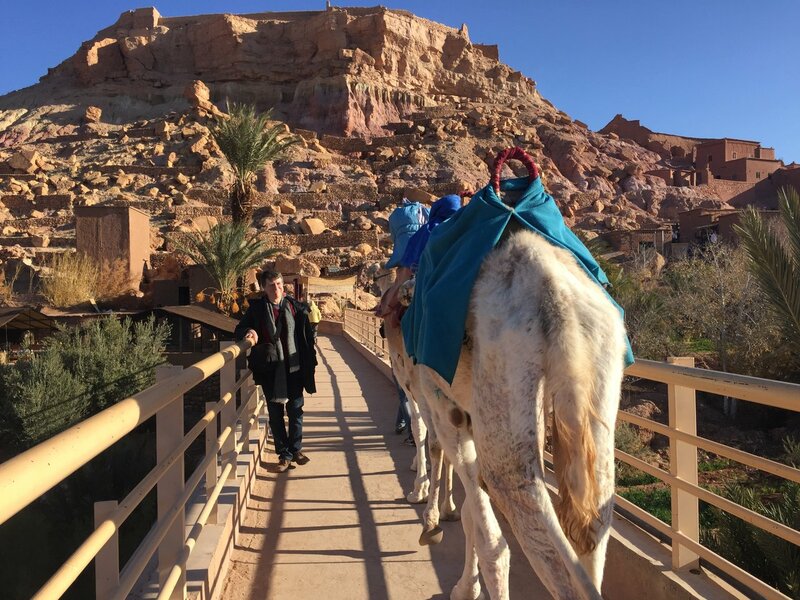 I am thrilled that you enjoyed your accommodations and that our guides were top notch. Mohamed told me about how close he became with you all and he is so happy to have met you. 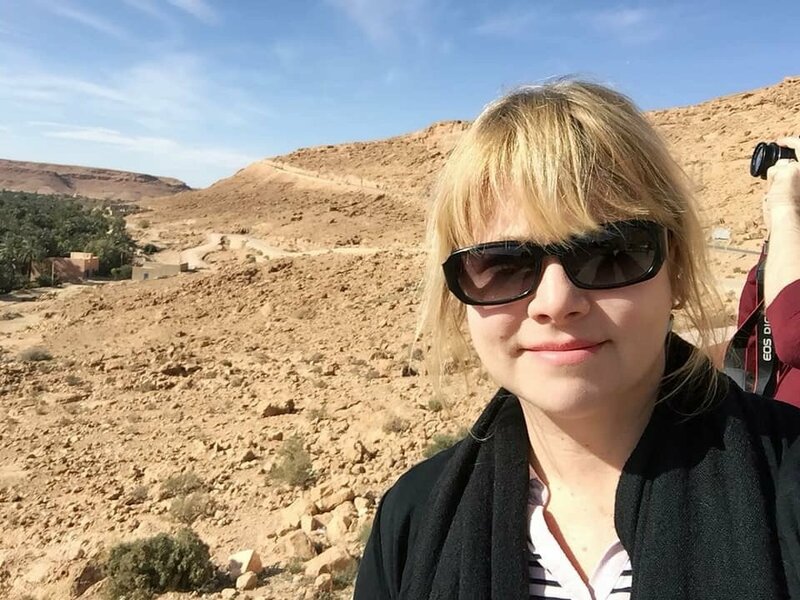 Please let me know if you ever want to visit the Kingdom of Morocco again, and thank you for the shining recommendation! This trip was like a dream, everything went just perfect and as planned. 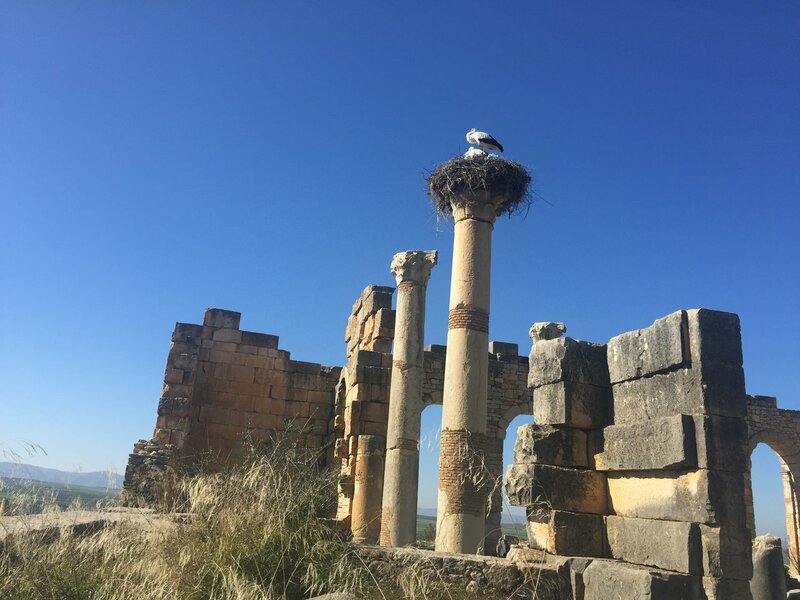 Yassine was incredibly patient and accommodating, he listened to us, responded to every question we had and made sure we would be happy with our finalized itinerary. 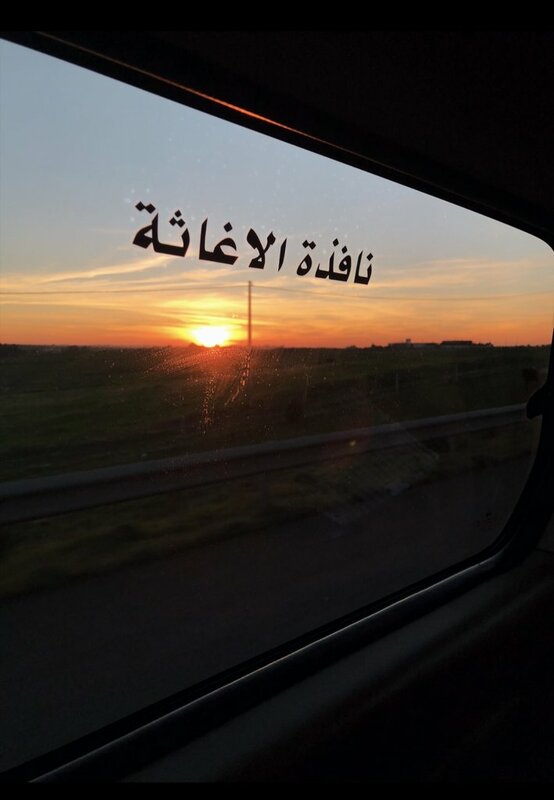 Our trip started in Casablanca, our flight was more than four hours delayed due to bad weather in Montreal, our driver Mohammed was patiently waiting for us and it was a relief to see him there and greeting us with a smile, we immediately felt welcomed and safe. 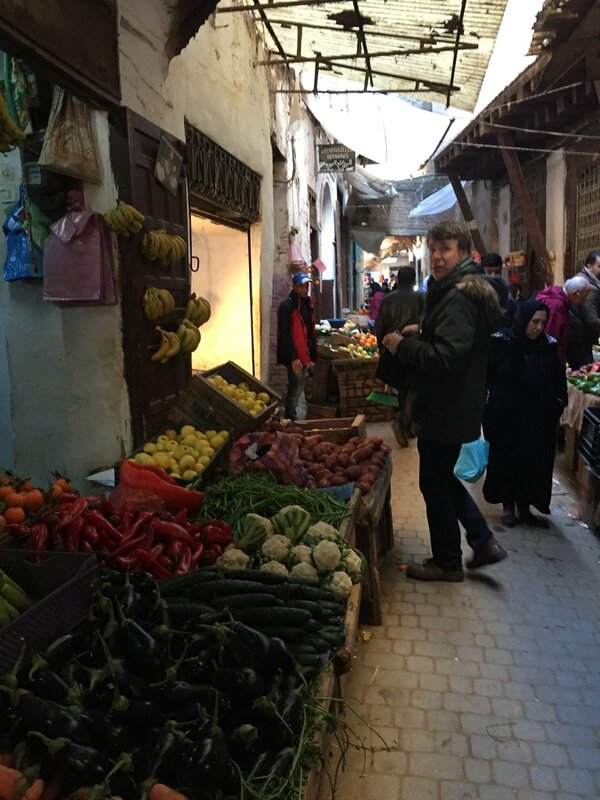 He drove us all the way to Fes with a quick stop at Rabat. 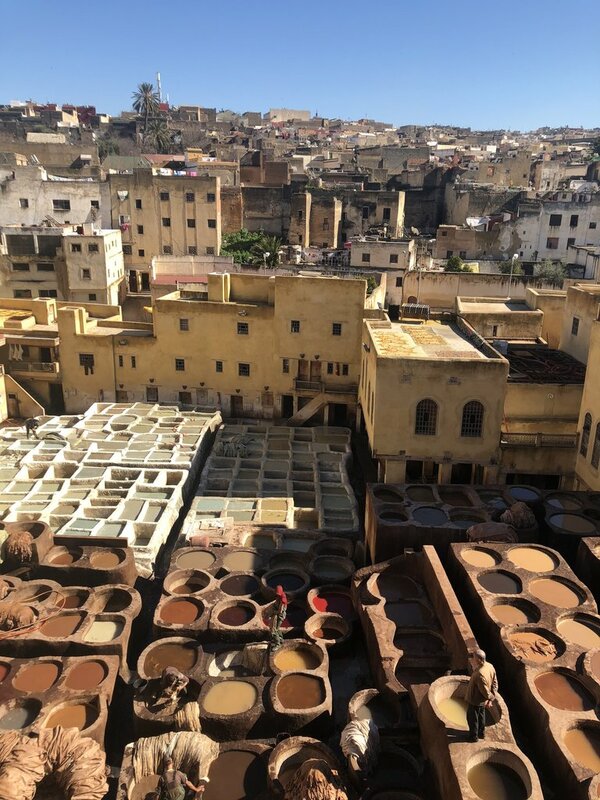 We spent two nights in Fes, our guide Hakim was super knowledgeable and funny, we had a great day of learning and exploring the medina. 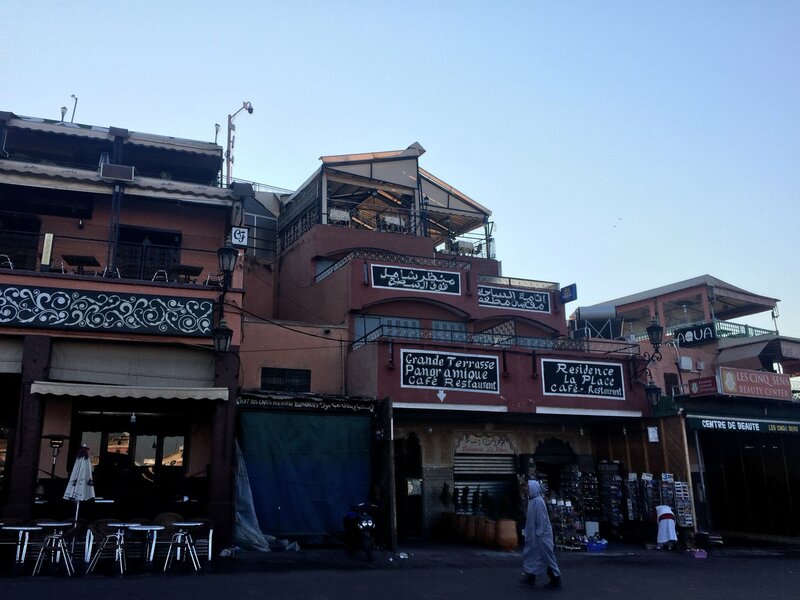 We then drove all the way to Marrakesh via Casablanca. 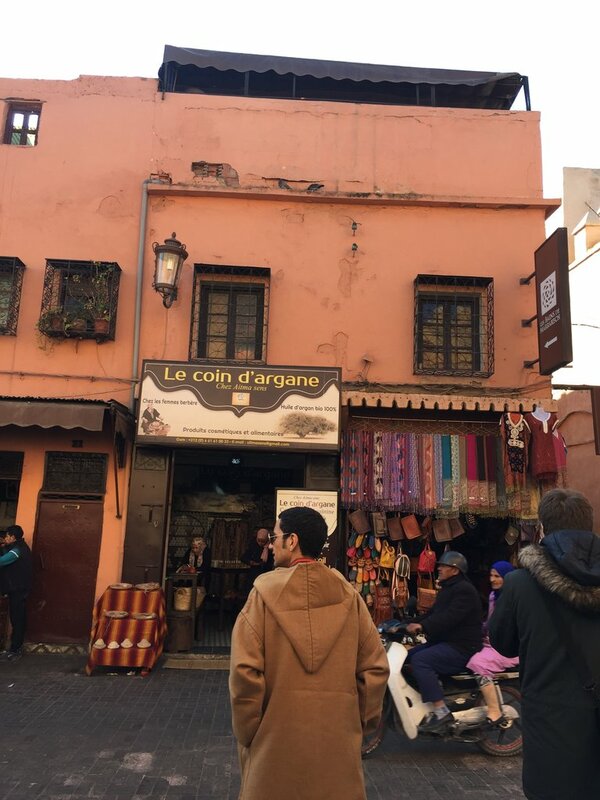 One tip for next time, I would avoid Casablanca all together, we just spent a few hours there but with traffic in the city it was more than needed and not worth it. 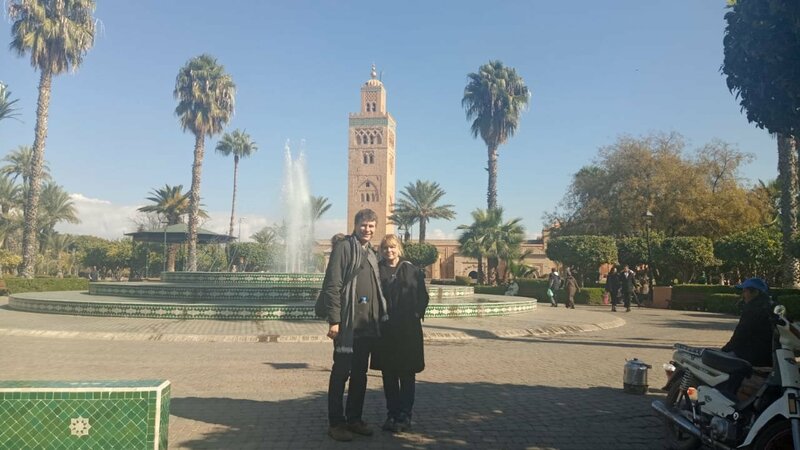 In Marrakesh we spent three nights but only two full days, we had an amazing time and our guide Ali was super fun to be with, he was also very accommodating with our last minute itinerary changes and just adapted to our pace. 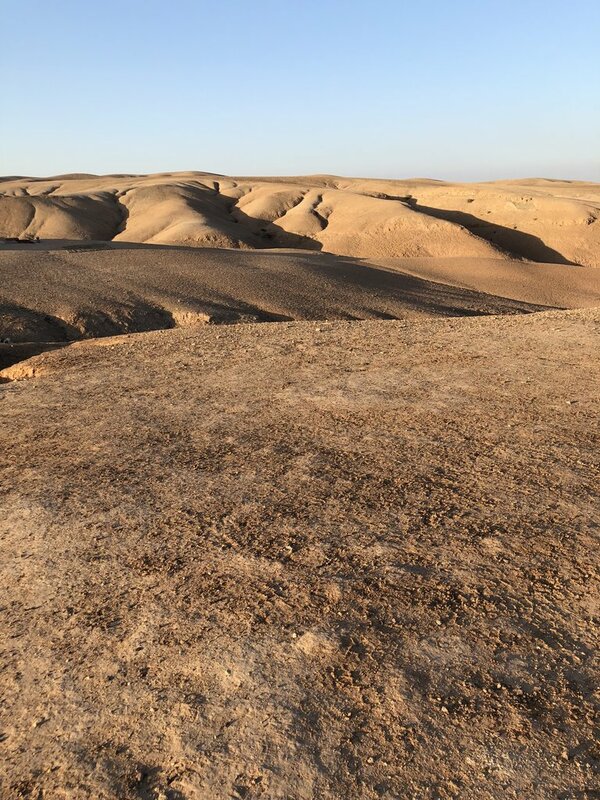 On our second day we went to Agafay desert in the afternoon, this was definitely a highlight of our trip, if you have the chance, don't miss it! 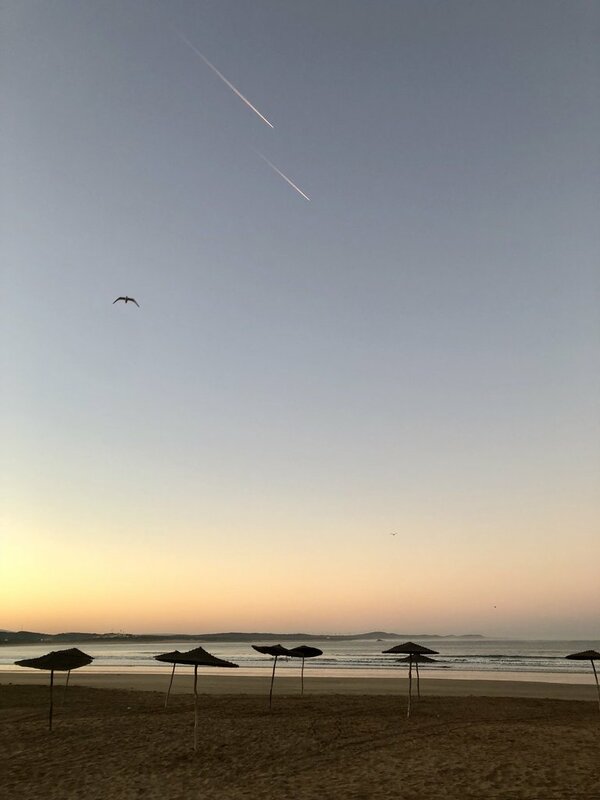 From Marrakesh we drove to Essaouira, we only spent one night there and I wish we had more time, it was one of my favorite places of all. 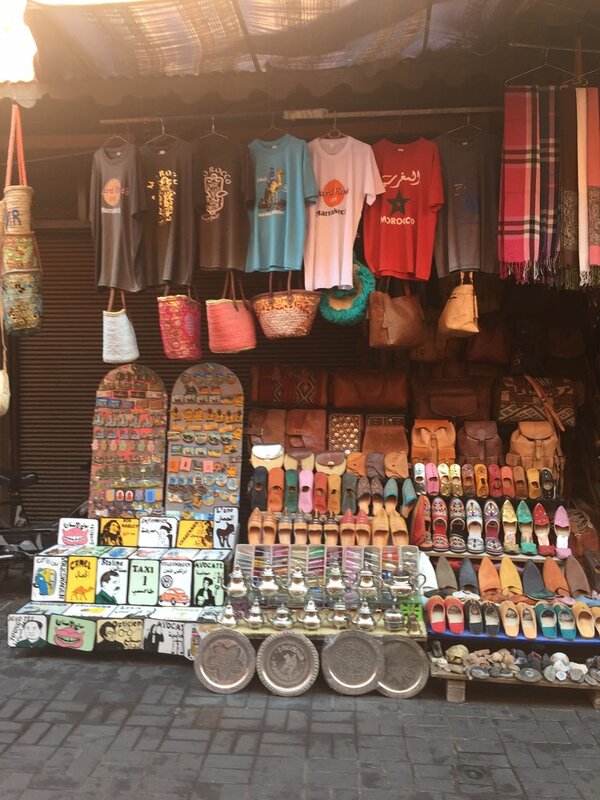 One tip is, buy all your souvenirs there, its way cheaper than any other place and they have everything. 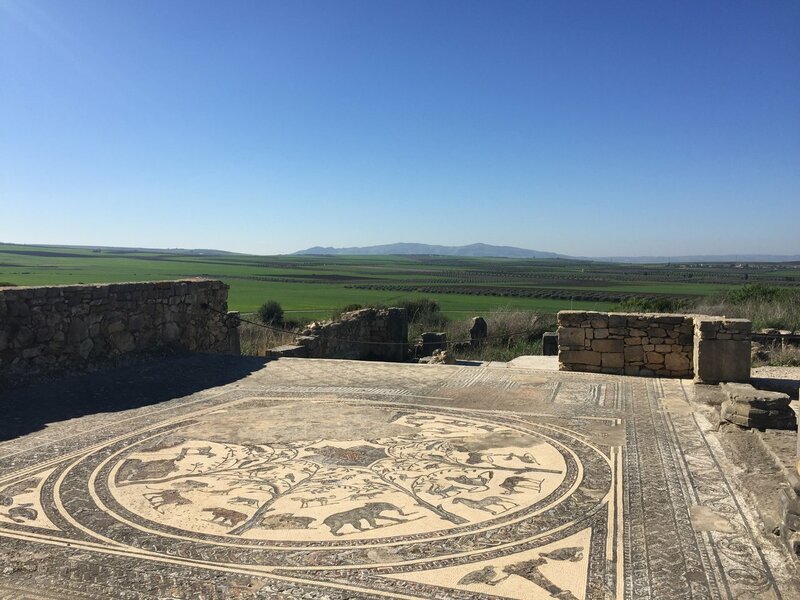 Definitely don't miss Essaouria. 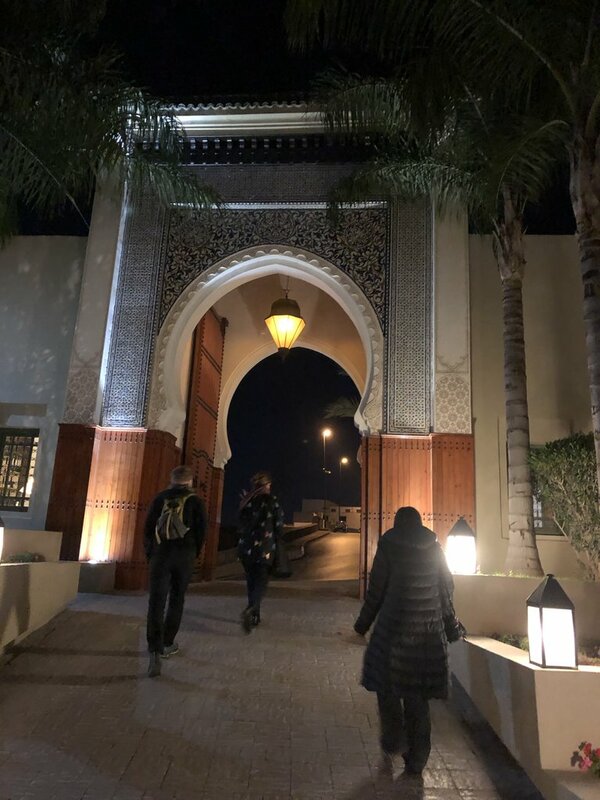 On our last day we drove back to Casablanca and had dinner at a fancy restaurant our driver Mohammed suggested, we had an amazing time and the food was delightful! 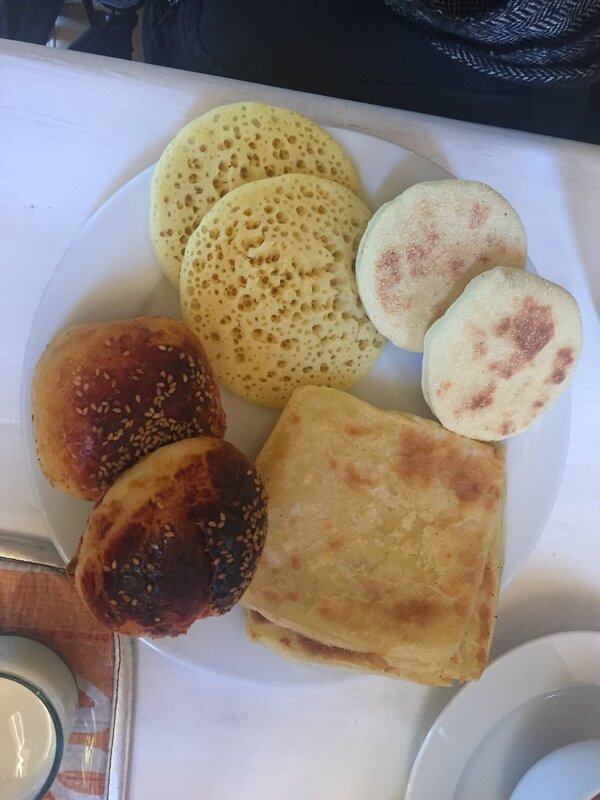 Well, food was amazing every single day, from the most cheap to more pricey places! 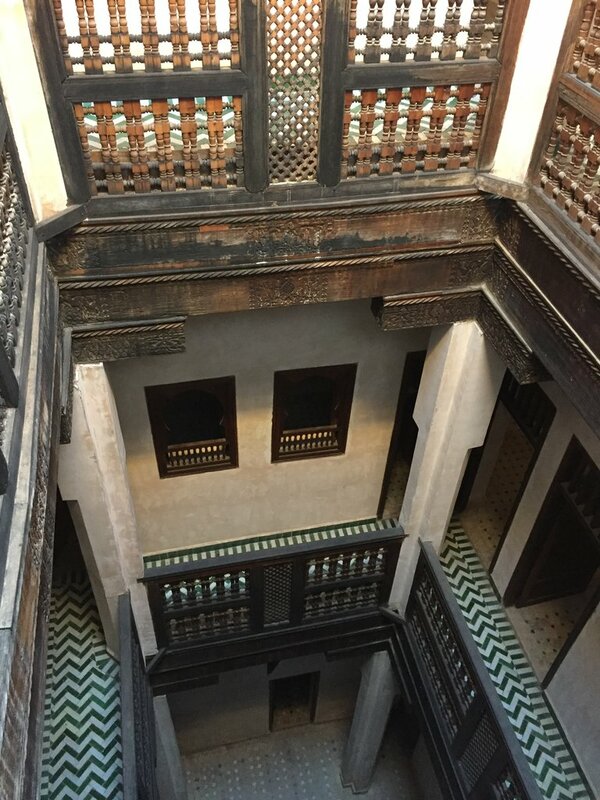 All of our accommodations were unbelievable nice and charming, it was definitely a huge part of our whole experience, we mostly stayed at riads, which were the perfect selection for us. We were provided with a small cel phone for anything that we needed at any time. 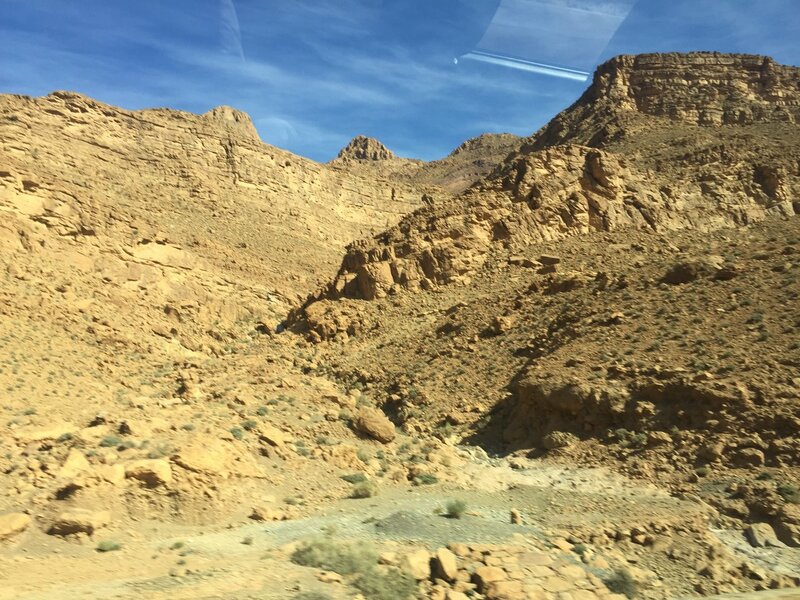 Our driver Mohammed was incredibly helpful and friendly, and most importantly, drove us with professionalism and great skills all around Morocco, which involved a lot of driving! I will definitely will be using kimkim services again and would recommend to anyone planning their next adventure! Thank you so much for your kind words! It delights me that you had such an amazing time and that your trip was exactly what you wanted it to be. I appreciate your feedback on Mohammed, Hakim and Ali. I will be sure to pass your praise on to them! 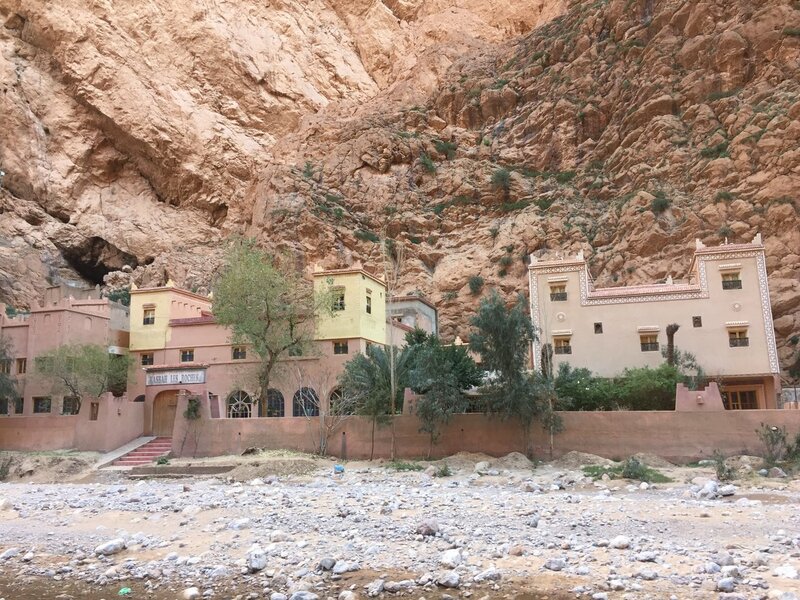 Thank you for the tip about bypassing Casablanca on the trip from Fez to Marrakesh; I think this will be a recommendation moving forward. 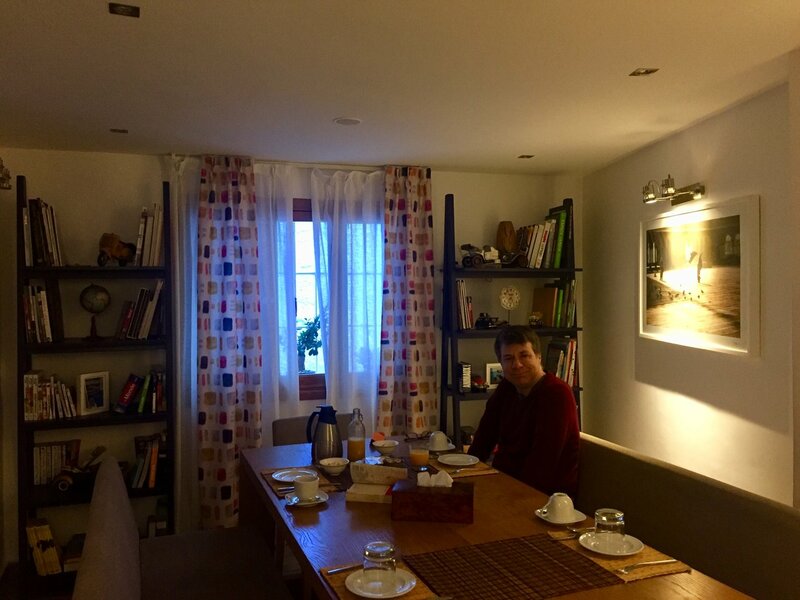 It was surely my pleasure to plan and host you, Anda, Ute and Jamie! 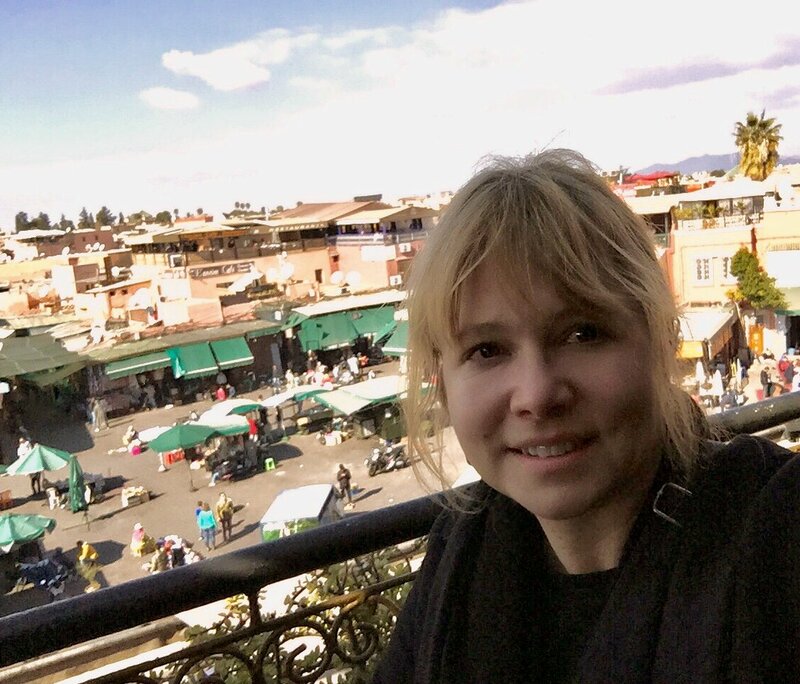 I hope that you come to Morocco again, and we can show you the northern part of the country and more into the majestic Atlas and Rif Mountains! Take care and keep in touch. From beginning to end, we were extremely well taken care of. 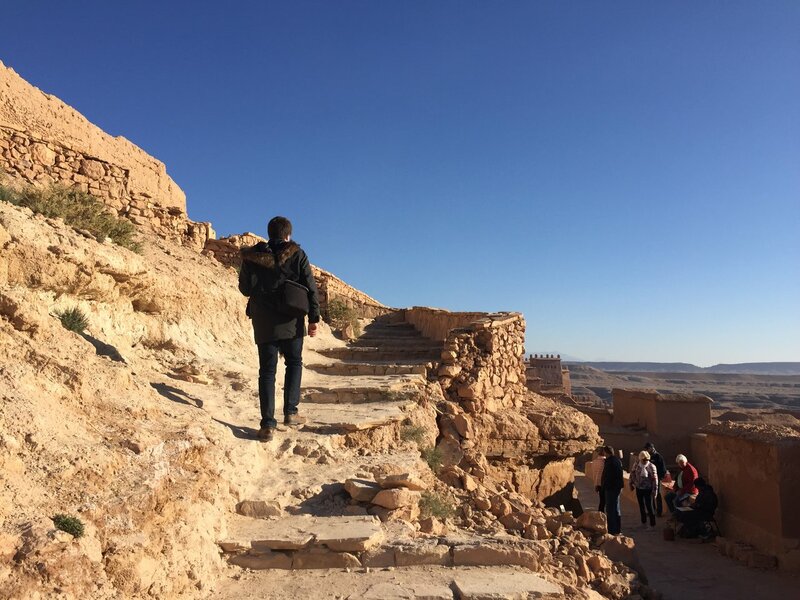 From our first communication, Yassine patiently helped us prepare an itinerary that was perfect for our group. 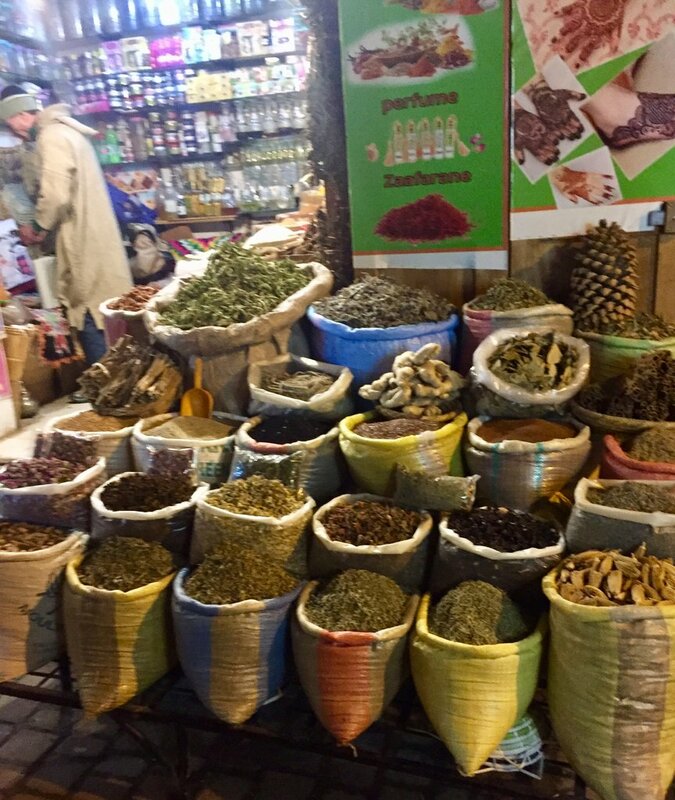 Once we arrived in Morocco, everything was seamless and well organized. Our driver Mohamed was polite, helpful and charming. He helped make the long drives between cities enjoyable, and assured that we were always comfortable. 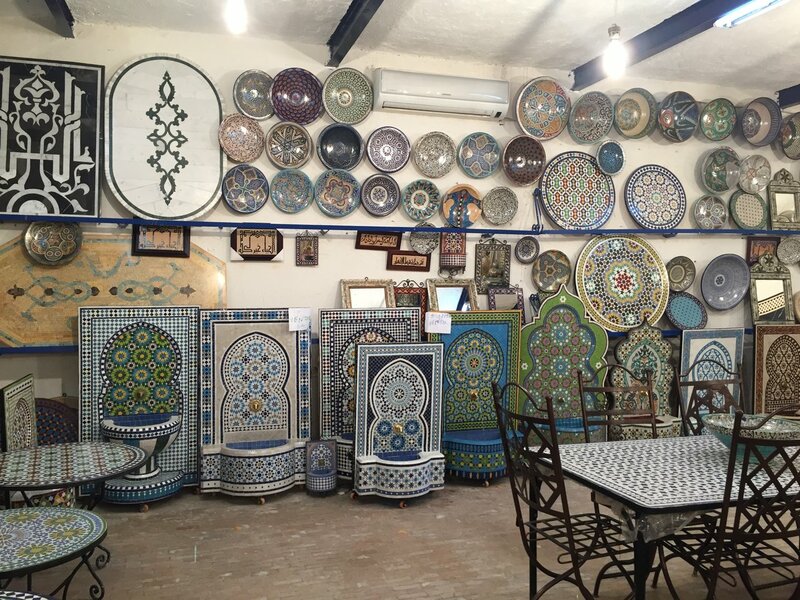 We were quite pleased with the selection of riads; all three were beautiful and special, each in their own way. Guides were polite and well-informed. 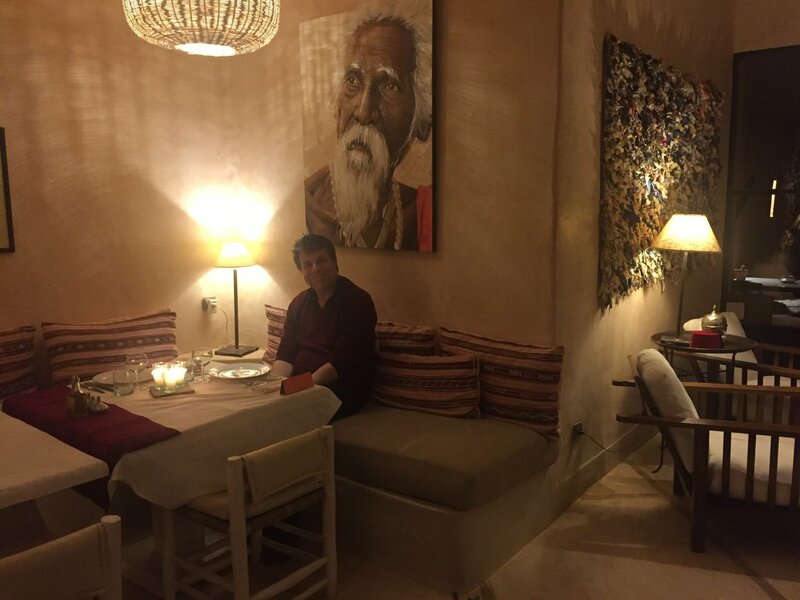 Ali in Marrakech did a great job choosing restaurants for us, and we had a few memorable and delicious dining experiences thanks to him. All in all, we had an excellent trip, and were extremely satisfied with the level of service from KimKim. We would do it all over again if we could. Thank you for an wonderful experience!! Thank you so much for taking the time to write your review about your trip. 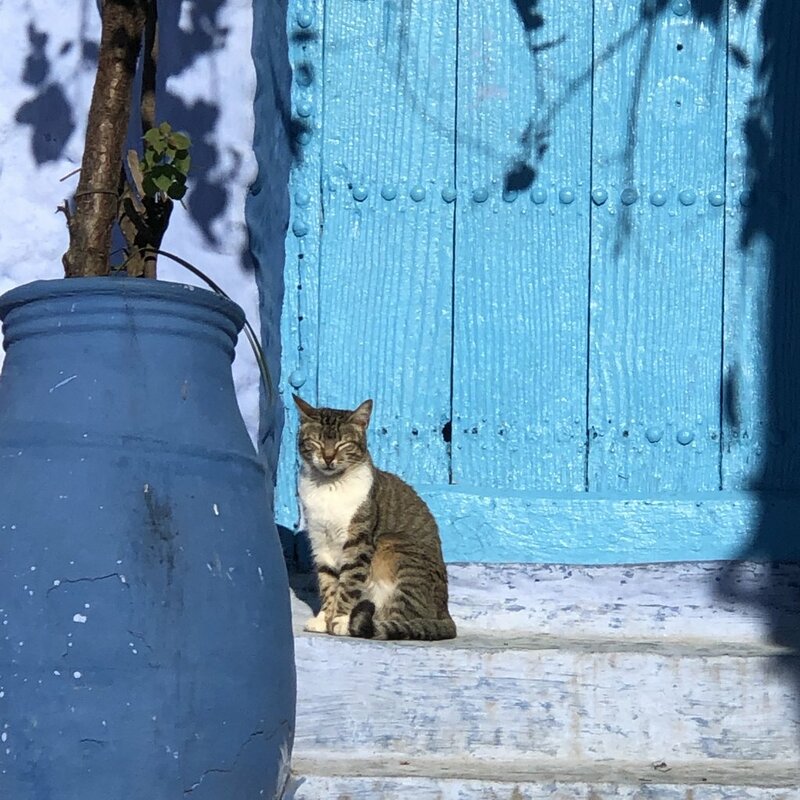 I'm glad to hear you had a good time in Morocco and that you enjoyed your accommodations. Your pictures are fabulous. Thank you sharing them with us. 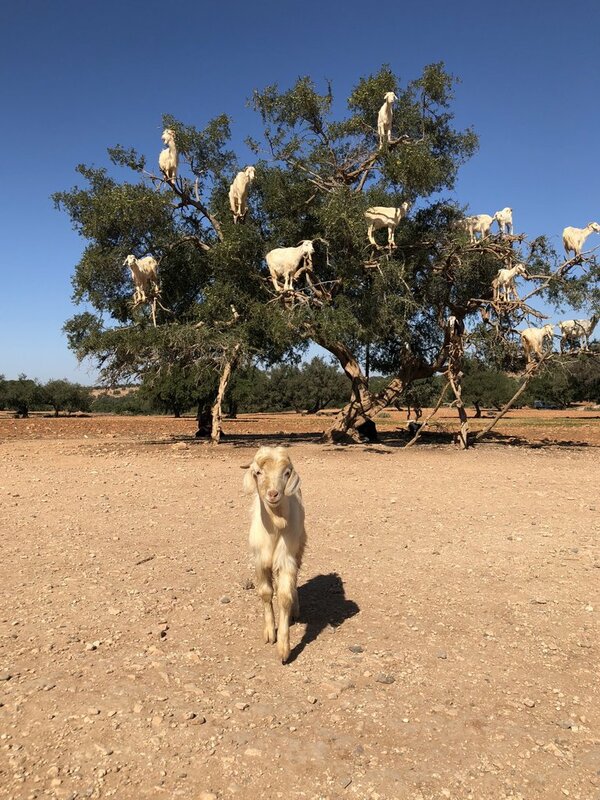 I see that you were able to catch some goats in Argan tree too! 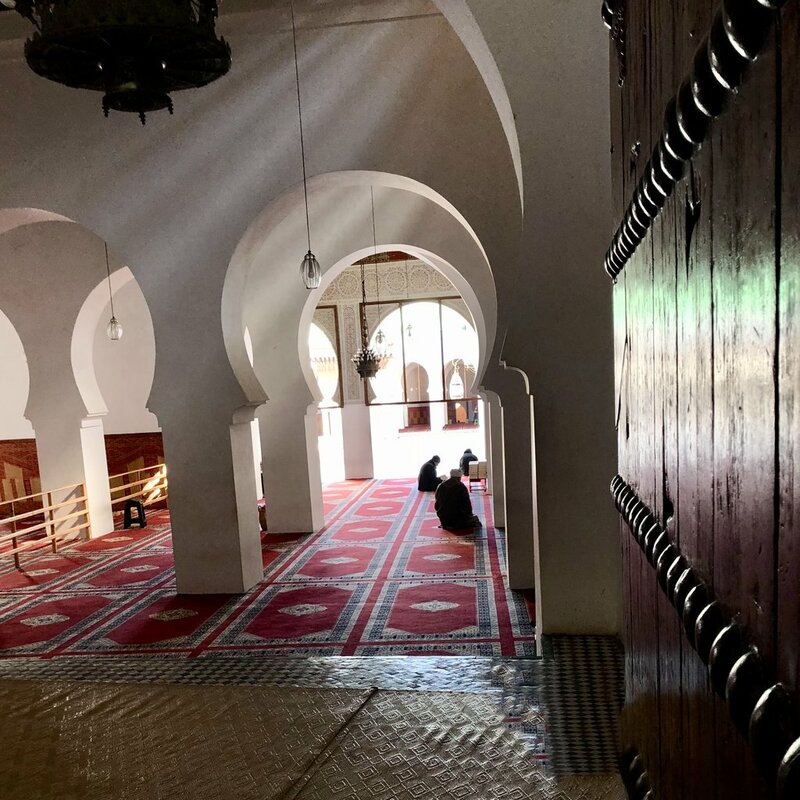 I appreciate your feedback on Mohamed and your guides. This is very helpful for me and I will make sure to share your kind words with them. Also, I'm glad to hear that the dinning recommendations worked so well for you. 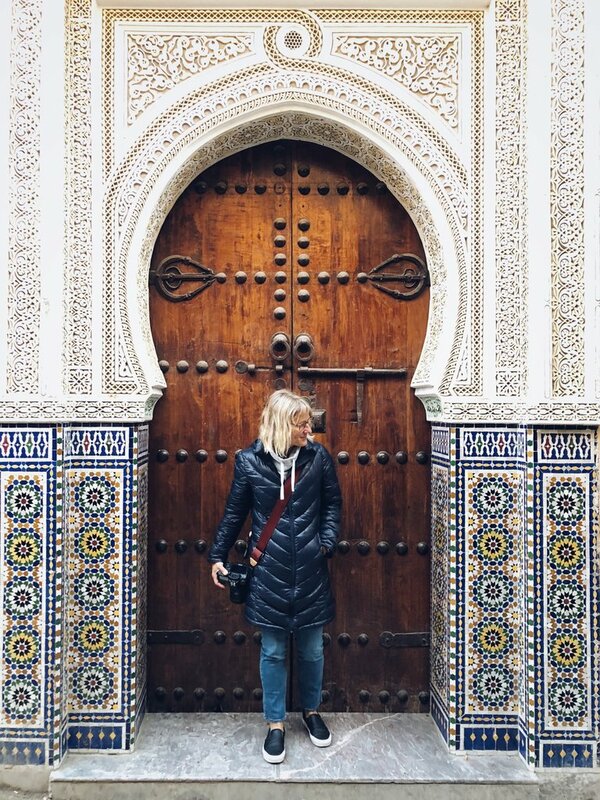 I'm very happy that we were able to take you on this trip and I hope to be able to plan future Moroccan adventures with you! 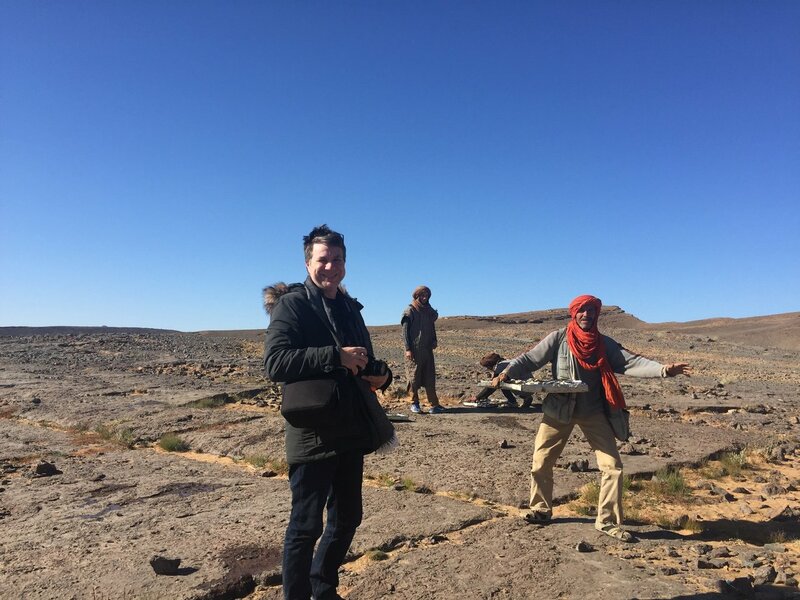 Our trip was great and well planned by Yassine. Our driver Nabil was wonderful and very responsive. He gave us a little phone that allowed us to easily contact him when we needed. We couldn't have asked for better help in a land that we were unfamiliar with. 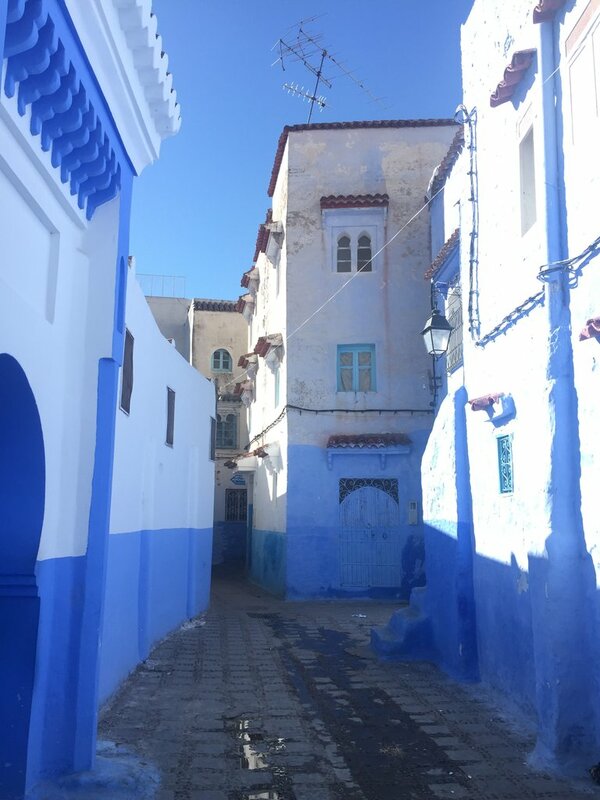 Our trip was seven days and packed, we were in Tangier, Chefchaouen, Fez, Casablanca and Marrakesh. 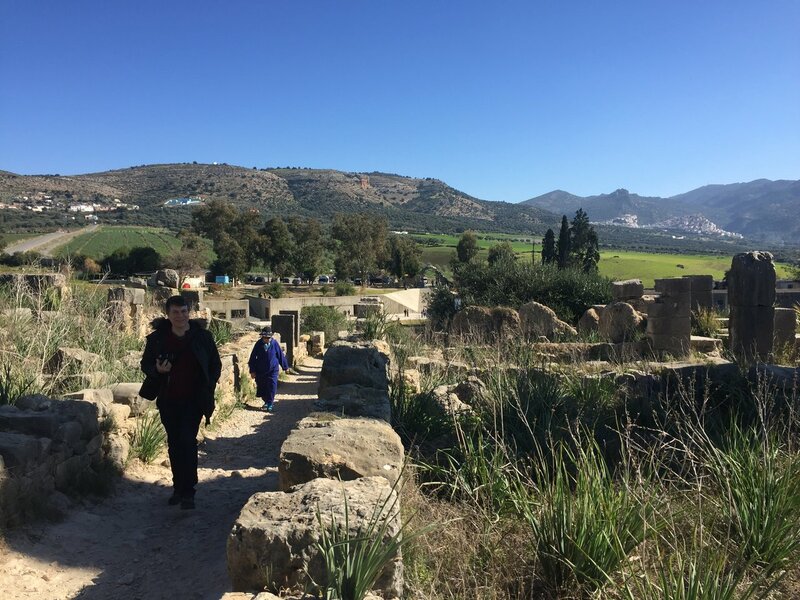 Admittedly, we should have narrowed down the places we went to, to allow for our type of travel which is a little more leisurely. We stayed at 3 star locations and most were great! 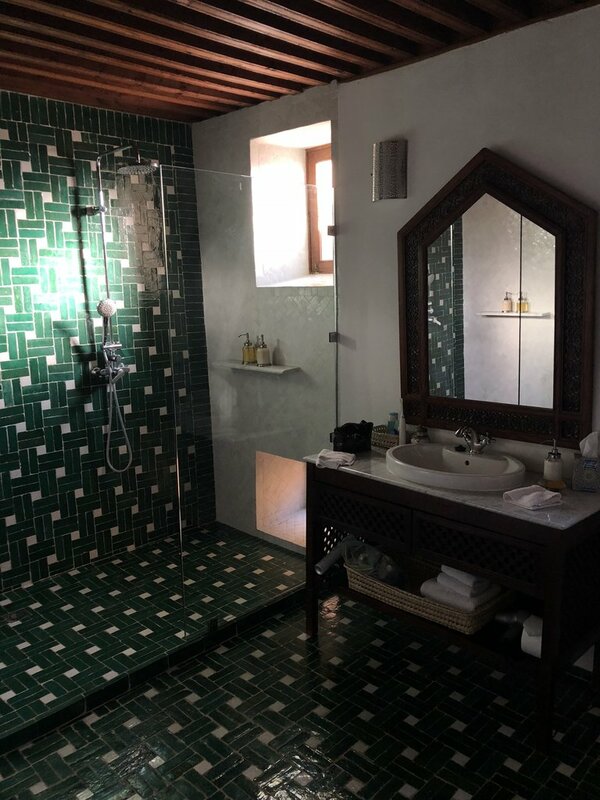 Riad RK in Marrakesh was great, the fact that they had a Hammam in the location made unwinding much easier. 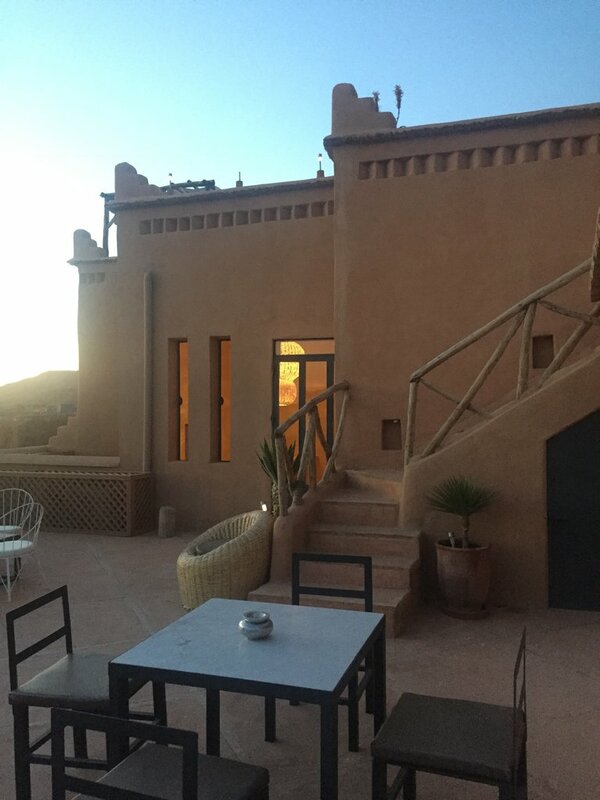 Our Riad in Chefchauouen was also very beautiful and the staff there were very helpful. 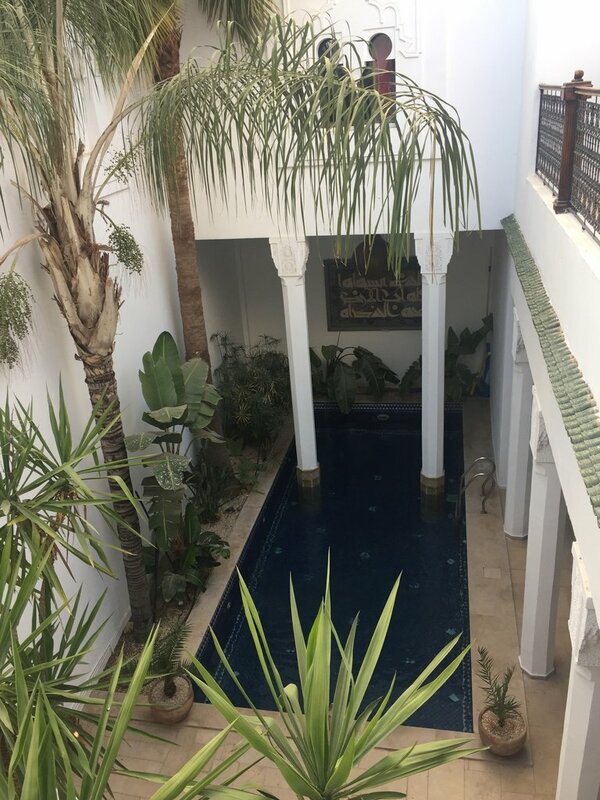 On the downside, our riad in Fez (Dar Malika) was nice enough and in a central location but we had a less than ideal situation while there. They are admittedly under transition and do not have a person who works there that stays overnight. This makes it very difficult to talk to someone when the water isn't working (which it didn't for us). The house was very cold outside of the room we stayed in and the second day the groceries went on strike so our breakfast was only a little bread and yogurt. Going to the tannery and not being able to shower was a huge miss. This is the one place I would not stay at again. 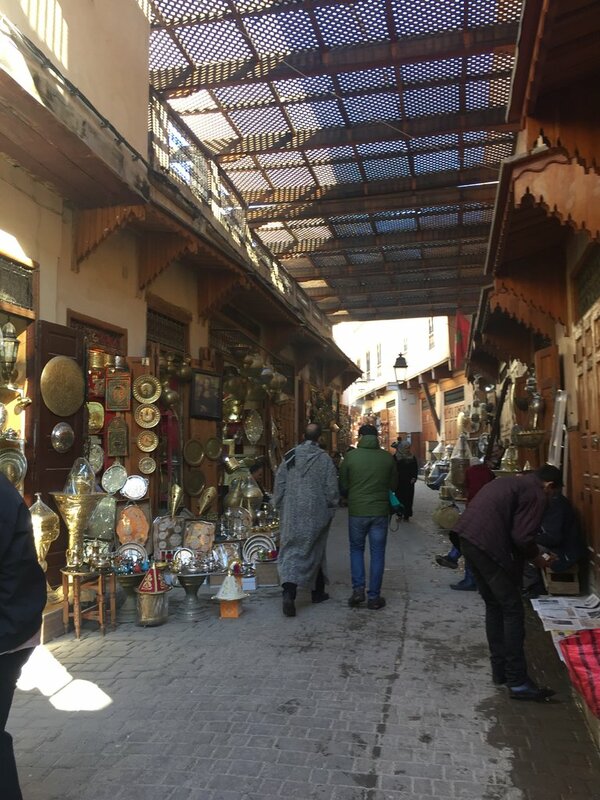 The tours that Yassine booked and the guide in Fez was also wonderful. 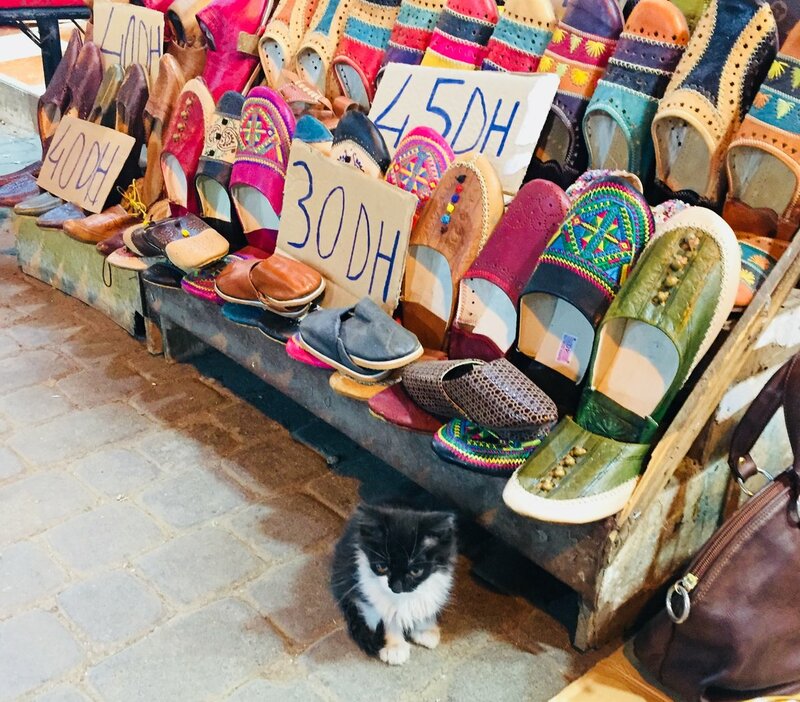 The only downside is that we started to feel like we were only being taken places to spend money instead of simply to admire the culture and choose to buy things if we wanted. 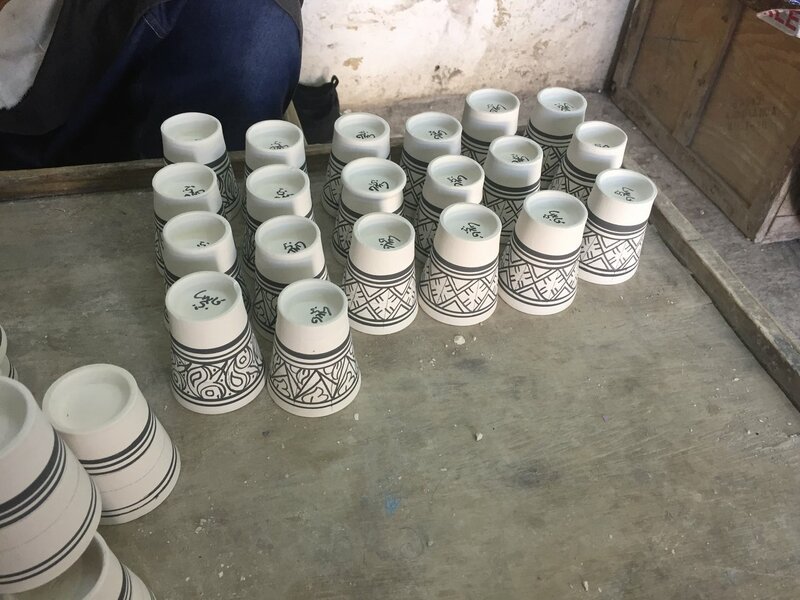 We started to feel like the tour was very planned to only go to places that would eagerly show us things only to get us to buy very expensive items. I could do without all the shopping that seemed to be most of the tour, it was very repetitive and didn't allow for much downtime or peace. There were so many good things and a lot of lessons learned. I will vocalize more about what I'd like in the future and also be sure to know that less is more when booking. 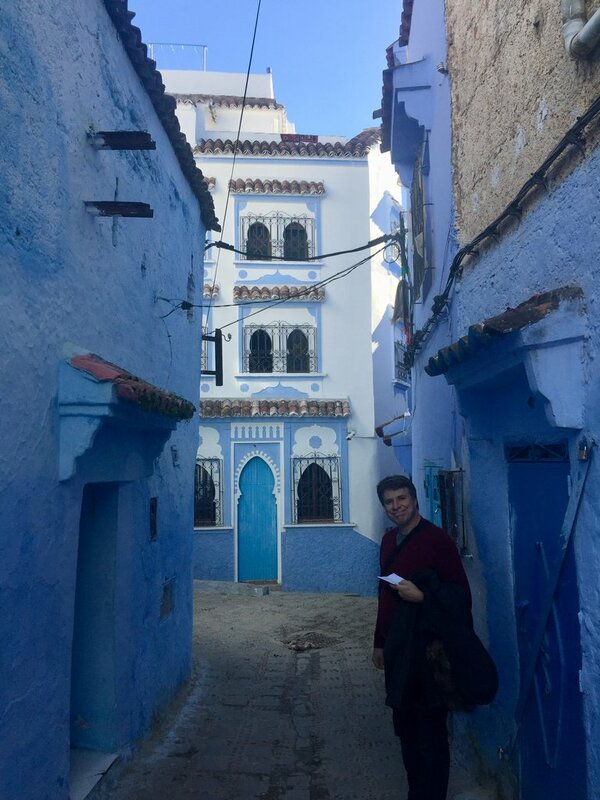 Thank you Kimkim, Yassine, Nabil and all of the staff at Morocco off the Beaten Path, you were wonderful! Thank you so much for your kind words and feedback. 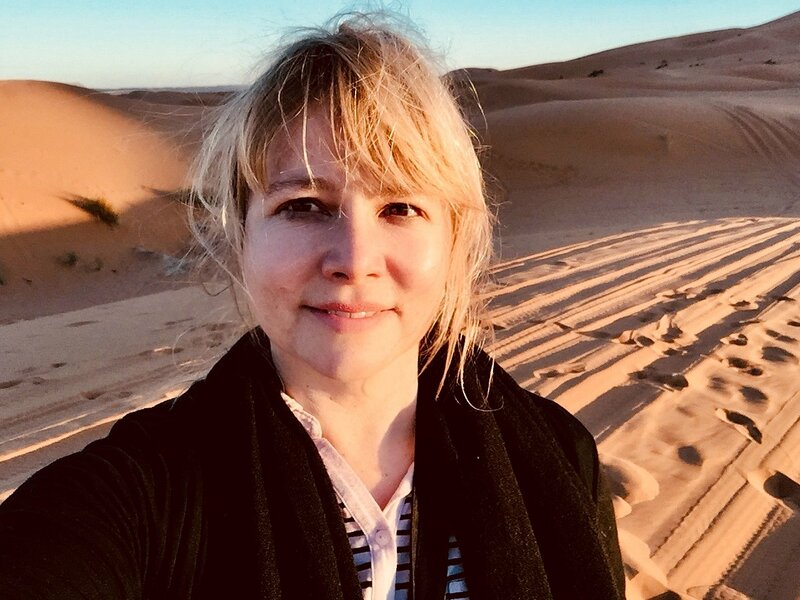 I am so thrilled that you had a great time in Morocco. Your comments and review are so important for my business, and I appreciate your candor in all your communications with me. 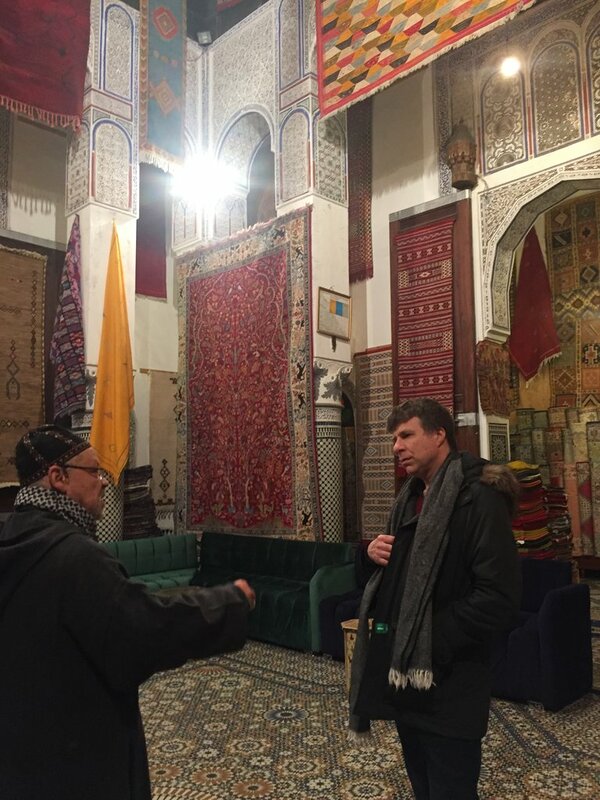 I have followed up with the owner of Dar Malika to inquire the situation when you were staying there. They are going to work on adding more heaters in the hallways and make it easier to get in contact with the attendant whom lives next door in emergency situations. Unfortunately, some construction in the area caused the water to be shut off for a bit. 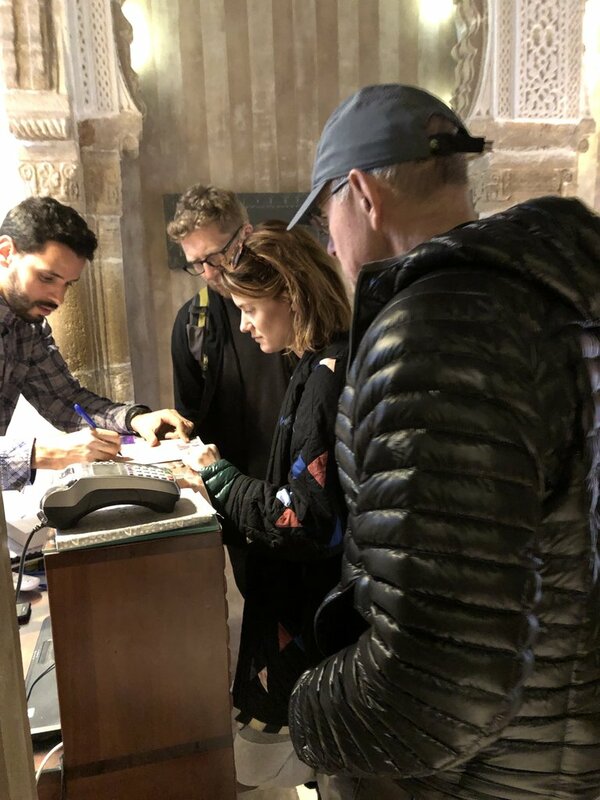 I have also followed up with your guide in Fez to reiterate our policies and instructions on how our tours should be ran. 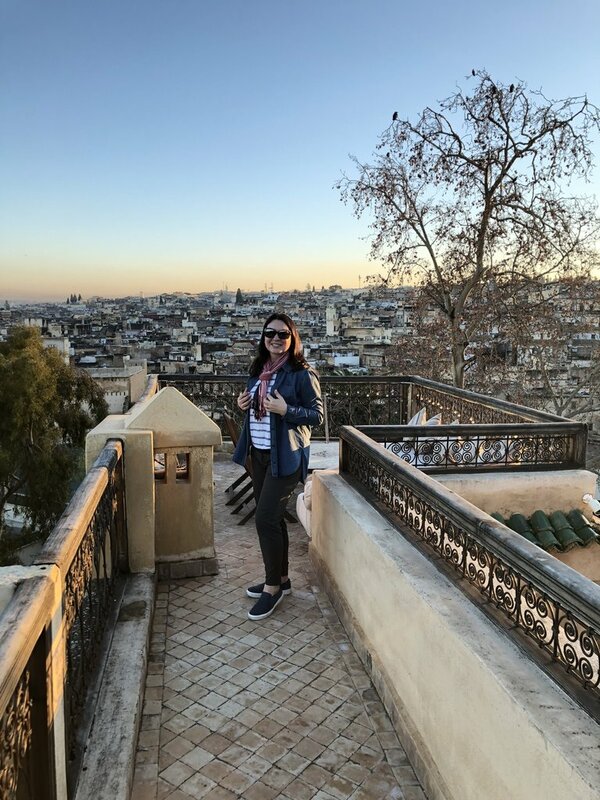 We have gone over ways to modify a tour to meet their traveler’s needs, whether it be more cultural or more touristy, and how to solicit feedback during the tour. 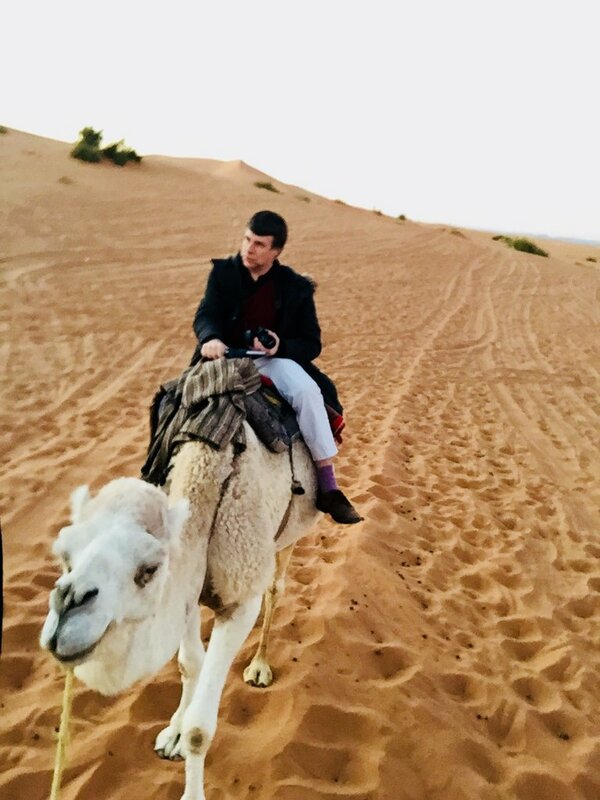 Again, I am very thankful for your review and the information you have provided me, and to others considering going on a fantastic trip to the Kingdom of Morocco. If you are ever interested in coming back, please don’t hesitate to reach out to me and kimkim. Take care. 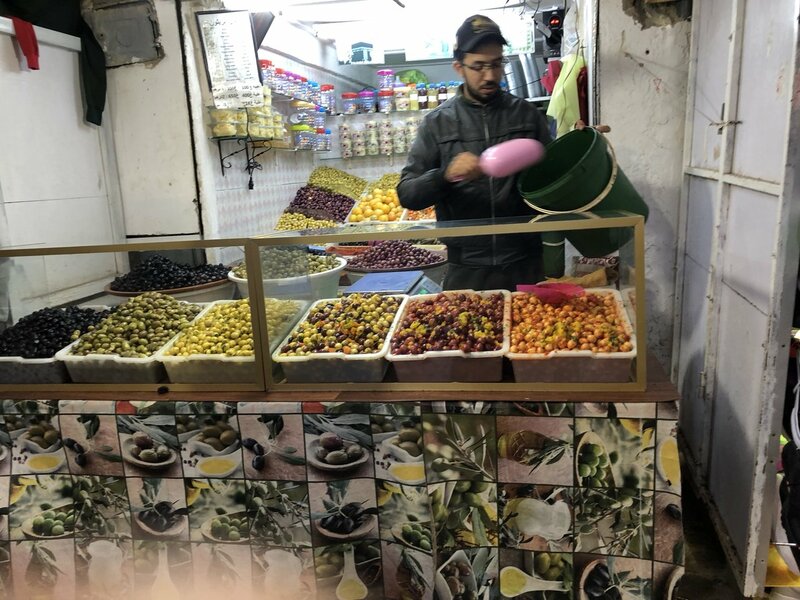 First of all, a big thank you to Yassine and the other members of his team: Hassan, Mohammed & Nabil as well as Chris and Kellie from Kimkim who all worked together to arrange this trip for us. 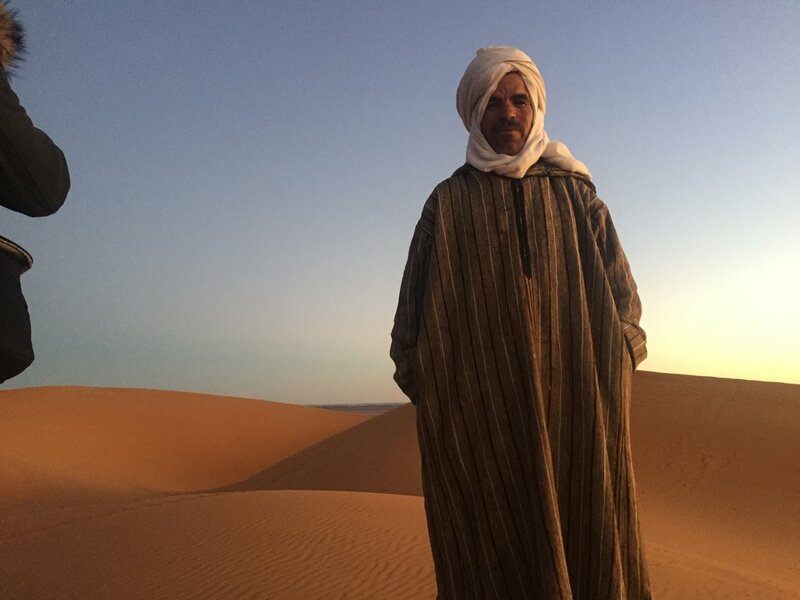 A special thank you to Mohammed, our driver, who drove us all over Morocco, covering great distances. He was an extremely safe and responsible driver who knows the roads and traffic conditions of his country very well. 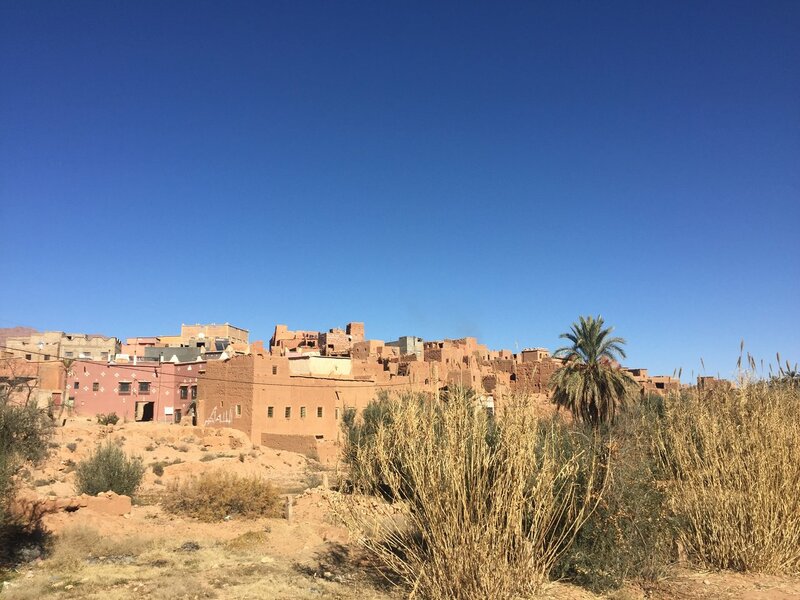 Ever since I saw the BBC documentary " Sahara" presented by British Actor Michael Palin, many years ago, I wanted to visit Morocco and the Sahara desert. And in January 2019, the day finally came. 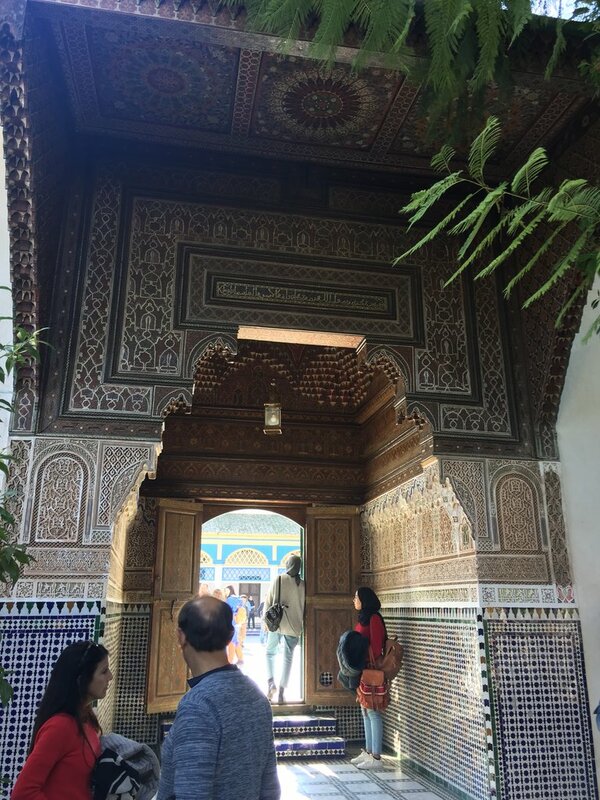 Before our Morocco tour started, my husband and I have been travelling in Southern Spain for a week. 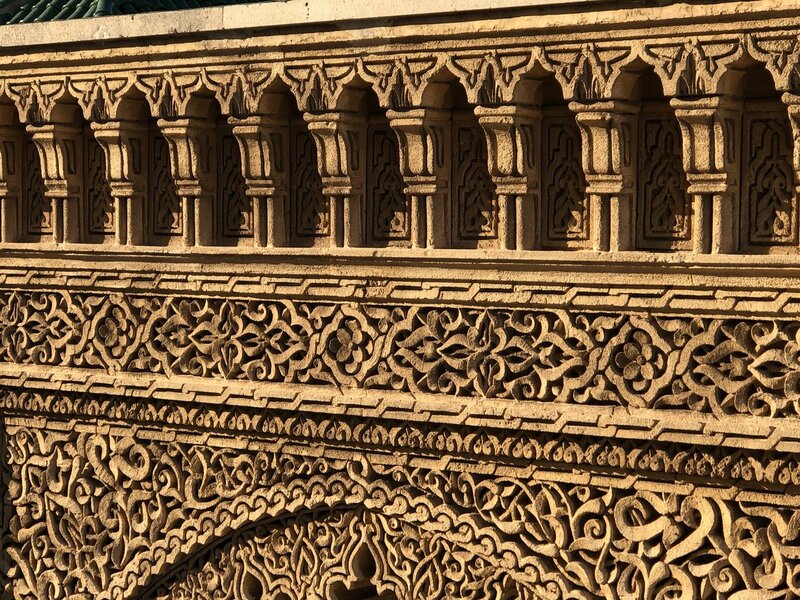 On 11 January, we took the FRS ferry from Tarifa in Spain across the Straits of Gibraltar to Tangier. 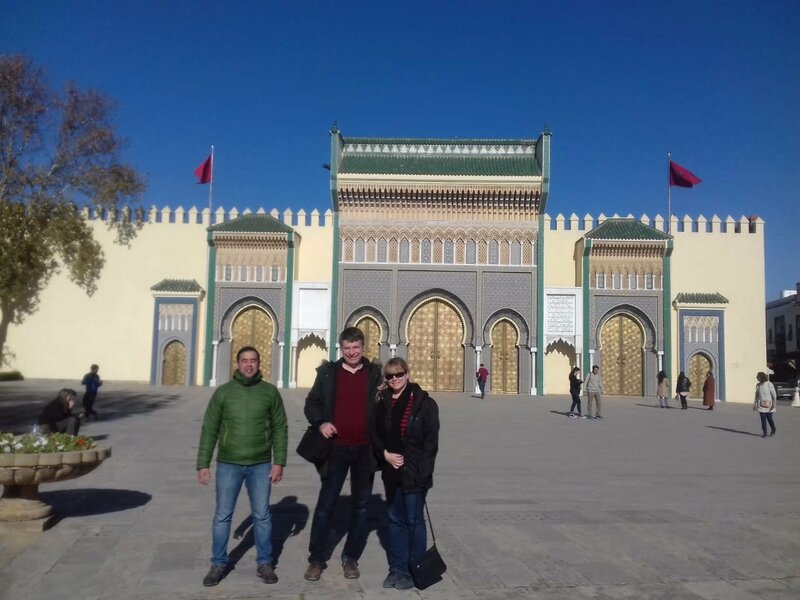 We spent one night in Tangier and our driver, Mohammed, met us the next morning on 12 January to start our Morocco of the Beaten Track tour. 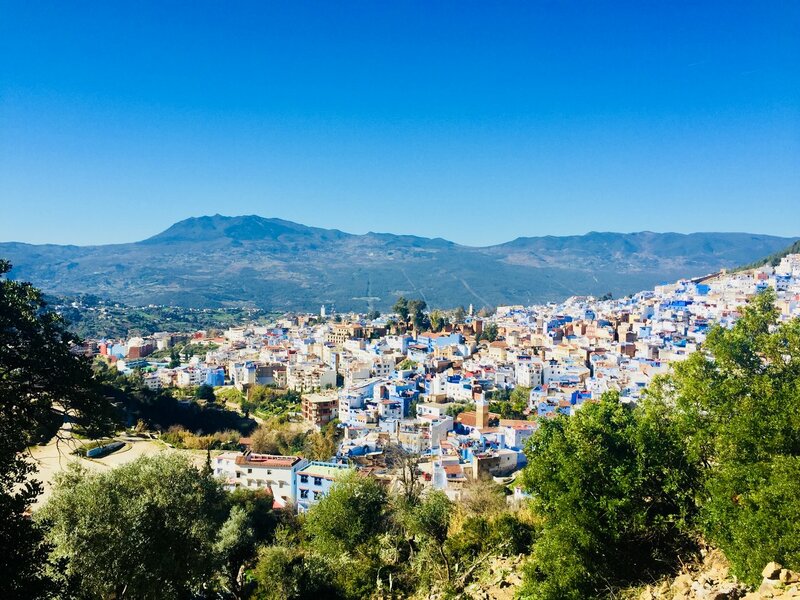 Our first stop on the tour was Chefchaouen. 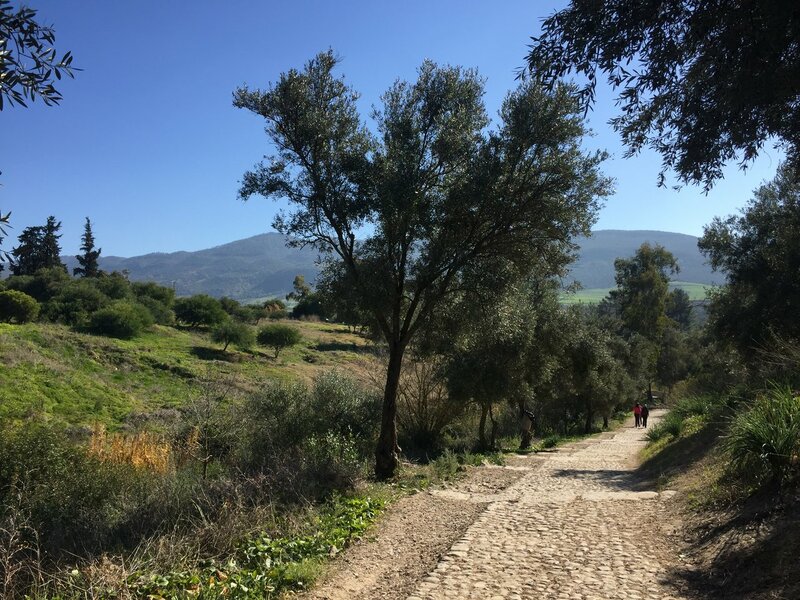 The winding road from Tangier to Chefchaouen through the Rif Mountains was very picturesque and a great way to see the greener countryside of Morocco. 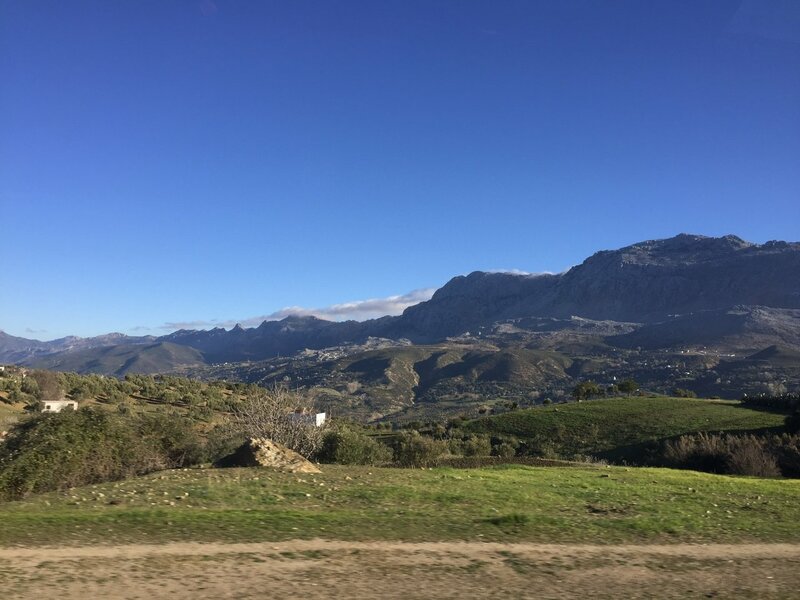 People often think of Morocco as mostly a dry desert landscape, but the route from Tangier to Chefchaouen is very green and beautiful. 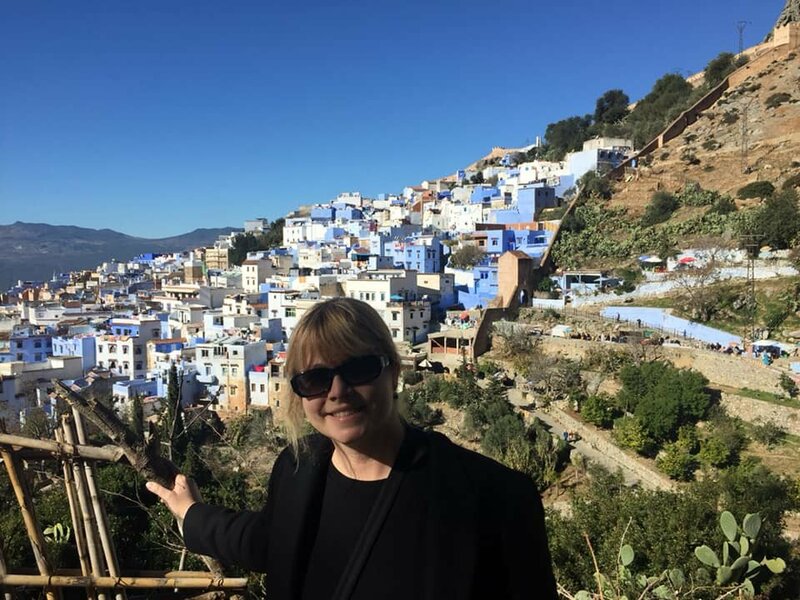 Chefchaouen was one of the highlights of our trip. 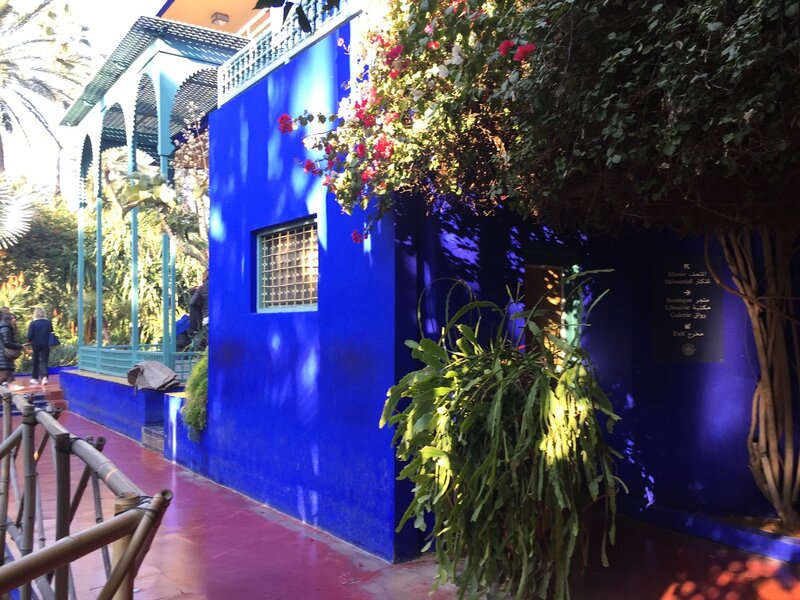 The accomodation at La petite Chefchaouen in the heart of the old town on the hill was great. 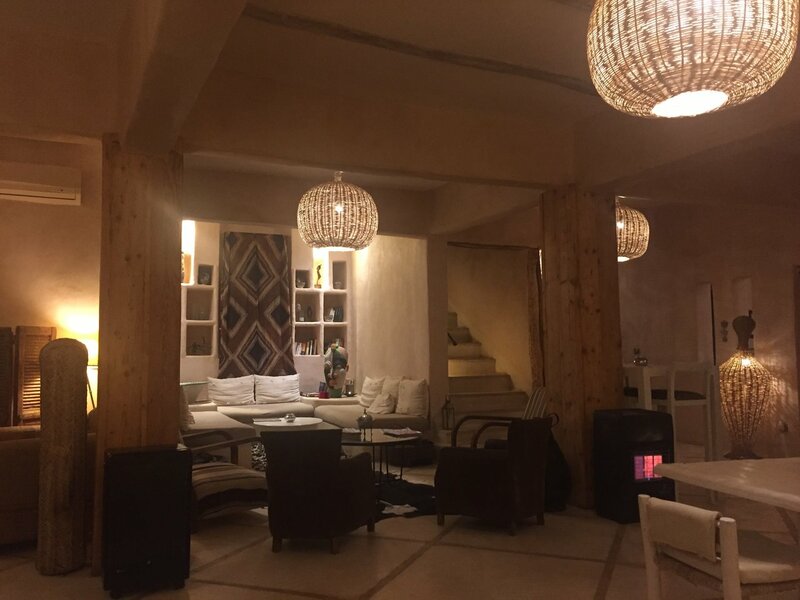 This small boutique hotel is run by two young brothers who were always extremely kind and professional. 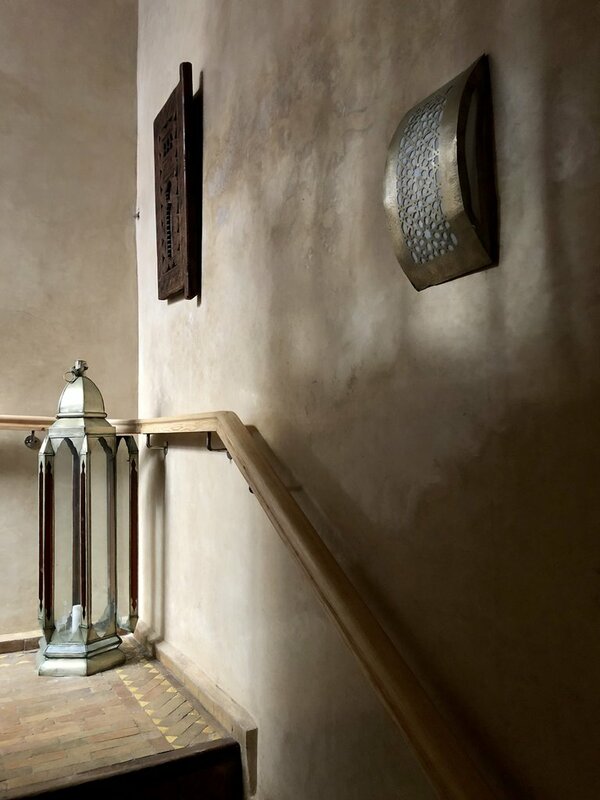 The decorations were modern and stylish and practical, similar to small boutique hotels in Australia and Europe. 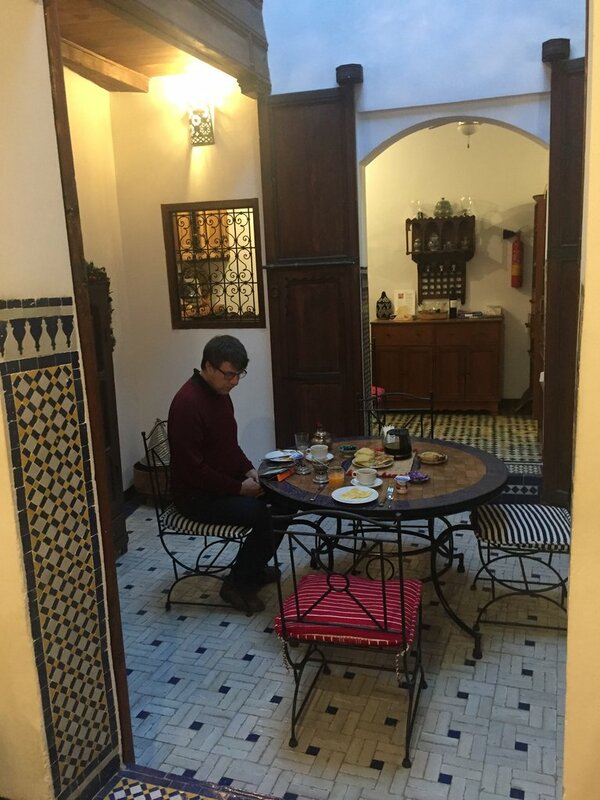 The breakfast was great and the wifi always reliable. The town itself was lovely and the locals very friendly. We always felt really safe walking around on our own. 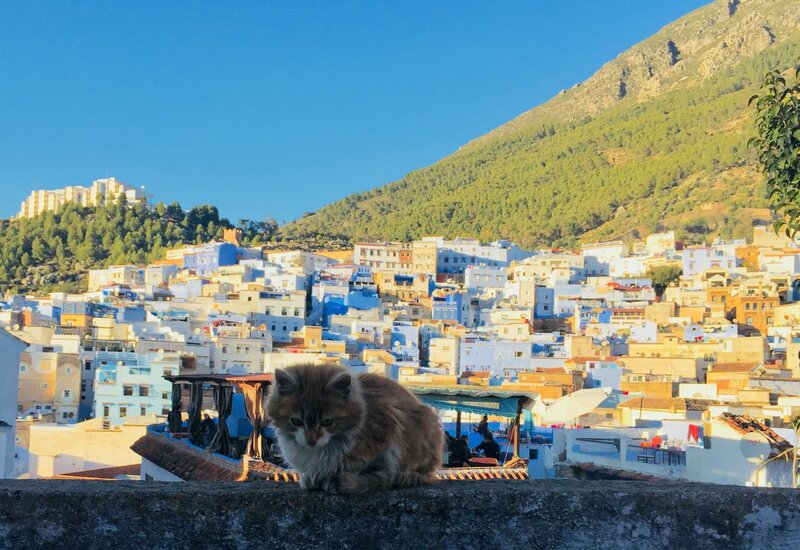 A shop keeper invited us up to his roof terrace to show us the spectacular view and meet his ginger kitten. It was great that he genuinly just wanted to show us the view and was not trying to sell us something. 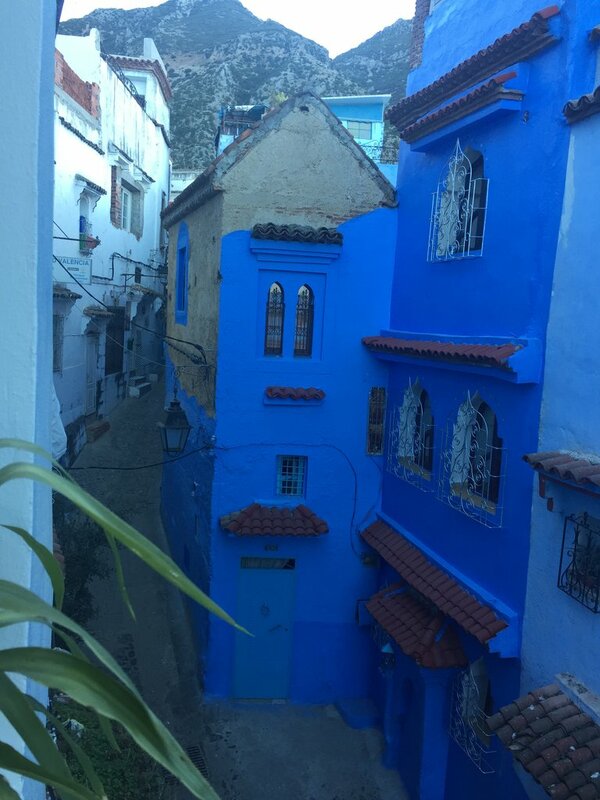 In Chefchaouen in general, we felt more relaxed and not so hassled by every second person as in Fes or Marrakech. 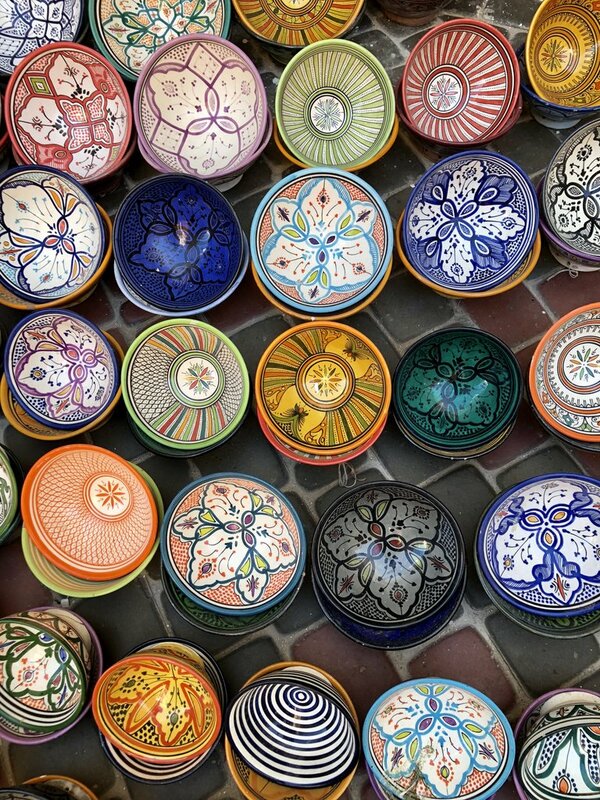 When you walk around the Medinas of Fes and Marrakech, everybody wants to sell you something or be your guide. 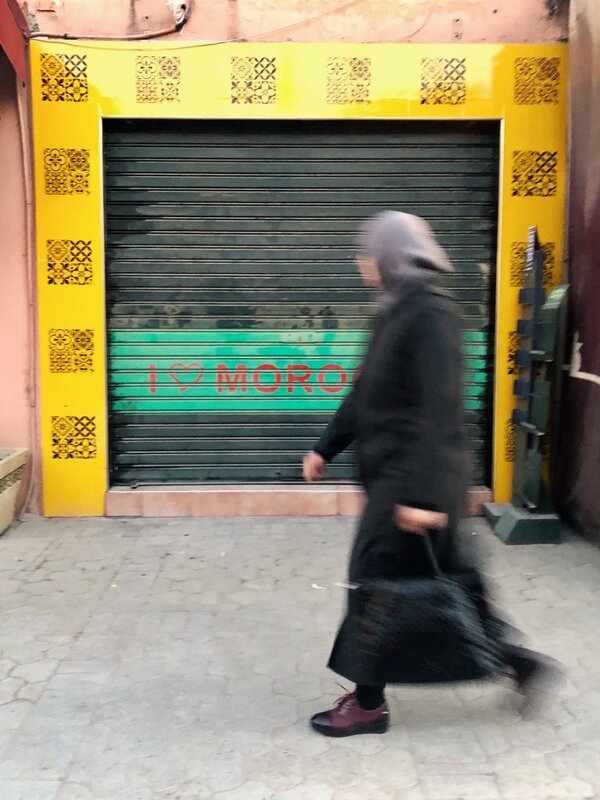 The Moroccans are great sales people, but not all toursits want to constantly buy things, so it can be quite exhausting to keep saying no. 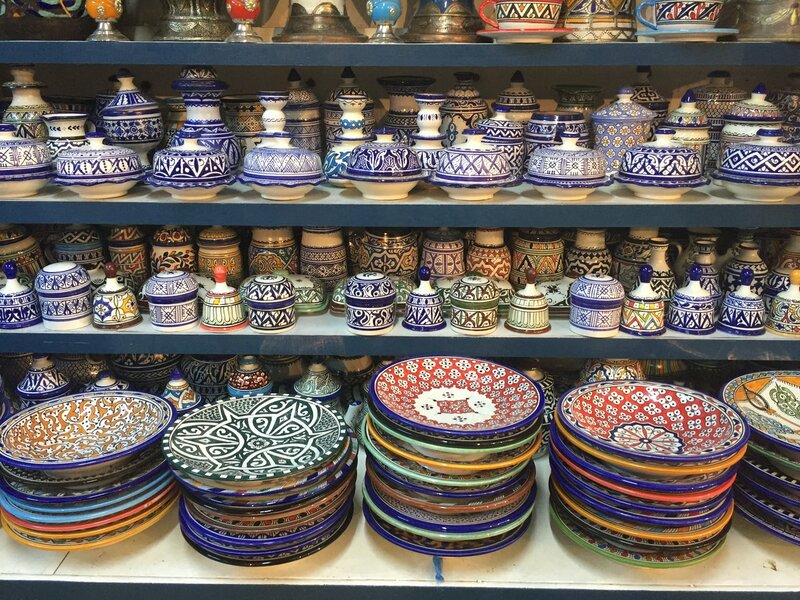 If you do not want to buy something, the 2 most useful phrases to learn and to say firmly but always with a smile are: La Shukran or Non Merci! 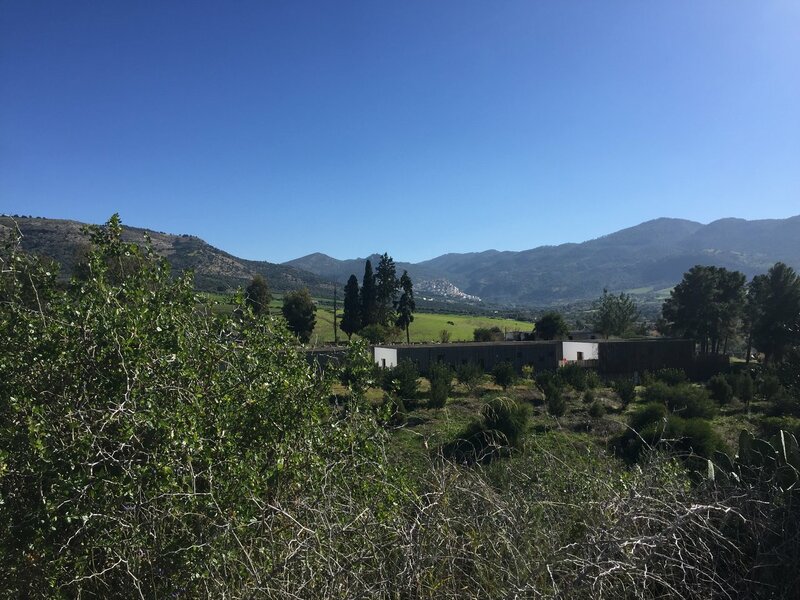 From Chefchaouen we drove to Fes, again with spectacular views over the Rif and Middle Atlas Mountains and rows and rows of olive plantations. 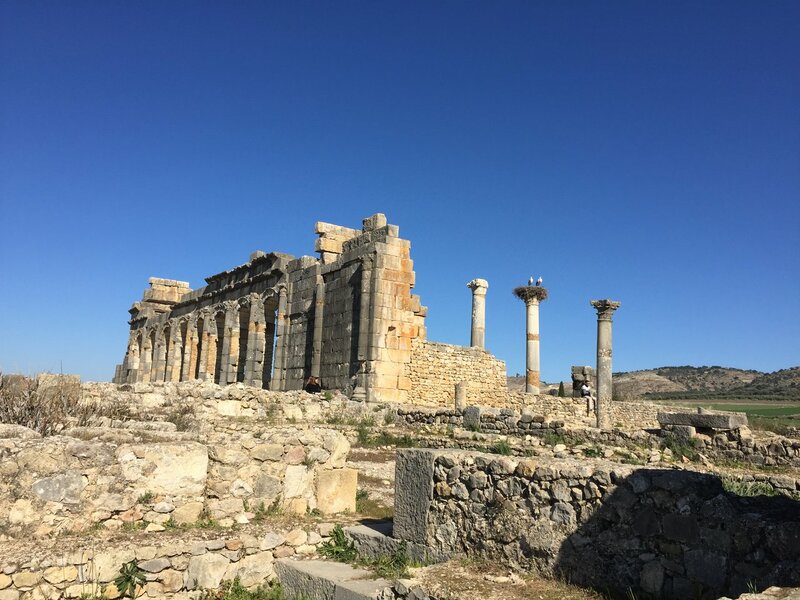 En route we stopped near Moulay Idriss to see the Roman Ruins of Volubilis. 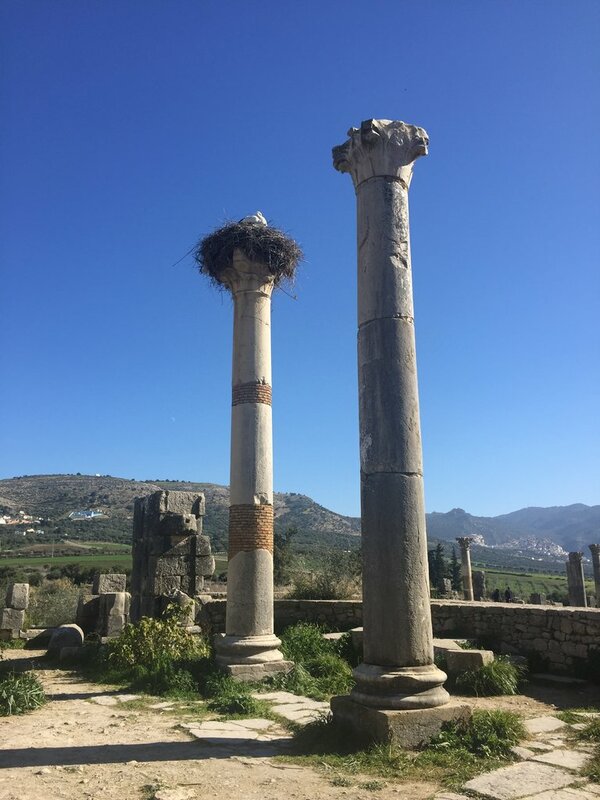 For people with an interest in history and museums and archaeology, these ruins are a must see. 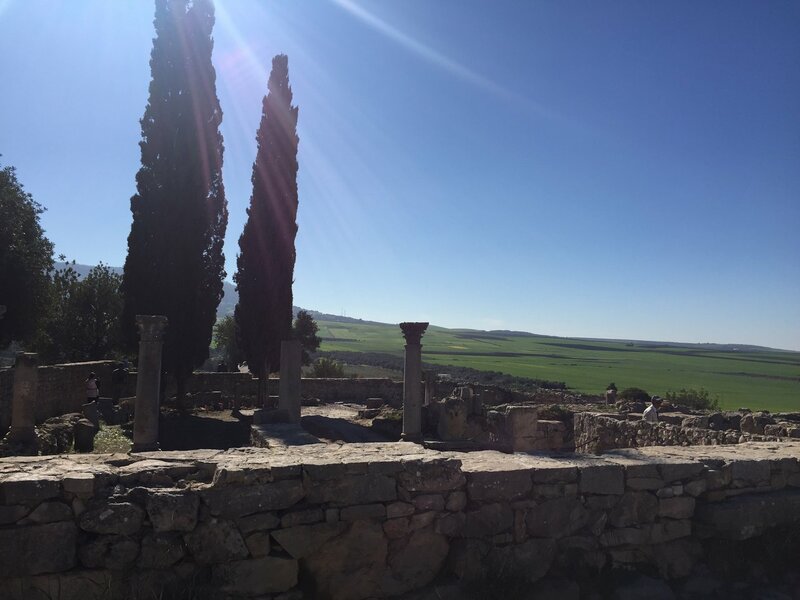 The views over the surrounding countryside and Moulay Idriss from the ruins are great. 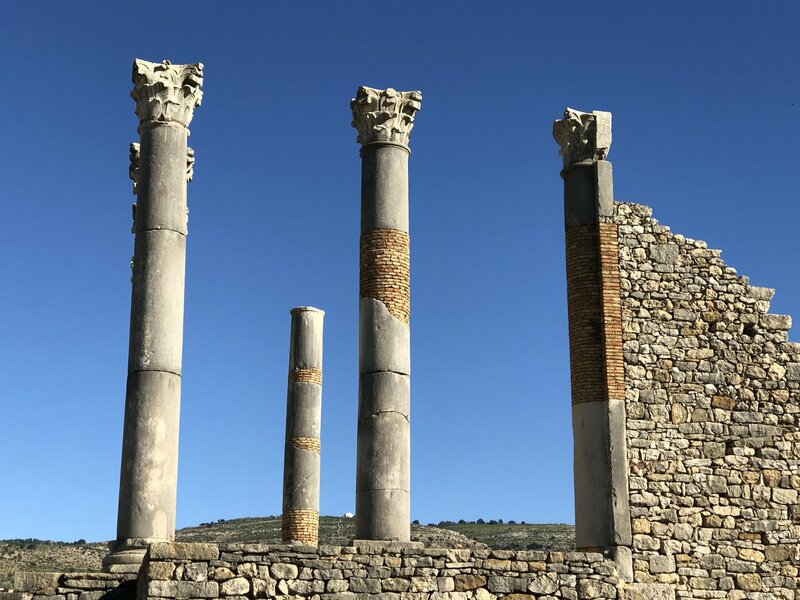 Since the trip involves a lot of time on the road, it can sometimes be hard to find a clean restroom, so even if you are not that much into ancient ruins, I would highly recommend a stop at Volubilis, to stretch your legs and walk among the ruins and it also has very clean toilets. Just make sure you have enough coins to tip the cleaning ladies. 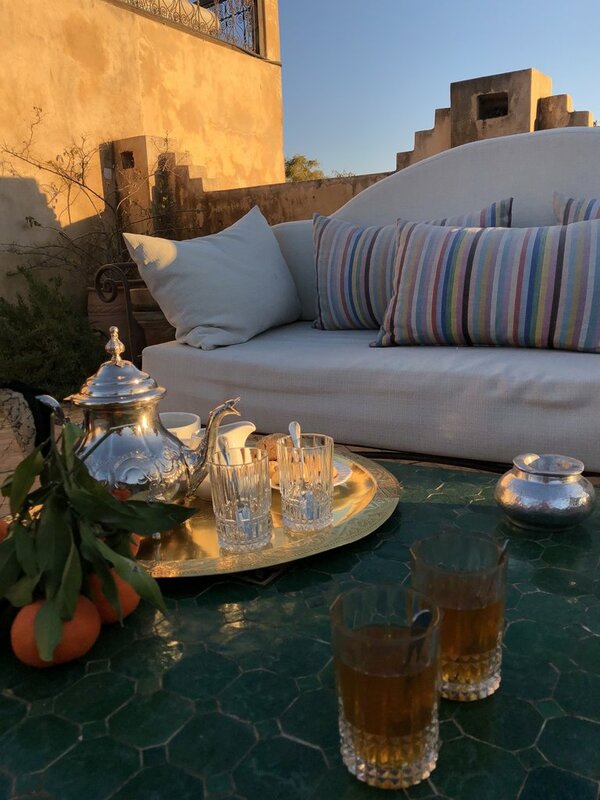 We then stayed in Fes for 2 nights at a beautifully old renovated 300 year old house in the Medina, called Dar Mallika, owned by an Australian writer, Susanna Clarke. 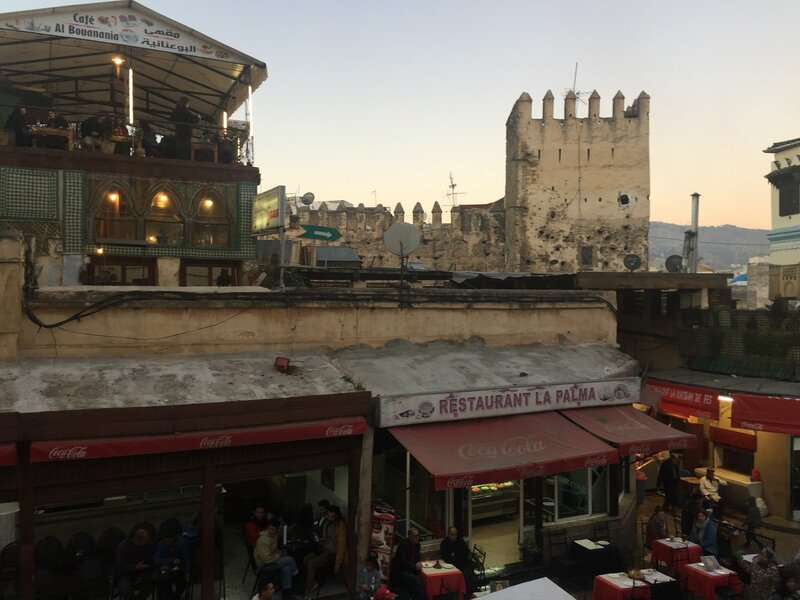 In winter it is quite cold in Fes and the house was very cold, but the room had heating and airconditioning and the electric blankets on the beds were great. 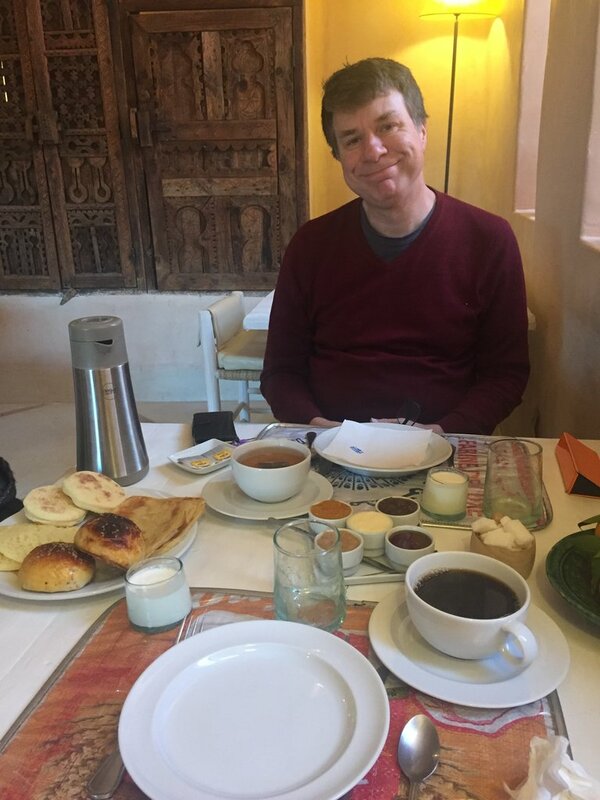 It was also good to have a choice of different high quality English Breakfast and other Teas as well as several international News Channels in any language of your choice, to stay up to date with what's going on in the world while on holiday. 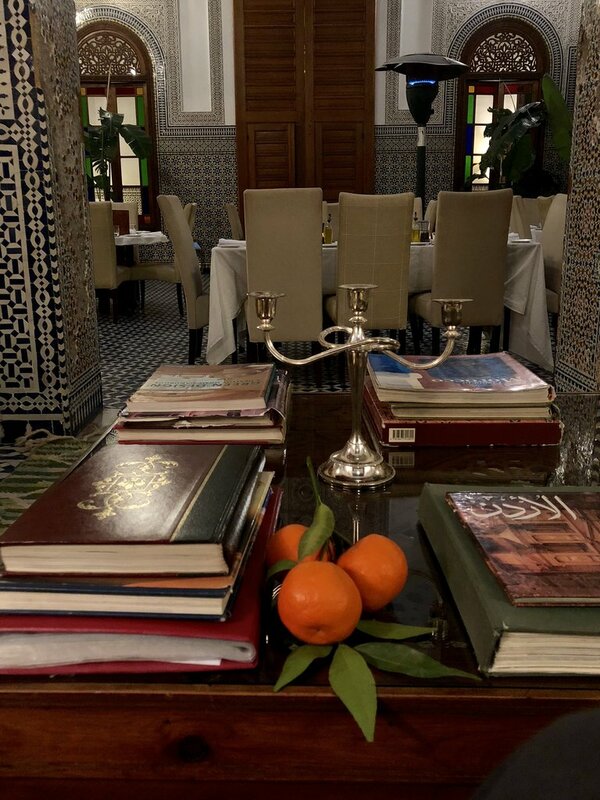 There was also a selection of music to listen to while having breakfast, from classical, jazz to Arabian pop! 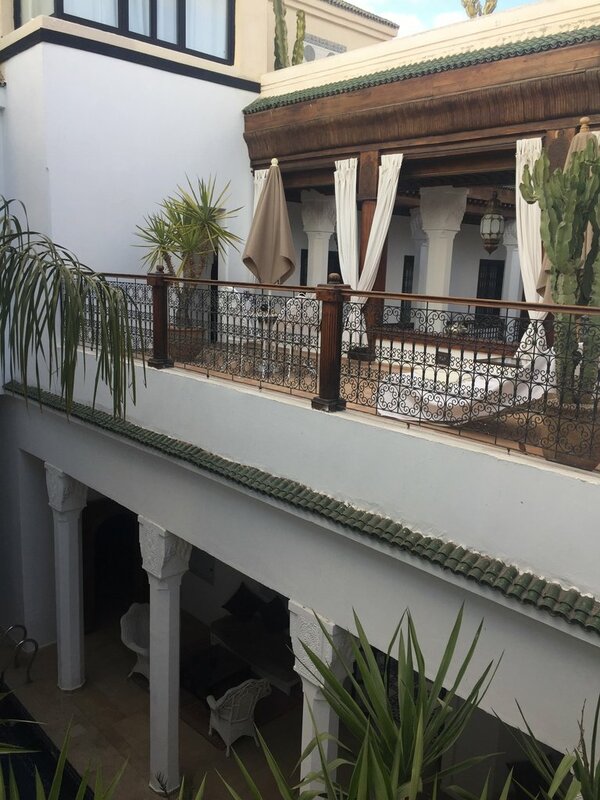 Si Mohammed, the Riad manager was also a great host, very well organised, helpful and professional. 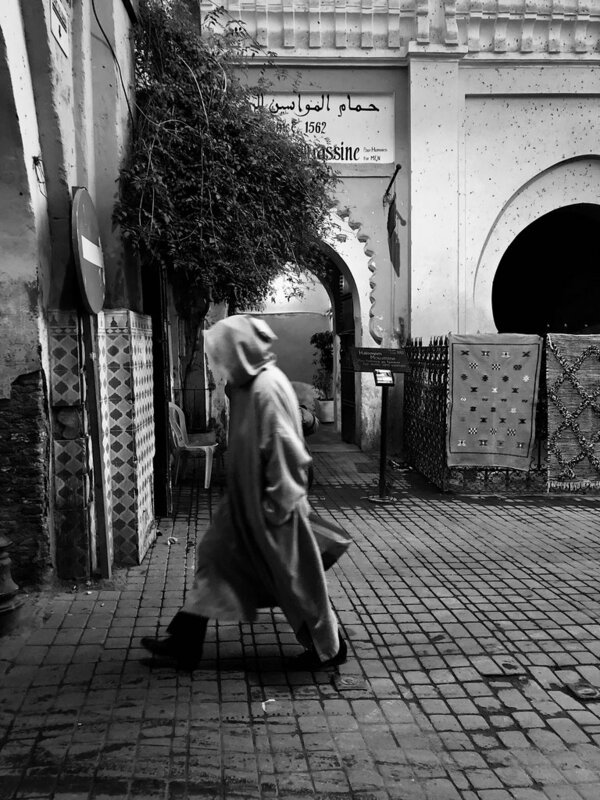 Fes was a fascinating city and a journey back in time. 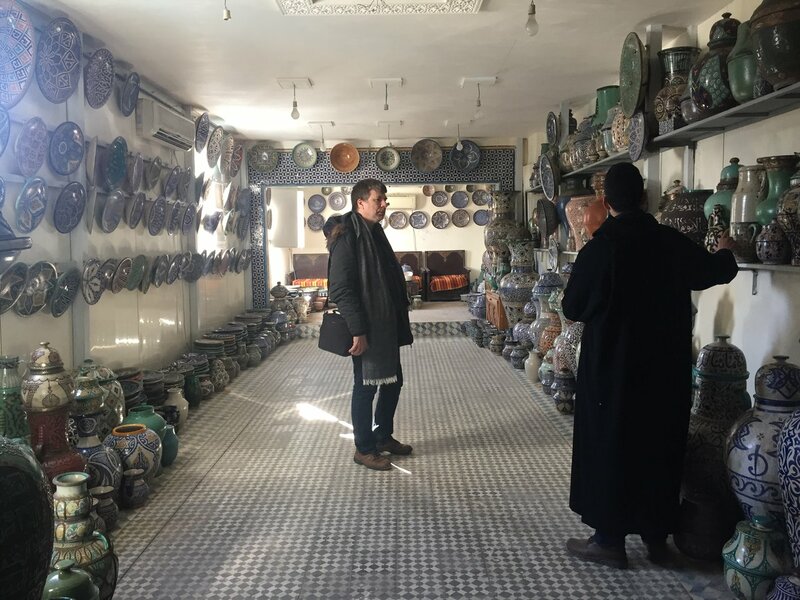 It was great to see the intricate hard work and centuries of tradition at the pottery workshop and handmade carpets. 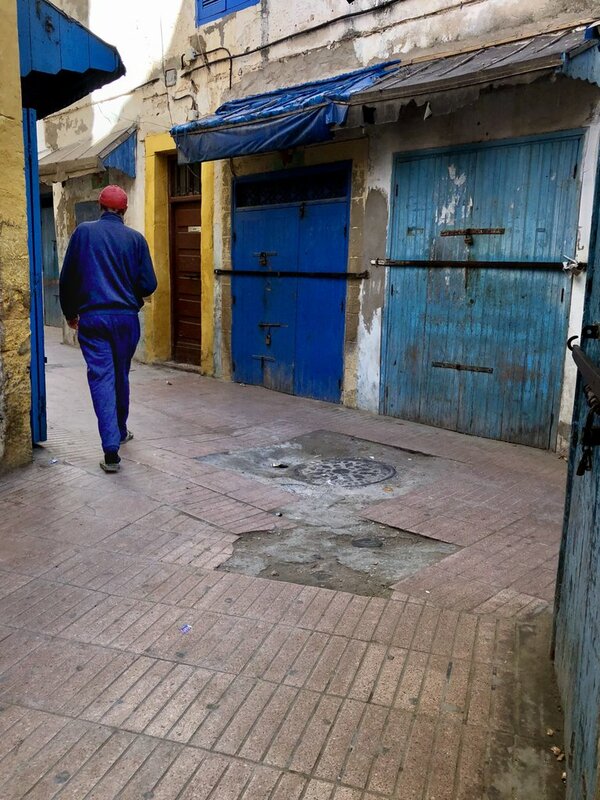 The guided tour of Fes was great, however a bit too long for me. 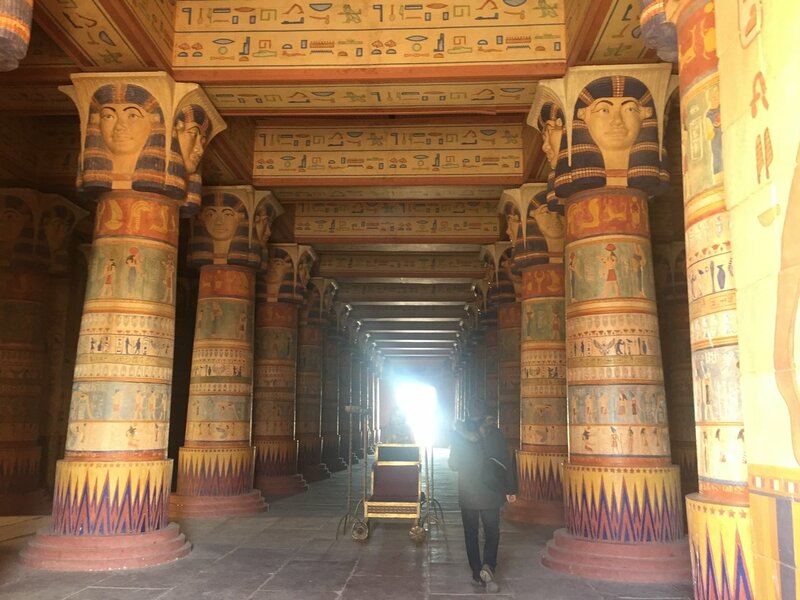 I would have preferred a half day tour, but that depends on the type of traveller you are. 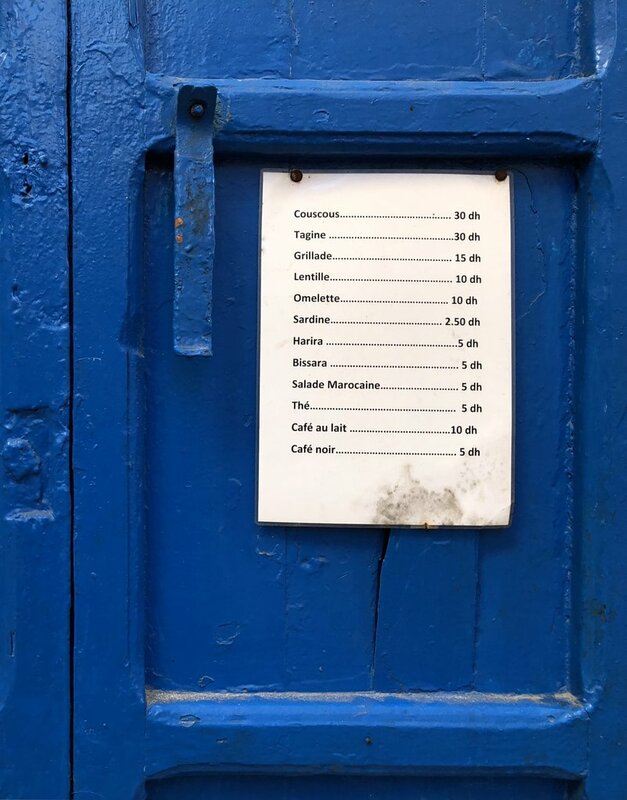 I think some people will enjoy having a guide all day and don't feel comfortable exploring on their own and prefer the guide to make restaurants recommendations or shopping recommendations for them. I personally am very independent and like to explore on my own and make my own restaurant choices, so for people like me, a half day tour would be better. 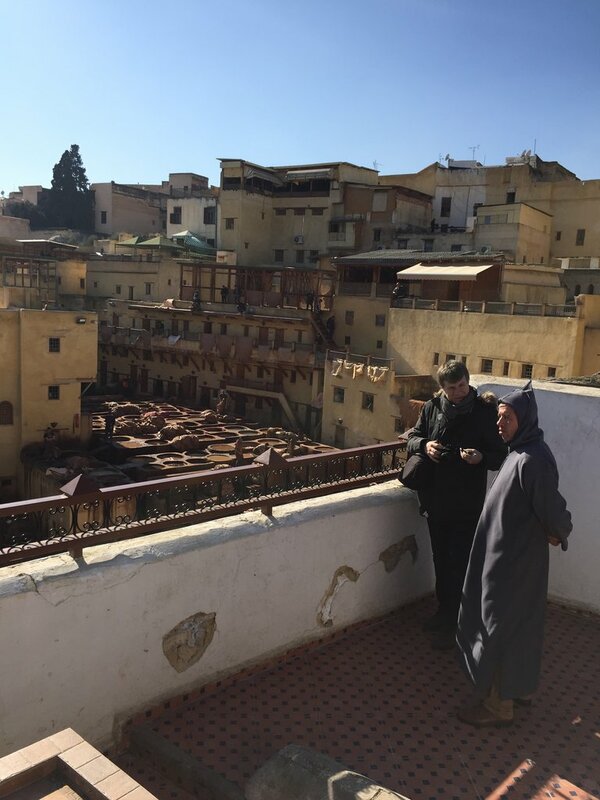 Nevertheless, the guide was excellent and we learnt a lot from him about the history of Fes. 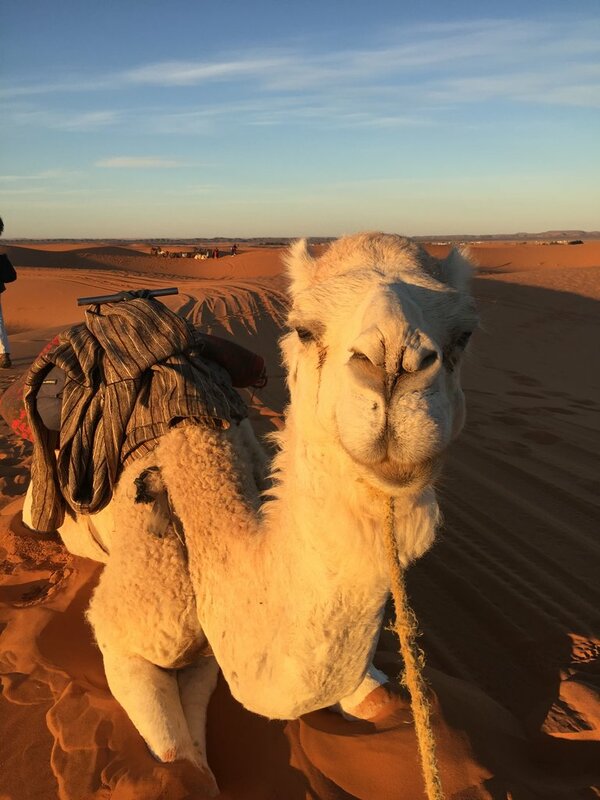 The drive to Merzouga from Fes takes about 8 hours, so if you want to do the camel ride around 5pm in order to reach the desert tented camp by sunset, you really need to leave Fes no later than 8 am and it is not practical to have too many stops. 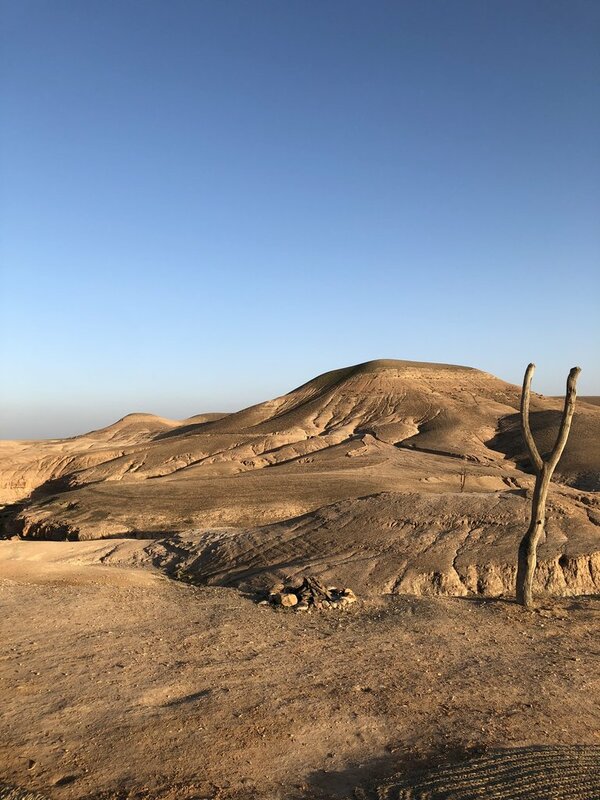 We left at 8 am and since it was only my husband and I and our driver, we told Mohammed we don't want to make many stops, we prefer to get to the desert early. 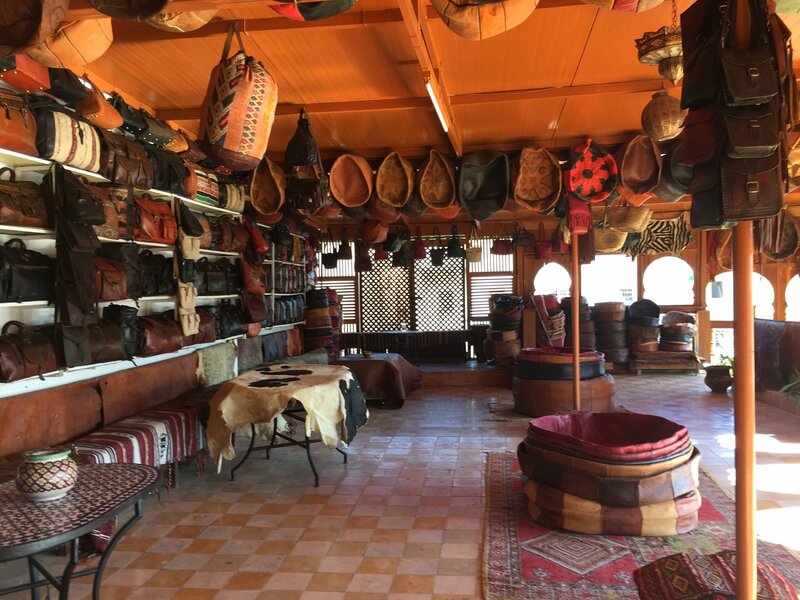 But for older travellers who may need more stops and rests, I think it may be a good idea to rather stay 2 days in the desert, first night in the desert hotel, and then do the camel ride the next day without having to rush. 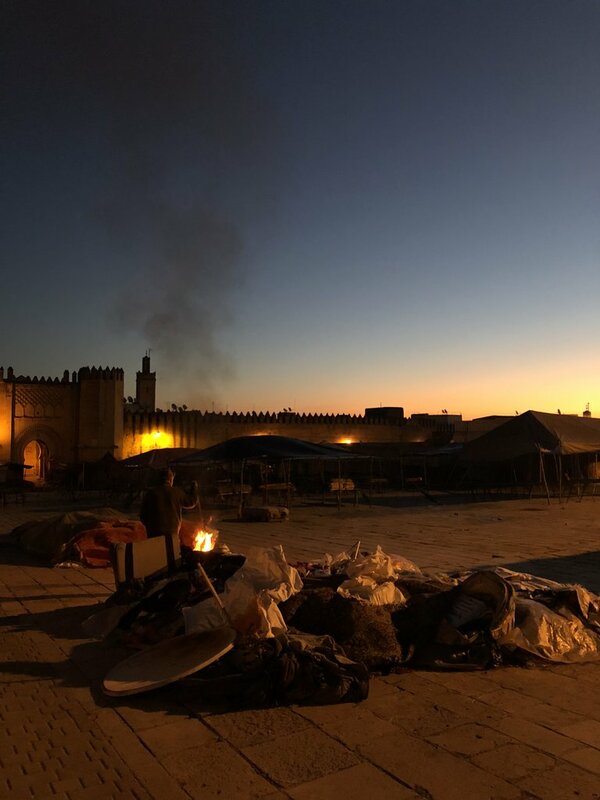 We had limited time in Morocco and only 1 night in the desert, so for us, leaving Fes early and driving without many stops worked well. That said, it is important to make a few short stops to give the driver a break. It's such a great distance to travel and the roads are not easy, I think all people doing a tour should be considerate towards the driver, as he has a massive task to drive everyone from point A to B safely and deserves to have lunch and tea breaks too. 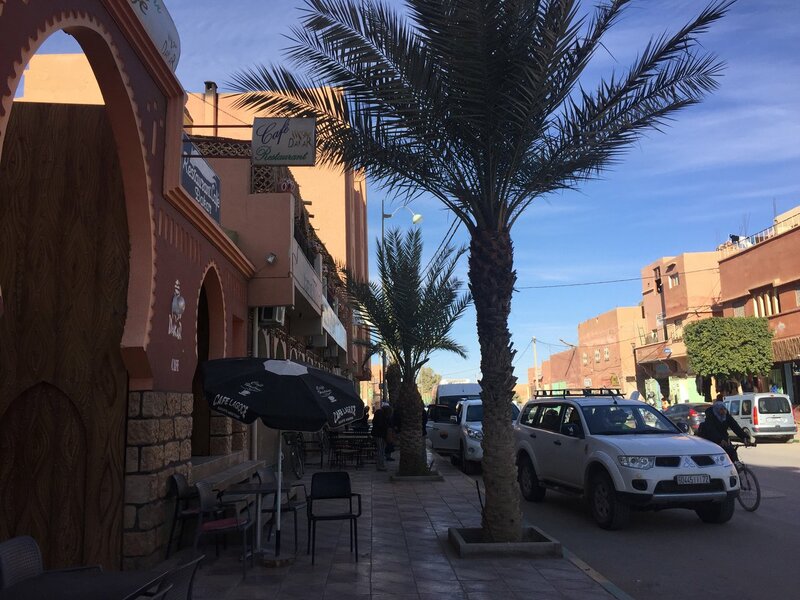 We had a late lunch in Erfoud at a cafe I would like to recommend. 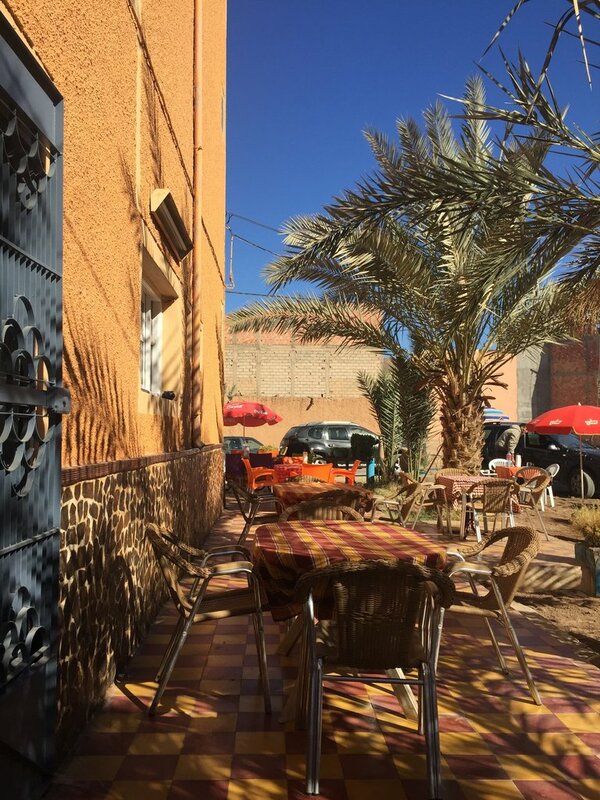 It's not that easy to know which restaurant or cafe to pick on the road in this remote part of Morocco, but we were lucky to find the Cafe Restaurant Dakar Erfoud. 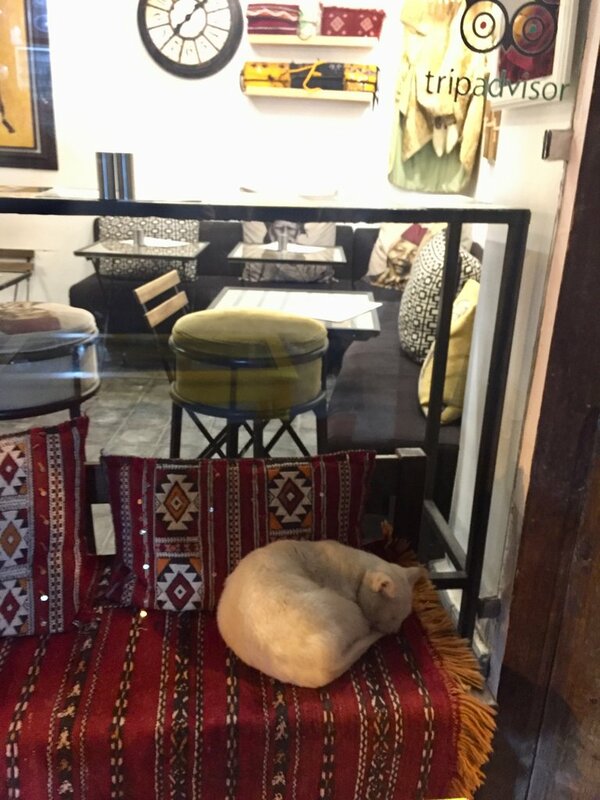 The cafe had seating outside on a terrace and inside. It was very clean and the young men who ran the cafe spoke very good French and made us feel at home. We didn't want to have a big sit down meal. Just a quick sandwich or pizza, and since they are a pizza place, they made us a Moroccan flavoured pizza from scratch and within 35 min, we were on our way to the desert. 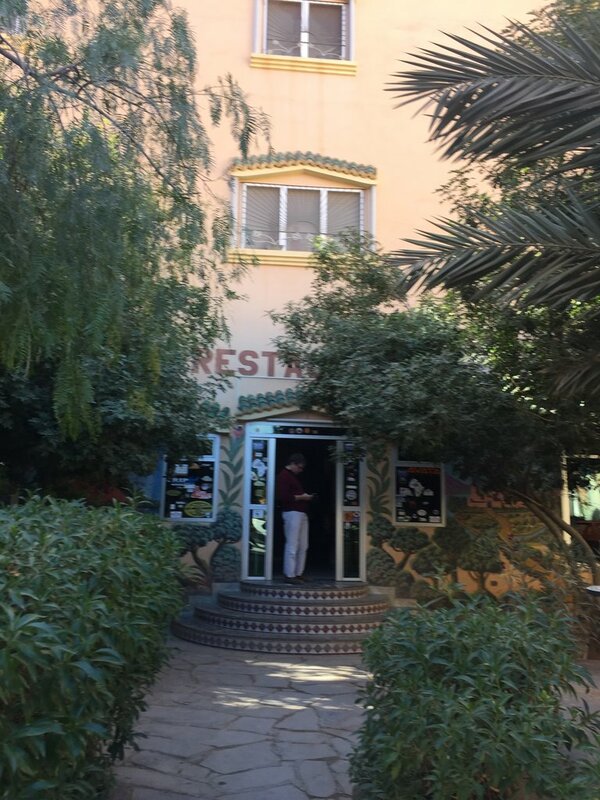 The pizza was delicious and the cafe also had wifi and even features in a French Spy novel (we found out later when we did some research about the cafe). Here is their website, have a look. 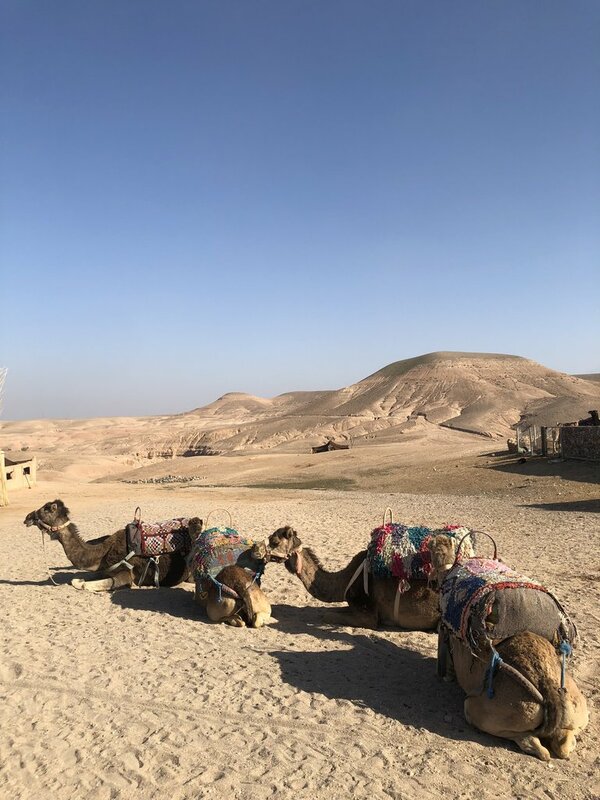 We arrived at the Hotel on the edge of the desert around 4:30pm, and reached our tented camp after a 1 and a half hour camel ride on two camels called Aslan & Anlal, lead by their master Yussuf who only spoke Arabic, Berber and a few words in Spanish! 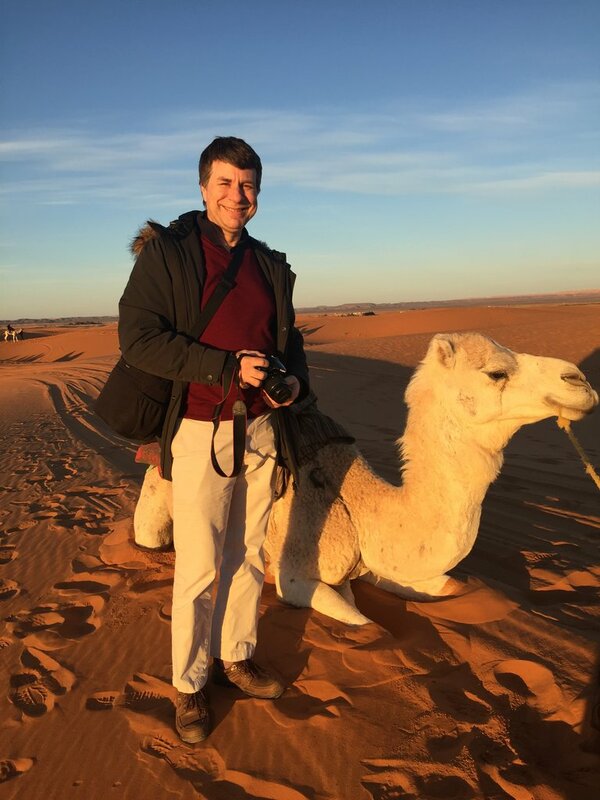 Yussuf was great, he knows the camels and the desert very well and he was very friendly and an enthusiastic photographer. 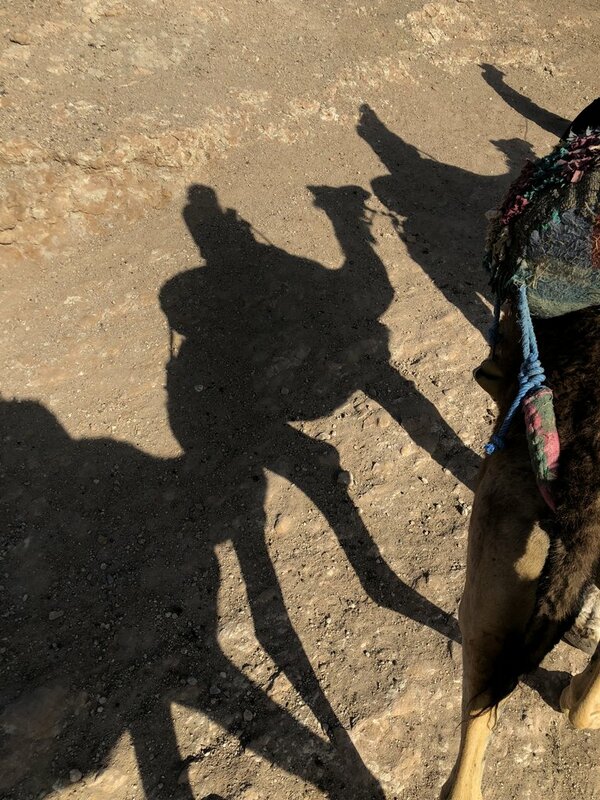 He took many photos of us on our camels. 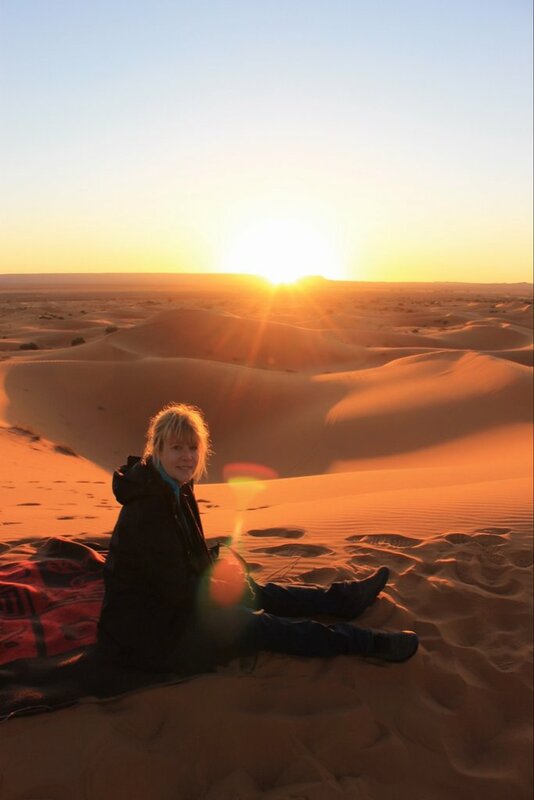 We watched the sun set over the dunes and reached the camp just after sunset. The dinner at the camp was nice, although a bit cold. 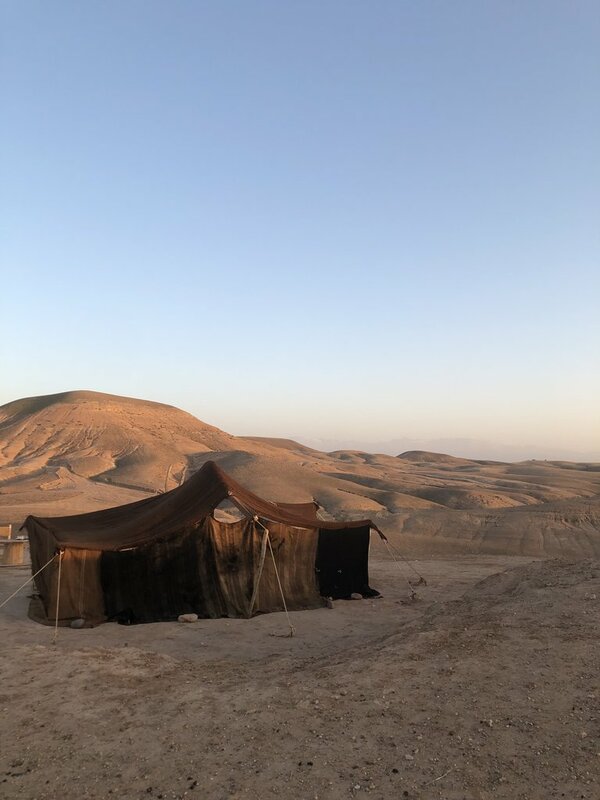 One thing I would say about doing a desert safari in winter, is be aware that it gets very cold in the desert at night. It was -1 degrees celcius. So if you travel in winter, or if you are an older traveller with health issues or not the outdoor camping type, make sure to pack enough warm clothes, the kind of clothes you would pack if you go camping on an alpine mountain hike in cold weather! 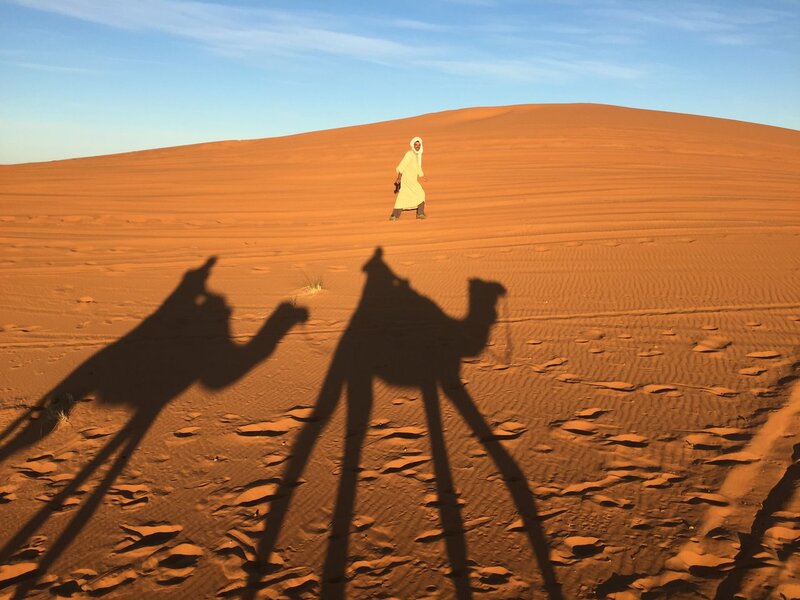 We left the desert the next morning on the same camels with Yussuf leading the way. 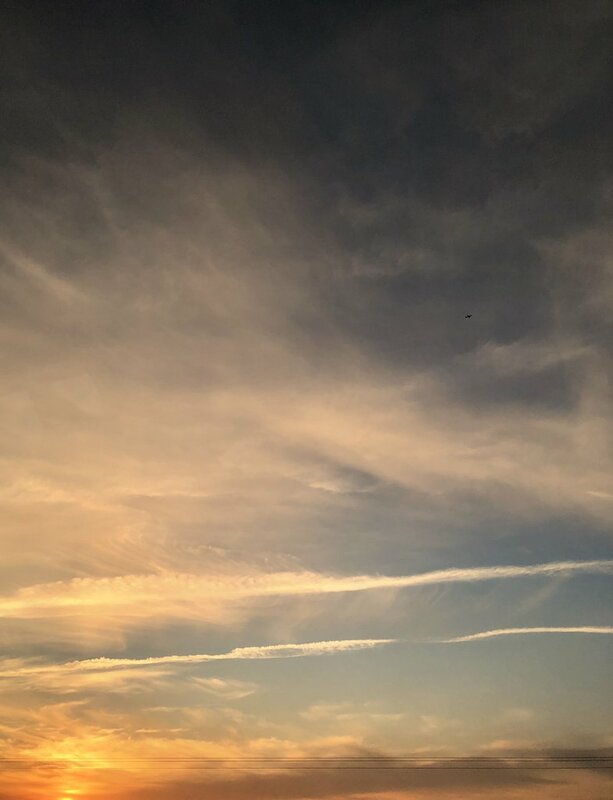 This time we saw the sunrise. 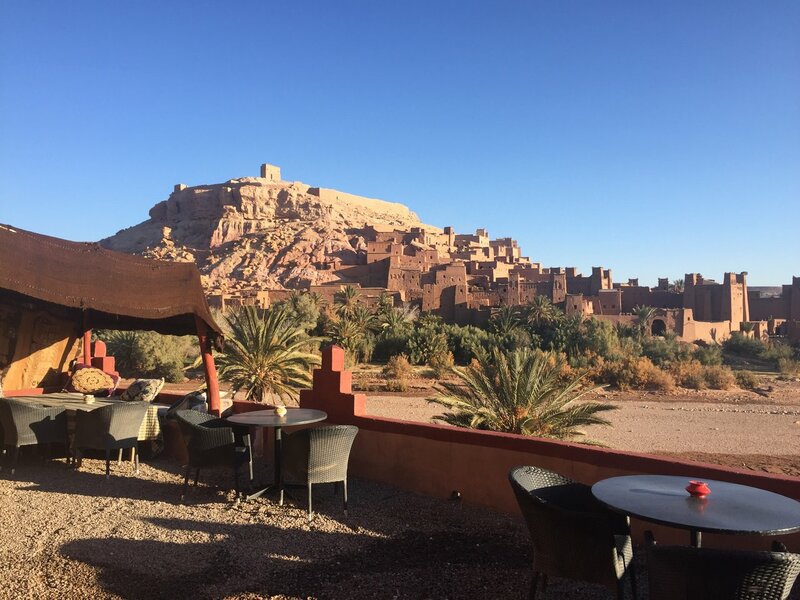 We met our driver back at the main desert hotel and started our drive to Ait Ben Haddou through many dusty little mud brick . 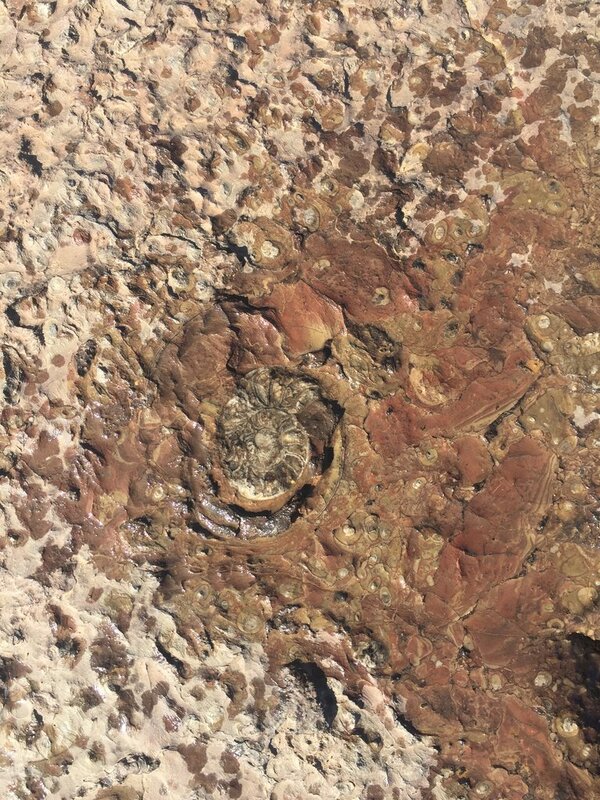 We stopped to see some fossils as well as stops in the Todra & Dades Gorges. 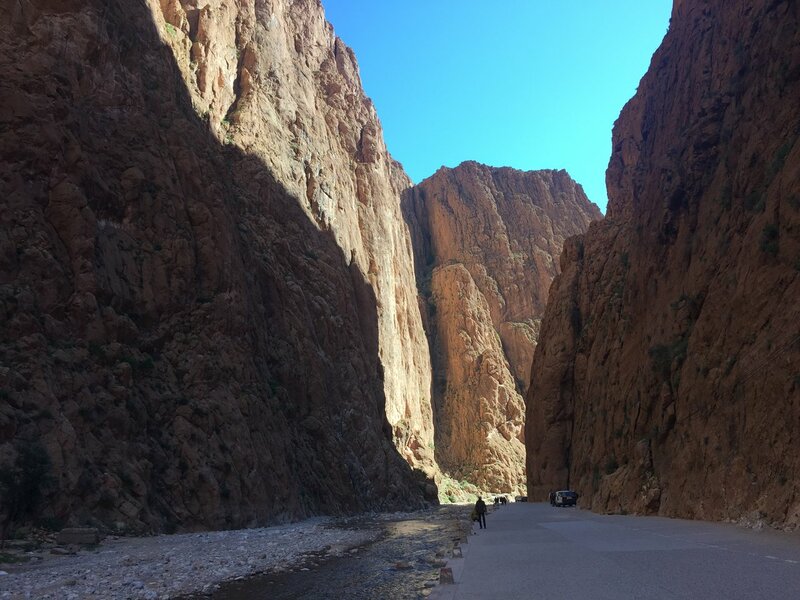 We had a great walk through the Todra Gorge, took some great photo and had lunch in a town on the edge of the Gorge, called Tinghir. 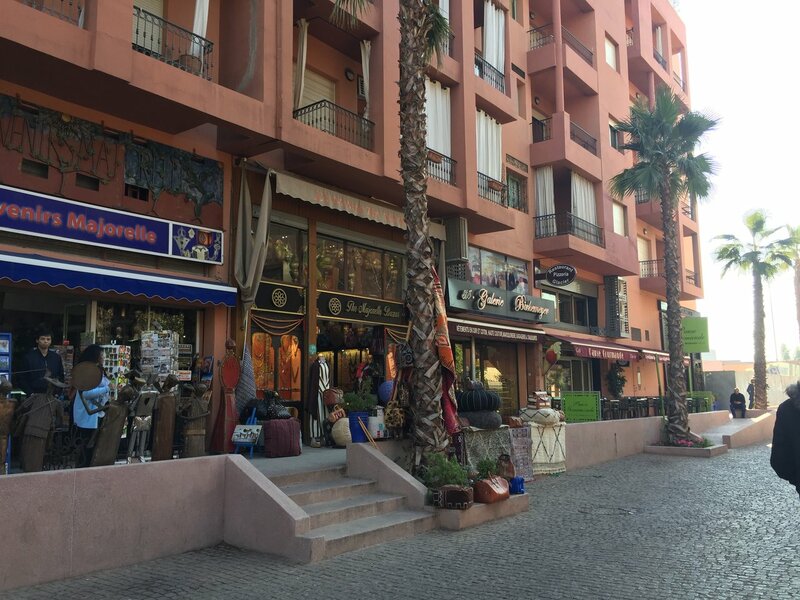 This town was really pretty and a great tourist stop with many hotels and good restaurants. 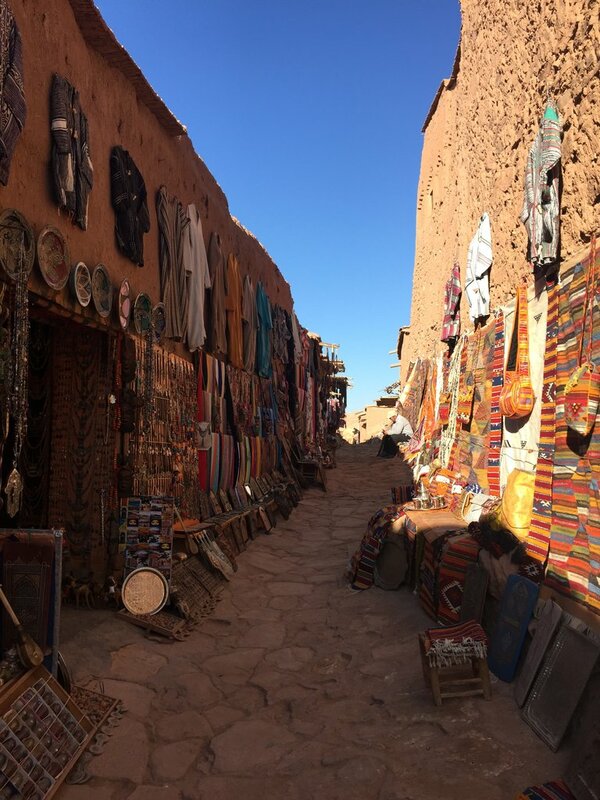 Since it is such a long drive, I would suggest especially for older travellers to stop in this town for lunch or even one night, before continuing the journey to Ouarzazate or Ait Ben Haddou as it is a very tourist friendly town, you can take beautiful pictures of the gorge and do some shopping. 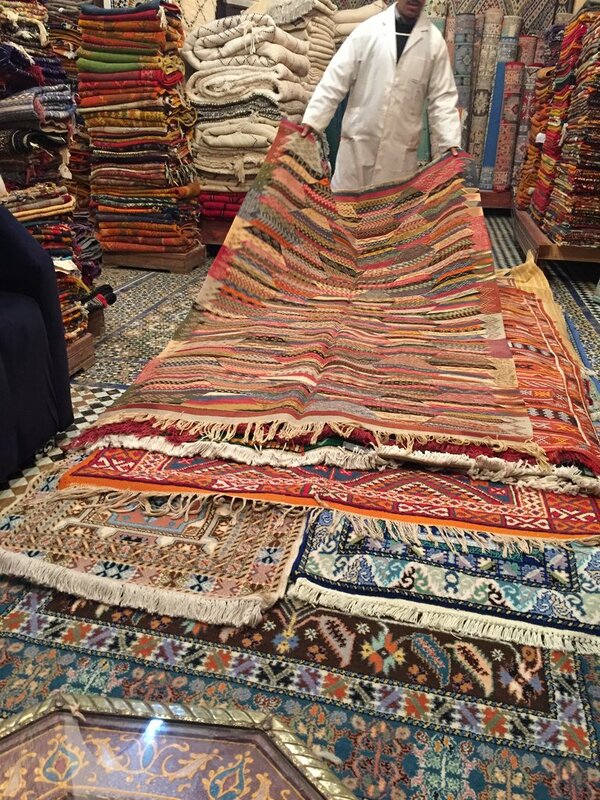 I saw some great inexpensive rugs and clothes and other souvenirs in this town, much better value that what I saw in Marrakech. We ate at a restaurant called Inass, popular with tourists. The food was good and they also have an indoor and outdoor seating area and very clean toilets. 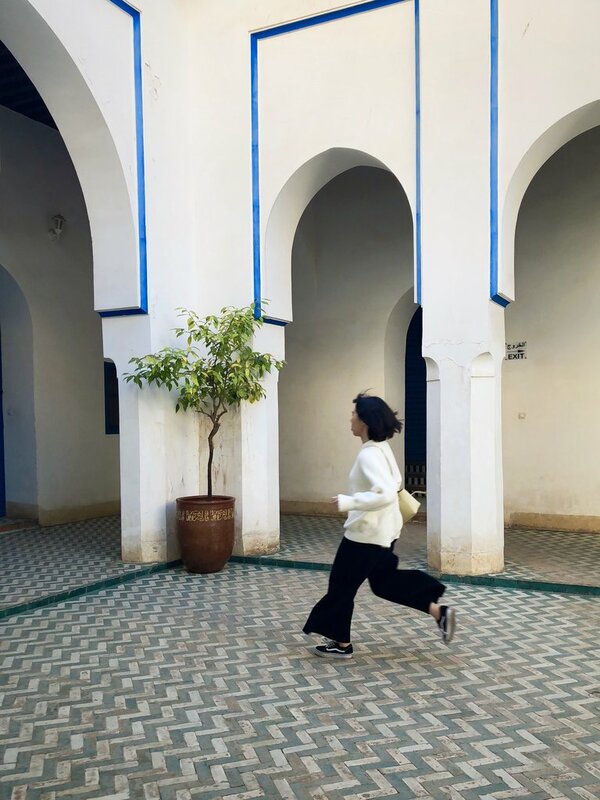 Again, run by a group of young Moroccans. 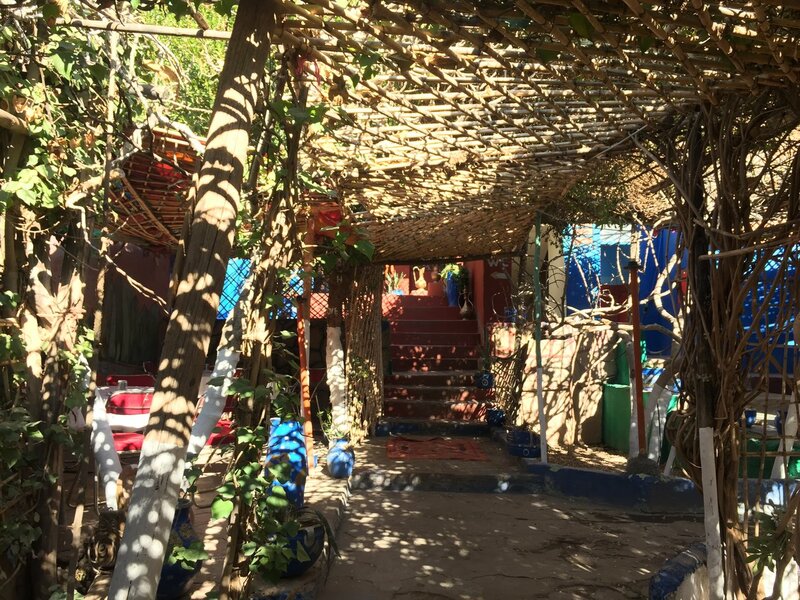 I really enjoyed seeing the young moroccans running B&B's and restaurants. They seem to know what tourists want and these guys could also speak very good English and French. 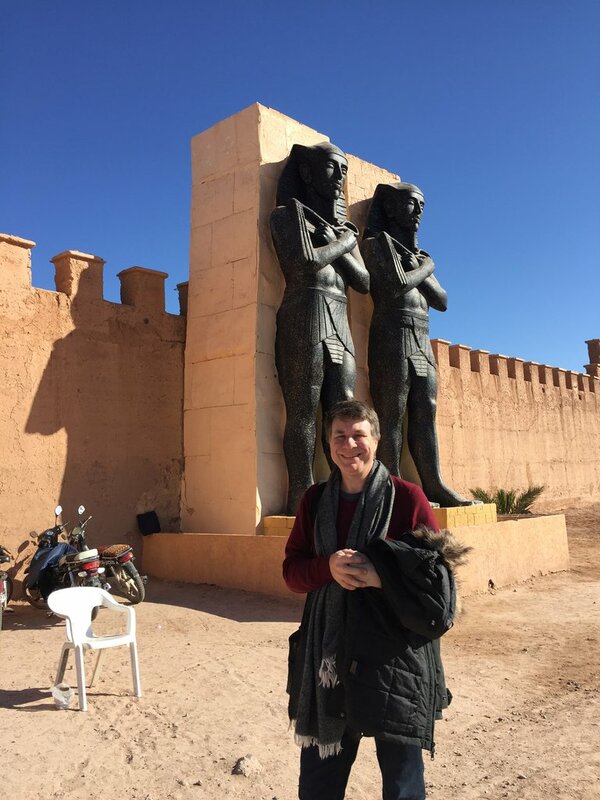 After a quick stop in Ouarzazate, the film studio town of Morocco, we arrived in Ait Ben Haddou, a UNESCO World Heritage site and a famous movie setting: Gladiator, The Mummy, Laurence of Arabia and many more were filmed here. 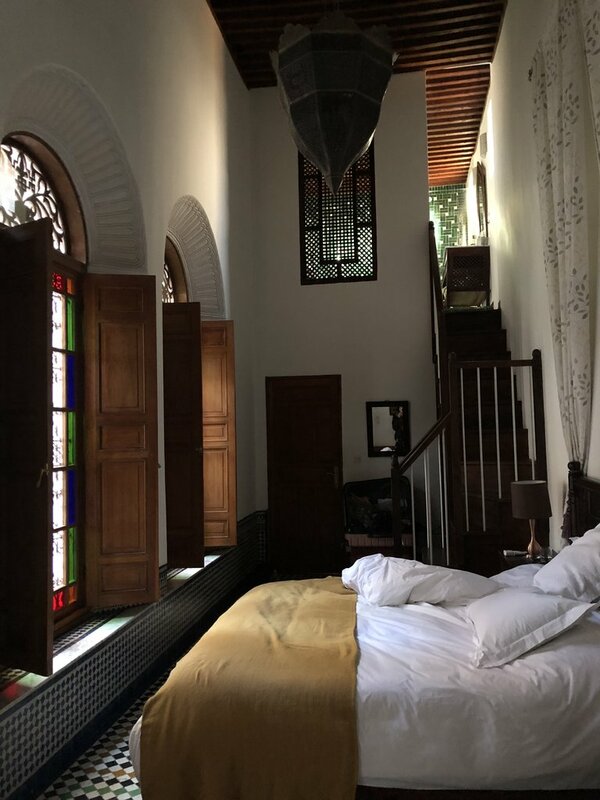 We stayed at the beautiful Riad Caravane, owned by a French artist who bought a ruined Kasbah and after 5 years of renovations and art collected from all over Africa & Asia, turned it into a 1st class small boutique hotel with very professional staff and fine dining. 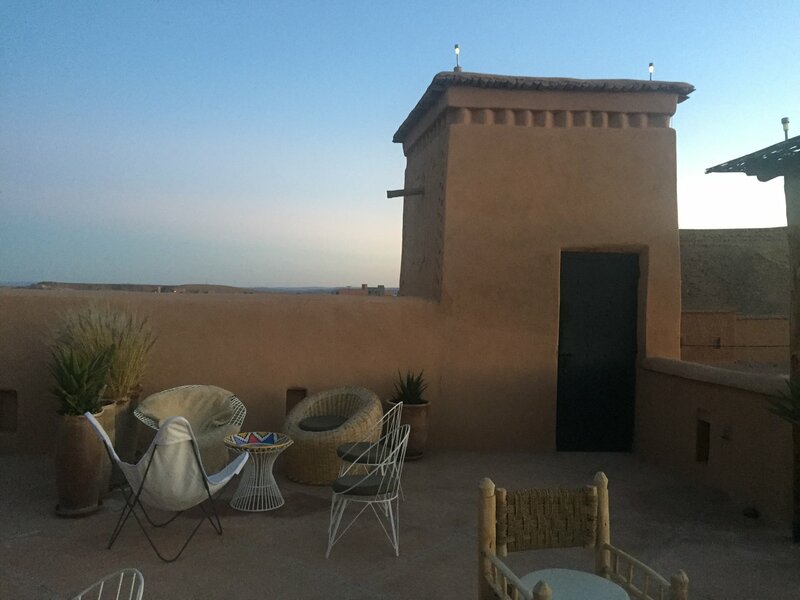 The Riad also has a rooftop and small splash pool with panoramic views over Ait Ben Haddou. 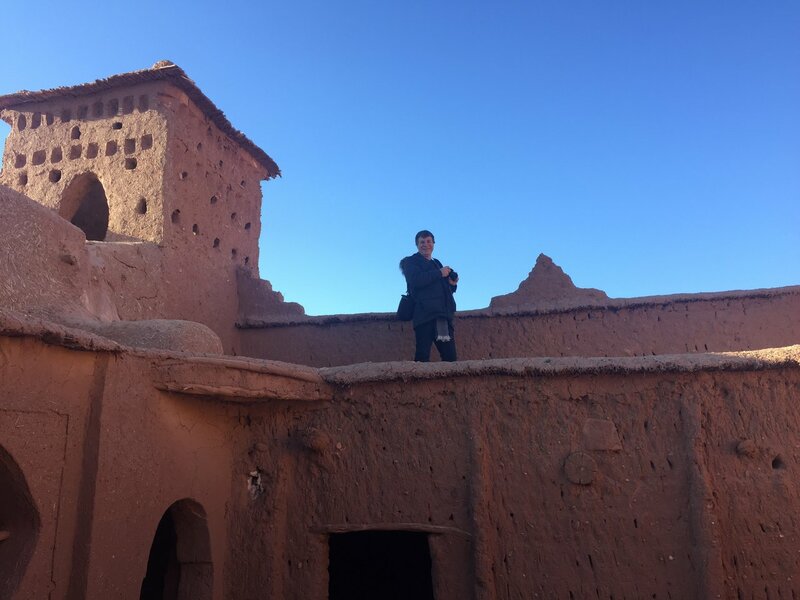 Although we only stayed 1 night in Ait Ben Haddou, I think it is a town where one could spend more time, especially after travelling such long distances. 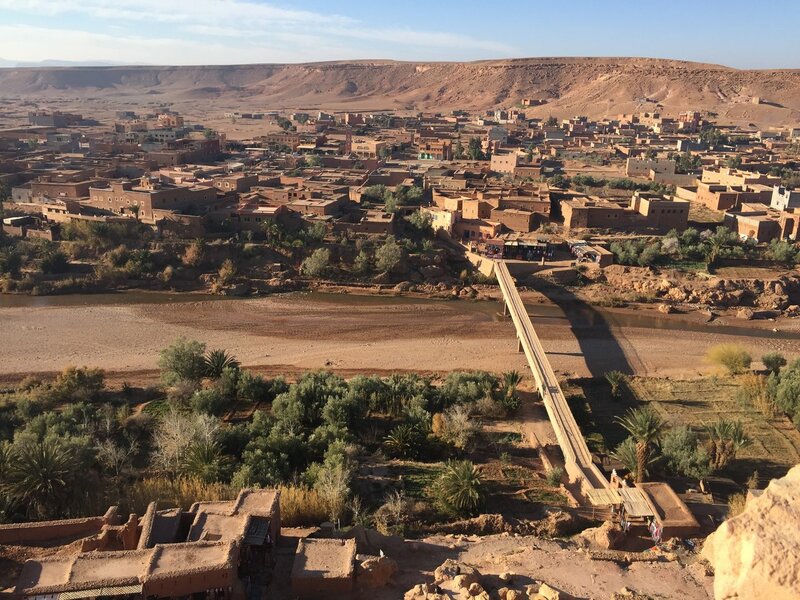 On Day 6 of our trip we left Ait Ben Haddou for Marrakech. 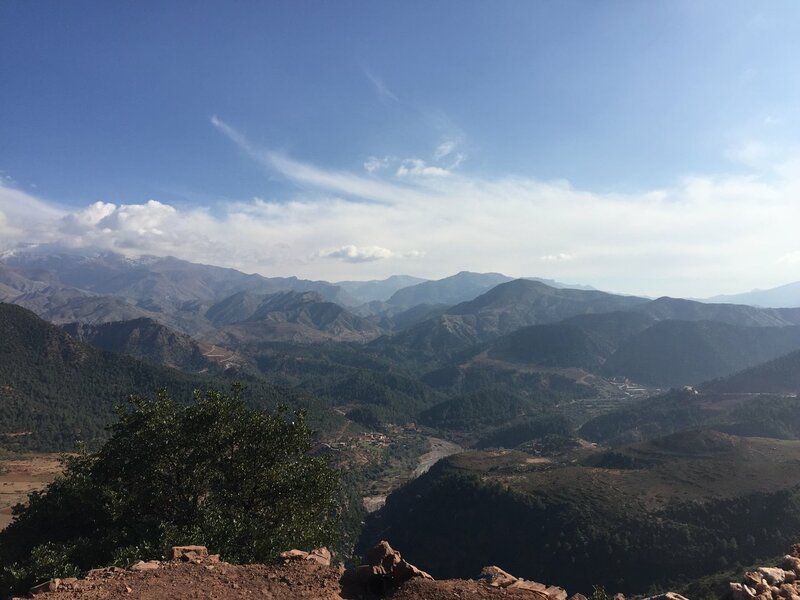 Although Marrakech is not really that far from Ouarzazate or Ait Ben Haddou, the journey takes a long time due to unfinished road works on the Atlas Mountains. 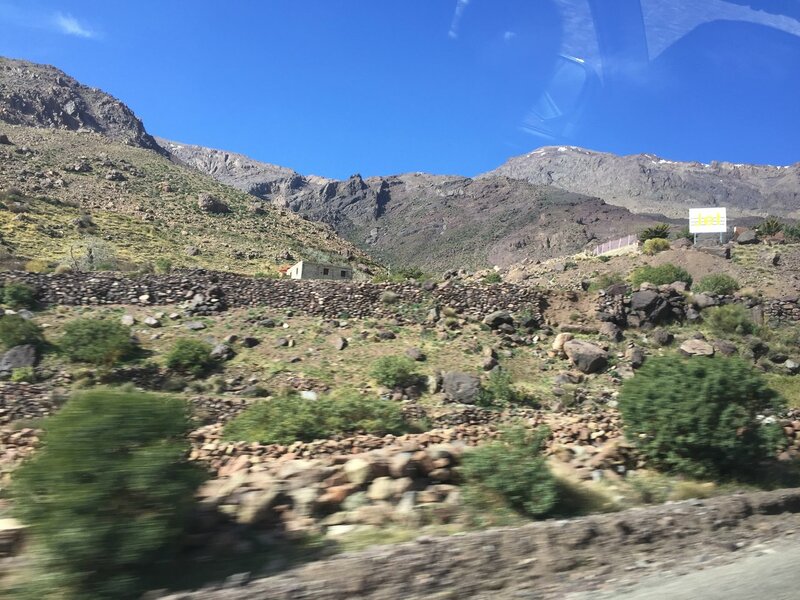 We saw some spectacular scenery driving through the Atlas mountains, but the road is quite scary and unfortunately the only way to get to Marrakech by road from the desert. 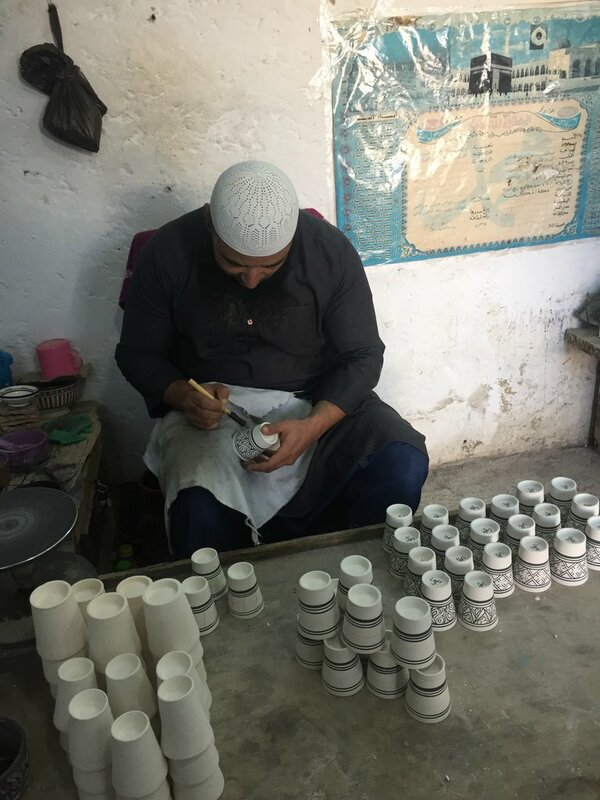 However Mohammed did an excellent job always driving slowly and very carefully. 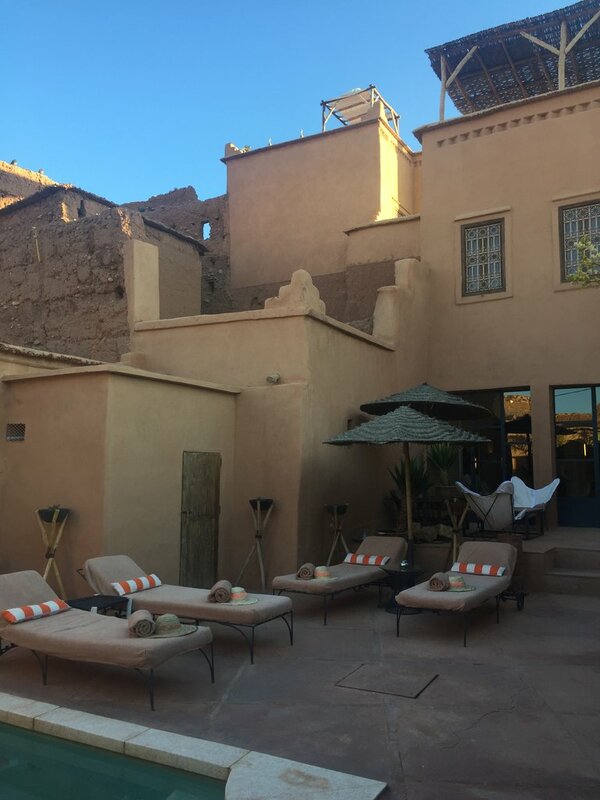 We arrived late in the afternoon in Marrakech and that is where we spent out last 2 nights in Morocco. 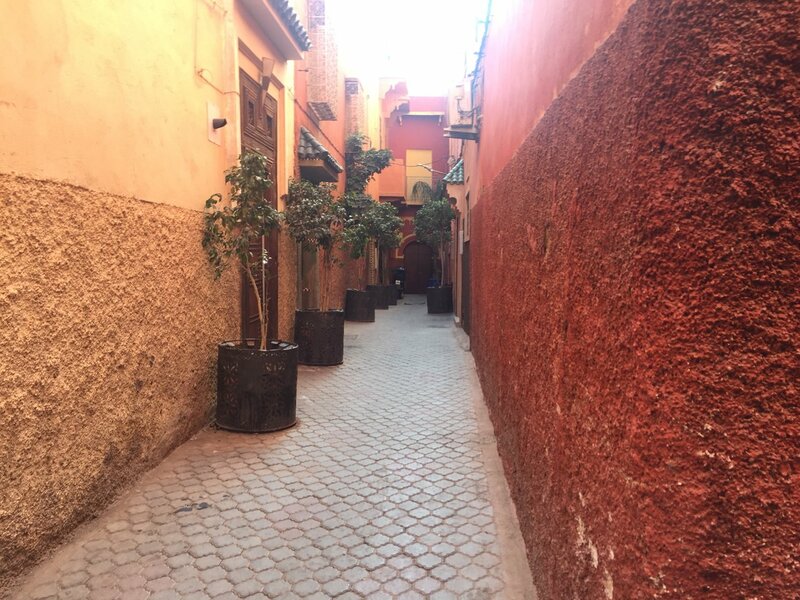 I liked Marrakech, the red (dark pink) city . 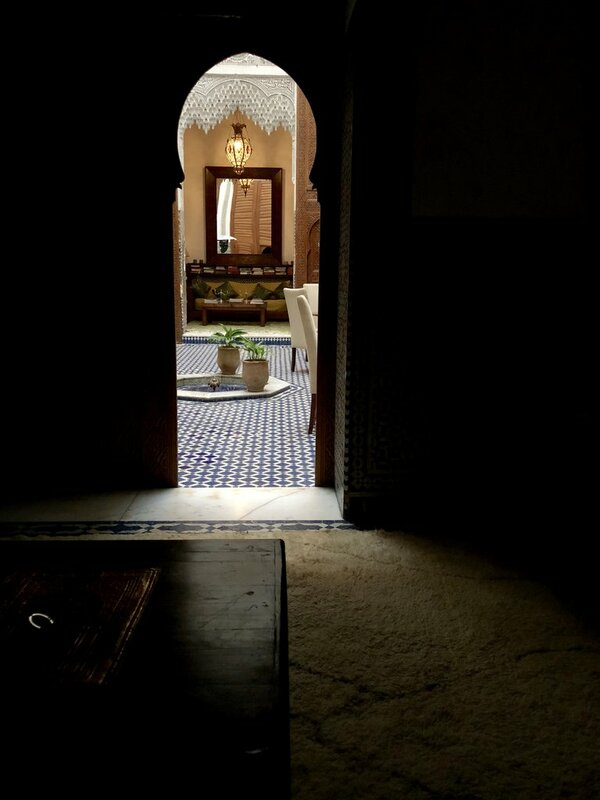 The Riad in Marrakech was nice, again very friendly helpful staff. 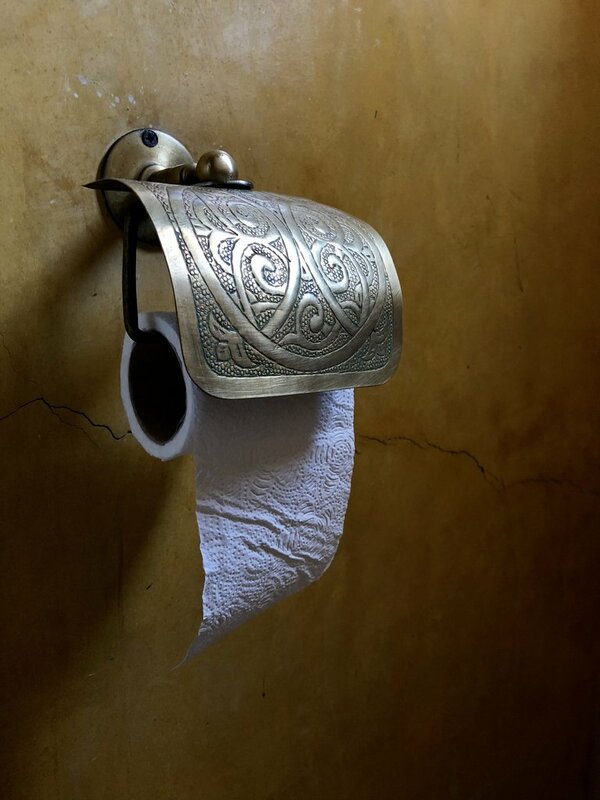 This one was very traditionally decorated and also had a spa & hamman. 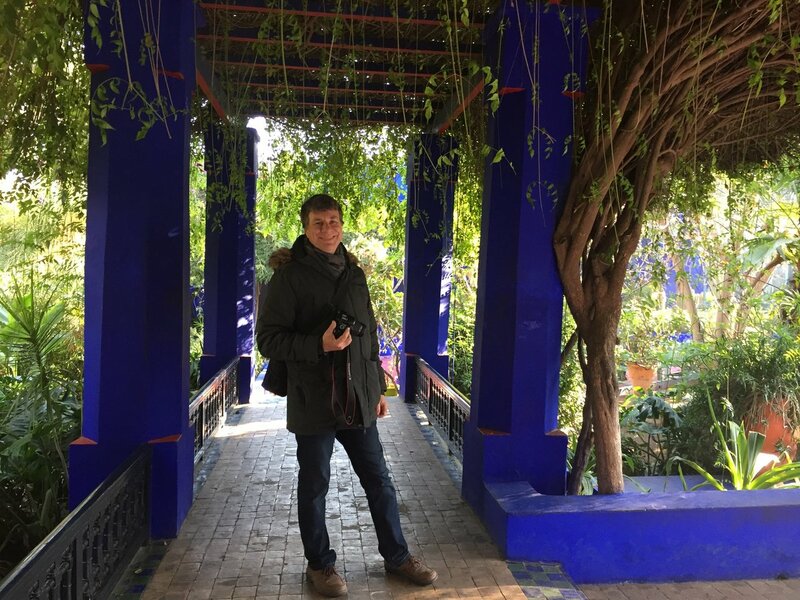 Marrakech highlights for me were the Marjorelle Gardens, Bahia Palace and Koutoubia Mosque. 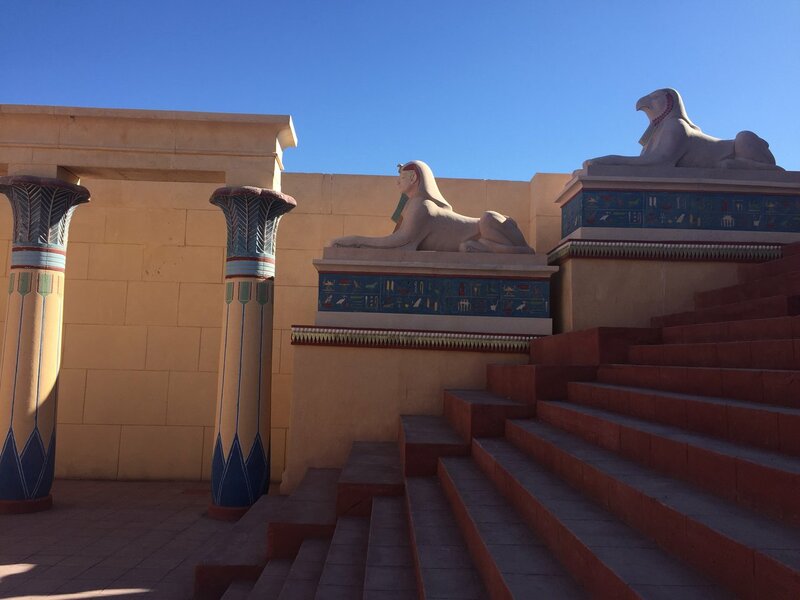 The Jemma al Fna square was interesting to see and a must see especially on a first visit, but too many people. 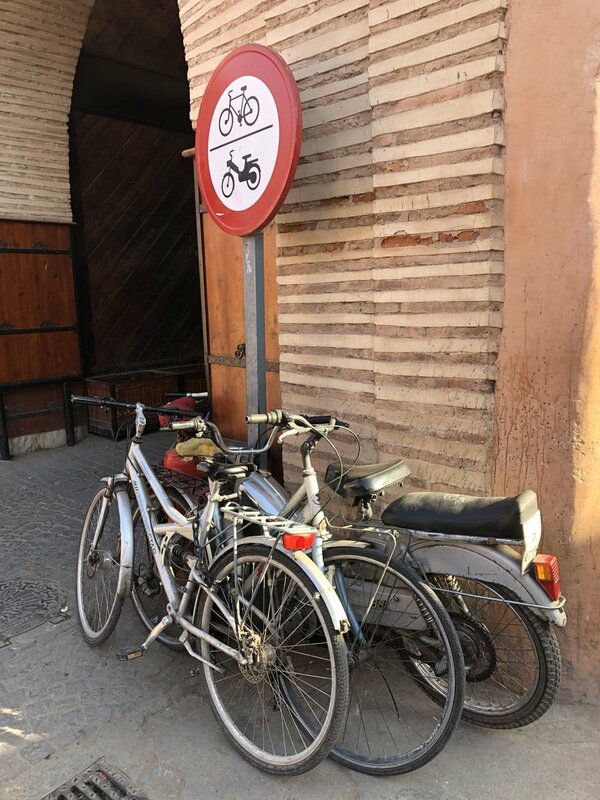 The Marrakech Medina is good for restaurants and shopping but I found it hard to walk there with vespas and motorcycles coming from all directions and also too many people for me. By this time we also did not want to buy anything else as we’ve already done all our shopping. 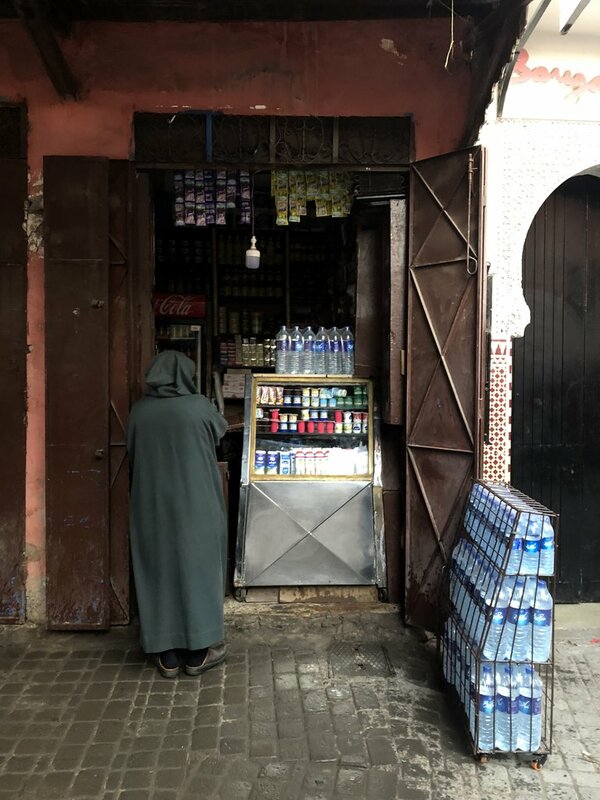 I think staying in the Medina is interesting and gives you a true feel for the place, but it is also quite exhausting to keep saying no to everyone who wants to sell you something and if you don't like crowds, like me staying outside the medina might be more peaceful. 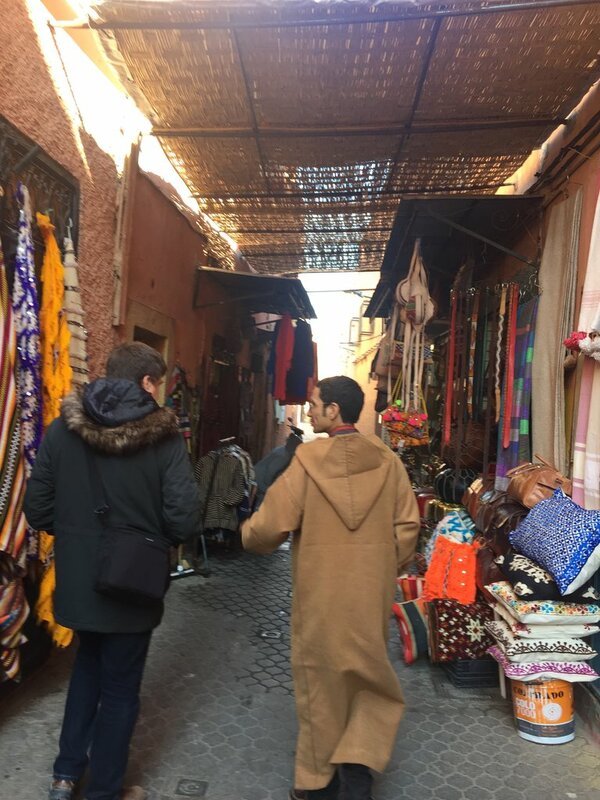 Our guide in Marrakech, Nabil was great. He has a lot of knowledge about the city and showed us some interesting places. He was also easy going and flexible, so when we were tired, we could take a break. 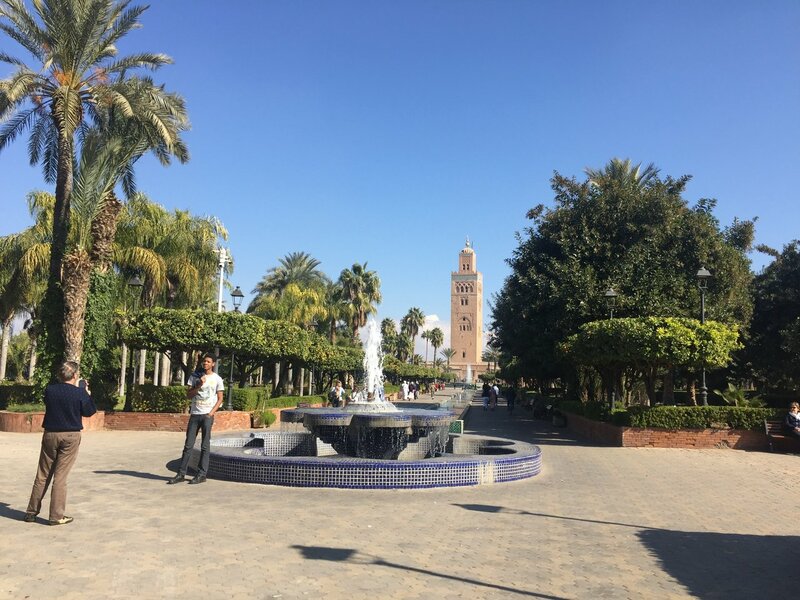 I would definitely visit Marrakech again, 2 nights and 1 and a half day was not enough to properly explore the city and I can see there is a lot more to Marrakech than the historic medina. 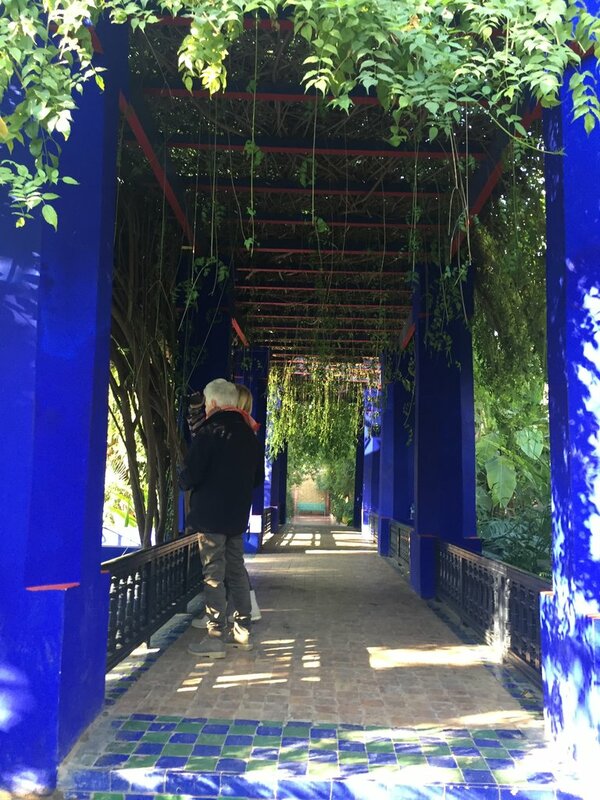 Now that I know the medina, next time I would prefer to stay in the area near the Marjorelle Gardens outside the medina, where it is a bit calmer, less motorcycles and people and more open spaces. But that is just my personal taste. 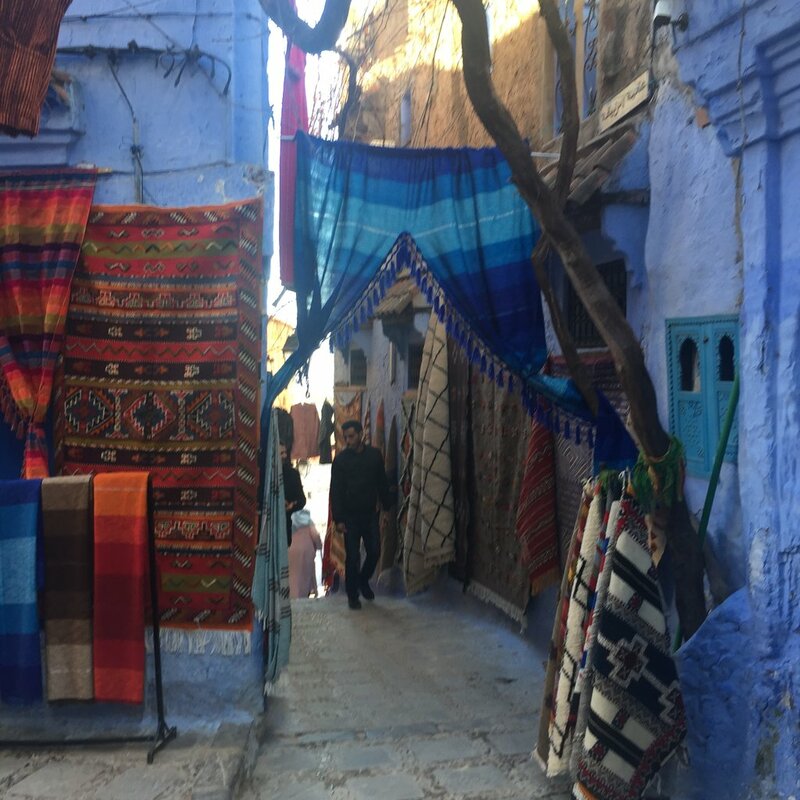 If you like staying in the buzz of everything, a road in the medina is definitely for you! 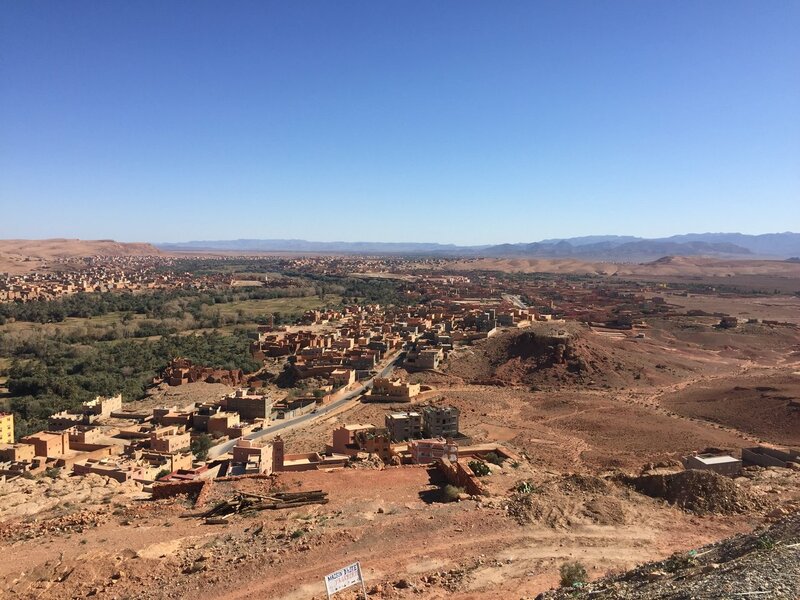 Now that I know the country a bit better, I think 7/8 days is not enough to see all the things we wanted to see and next time I would make it at least 10 days and spend more time in the smaller towns like Thingir, Ait Ben Haddou and Chefchaouen and also try to see more of the coast. 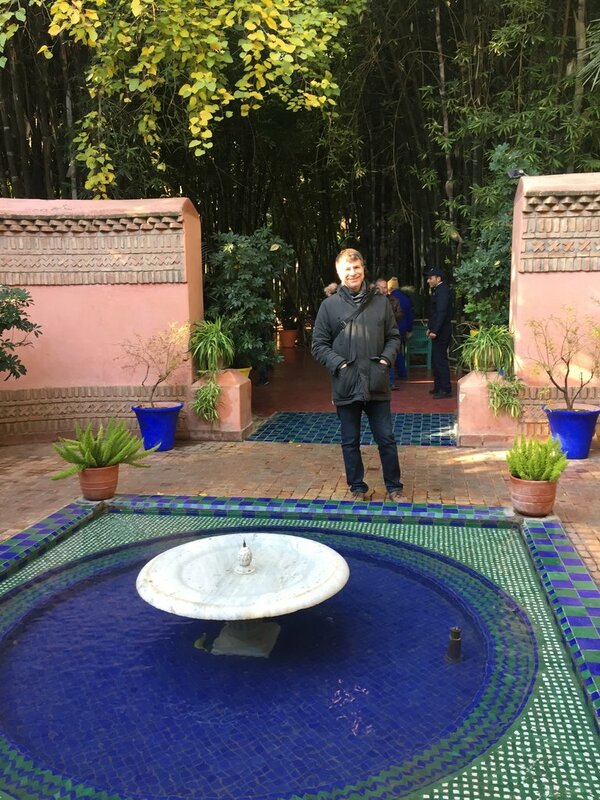 All in all it was a great first visit to Morocco and we are very grateful to Yassine and his team for this excellent introduction to Morocco. The tour was very well organised and they always took such good care of us. 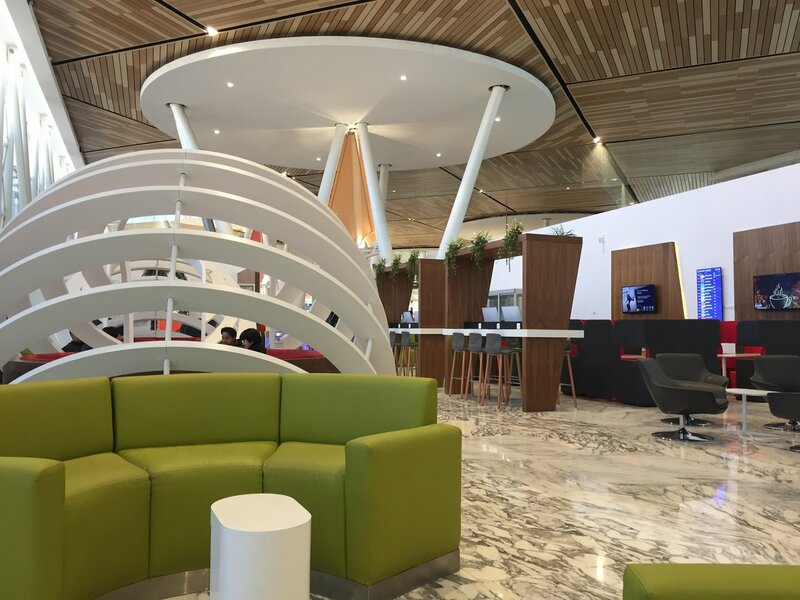 It was always easy to communicate with Yassine and his team and they were there to help 24/7! 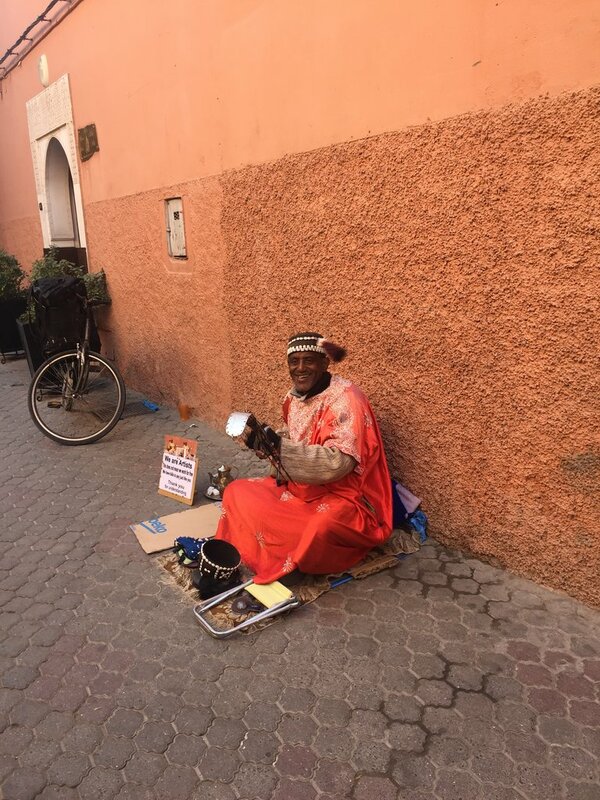 I would recommend them to anyone who would like to to visit Morocco! 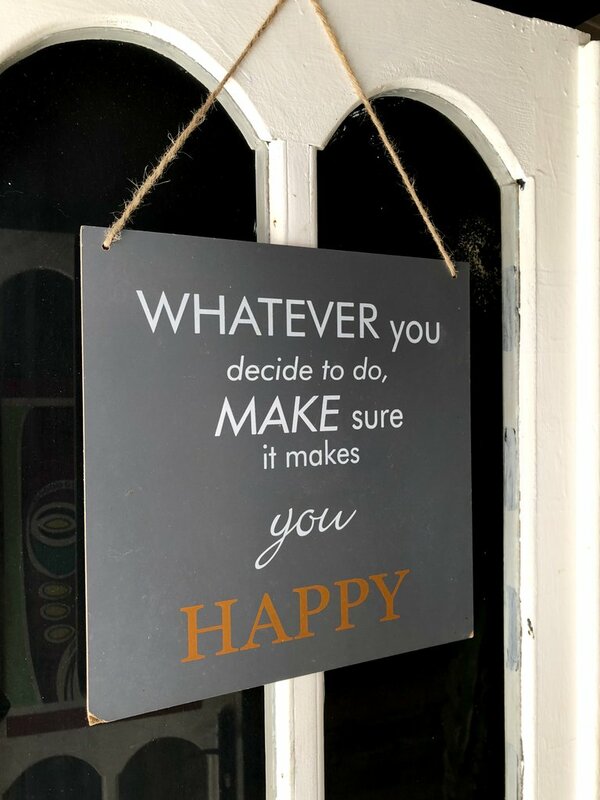 Just be clear about what you want and what you like and they can arrange it for you! 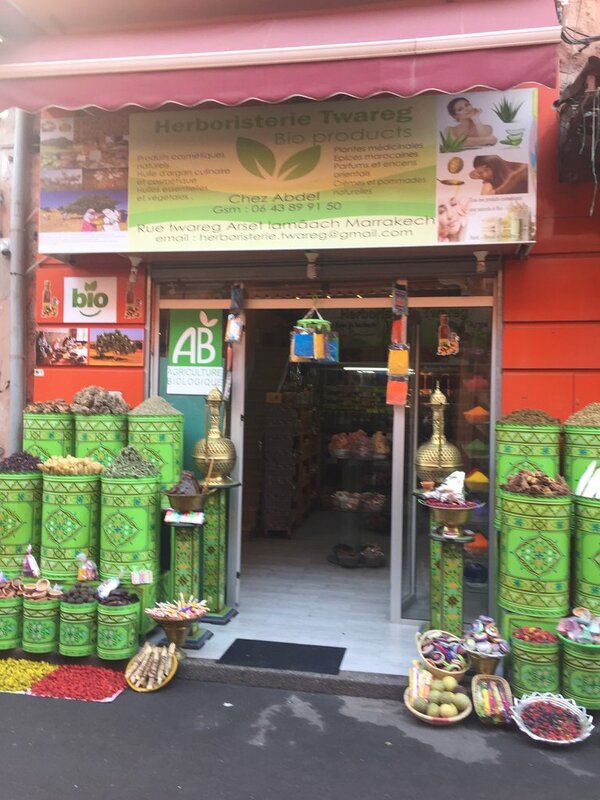 Thank you so much for your detailed review and amazing photographs! I am so happy that your trip was a success and that you enjoyed it so much. It has been wonderful having the chance to go through your photographs and seeing the places that were special to you both. 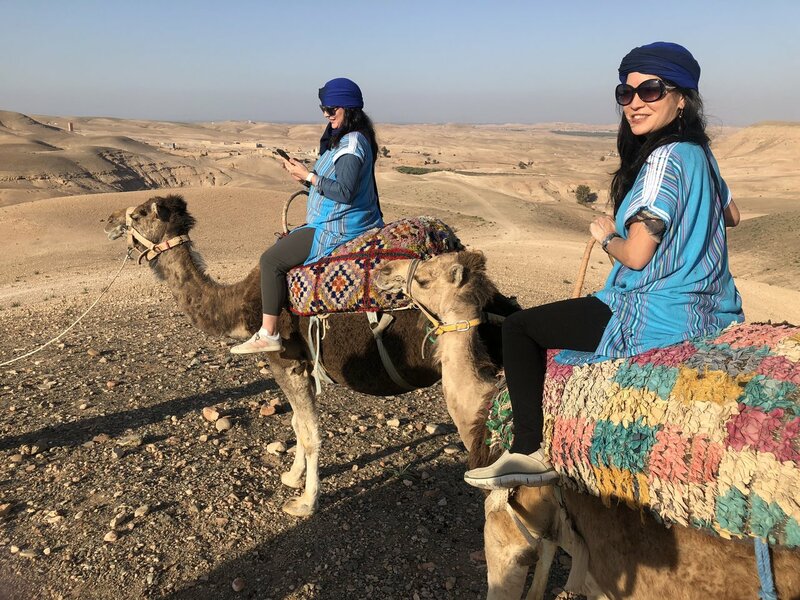 Your guides, driver and our staff all had such nice things to say about you, and all our communication during your trip was so pleasant and understanding. 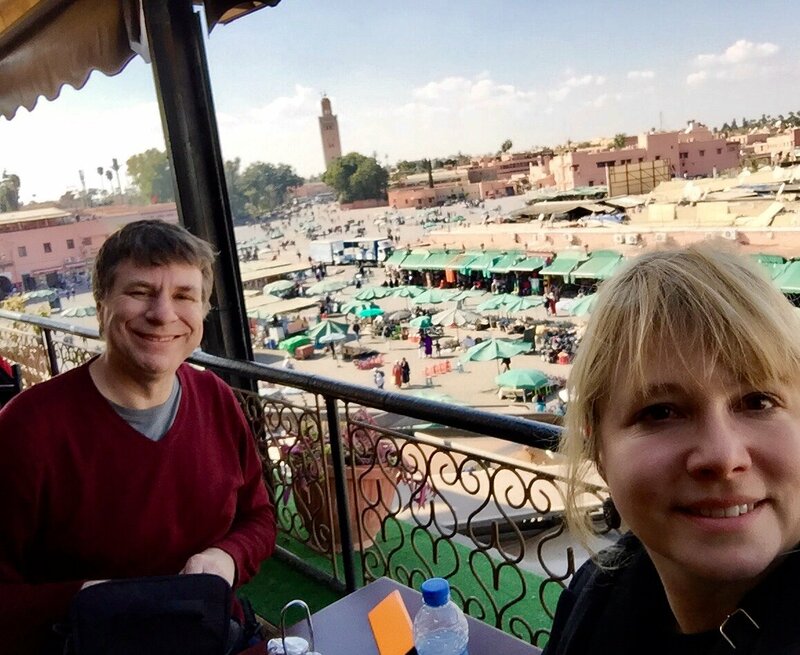 I greatly appreciate you both and have enjoyed the opportunity to plan a trip that was the perfect match for you. 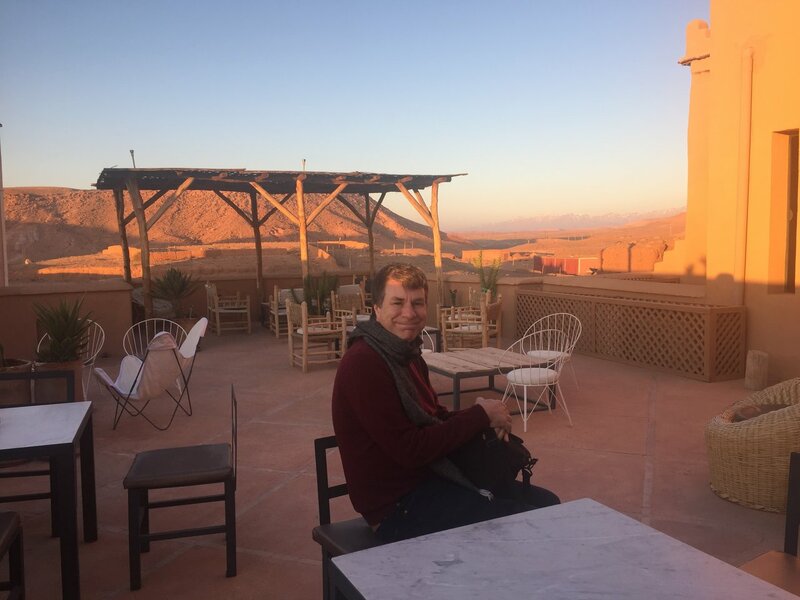 Your accounts of the destinations and what it was like to traverse between them is so helpful for me and other travelers. 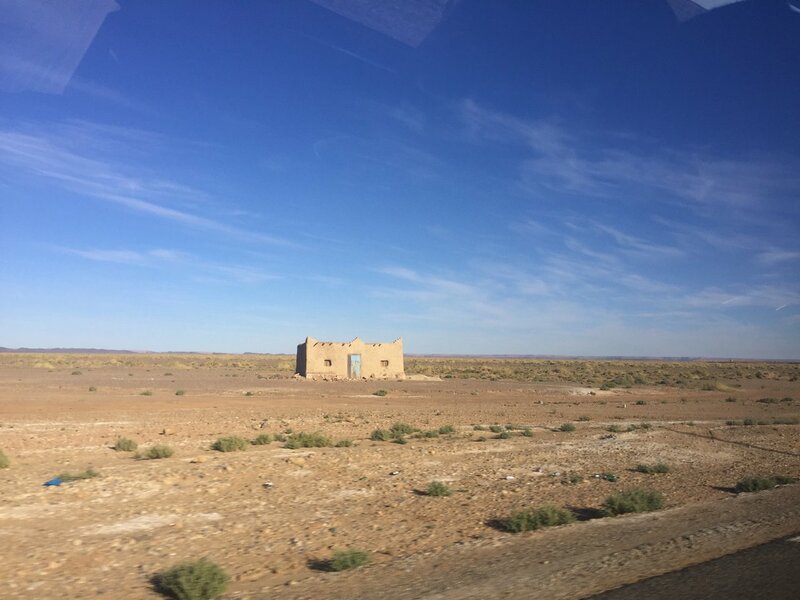 It really gives a sense of what it is like to travel across the diverse landscapes of Morocco. 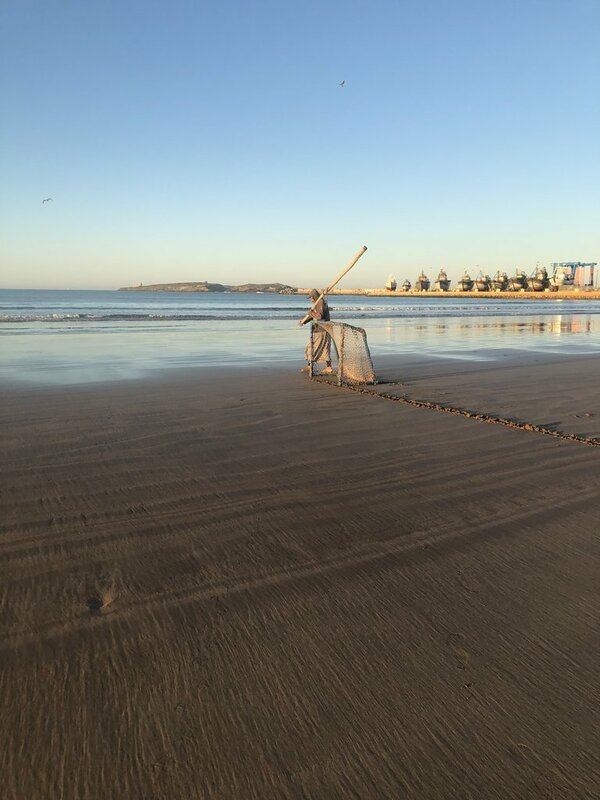 Your feedback about guides and accommodations validate the work that we put in to make sure you have the best time in the best way, and I couldn’t be happier with the results. It is information like this that encourages me to be the best I can be, and to share my home country with people around the world! 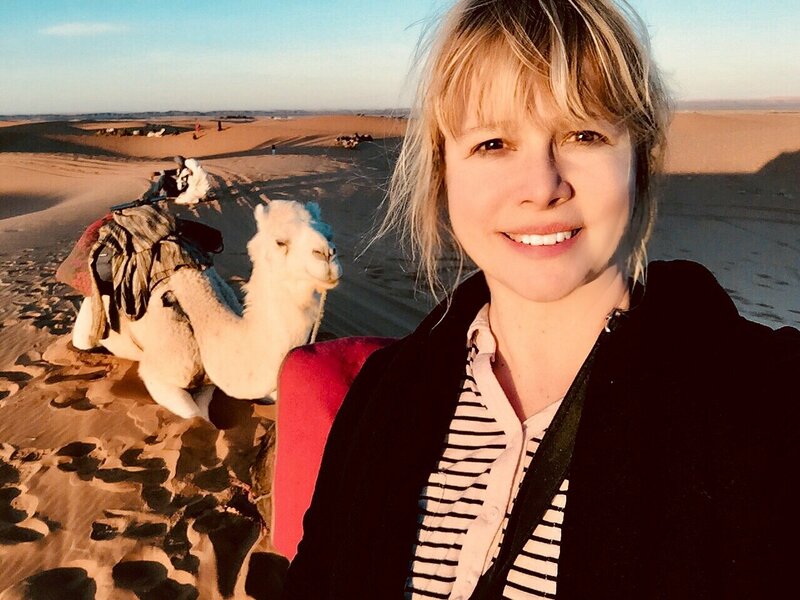 I sincerely am excited to plan your next trip to Morocco so you can spend some time exploring quieter locales and get some time on the beach! Take care and keep in touch. First we were very pleased with our trip. This is our third one arranged by your company. We went to Croatia last summer and the last winter to Portugal. I'm going to divide my comments into two categories: The first will be the positives, the second will be some weaknesses. Everyone was punctual and right there to meet us and pick us up as scheduled. Our driver, Nabil, who was with us the whole trip was exceptional. He was good humored and an exceptionally safe driver. The cooking class that you scheduled us was terrific. 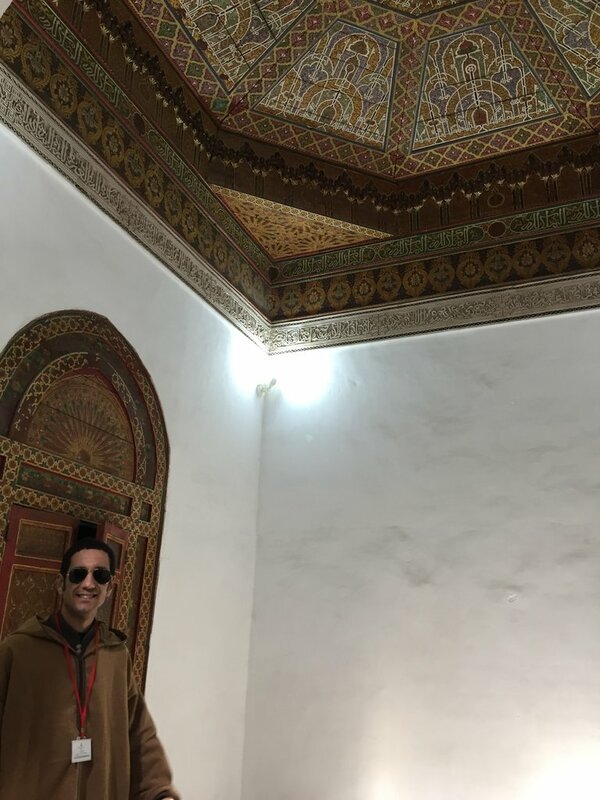 Our guide in Fez, Mohammed, was superb. 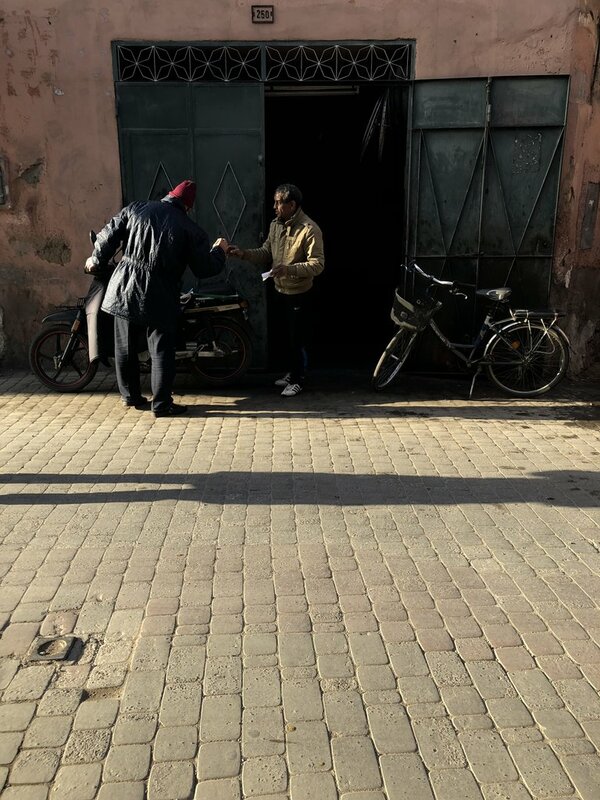 Our guide in Marrakech was very supportive and helpful, but he could have provided more information about what we were seeing. 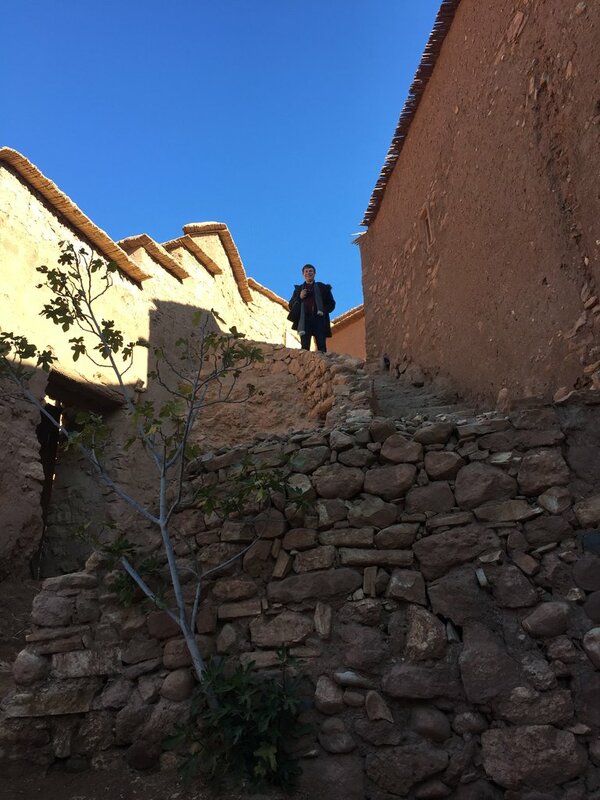 I did love that he added a trip to a Berber Village on our way to our hike. 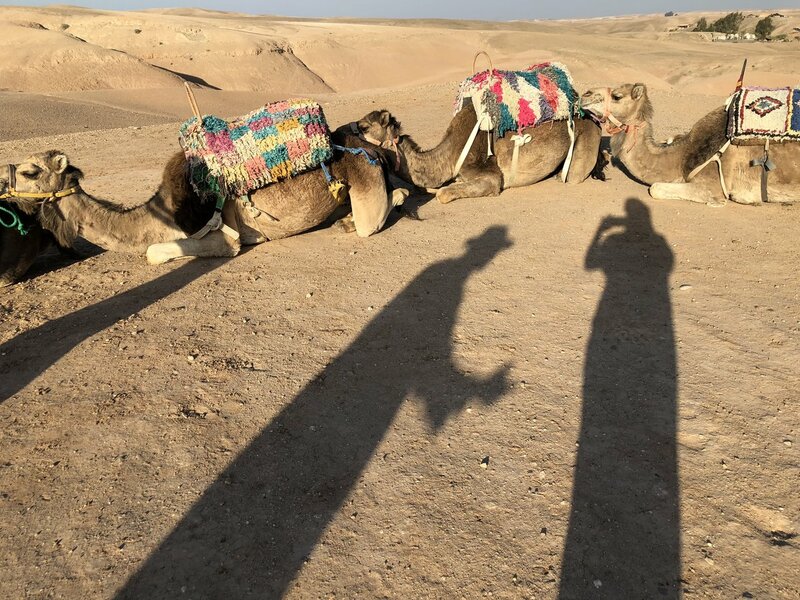 We loved going to the desert. 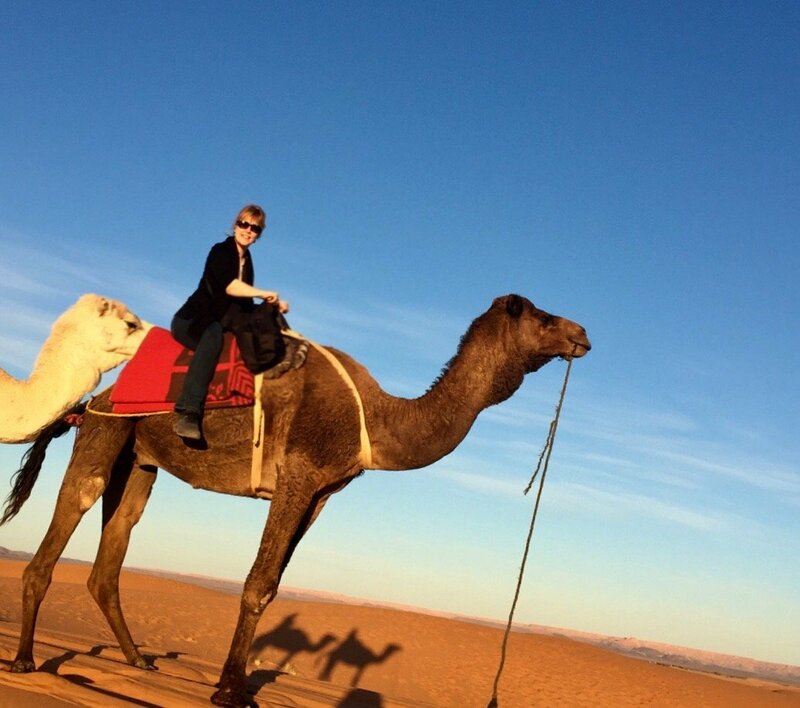 Riding a camel to the luxurious tent camp was a highlight of the trip. 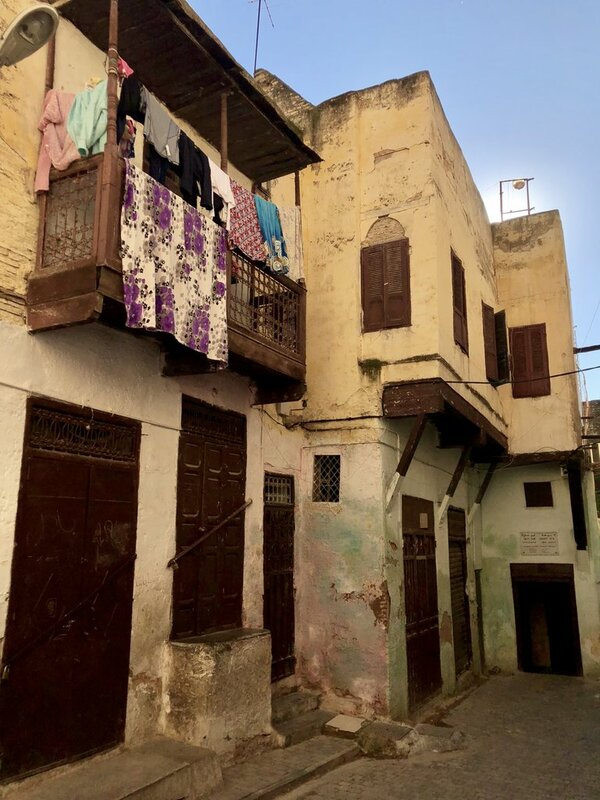 The first night's accommodations in Fes were outstanding. 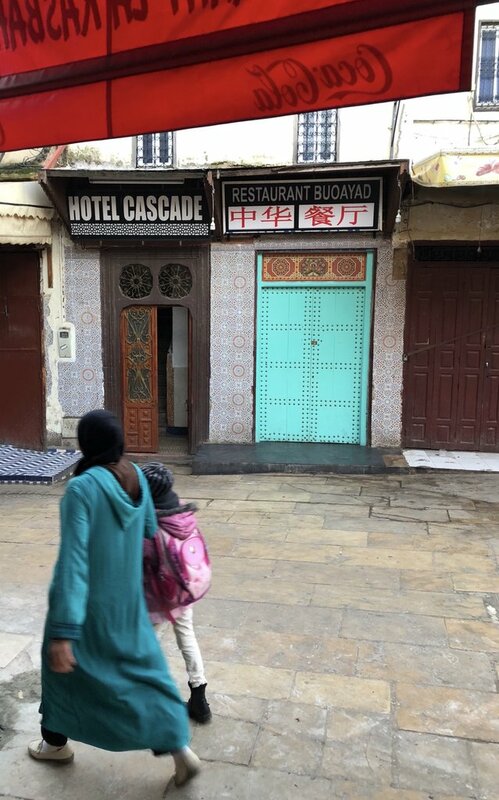 The other riads were less pleasing due to the fact that we had signed up for four star accommodations. 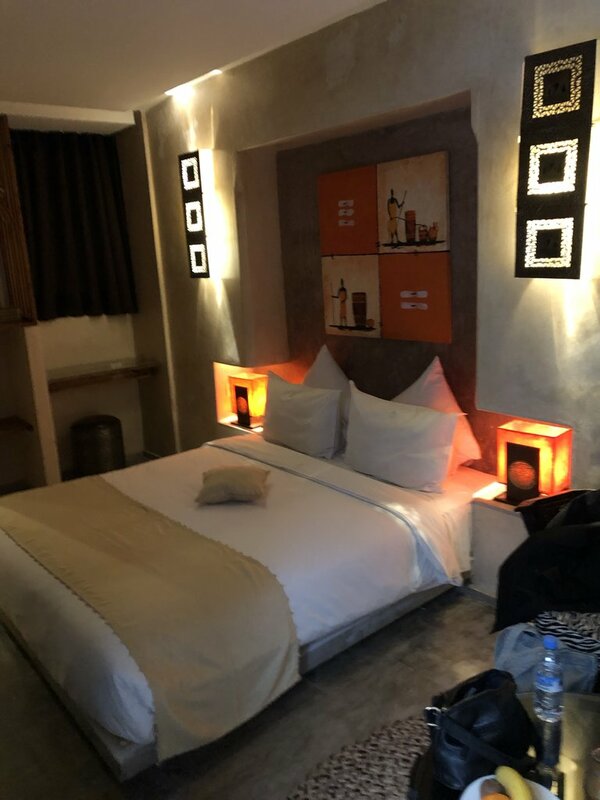 Since we one triple and one double room, we found them to be the same size with an extra bed thrown into the double which made it very tight. 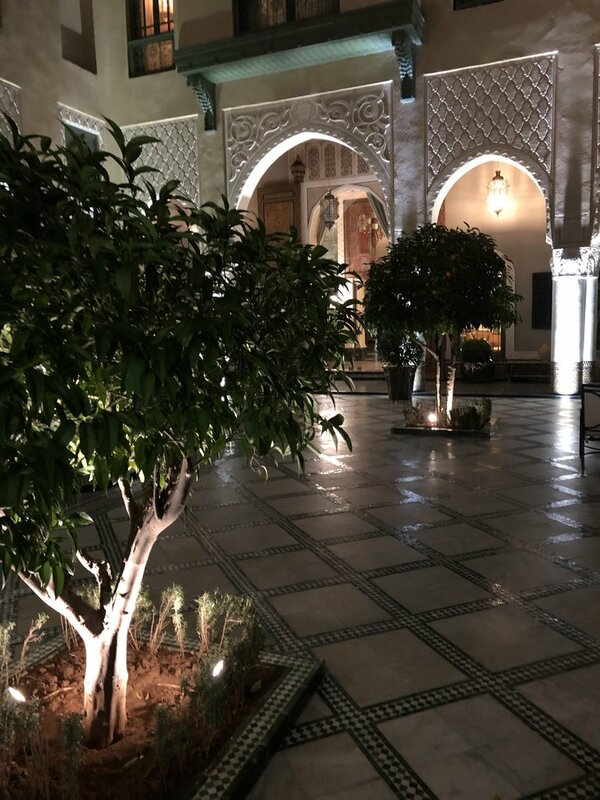 My understanding was that the Riads that we were booking would be giving us nicer than standard rooms when I questioned the travel agent about some of the very cheap prices which I saw online for the accommodations. It would have been good to have received more information on the driving distances. 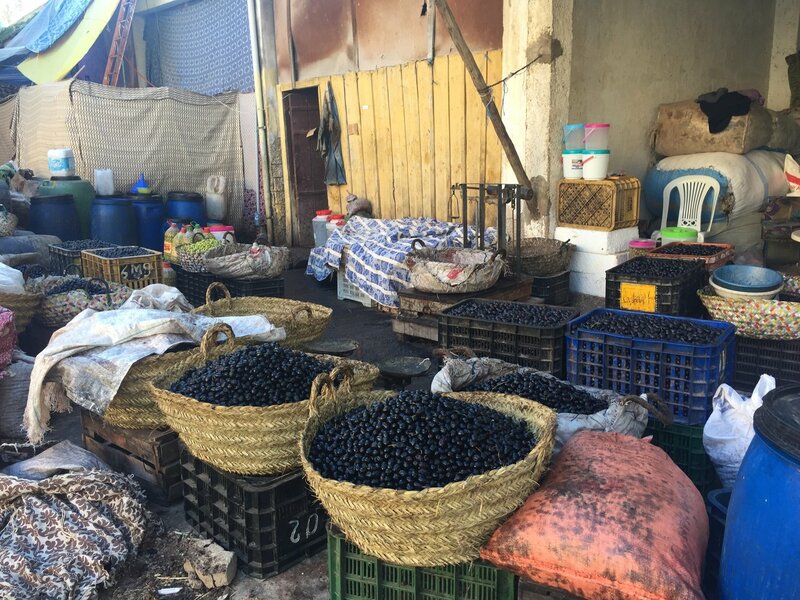 Our third day was horrific and we were exhausted and irritable by the time we reached Fez. I wish the agent might have suggested that we skip Chefchalquin, although we loved it, as it was just too much driving. 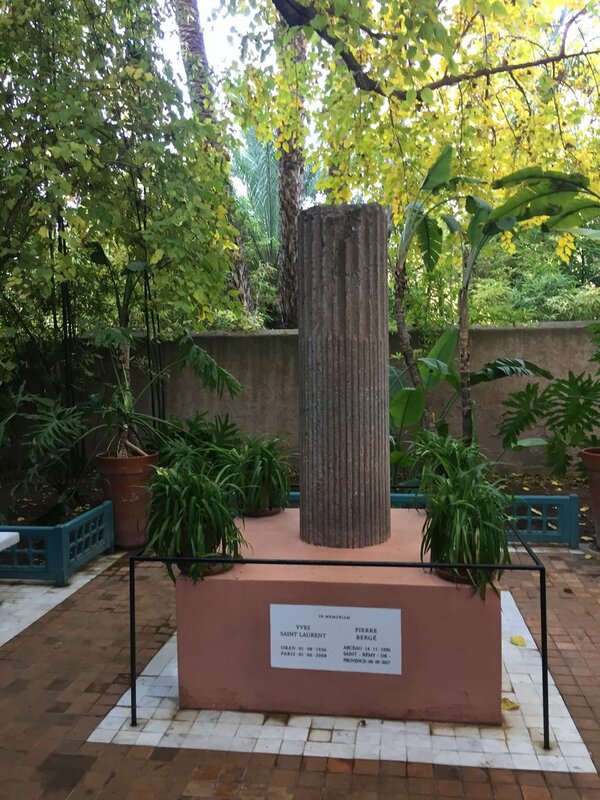 I wish that we could have spent time in the Berber museum at Marjorelle Garden in Marrakech. In retrospect, it would have been good to have more suggestions that would have made for a more relaxing trip. 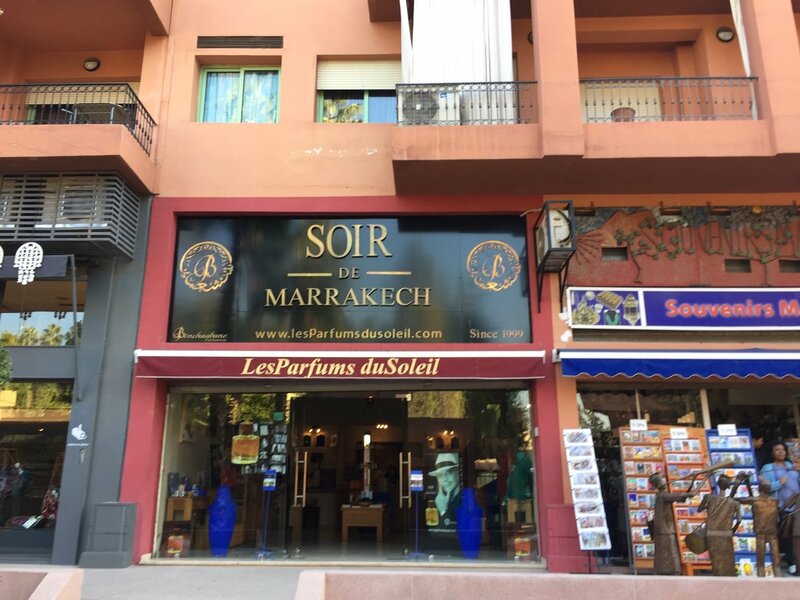 In the end, we canceled our accommodation in Eousoura (sorry for spelling) as it seemed to just far to go to the Casablanca Airport on the day that we would be leaving on an 8 hour flight home. 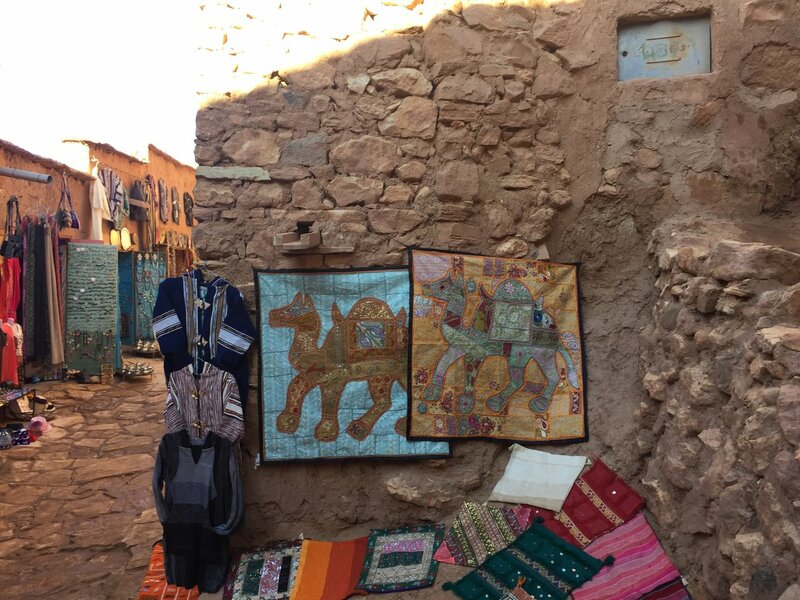 We ended up going to Eousoura as a day trip from Marrakech. 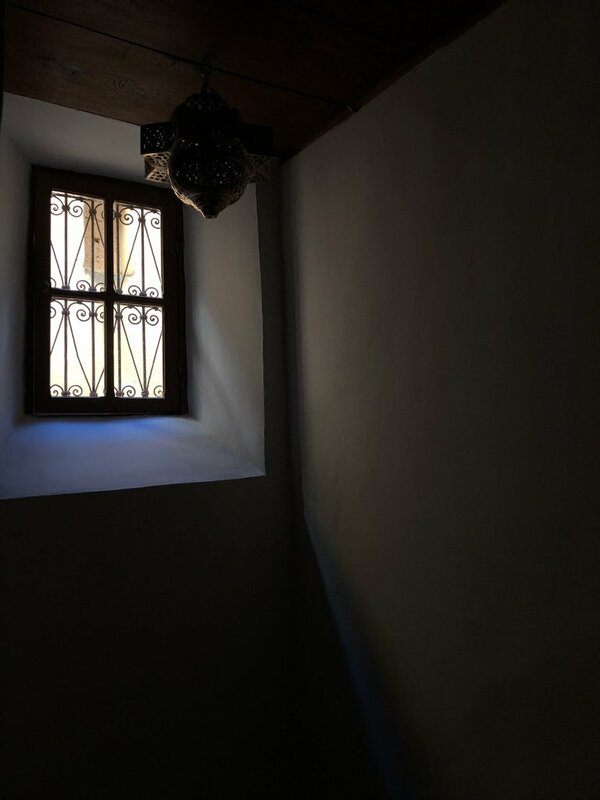 Our accommodations on our last night were paid for by us which was fine, but the riad, Riad Zanibar, was a bit rundown and it is a place that I would not have recommended. I understand that the last minute request probably had something to do with it. Thank you for your detailed review of your trip. All your comments, positive and negative, are helpful and valuable to me. 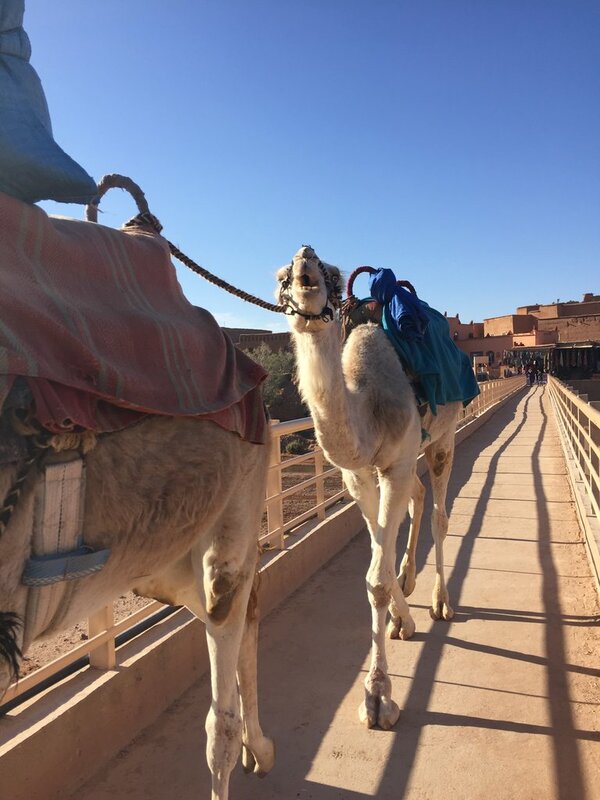 I am so happy to hear that you were pleased with your trip, and that both of your guides and driver were so exceptional! I will be sure to share your comments with them as they will greatly enjoy hearing it. I do have to say that I am surprised and saddened about your feelings on some of your accommodations. I appreciate your opinions and will revisit them myself to check the quality they are providing and to make sure that their cost is worth the star-rating that they advertise. It sounds like some of them have lowered their standards since we last used them. Also, thank you for your comments about the long driving distances on your trip. 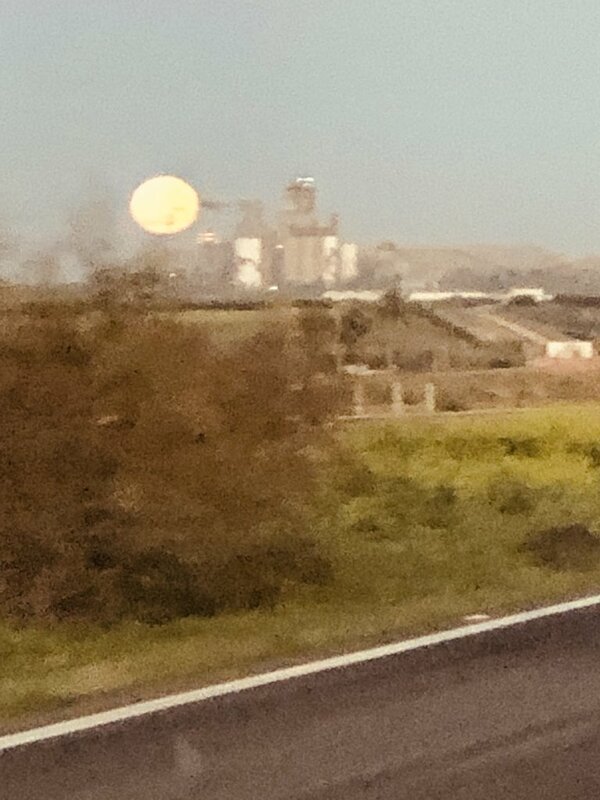 Unfortunately, some of it cannot be helped when traveling across an entire country, but I will be sure to be extra clear moving forward and provide more feedback when I believe there are too many days driving in a row. 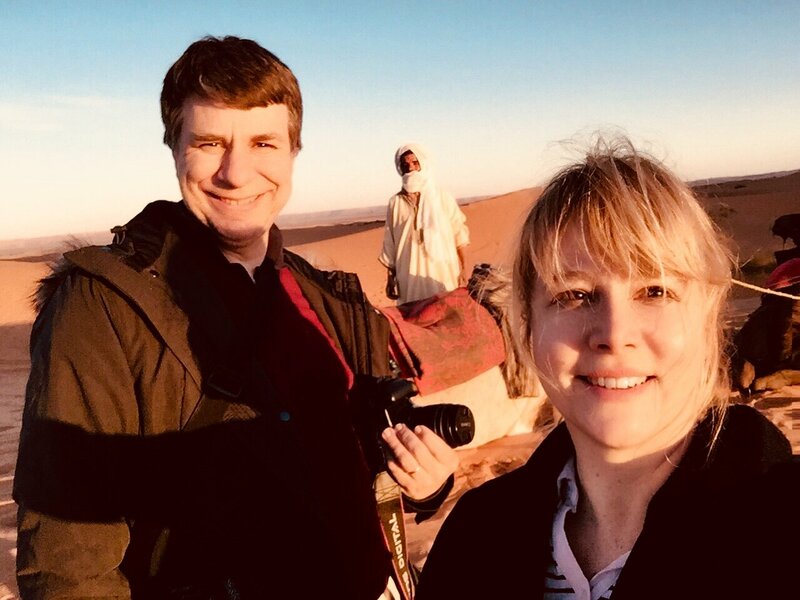 Again, I so appreciate your feedback from your Morocco trip. We will be able to grow and become better with your help. It has been a pleasure working with you, Judy, and being able to welcome you and your family into my home country. 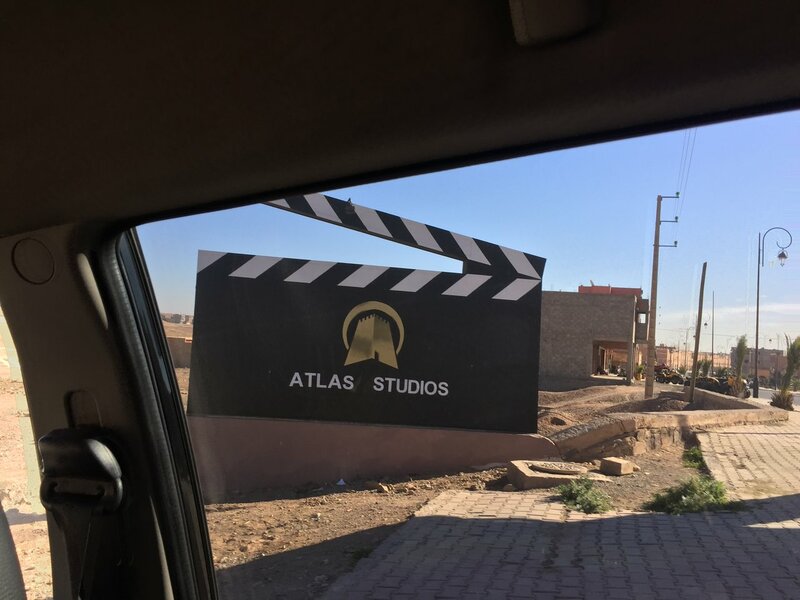 I hope that we will be able to work with you again, and that I will see you back in Morocco in the future! 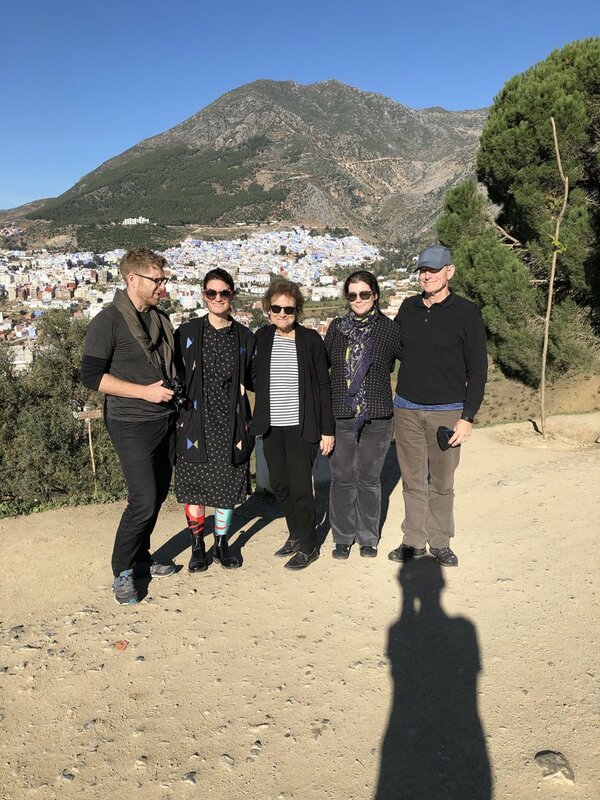 We had a fantastic time in Morocco. 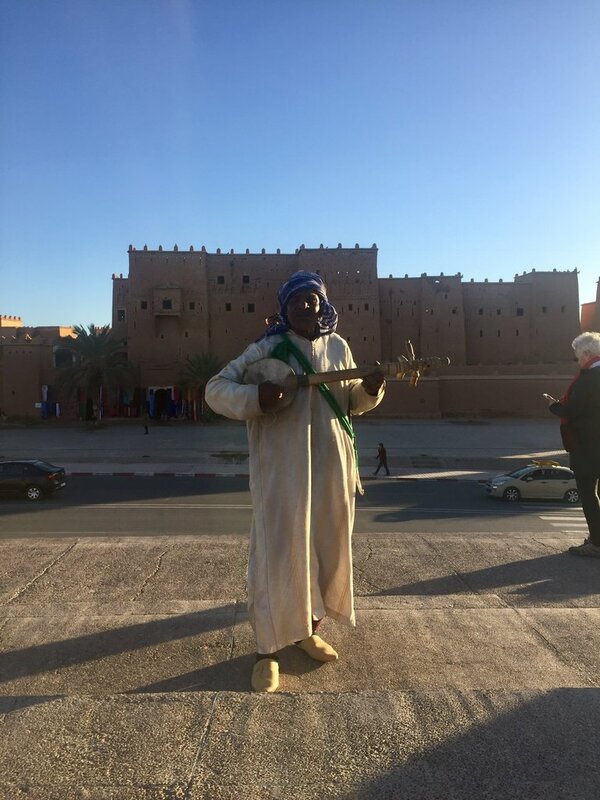 We visited seven cities in a span of 12 days, accompanied by our Morocco Off the Beaten Track driver, Mohammed. 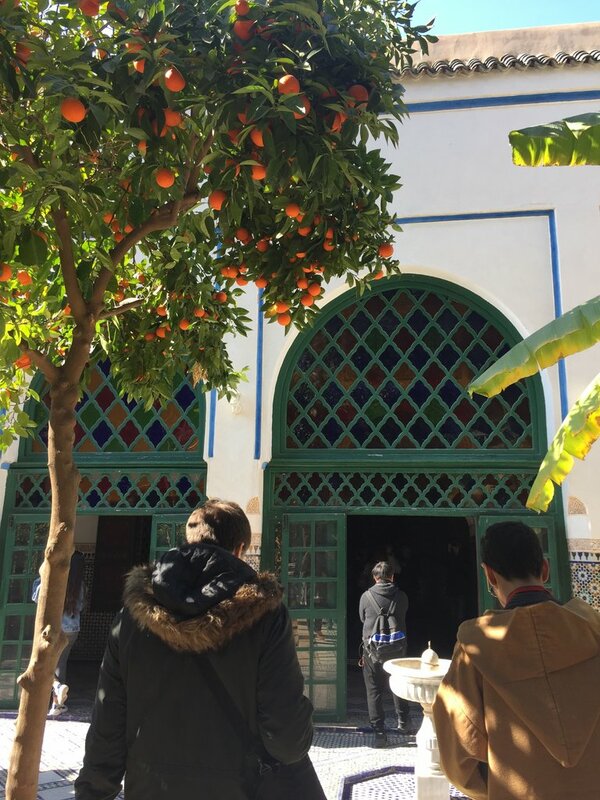 We began our tour in Chefchaouen, then Fes, Merzouga, Ouarzazate, Marrakech, Essaouira, and ended in Casablanca. 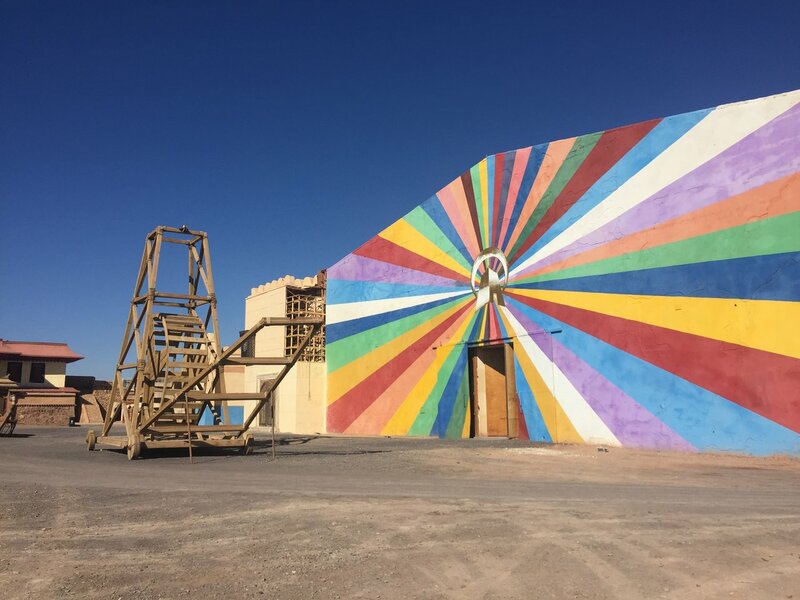 Each city was uniquely different from the last and we were greatly pleased with the beautiful accommodations secured for us by the MOTB team. 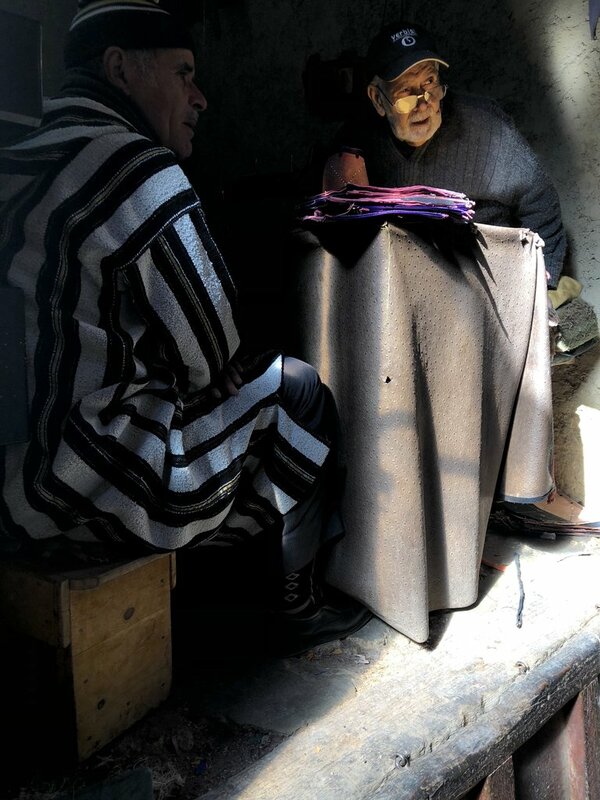 We met some wonderful locals while we were there, and felt so welcomed in a place so far away from home. 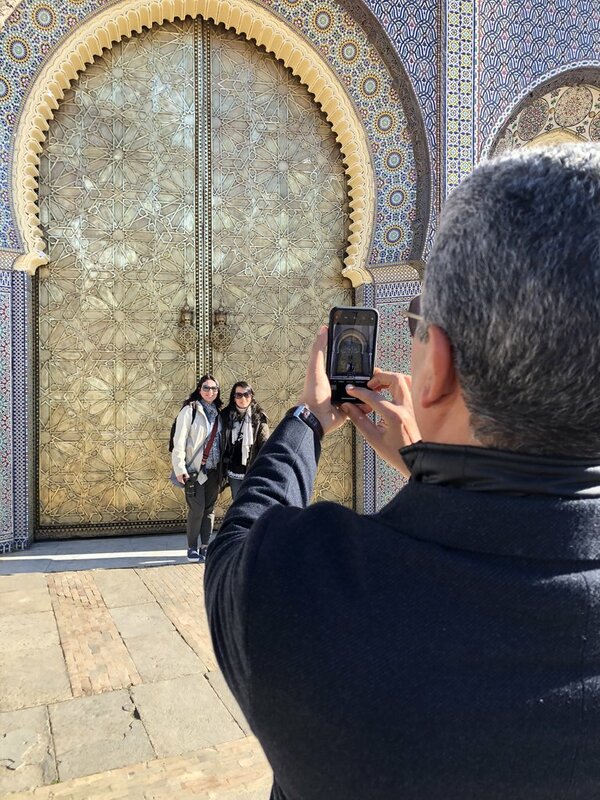 I am so happy to have welcomed you both to Morocco for your special occasion! It was a pleasure getting to tour you around the country, and we are happy to hear that you so greatly enjoyed your accommodations. 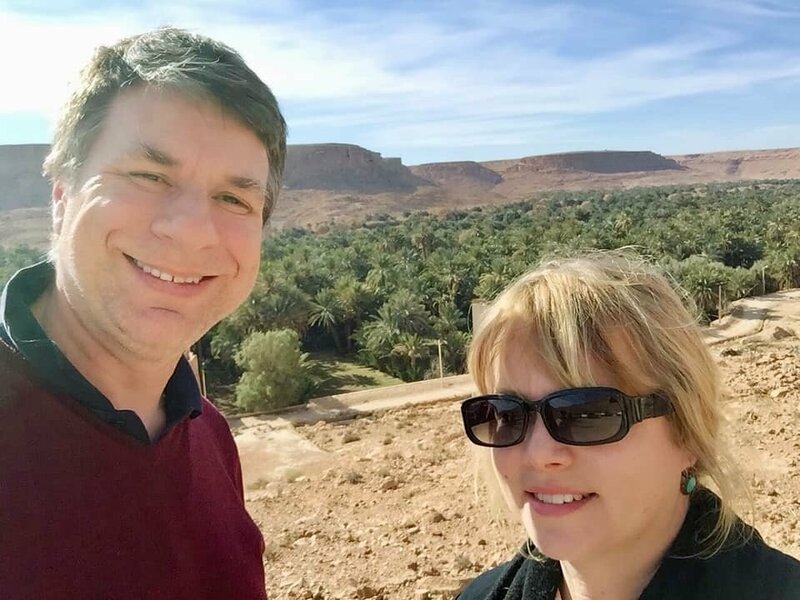 Please feel free to reach out to us with any other feedback and I hope to see you both traveling with us again! 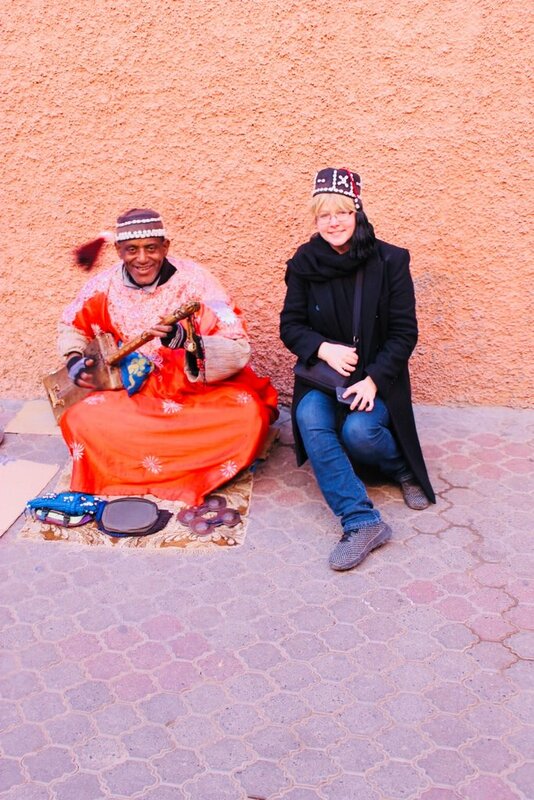 We enjoyed an unforgettable introduction to Morocco. The places we stayed were, without exception, all very lovely and well located, with full, nice breakfasts and excellent staff. Our driver was nothing short of wonderful. He was extremely helpful, offered what turned out to be excellent advice when requested, and took outstanding care of us. 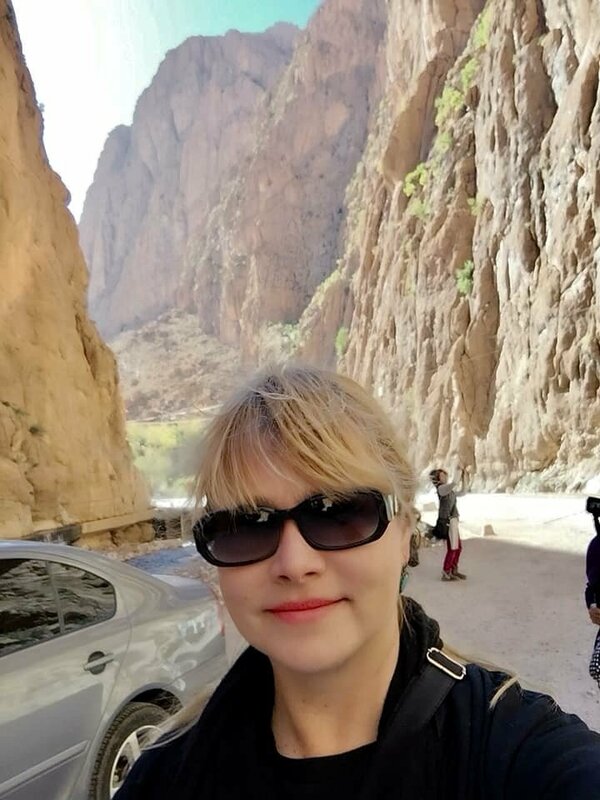 We realized the driver could not substitute as a professional guide, and there were a few times he could not provide answers to our questions, because of language difficulties, or just lack of really specialized knowledge. 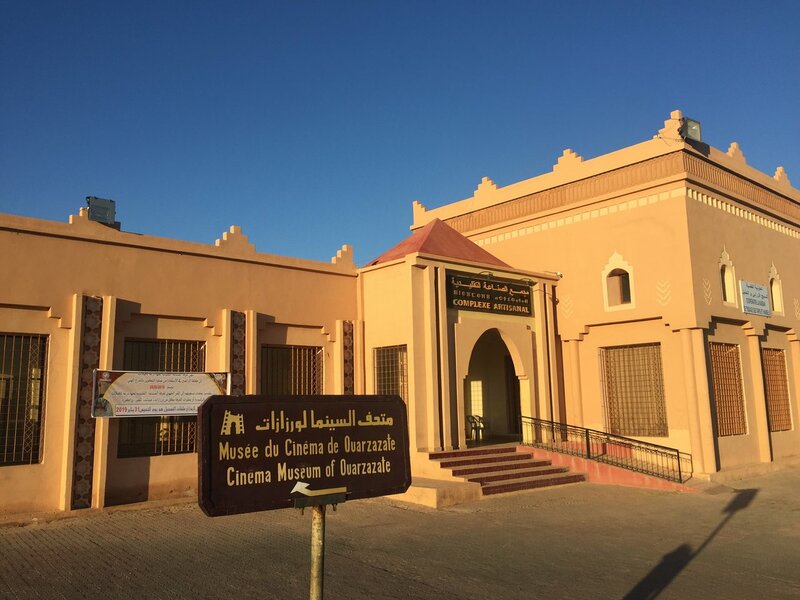 Yassine and his colleagues made certain that we were always well cared for, and they were genuinely concerned that we enjoyed ourselves. If there were one aspect we would have done differently, knowing now what we do, we would have covered less, or else lengthened the trip. It was impracticable to cover the distances we did and still arrive at our destinations with enough time to do any exploring. 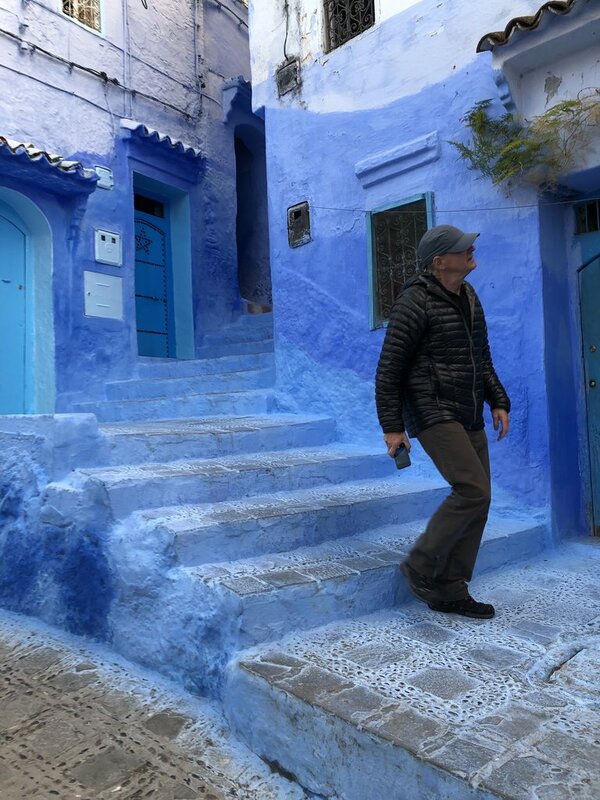 We definitely needed another full day in Chefchaouen. 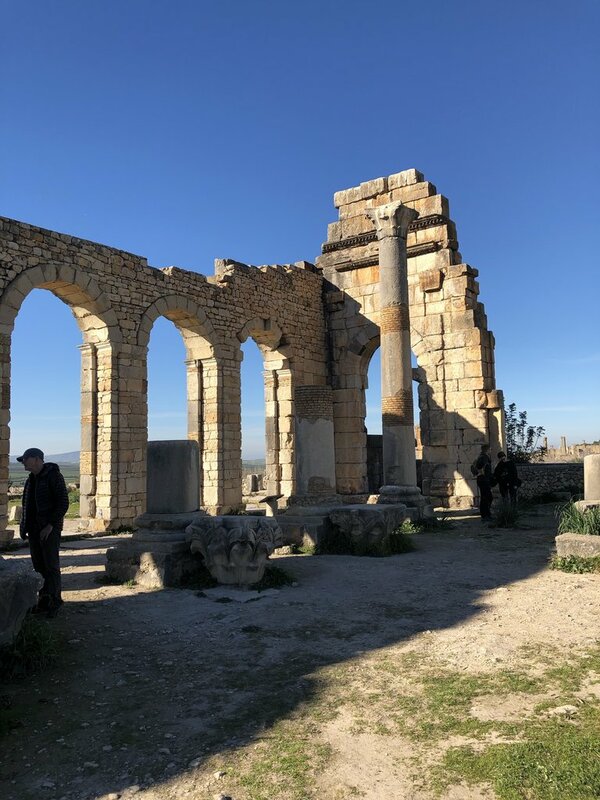 We thought Essouaria was more important to visit than Volubilis, Moulay Idriss, or even Rabat. 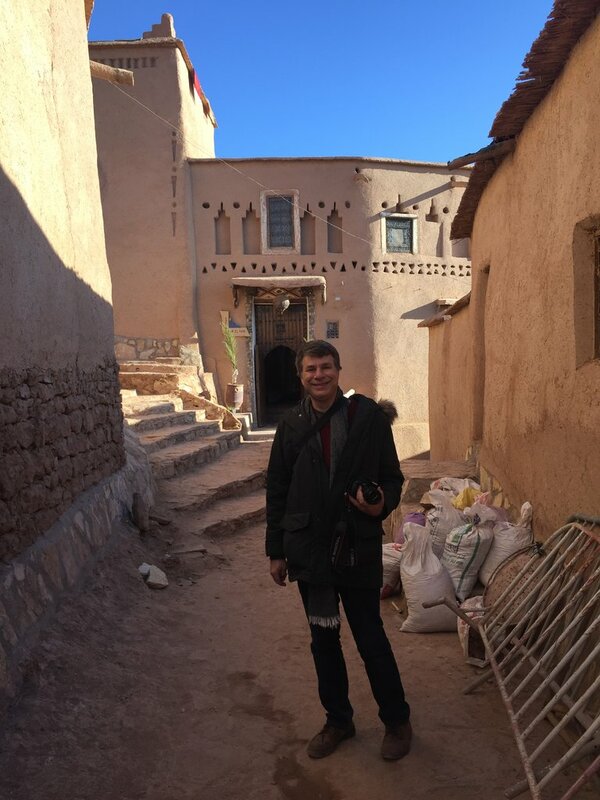 Ifrane was better just to pass through than visit. We spent proportionately more time in the car than we wanted. We did rely on the trip planners to know how long it would take to reach a given city, and travel times in general; despite cutting down on some of our original plans, we still could not cover everything. 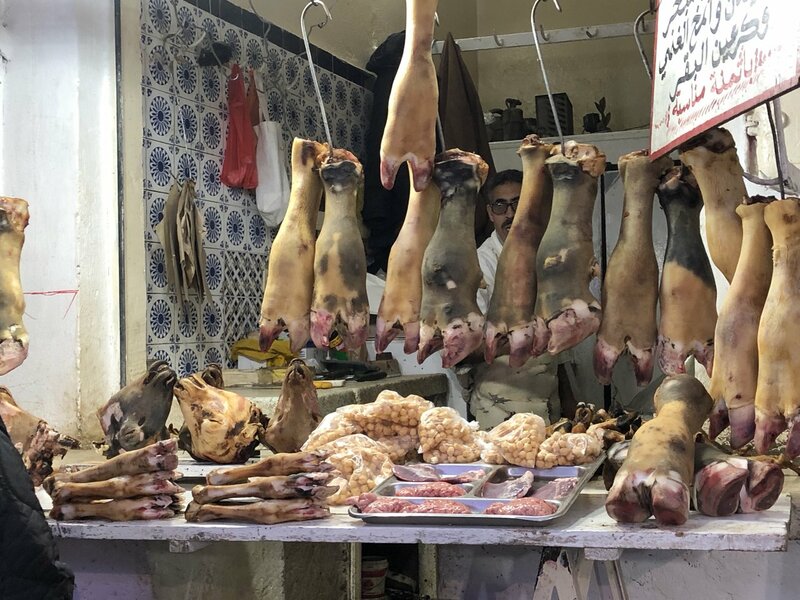 In Fez, our cooking class was very enjoyable; we did not get as much benefit from the professional tour guide as we had hoped, however. 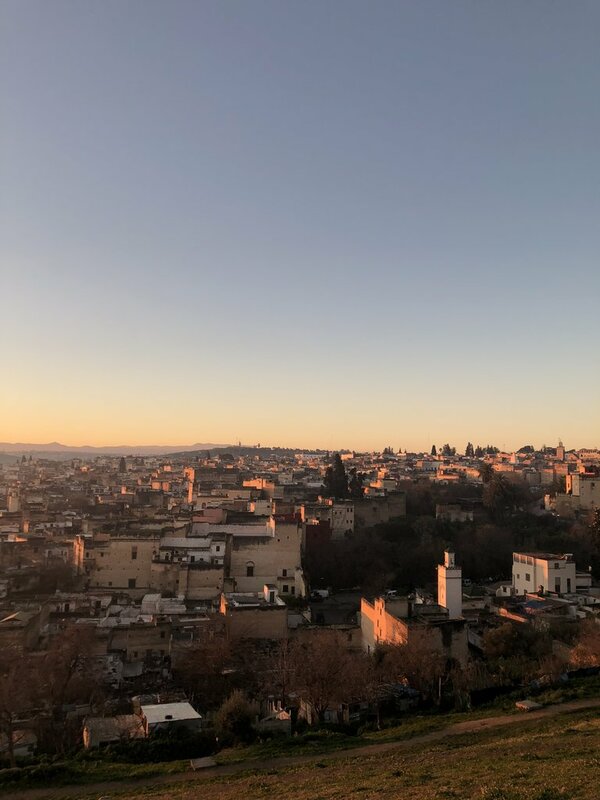 He repeatedly remarked that he could not show us what he wanted to because we had come to Fez on a "holiday" (Friday), and that we needed to visit on a different day to see more activity. That was hardly anything we could have known in advance. 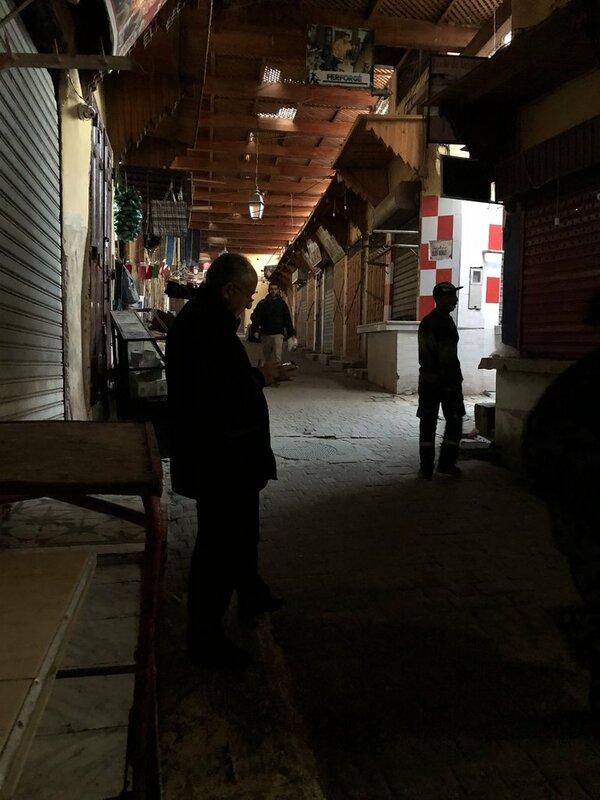 He also disappeared whenever he "delivered" us to merchants he thought we should shop from. 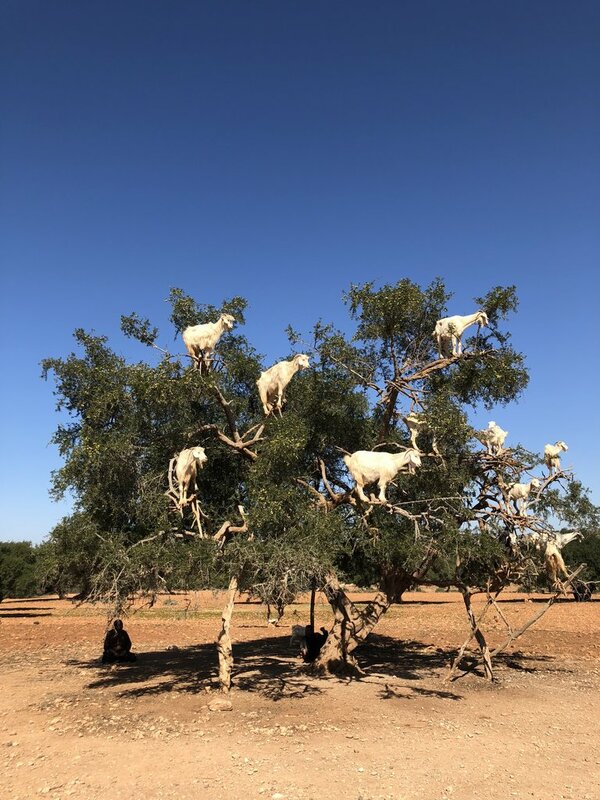 We loved the goats and the argan cooperative; Todra Gorge was excellent; we enjoyed the hammam in Marrakesh; and our overnight in the Sahara was probably the single most important experience. 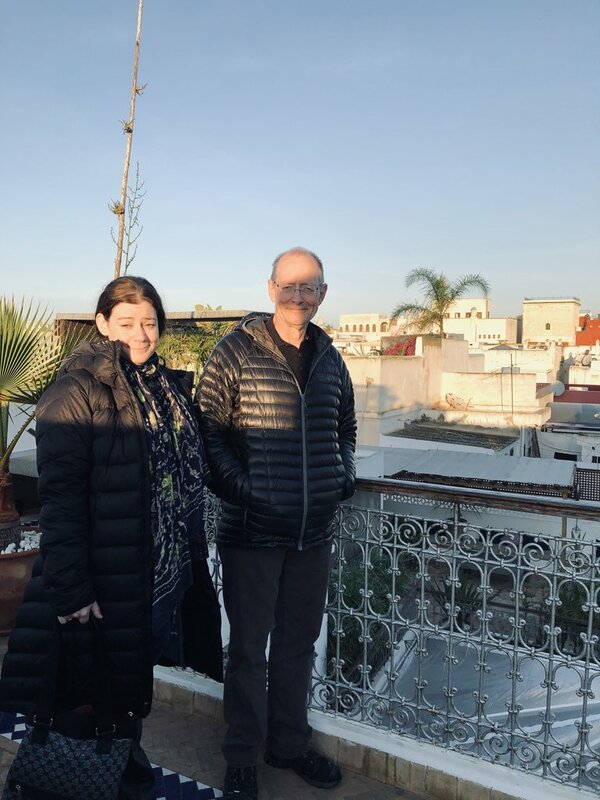 Overall, the special attention we received throughout our trip, and particularly in Marrakesh, made us very glad we chose Kimkim and MOTB/Yassine and his team to make our arrangements. 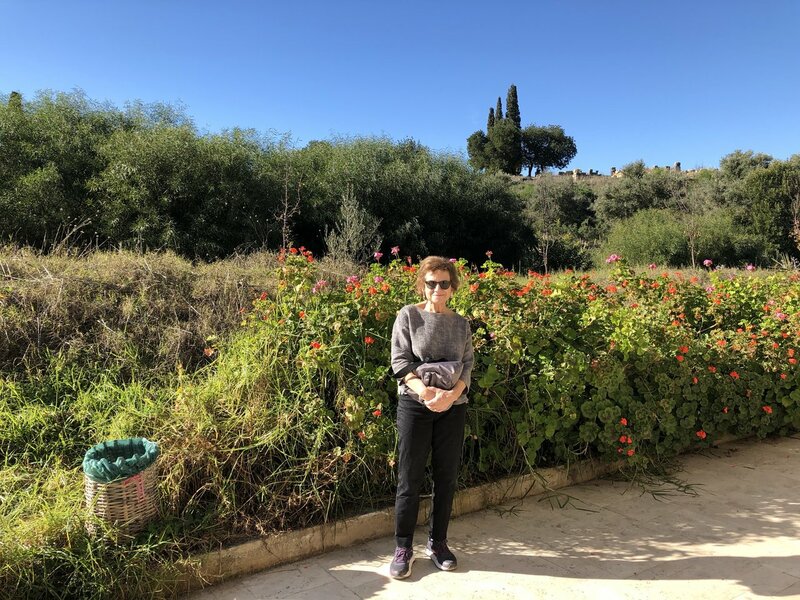 Thank you for traveling with us and your kind words Linda! I am so happy that you enjoyed your trip overall and that your interactions with your driver were so positive. I appreciate the feedback on the driving times and will make sure to be extra clear with other travelers in the future. 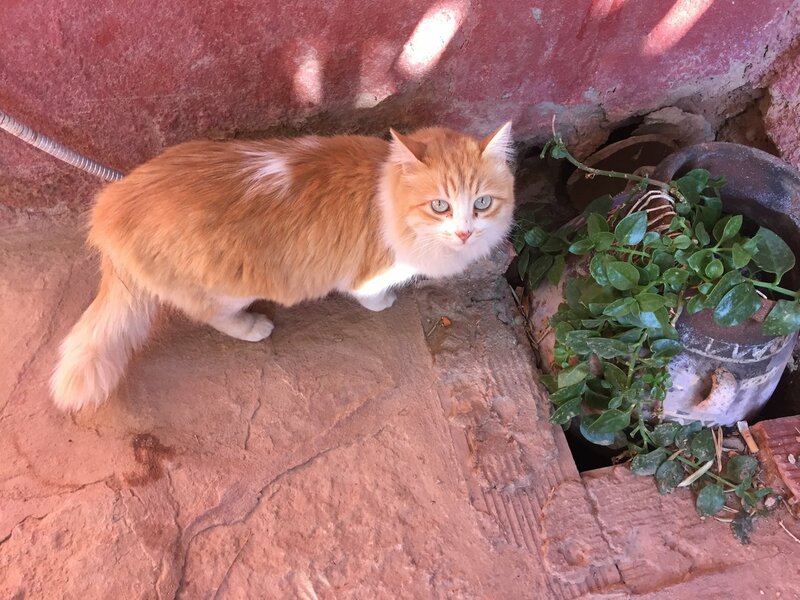 I’m saddened that your tour guide in Fez did not met not only yours, but our expectations as well. This will be addressed with other tour guides that we work with in the future. 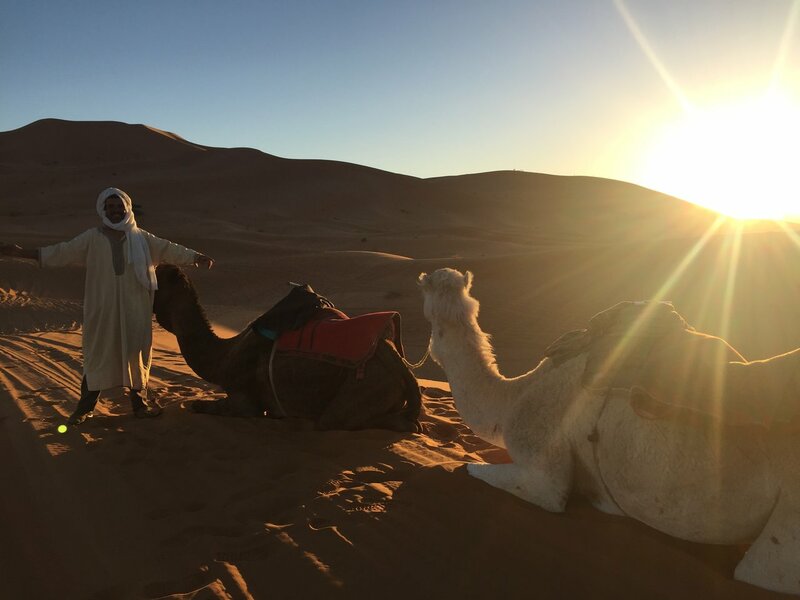 I am so happy that you were able to visit the Sahara Desert and stay in the tent! Your kind words are truly beneficial and mean a lot to all of us. 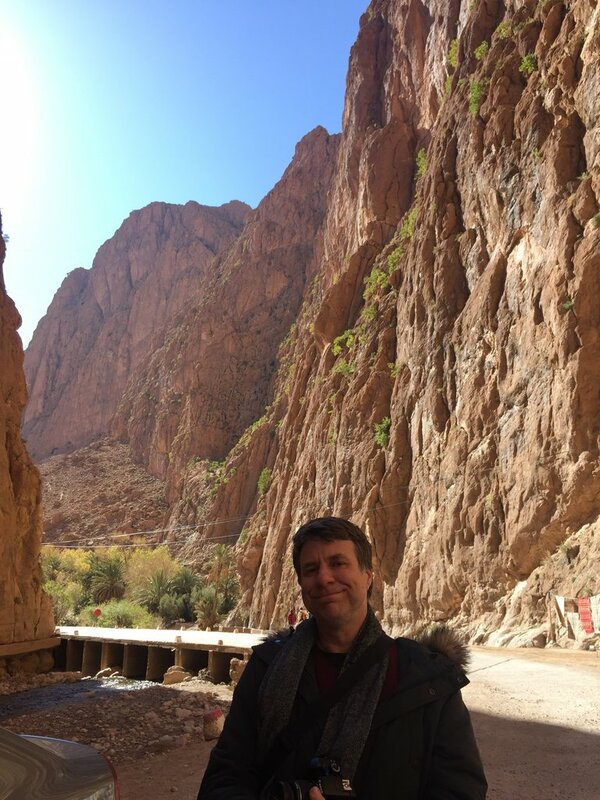 I hope to see you visiting Morocco again in the future! We were a party of 6 from Australia. The booking experience with Kim Kim and Off the Beaten Track was 1st class. A great team effort congratulations to Yassine and his team. 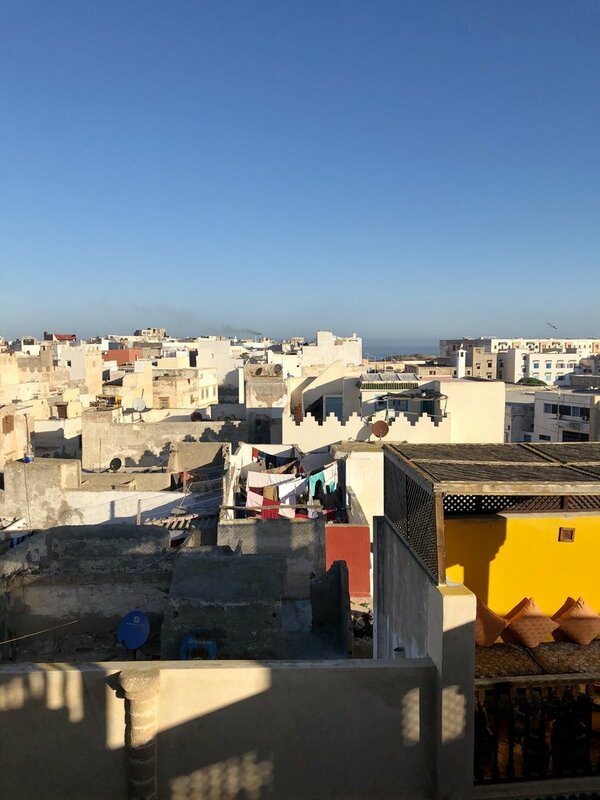 When we arrived in Tangier the pickup details had not been detailed and I was surprised to find a driver whom I had not been given his name. Nabil - a lovely man. Nothing was too much trouble for him even though his command of English was patchy at times. I will address each part of the trip keeping in mind one of our party had been unknown to 4 of us prior to the trip. 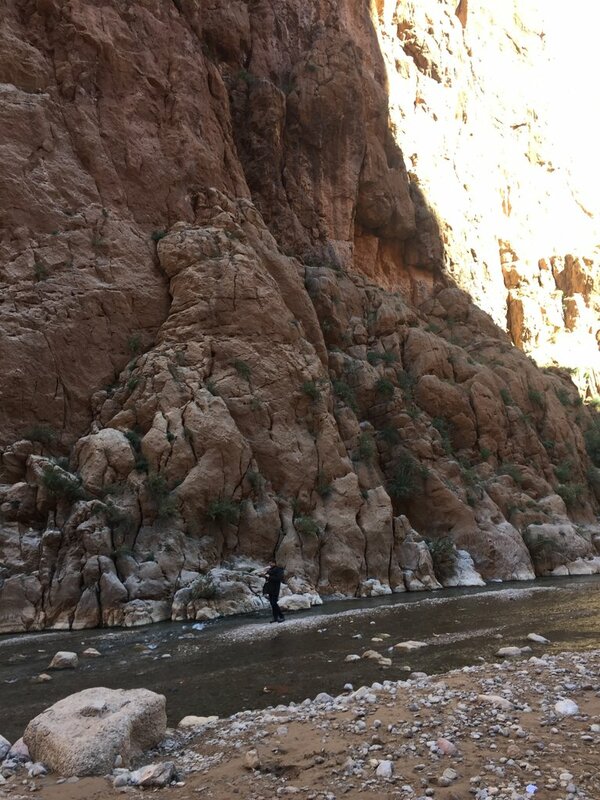 (not a great idea) This man had not been forth coming with his health issues and the fact he suffered from COPD (Chronic Obstructive Pulmonary Disease) meaning his ability to walk any distance or climb was severely impaired. 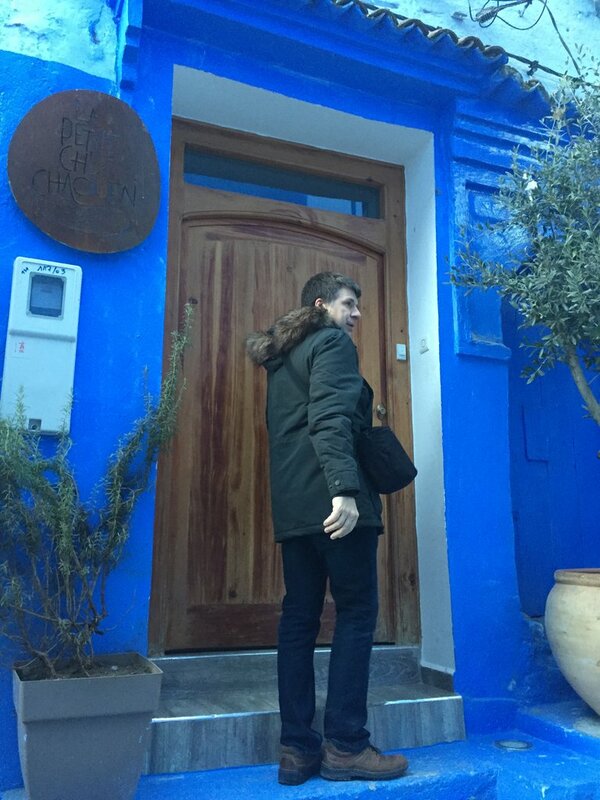 Accommodation: The accommodation was excellent in every stop - Tangier, Fez, Desert, Quarzazate, Marakesh and Casablanca. 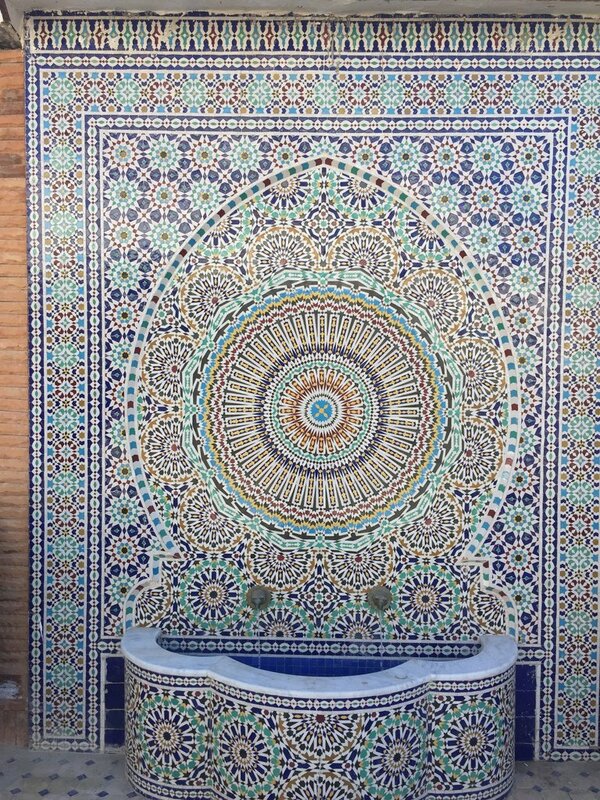 The Riads in Fez and Marakesh were beautiful and the hosts wonderful. 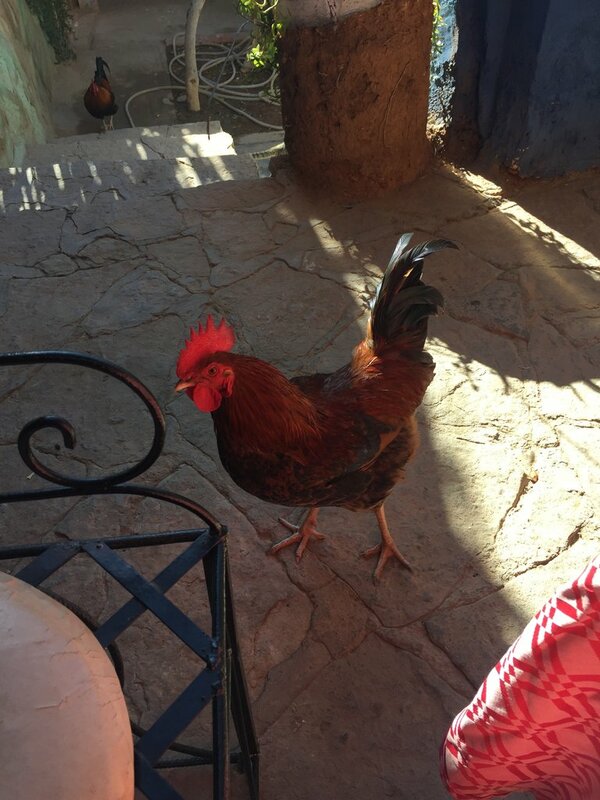 Our Fez host went out of her way to help our impaired traveller. 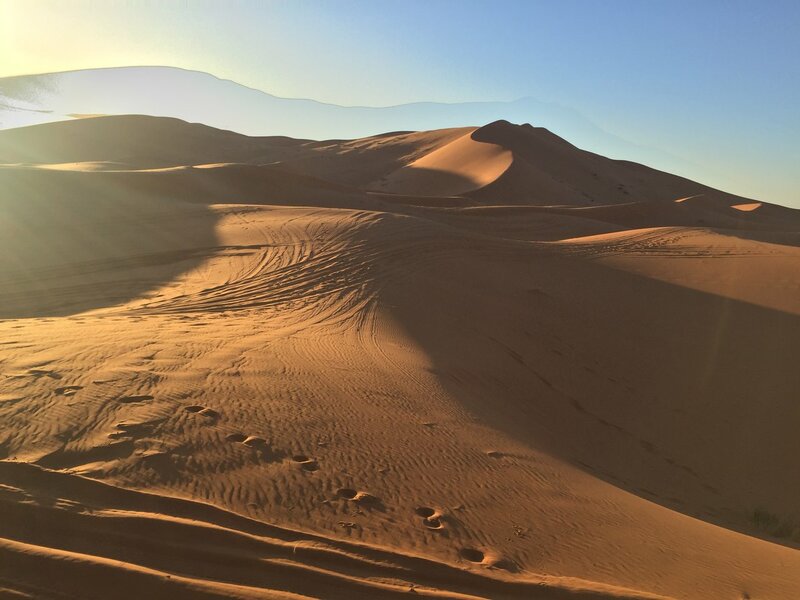 The desert speaks for itself and an experience all should have. 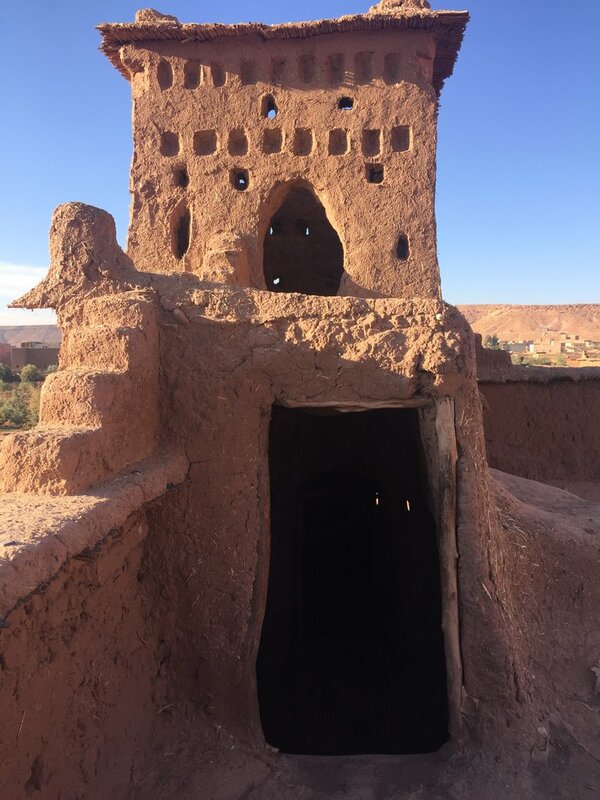 Ait-Ben-Haddou in Quarzate is 6th century with the whole area under restoration. Sadly we arrived here after sunset and the "getting there" was a little troublesome in the dark. 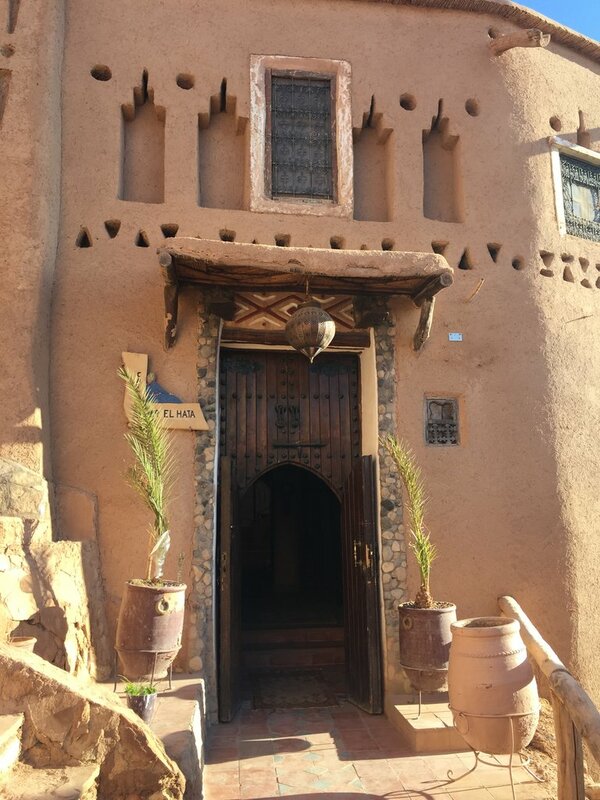 The property has no electricity and lit by candles - not that that is a problem however, not having been able to orientate ourselves in daylight did put a dampener on the night's experience. Next morning was a whole different scenario - a fabulous area and I could not recommend it more highly - just get there in daylight. Our unhealthy traveller just could not make it there and the host went out of his way to arrange alternate accommodation. The host himself was horrified that we arrive after dark. 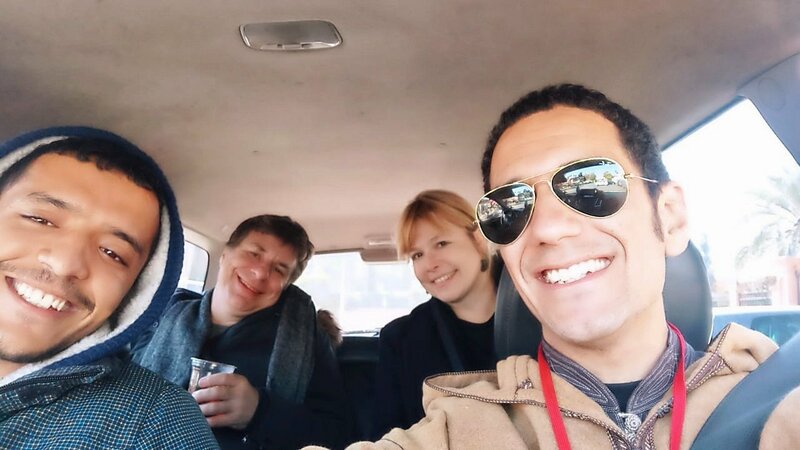 Travelling by Car: Nabil was an excellent safe driver. The 4x4 vehicle comfortable and well maintained. Our travel times were challenging for him time frame wise. Arrival times were really impossible given the state of the roads in some areas and the trucks, buses etc filling the roads. ( I might say some of this was my fault as I had tried to put so much into the trip and Yassine has gone out of his way to accommodate this - in retrospect I had been a little ambitious - an extra day would have made so much difference especially Fez to the desert) We were due to drive Marrakesh-Casablanca on the Saturday morning for a 11.45am flight to London. 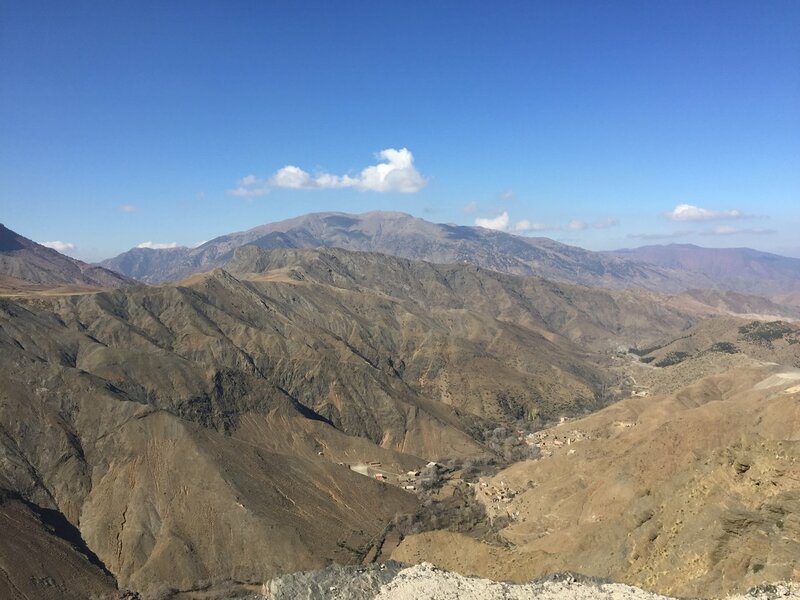 This truly was not possible - the road over the Atlas mountains is being rebuilt and consequently slow. 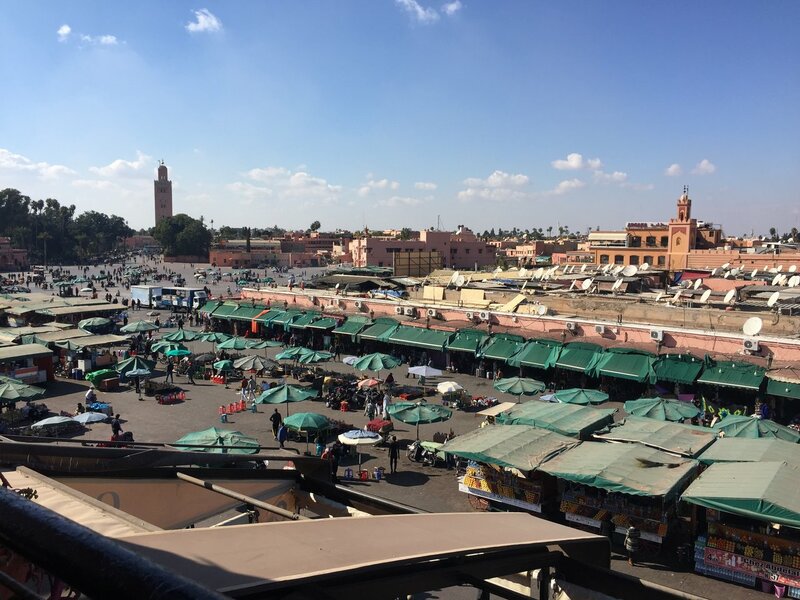 I didn't know this at the time but given the time it had taken to get everywhere else I cancelled the last day in Marrakesh and added an extra night in Casablanca. The Kim Kim team did this effortlessly for us - thankyou it was the right thing to do. and as a result we travelled a long way with no local commentary which would have been very nice. Nabil did his job so well and this comment is in no way a mark against him. He could not have done more. Thank you for such kind words Marion! It is truly our desire to make a trip valuable and an experience unforgettable, and I’m glad that we were able to do that for you. I will address the driving times for future travelers a little bit clearer, and I appreciate your feedback. 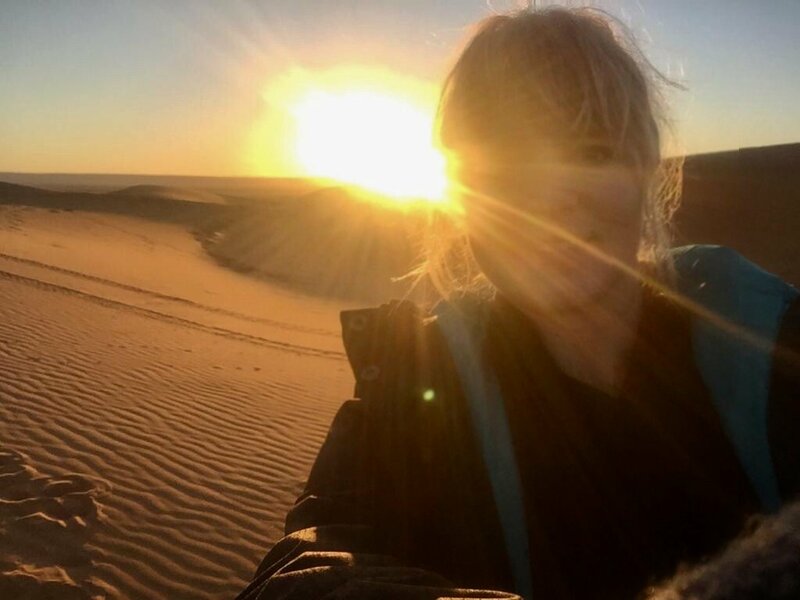 I’m so happy that your experience in the desert was so wonderful, and even though there were so situations that none of us could control, I appreciate your flexibility with us as well. 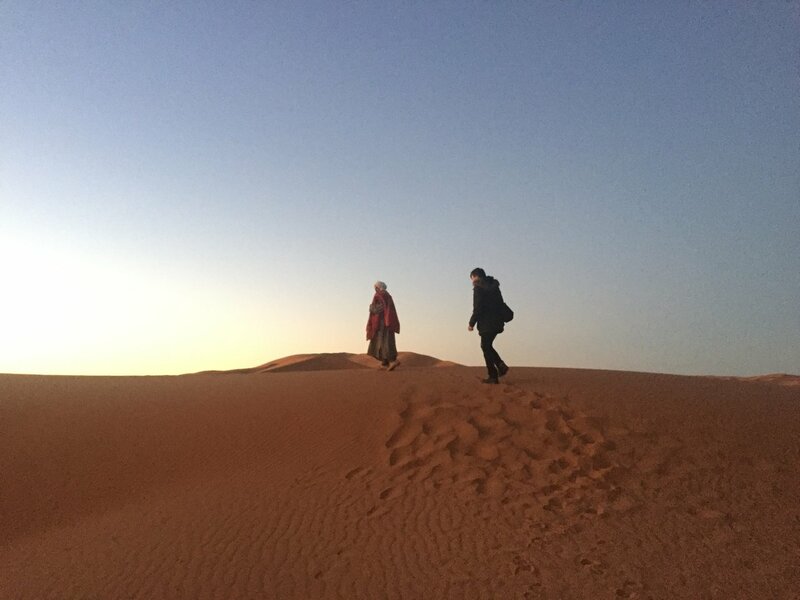 I surely hope to have you travel with us to Morocco again in the future!